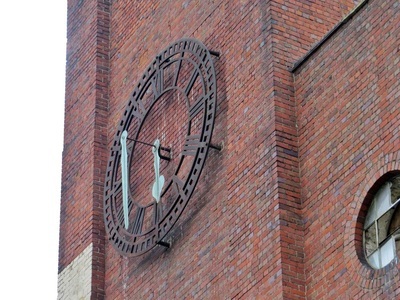 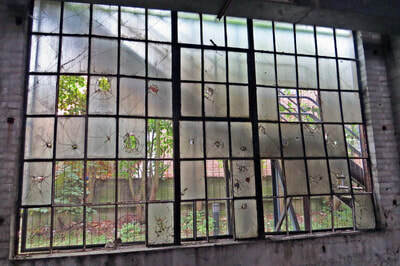 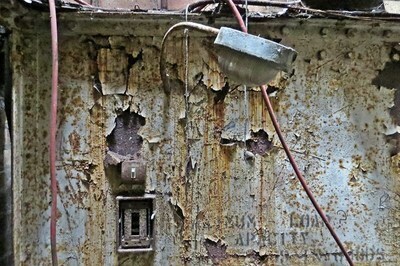 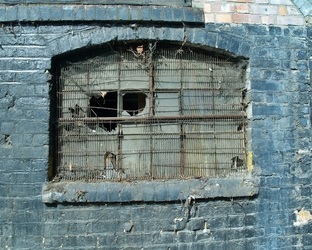 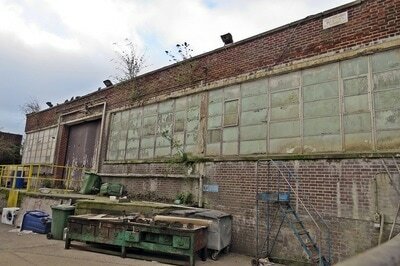 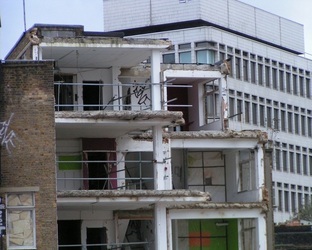 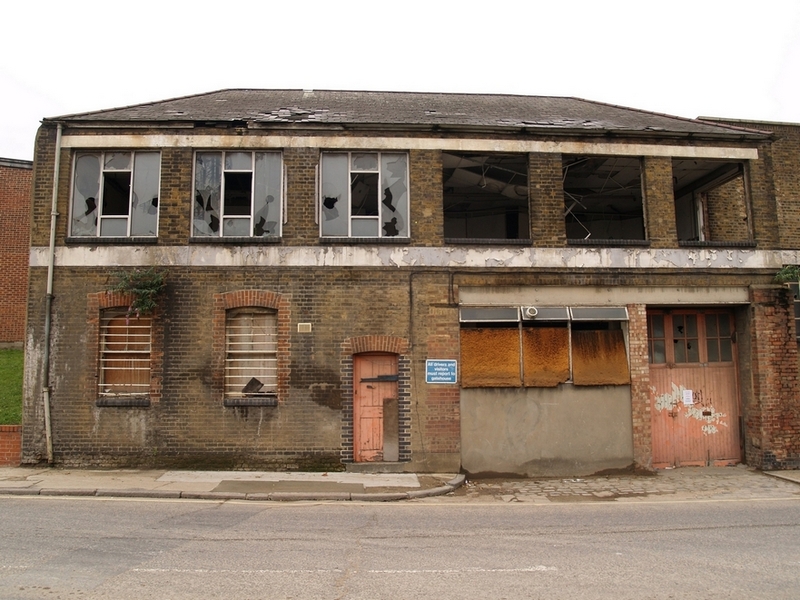 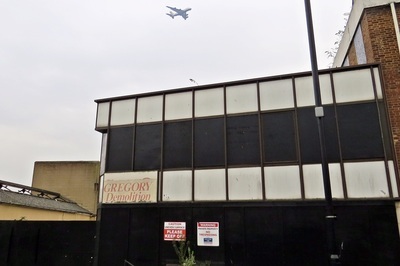 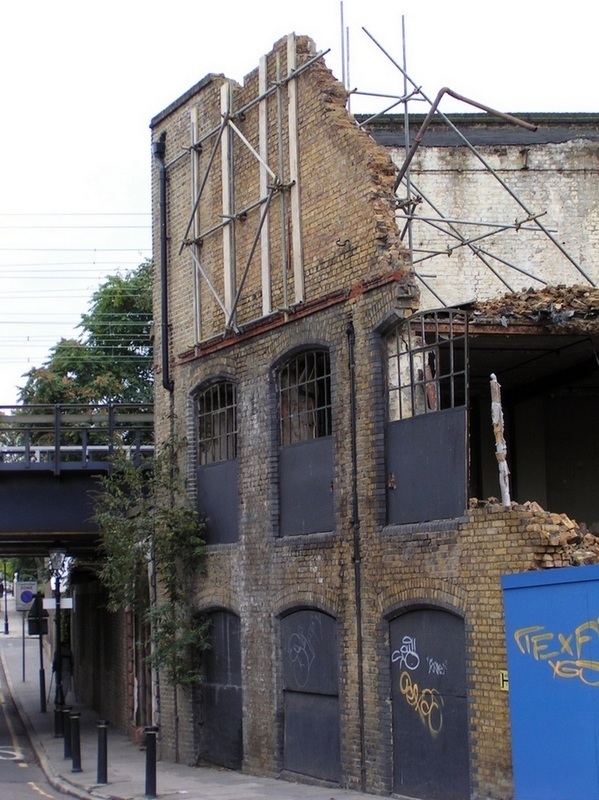 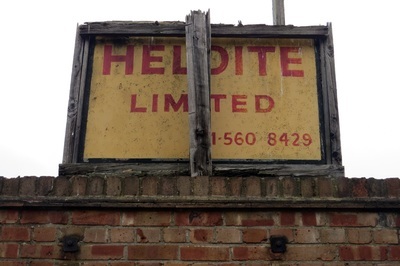 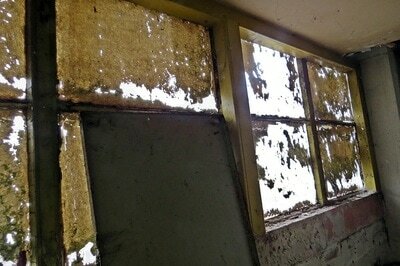 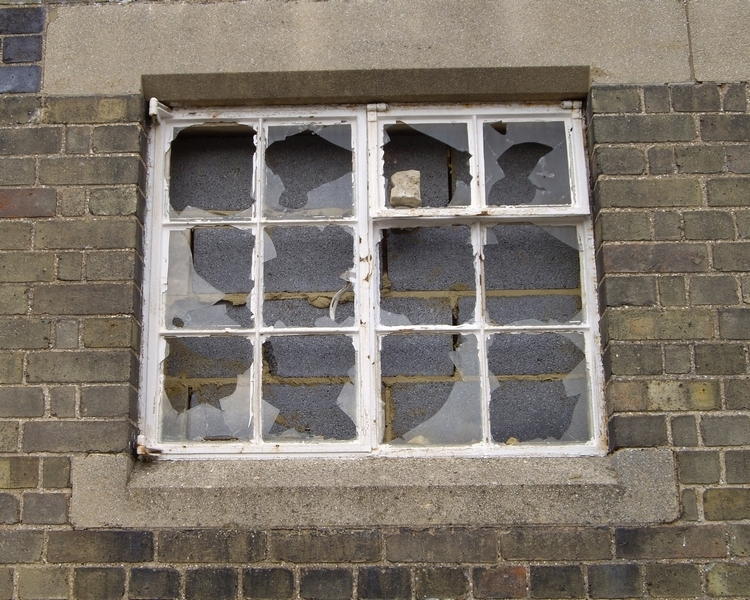 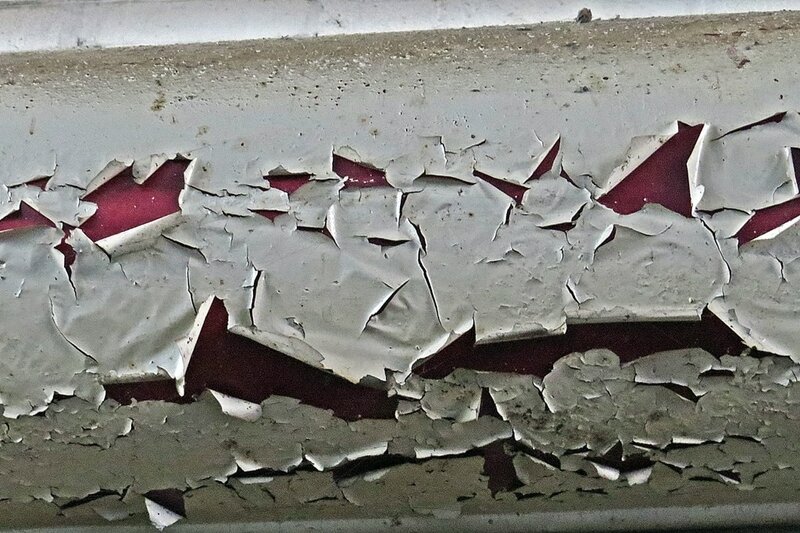 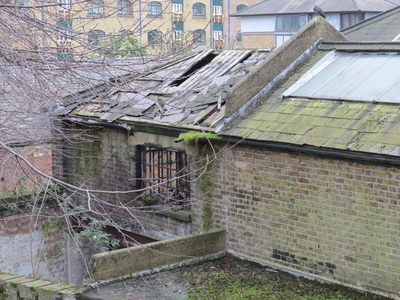 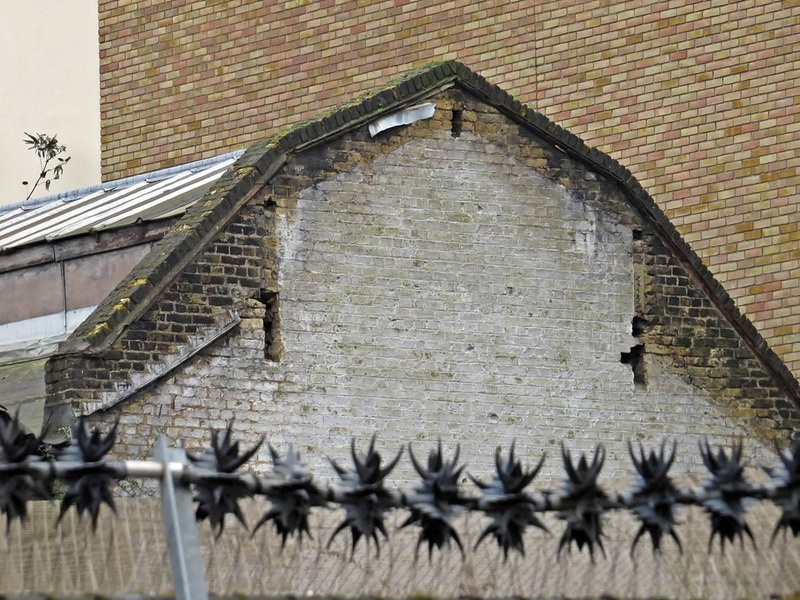 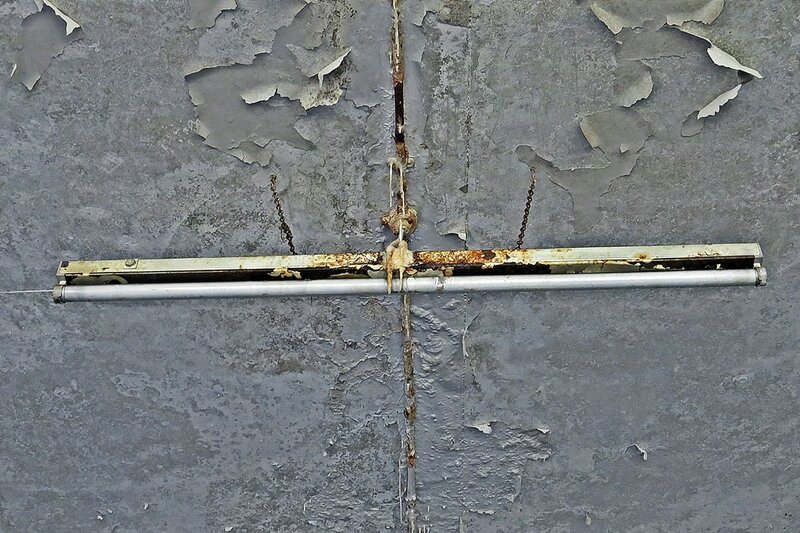 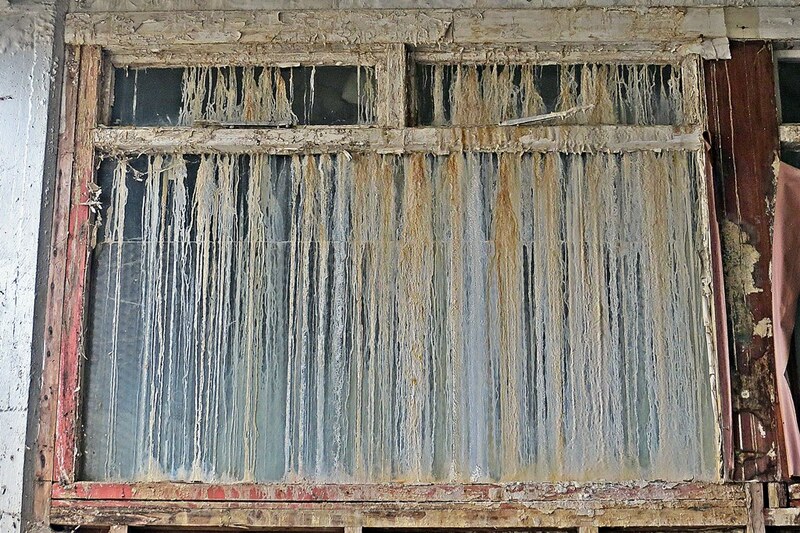 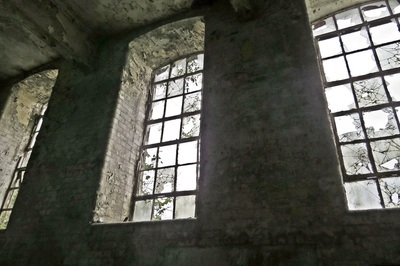 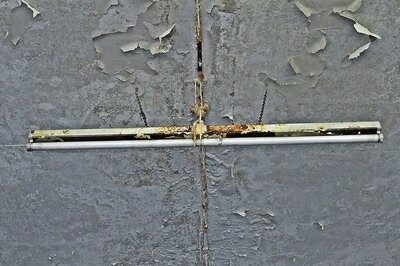 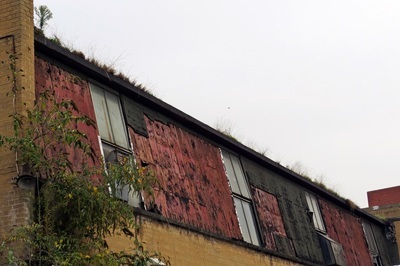 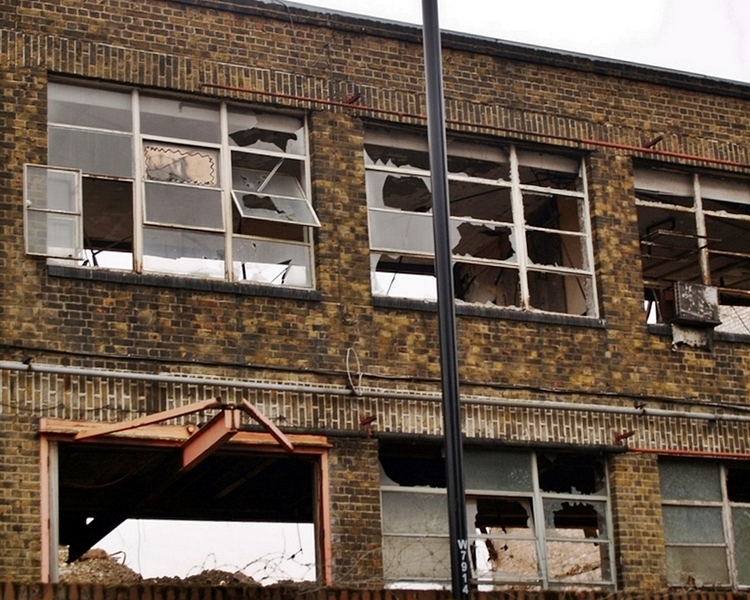 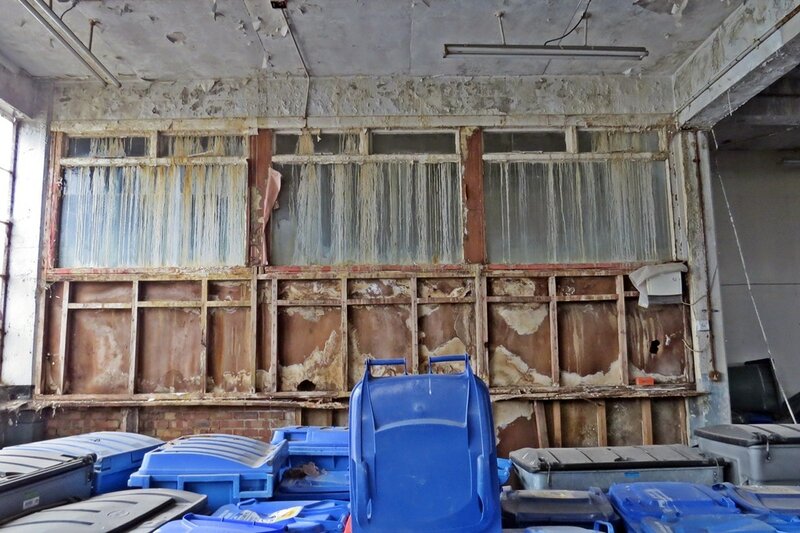 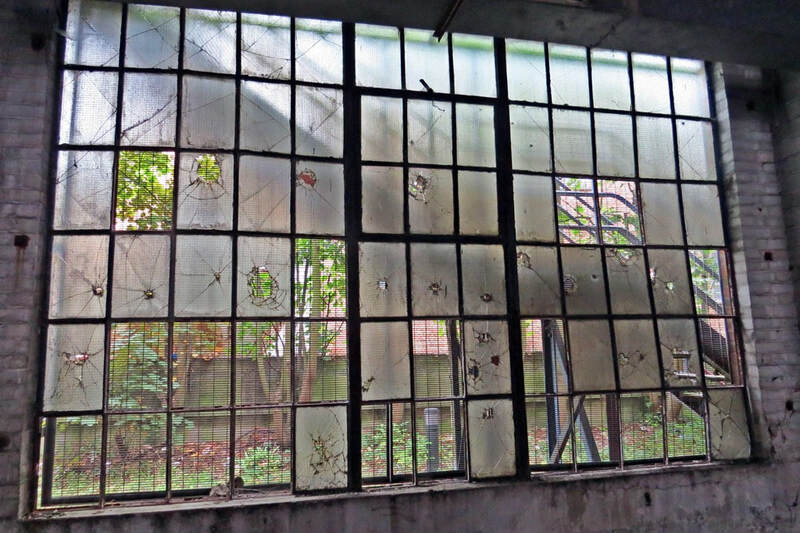 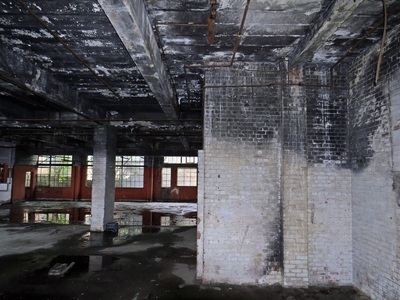 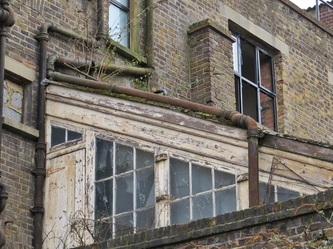 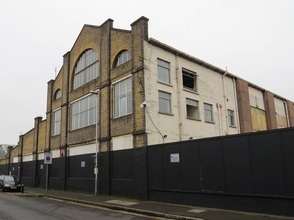 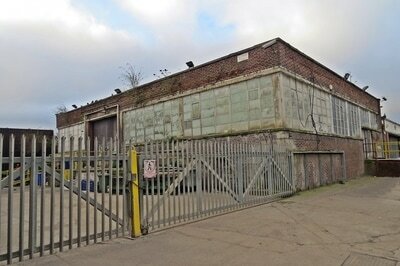 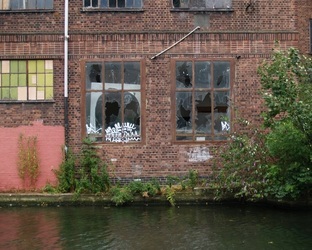 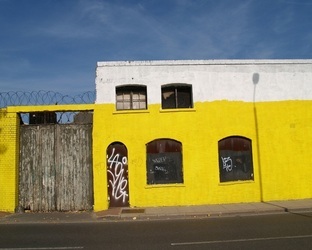 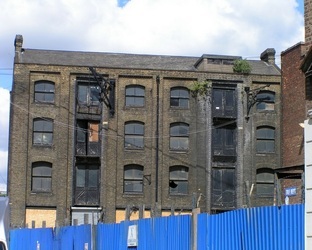 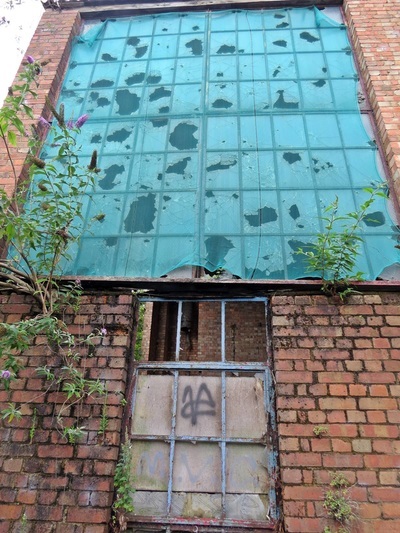 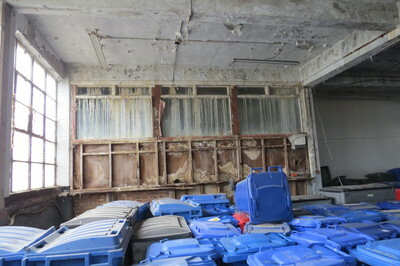 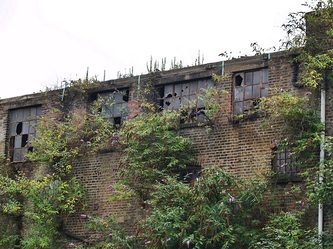 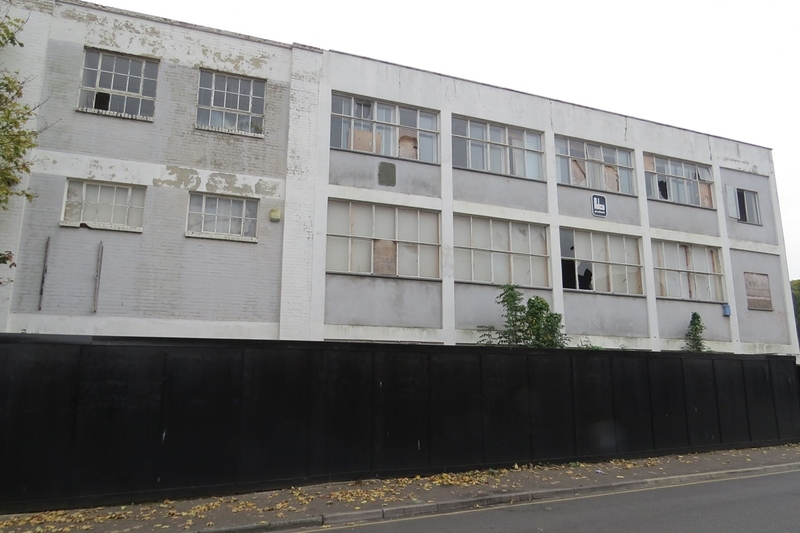 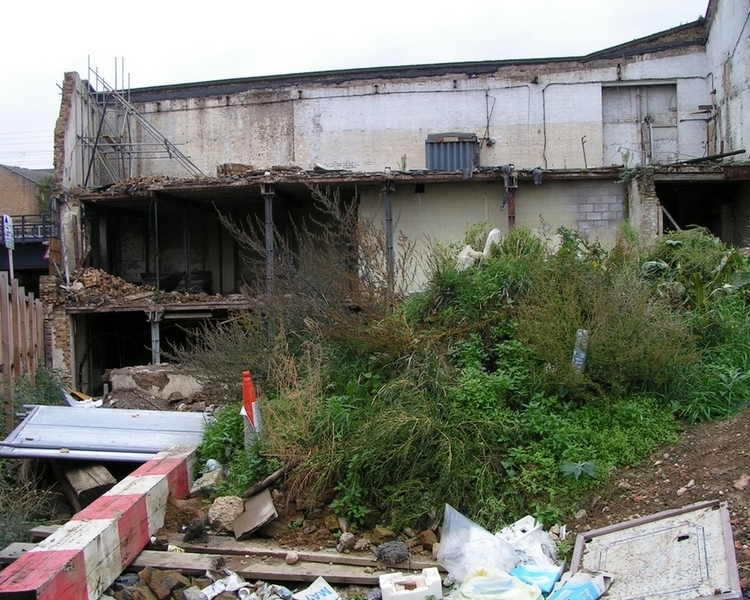 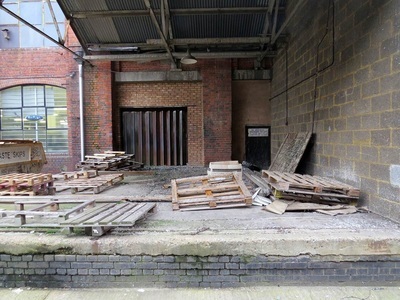 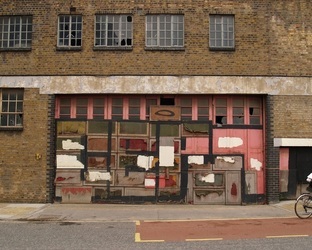 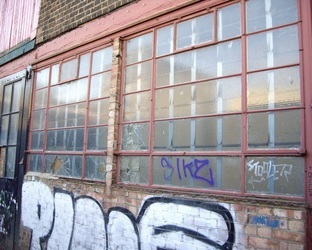 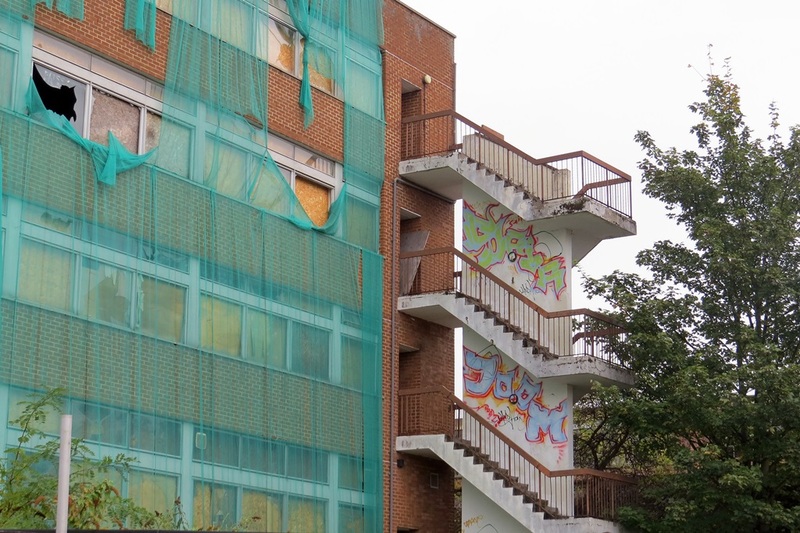 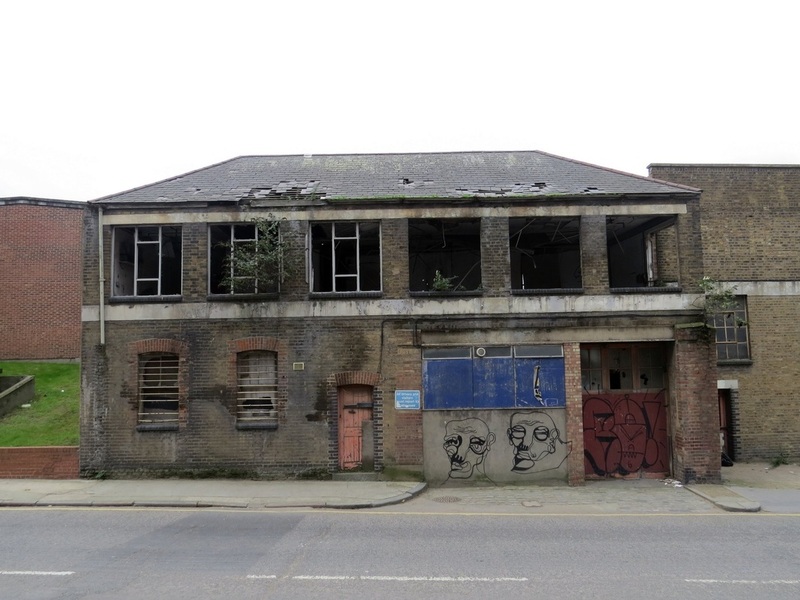 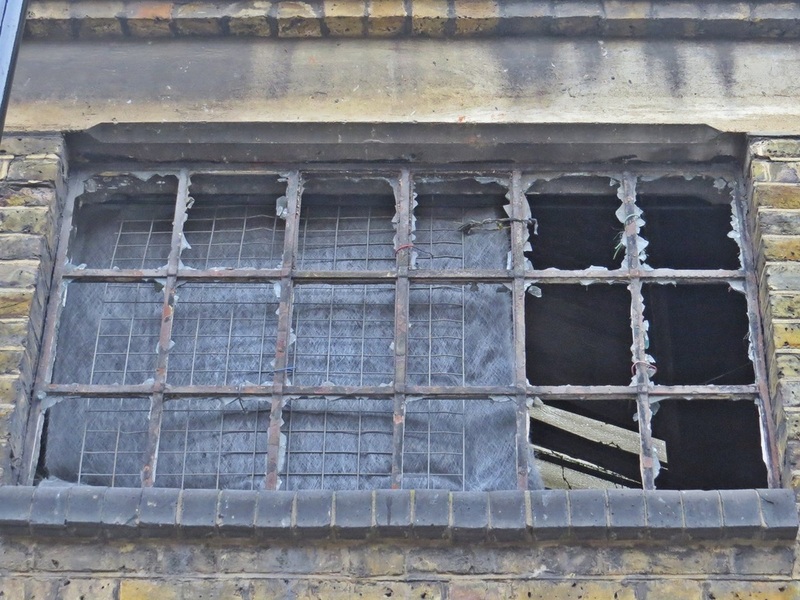 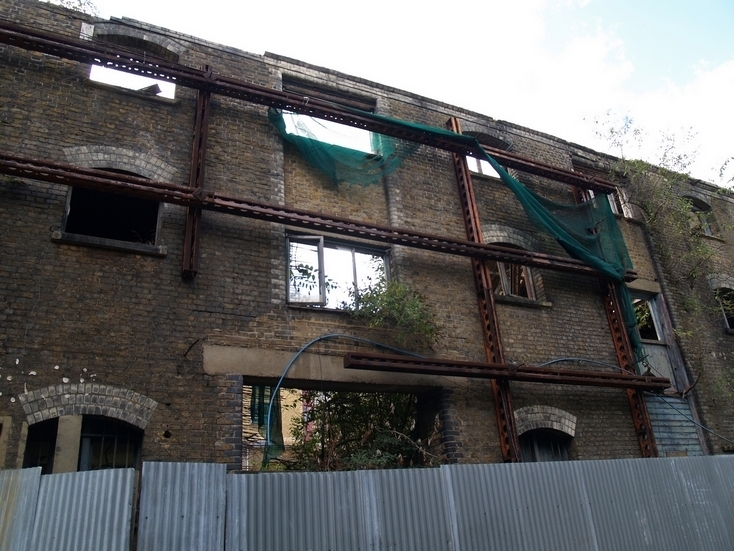 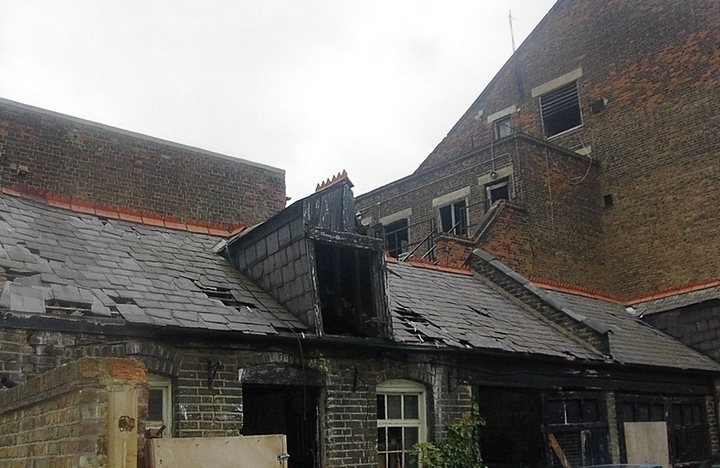 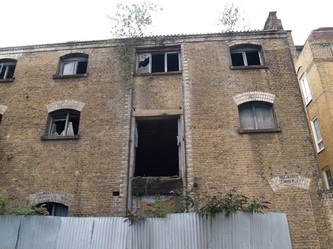 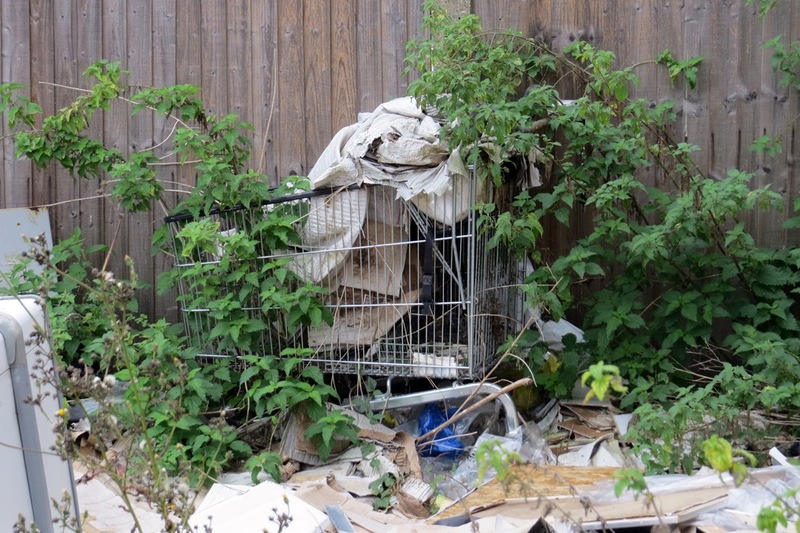 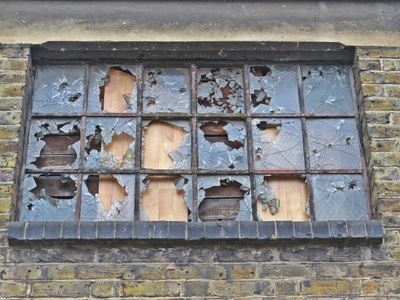 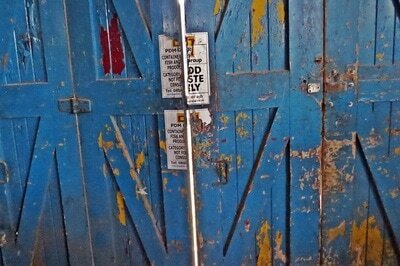 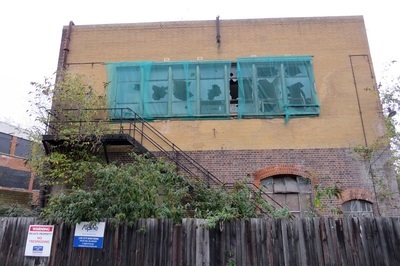 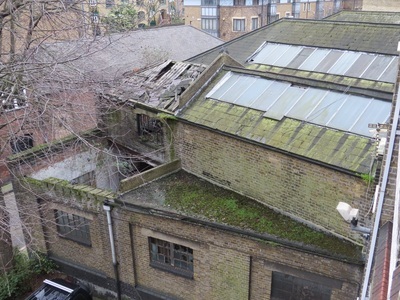 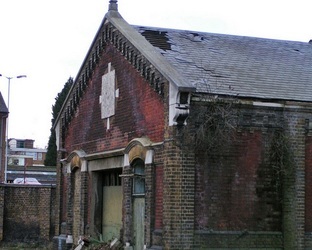 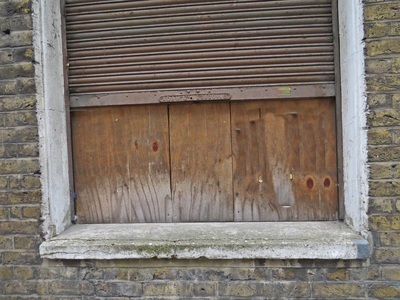 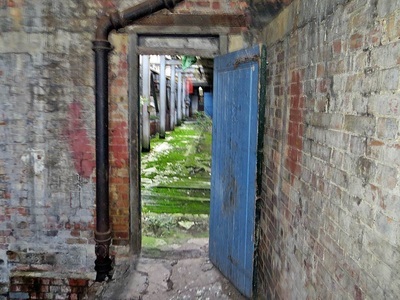 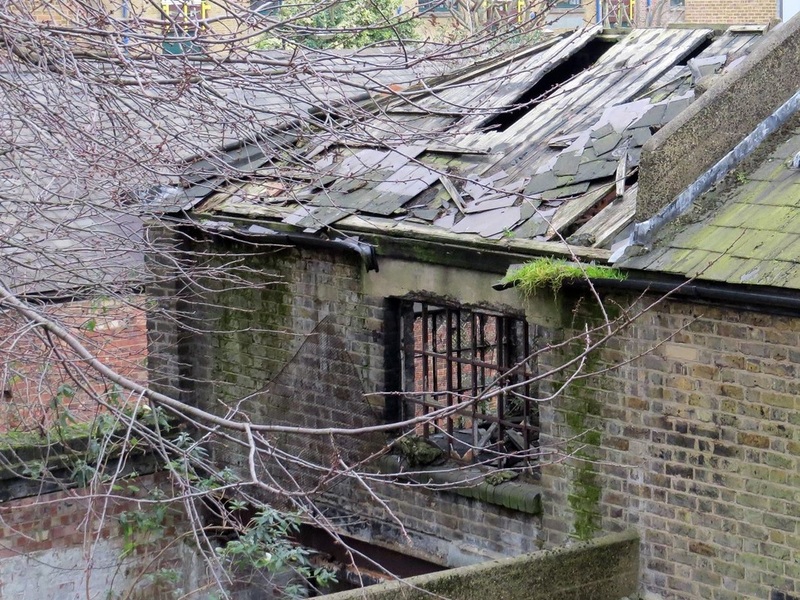 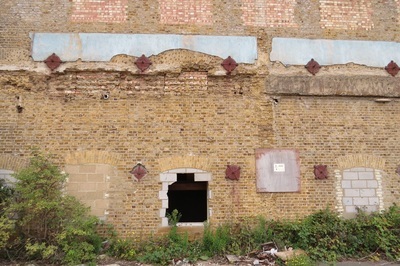 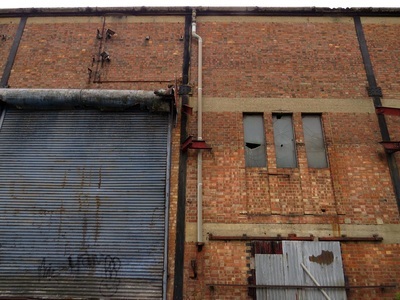 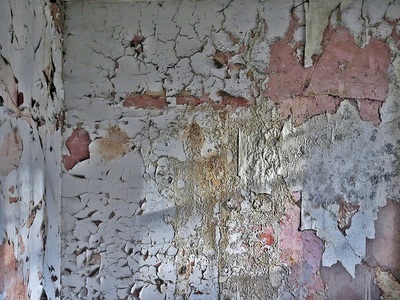 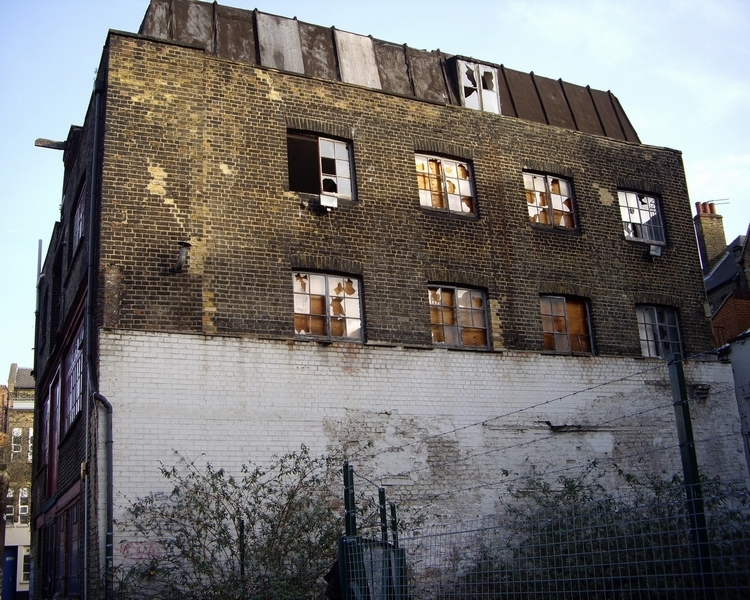 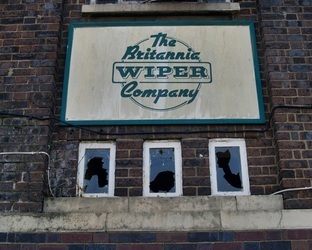 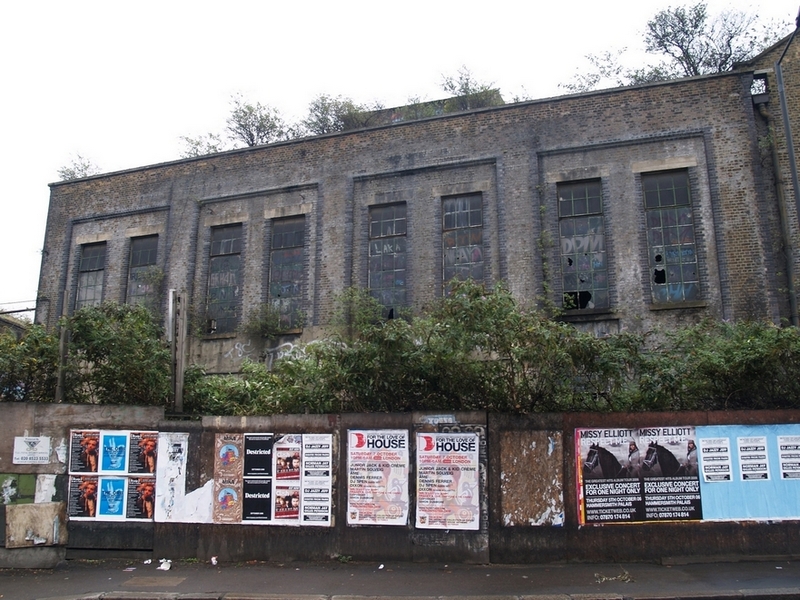 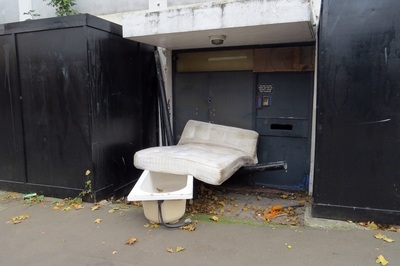 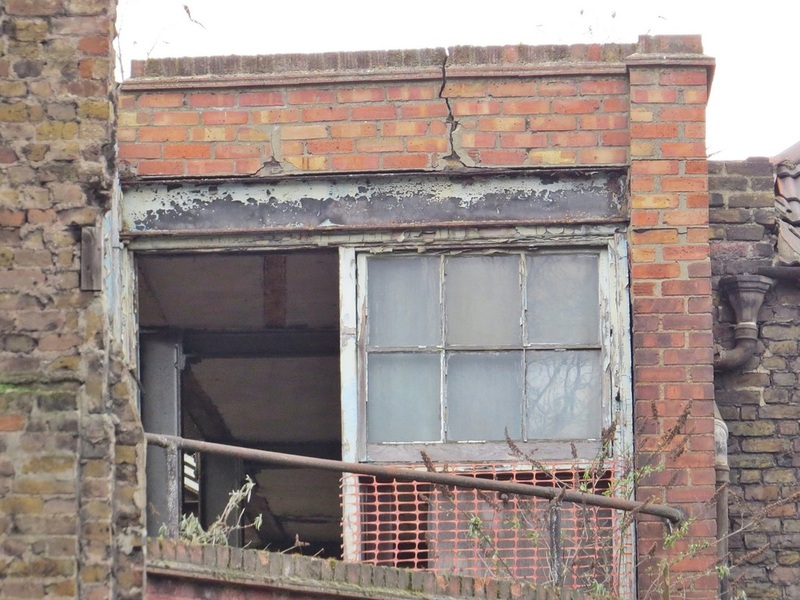 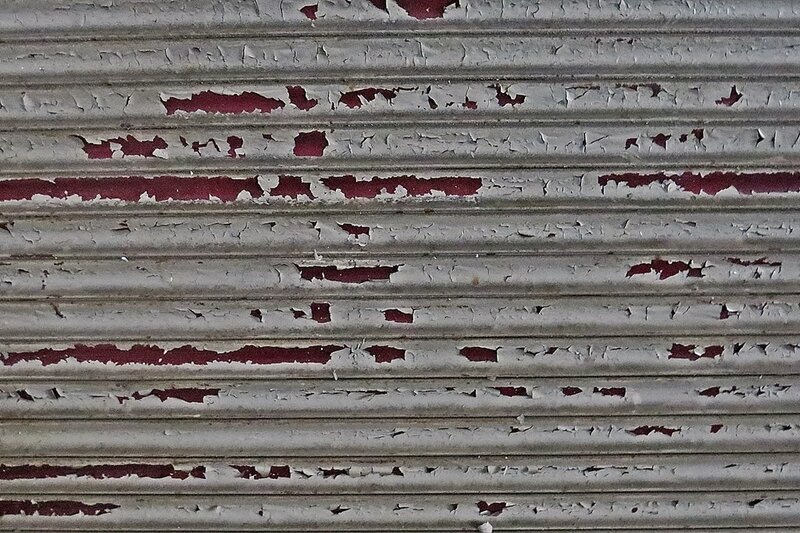 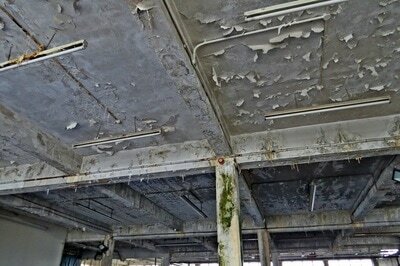 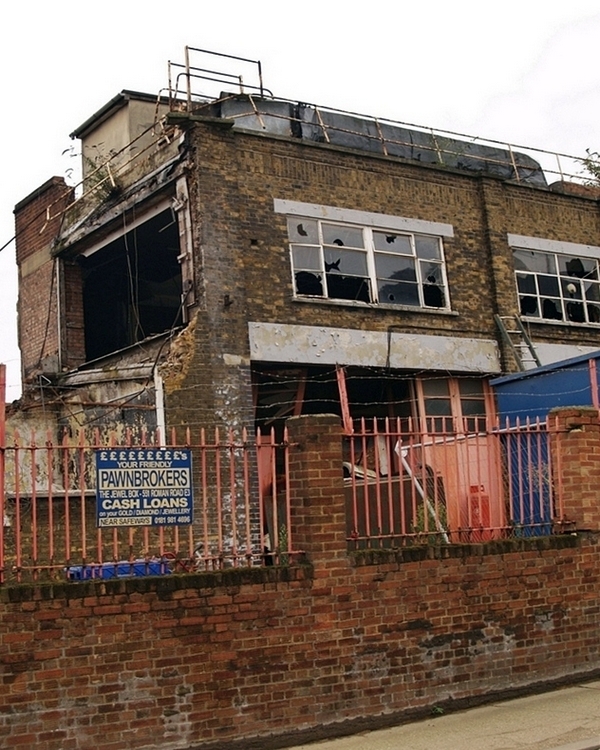 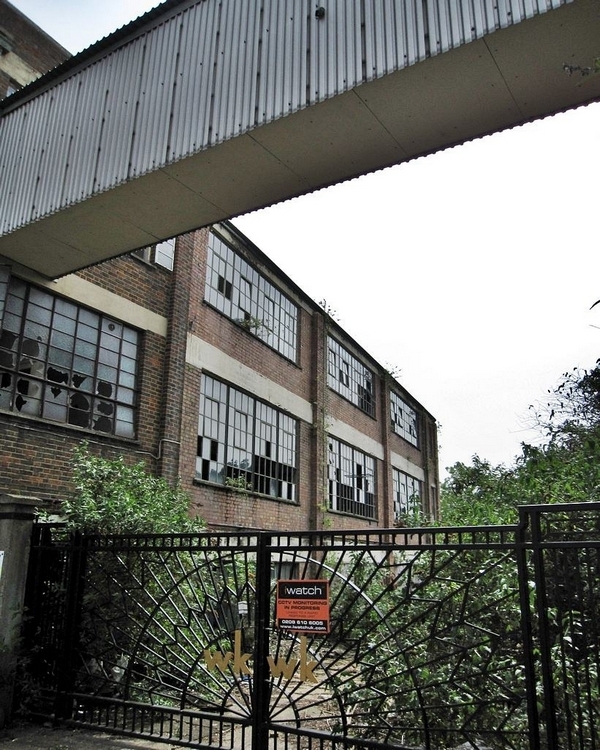 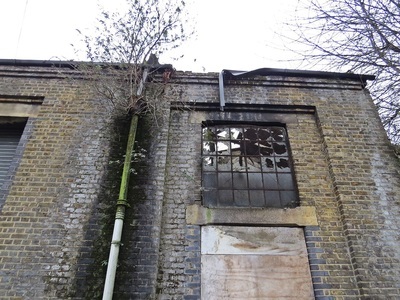 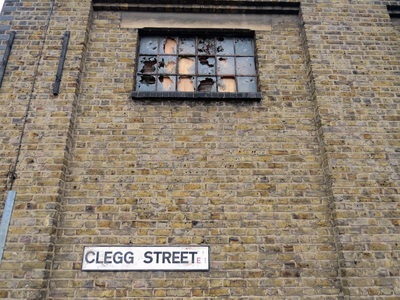 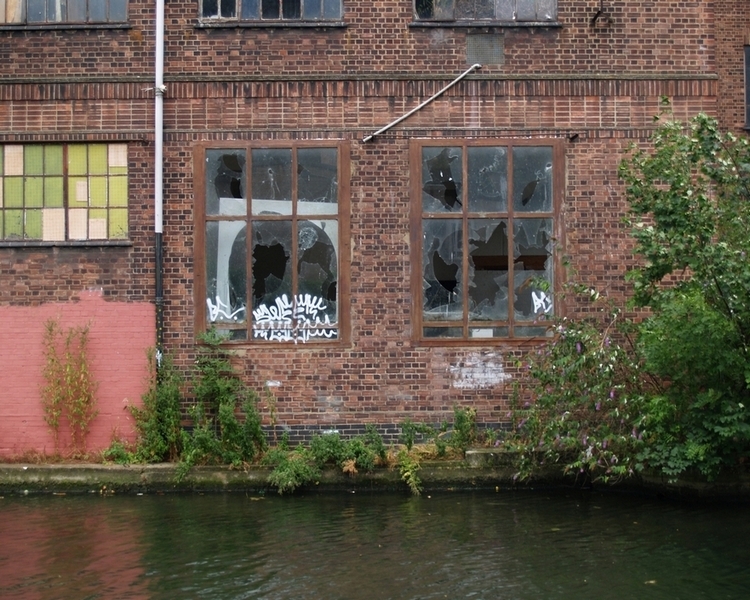 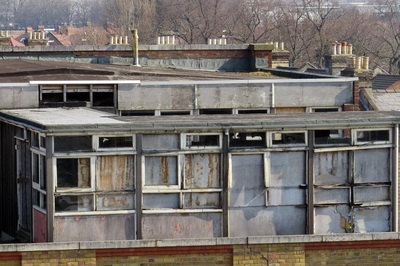 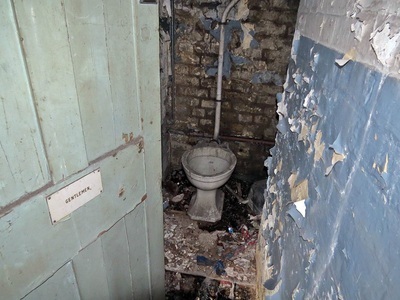 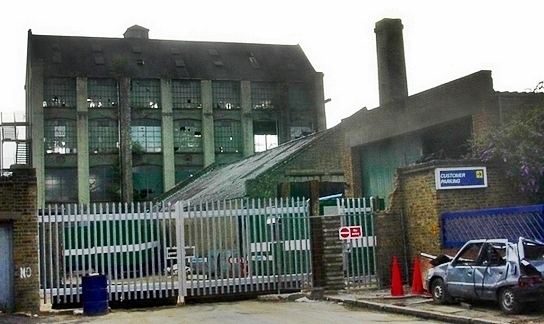 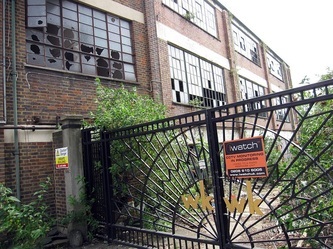 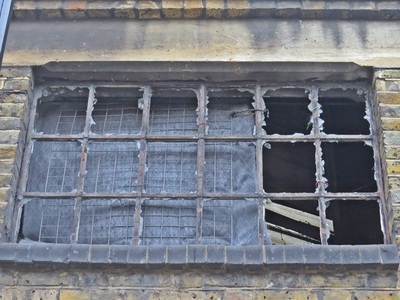 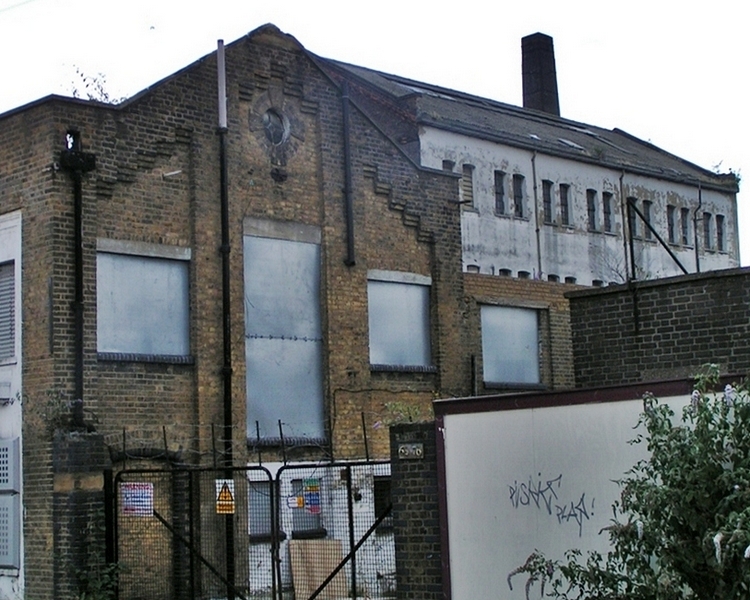 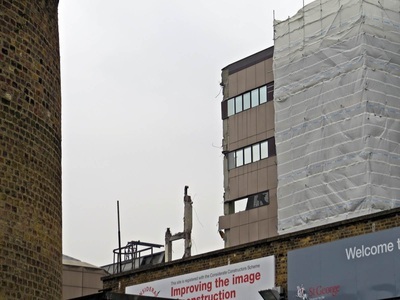 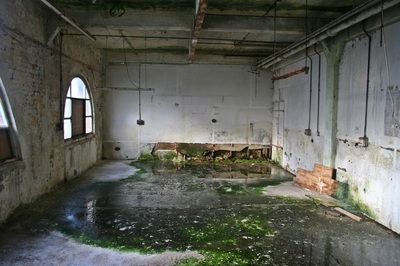 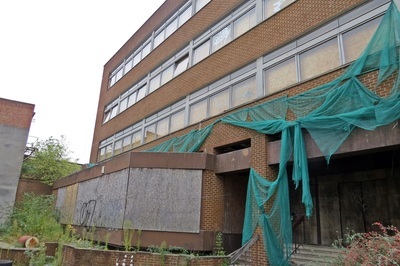 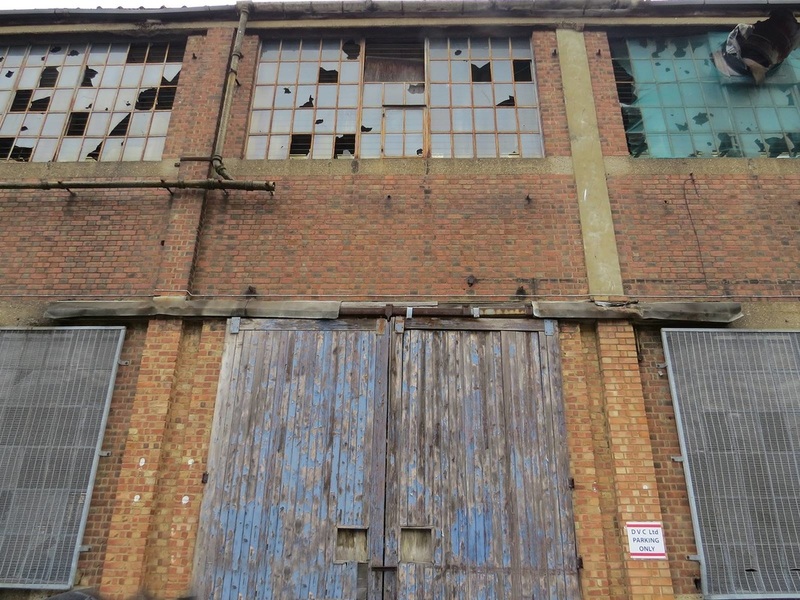 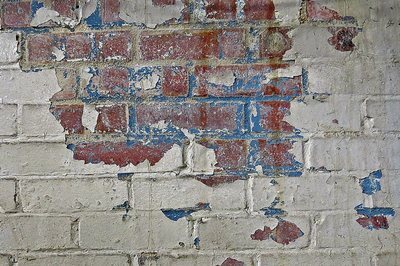 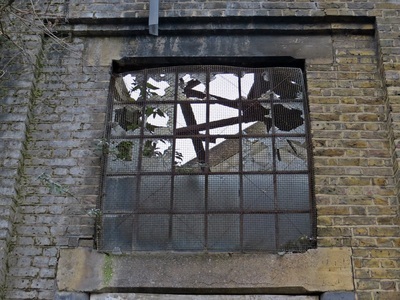 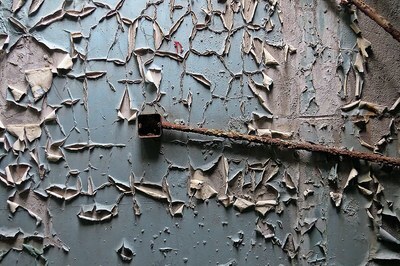 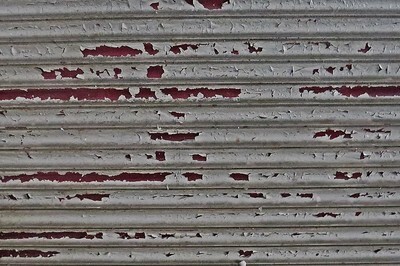 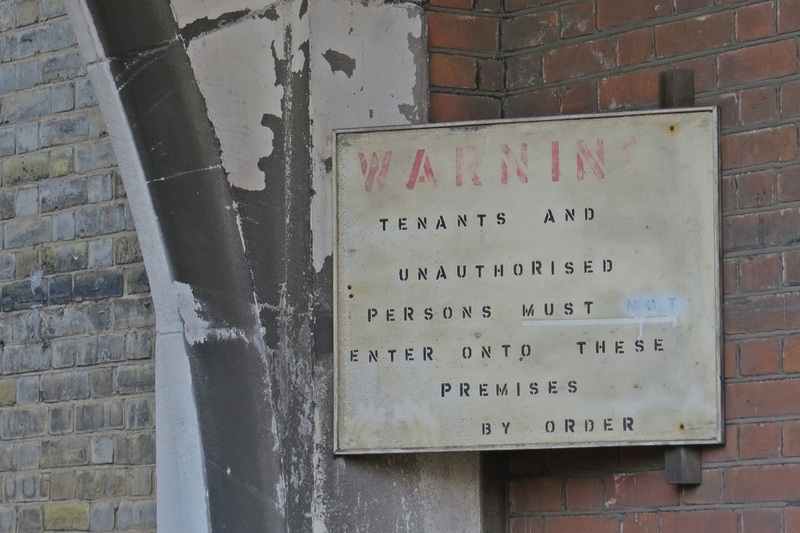 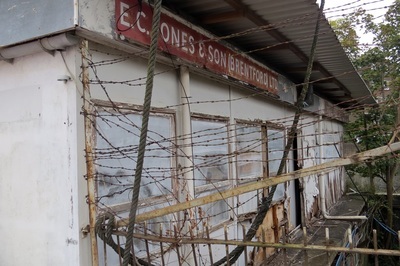 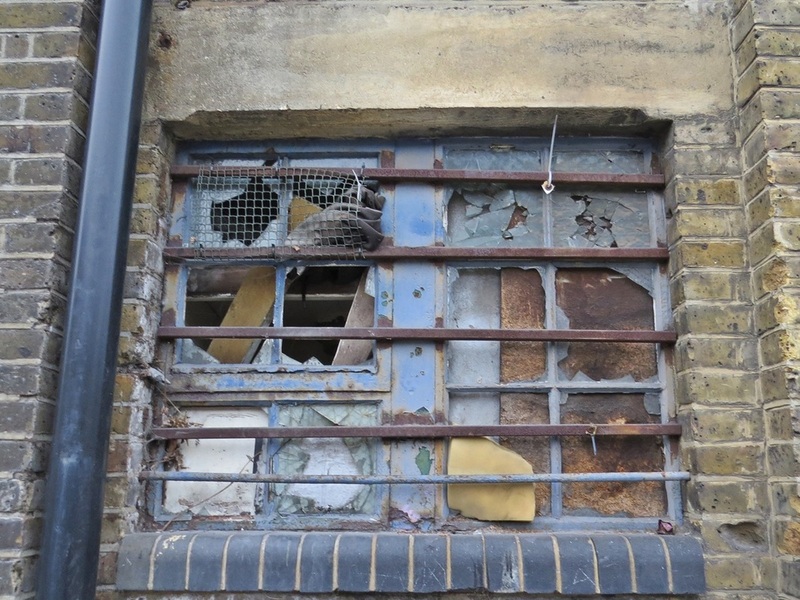 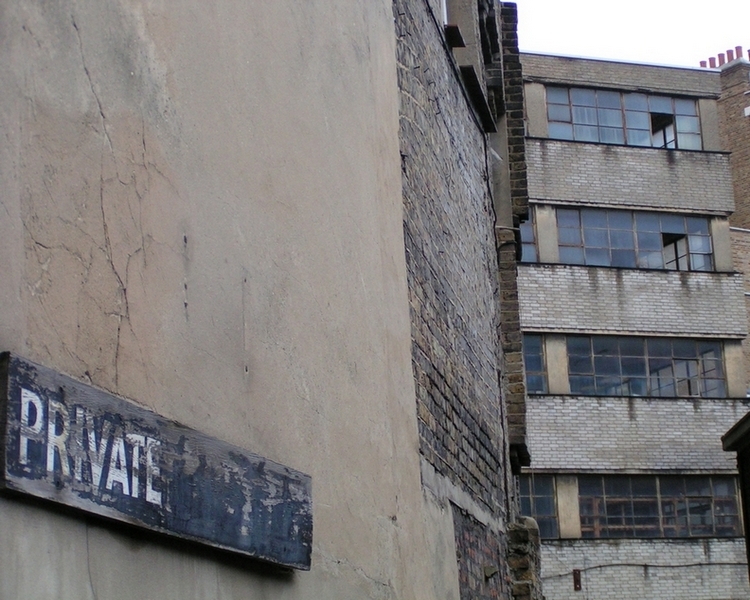 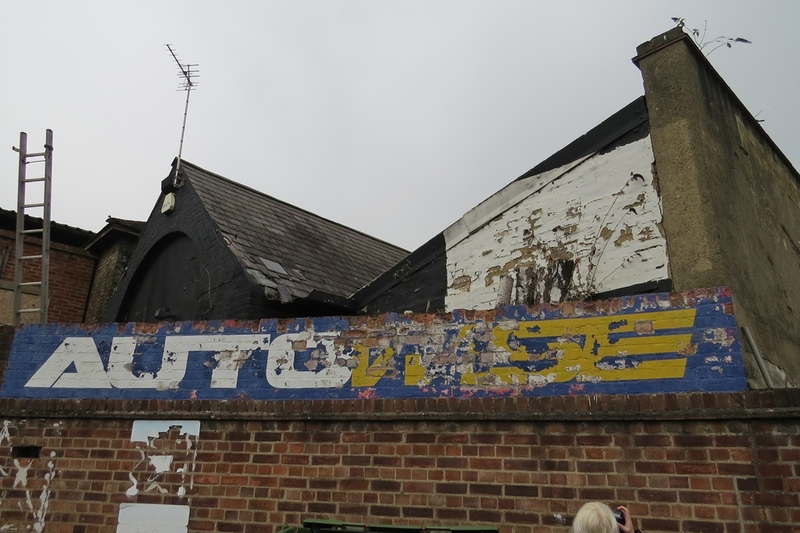 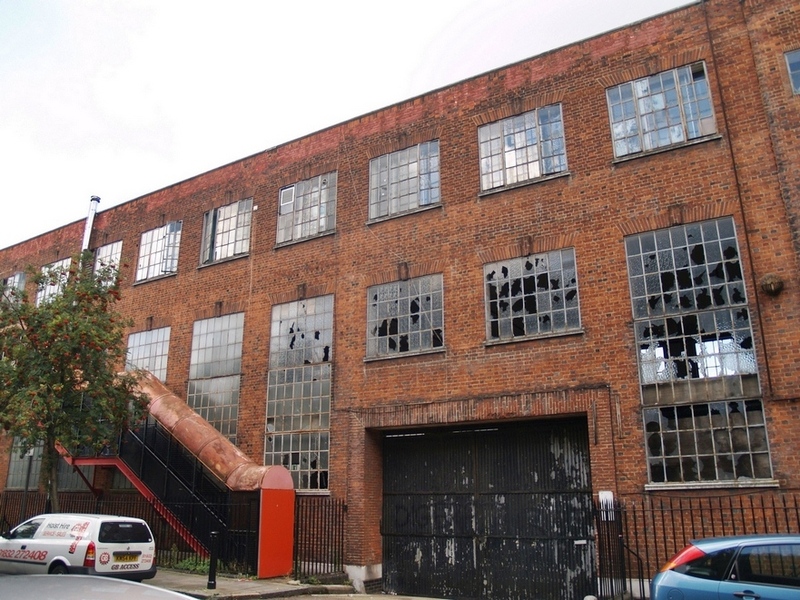 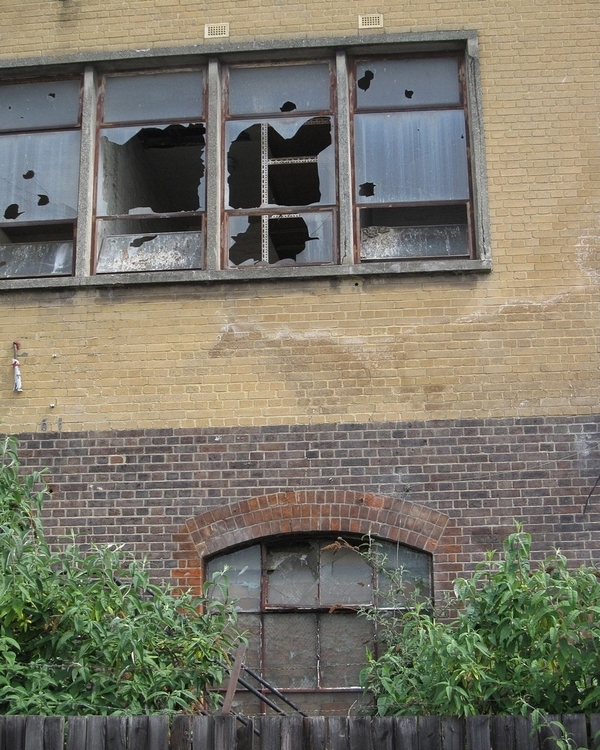 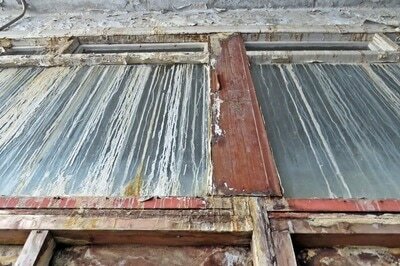 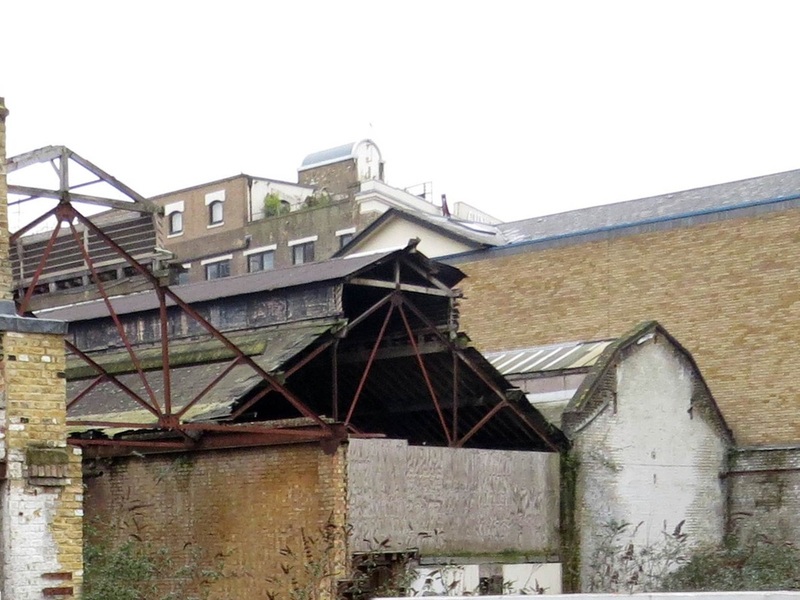 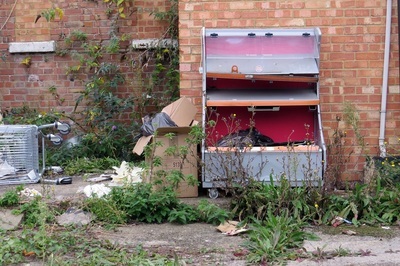 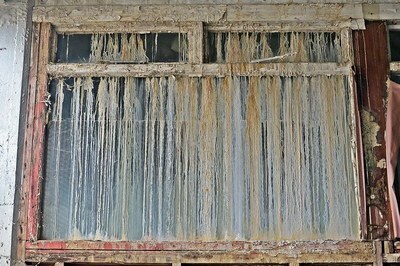 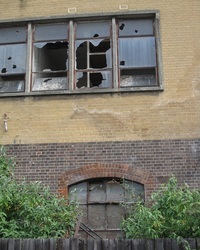 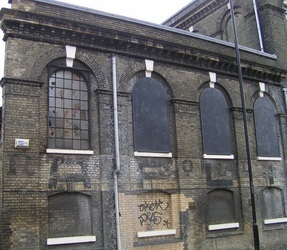 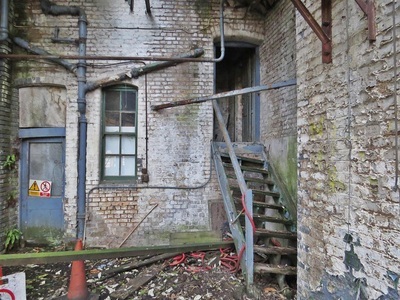 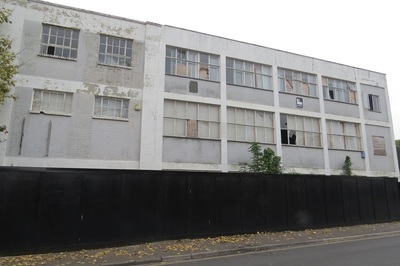 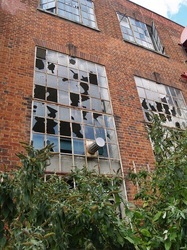 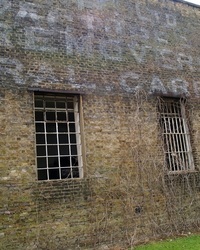 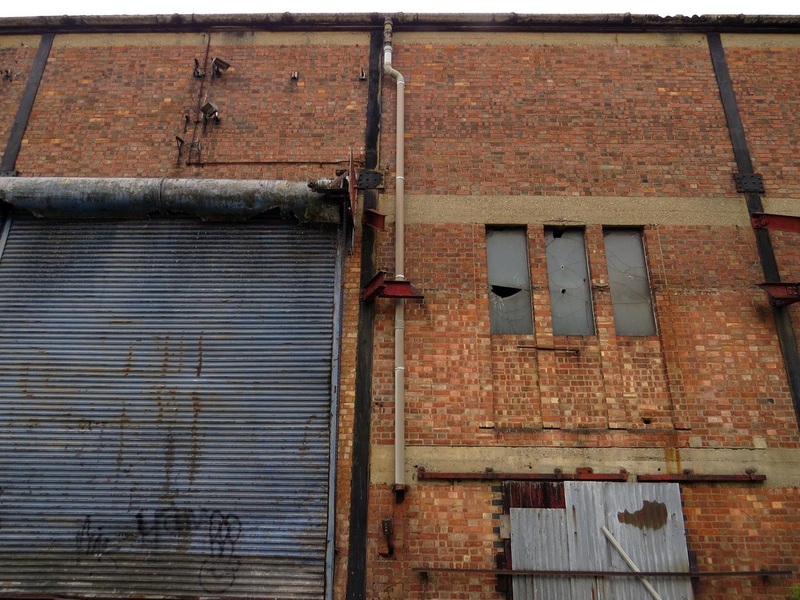 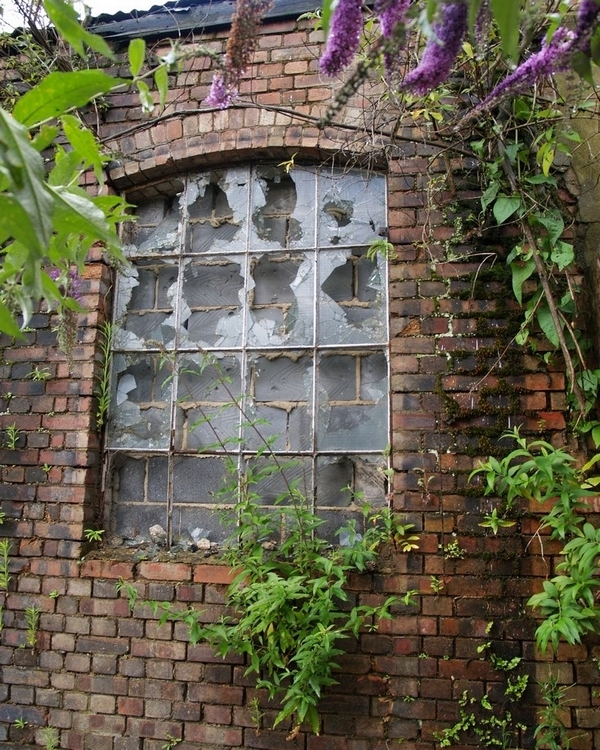 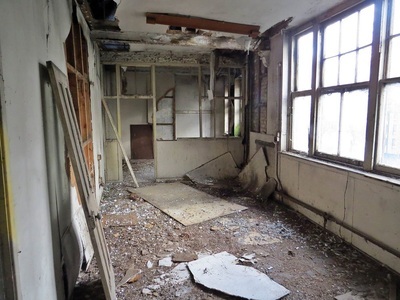 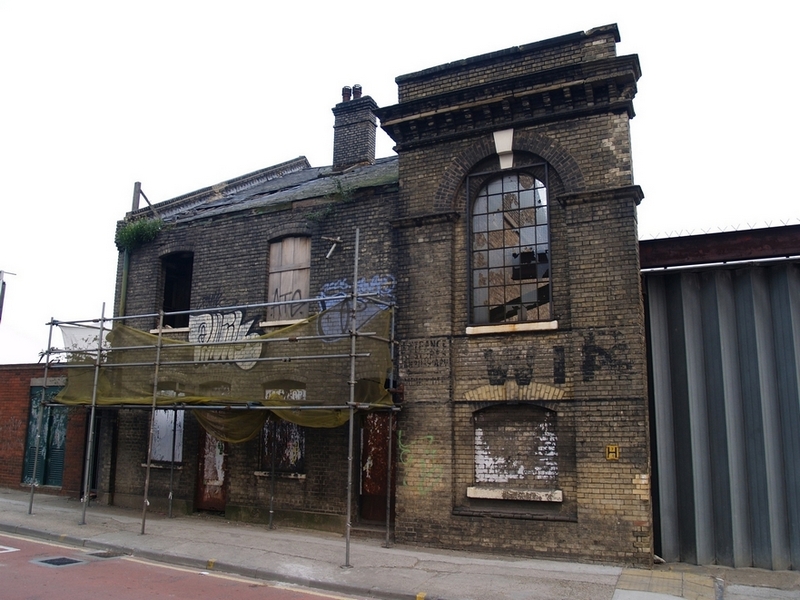 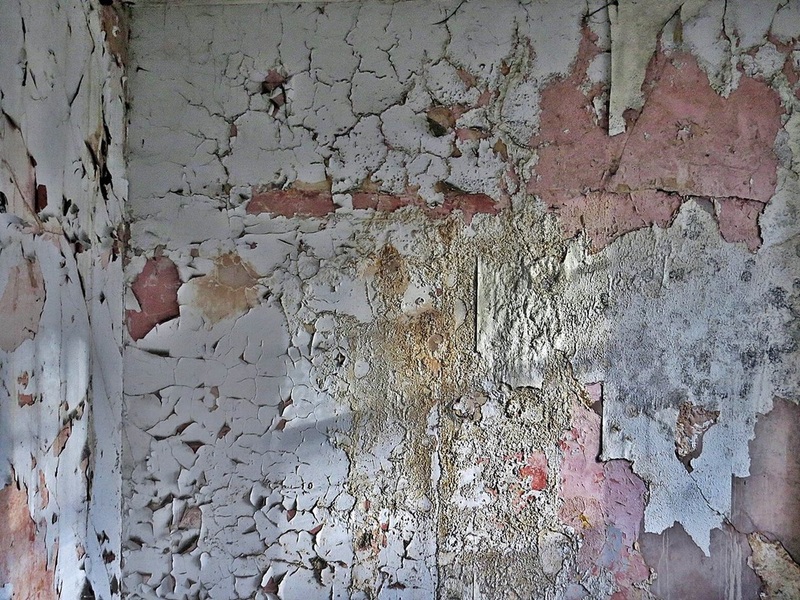 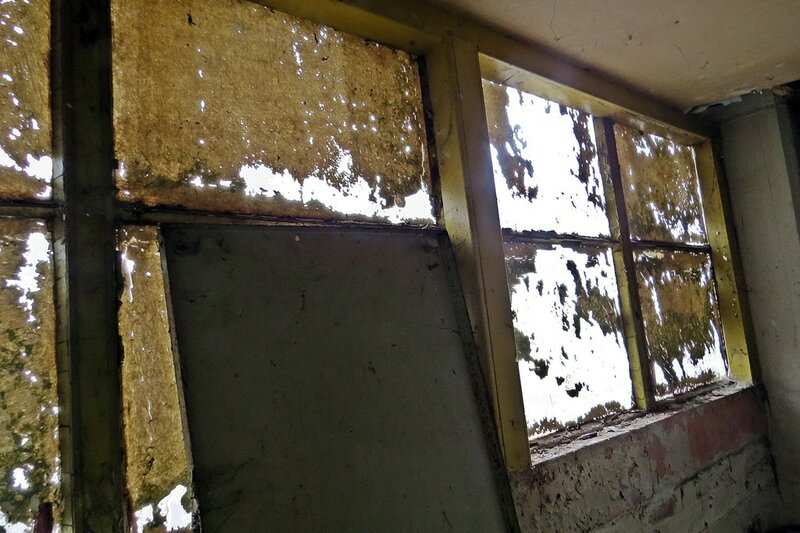 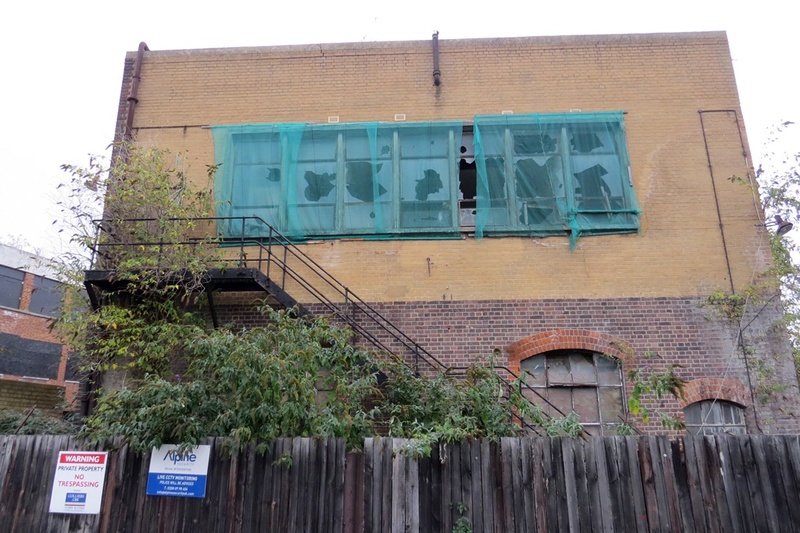 ​​Since this website started in 2003 I have posted various photos of dereliction in and around Brentford High Street. Many new builds have been created around the area and plans are well underway to redevelop the rest of the area. 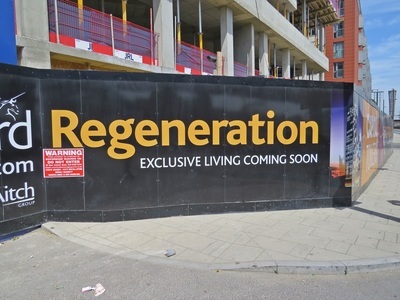 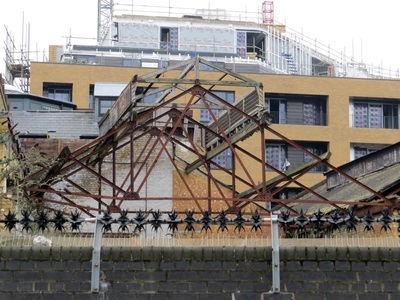 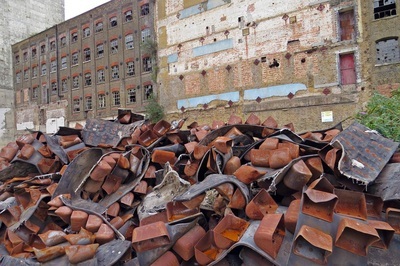 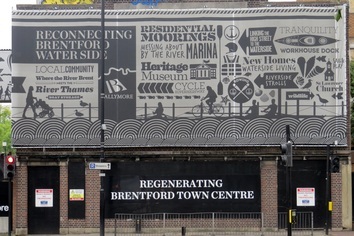 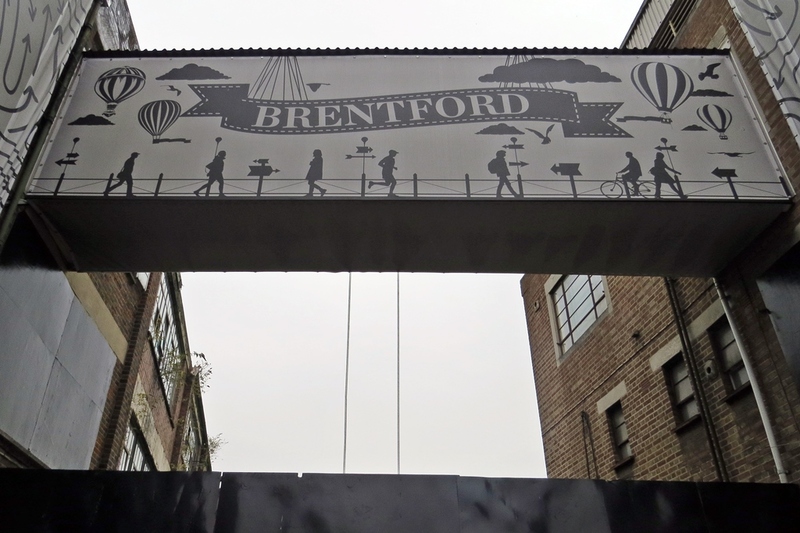 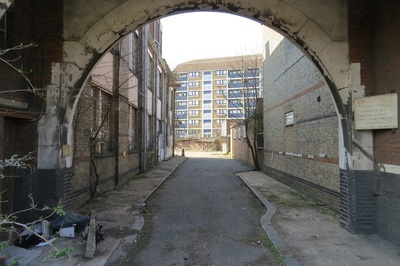 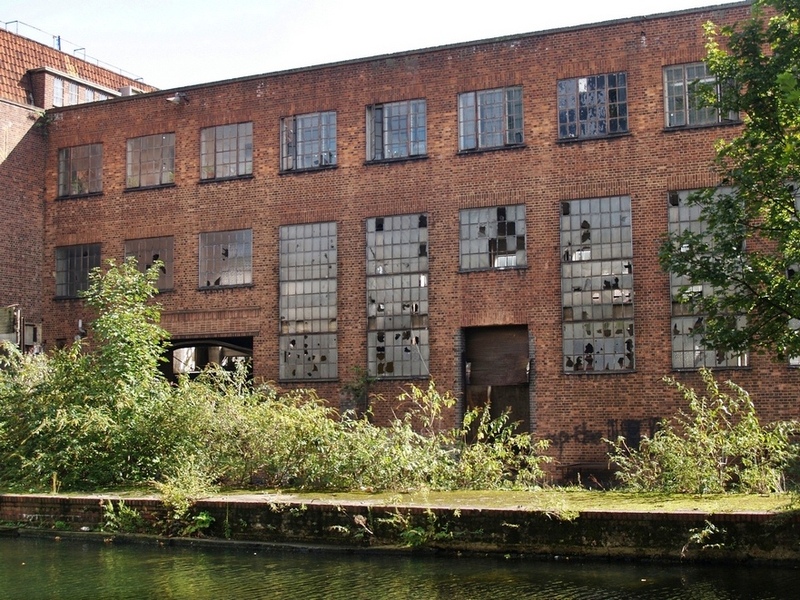 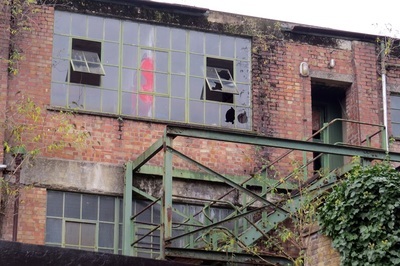 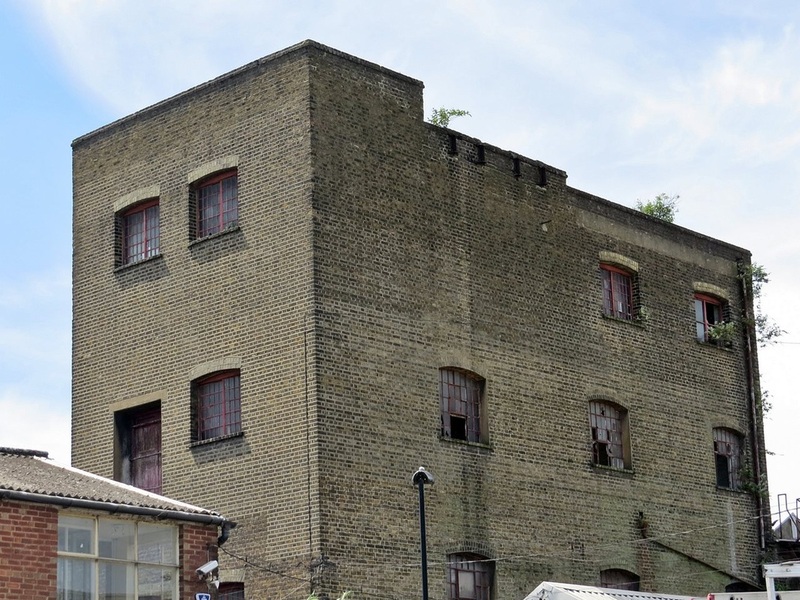 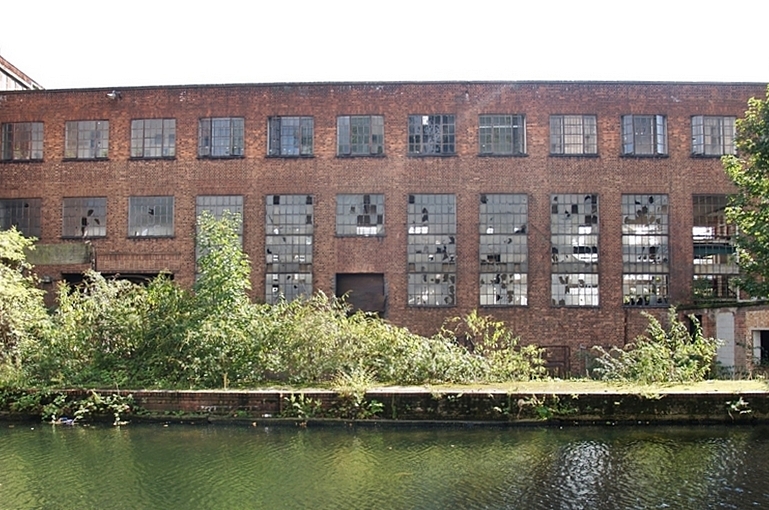 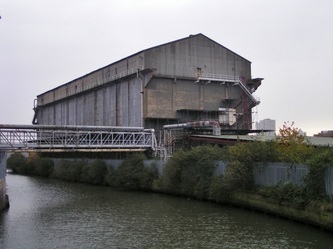 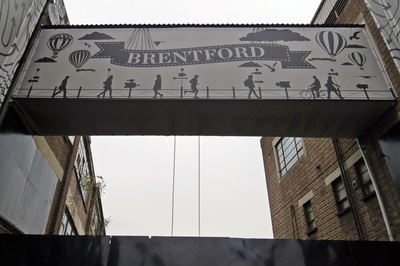 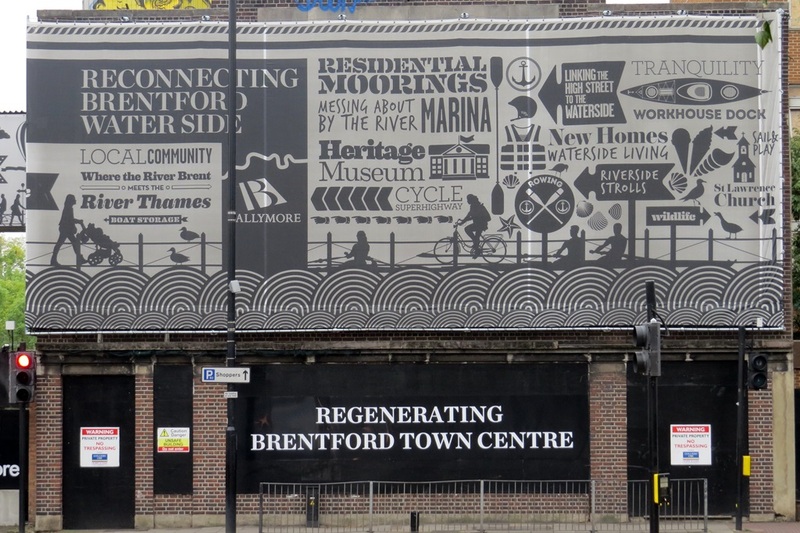 According to the Evening Standard earlier in 2016: "Regeneration will transform Brentford’s high street and waterfront while new homes include factory and warehouse conversions with loft-style flats for young Londoners.Regeneration is set to wake up the high street......"
Wilson & Kyle were an engineering company set up in nearby Catherine Wheel Yard in the 1920s then moved to these buildings on the High Street in 1950s and closed in 1998 and the site remains derelict - for the moment at least.They made/serviced fuel injectors for diesel engines. 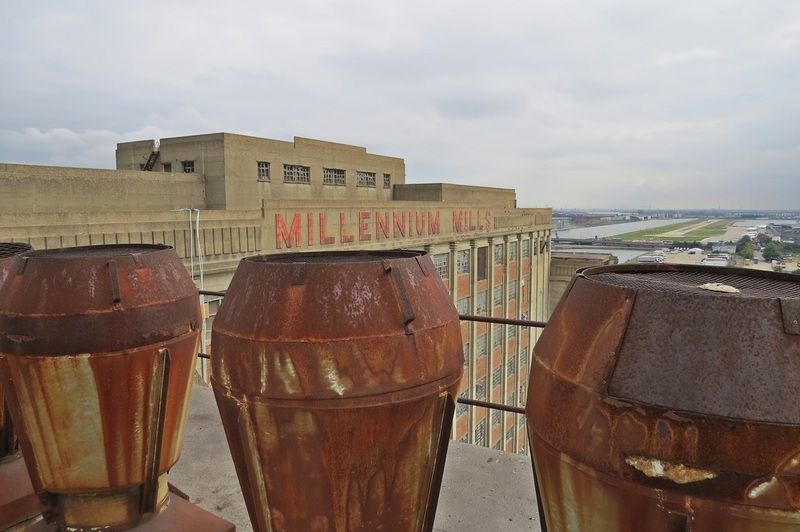 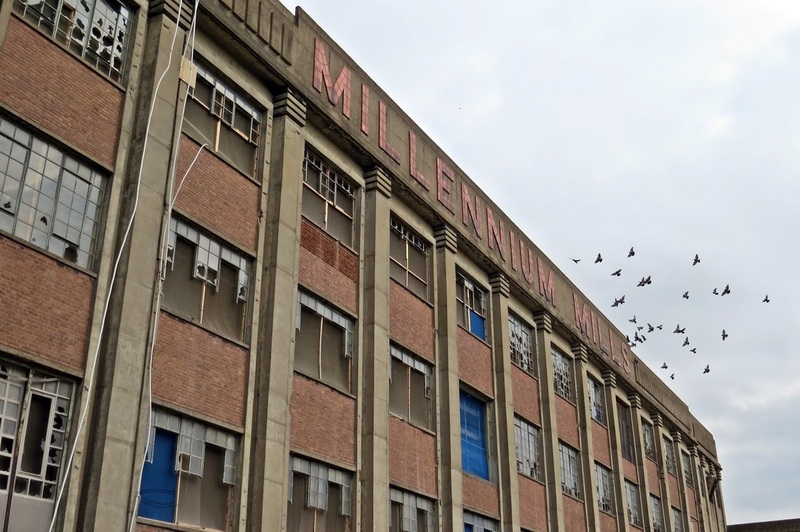 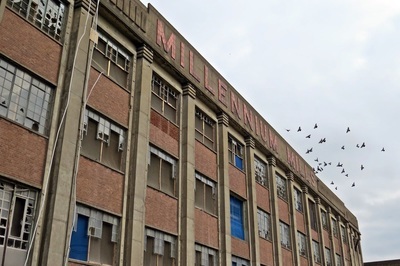 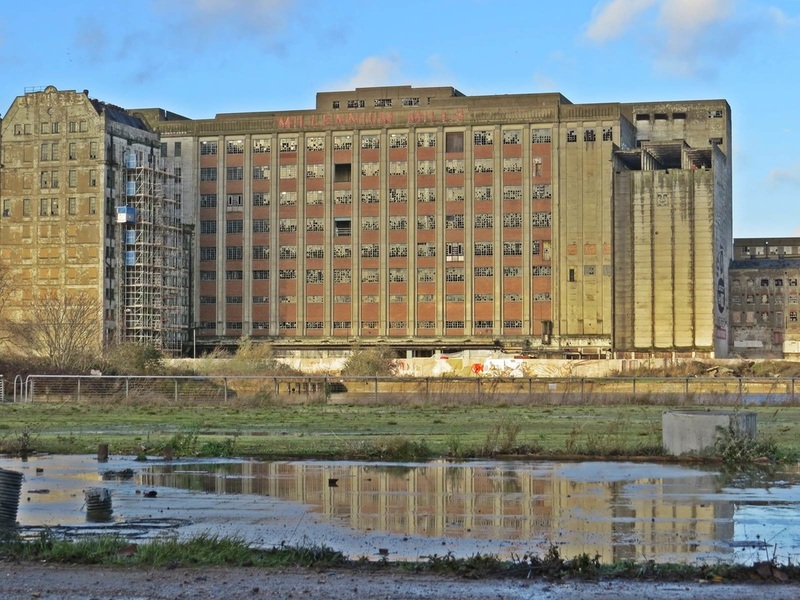 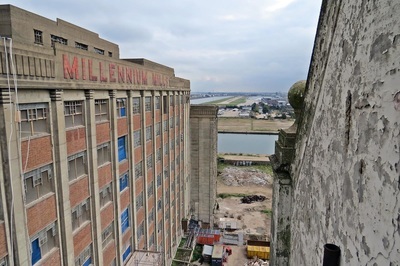 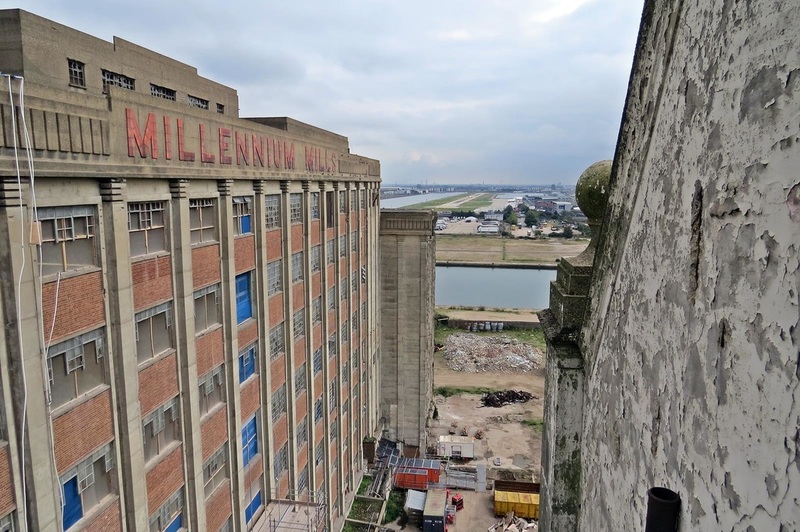 Built in the 1930s to replace earlier granaries and mills, the Millennium Mills were one of the largest (flour) mill complexes ever to be built in London. 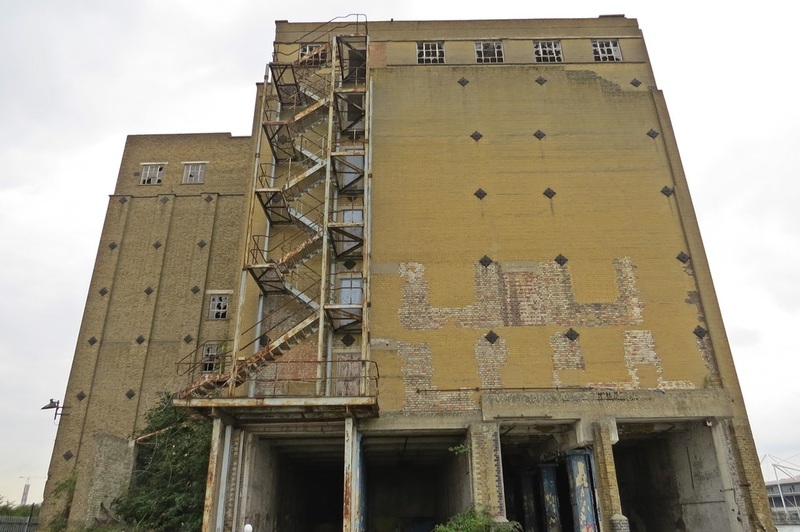 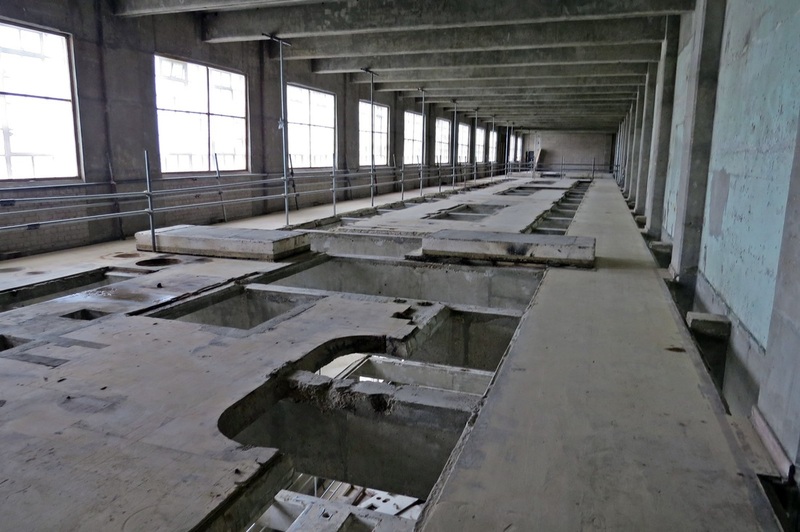 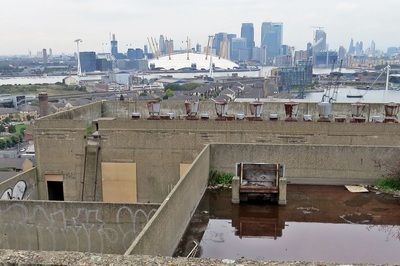 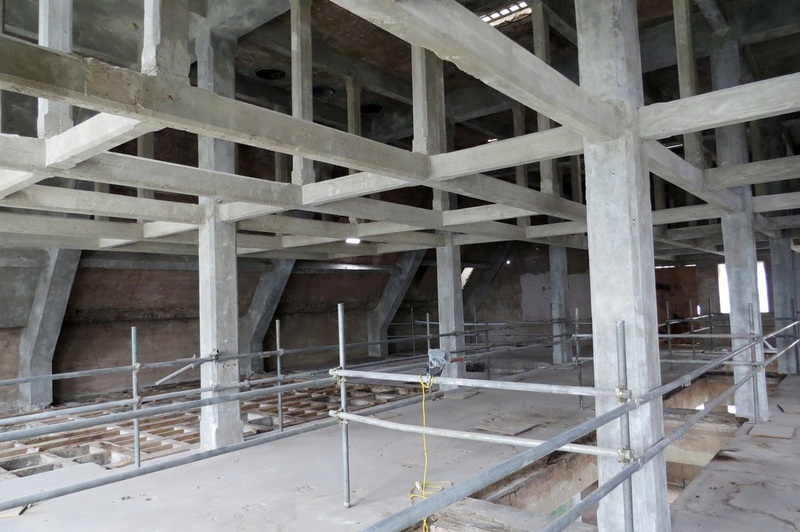 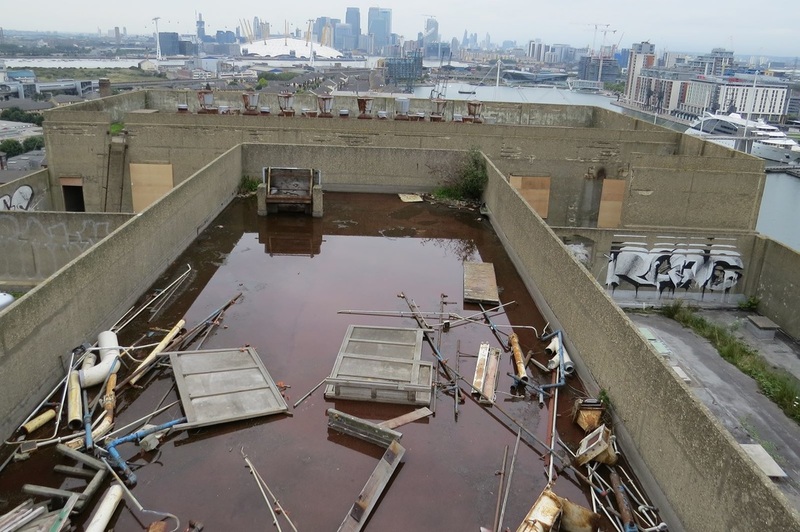 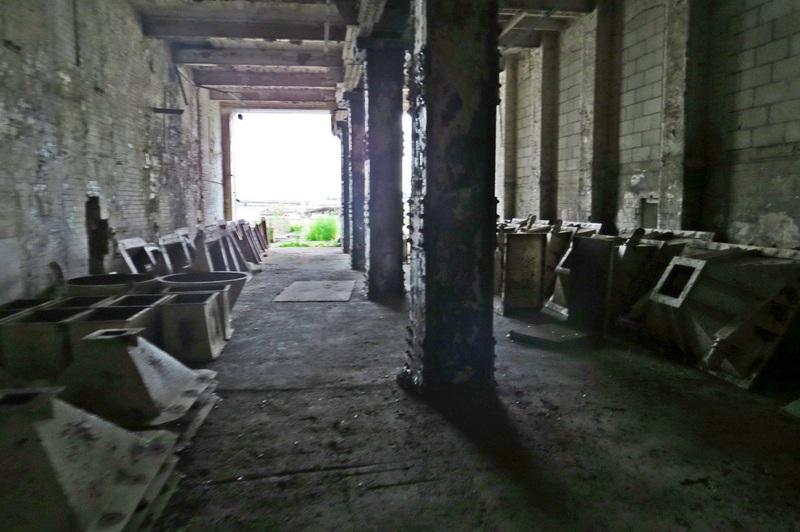 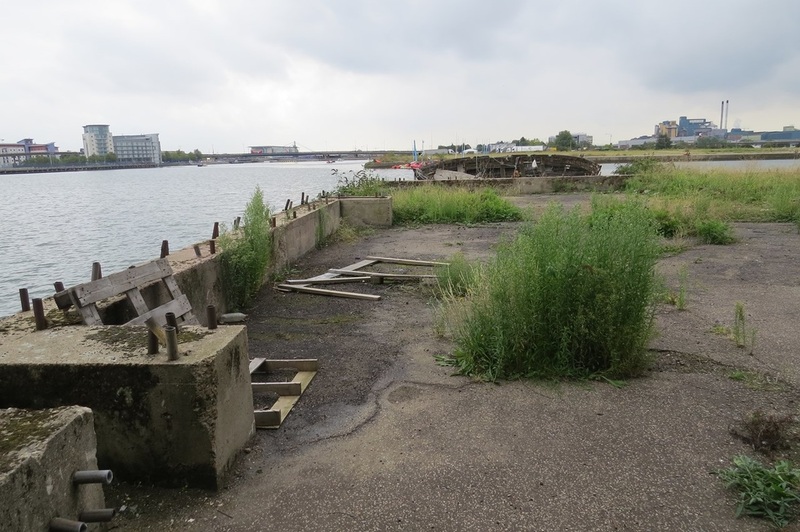 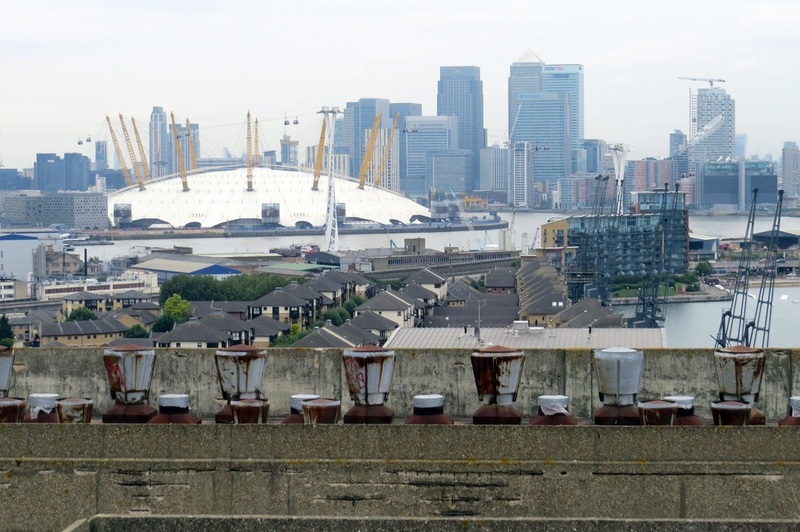 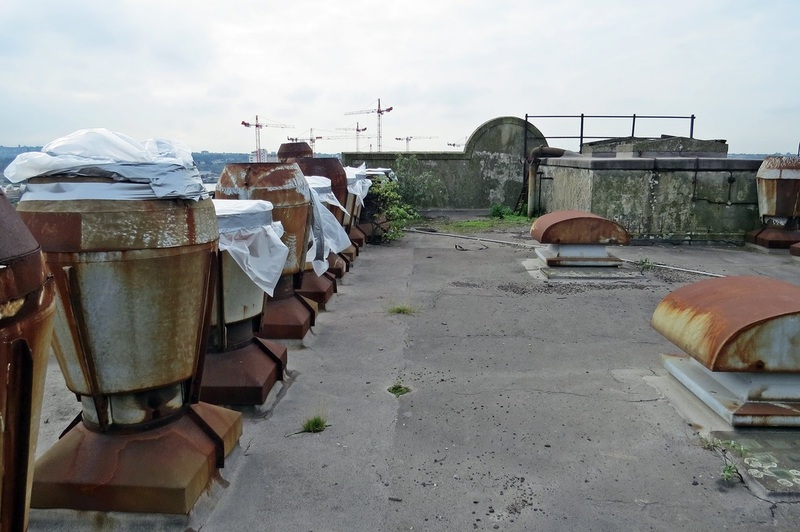 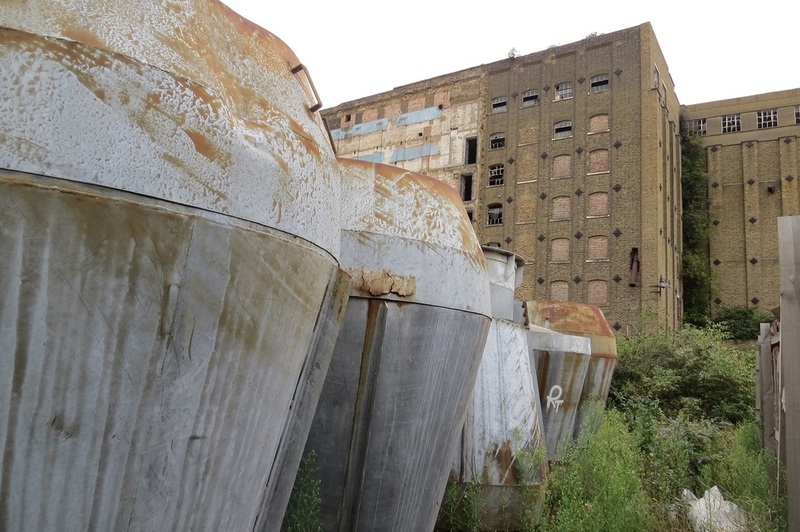 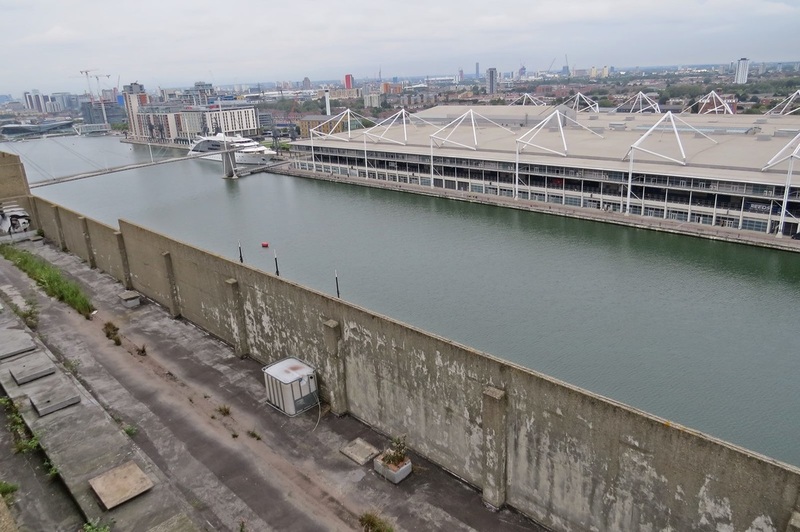 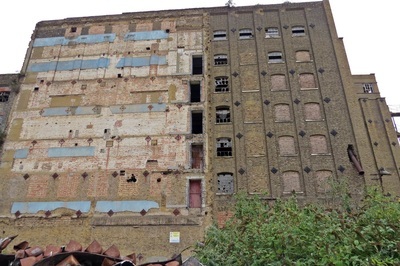 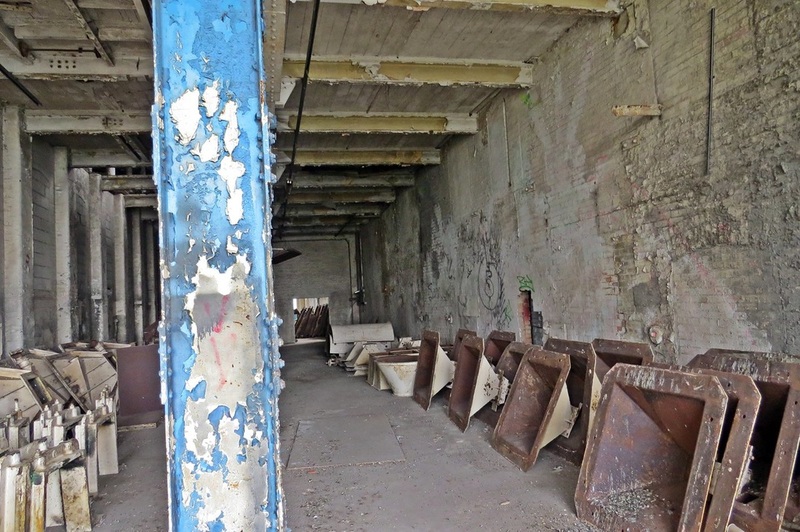 Industry in the docklands area of London began to decline in the 1980s, however, and this complex of reinforced concrete granaries finally succumbed in 1992 when Spillers Milling Limited moved out, transferring staff and production to their mill at Tilbury Docks. 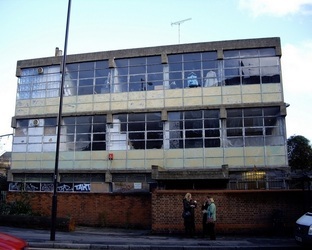 Since then the building has made frequent appearances on television, recent examples being in a trailer for the drama series Life on Mars, and as a backdrop for a Derren Brown programme featuring Robbie Williams.This building was also used in the opening series of Ashes to Ashes. Plus providing the backdrop for music videos by The Smiths, Orbital, Coldplay, Lamb, Arctic Monkeys to name but a few. 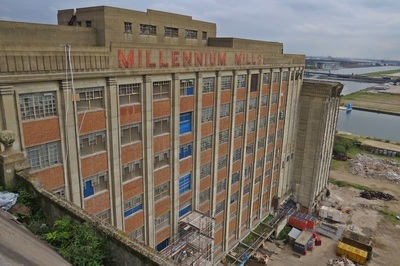 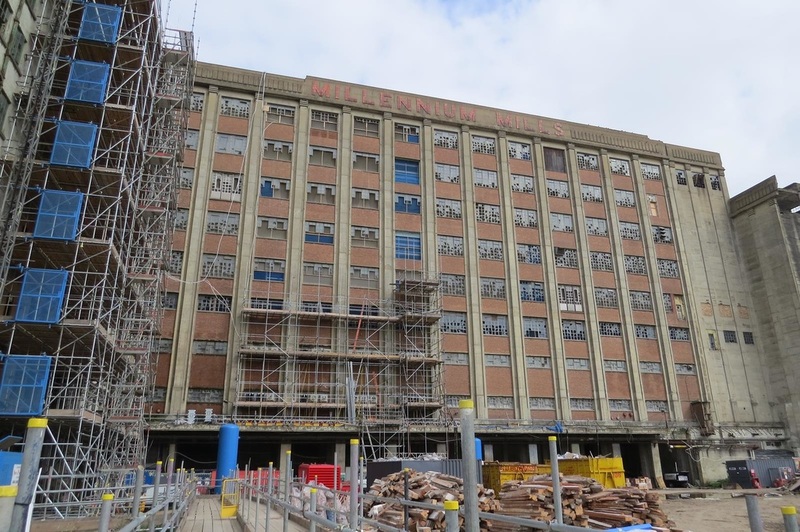 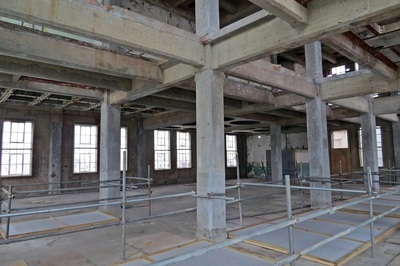 Offering 500,000 sq ft of space, the Mills are being restored to retain its art deco frontage & high ceilings and plans to offer space for businesses, start ups, restaurants and bars.The land around the Mills will provide for 3,000 new homes, new squares and gardens and a new pedestrian bridge across the dock. They may also enjoy the more dubious benefit of aircraft noise from the adjacent London City Airport. 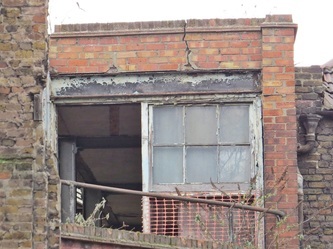 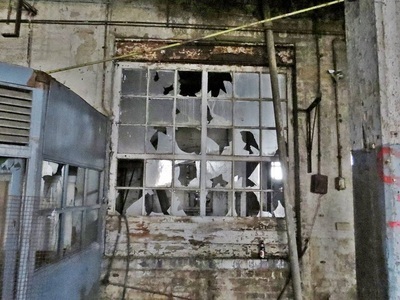 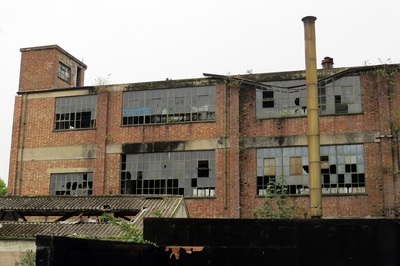 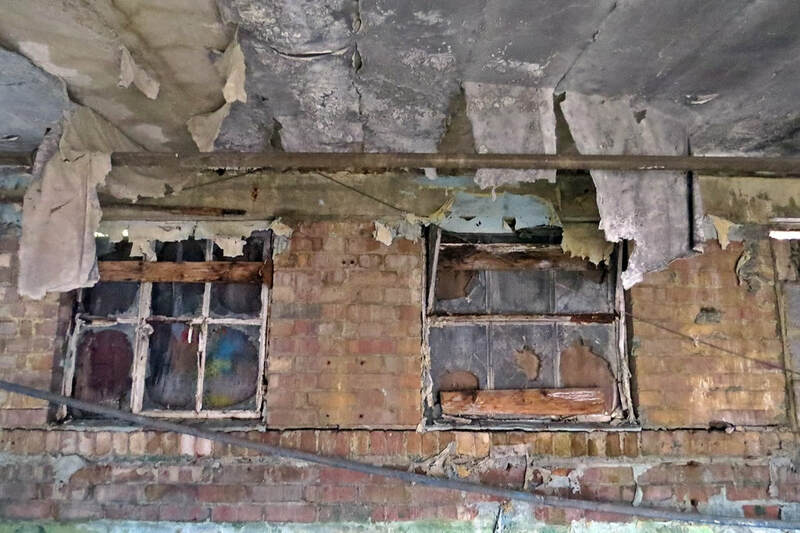 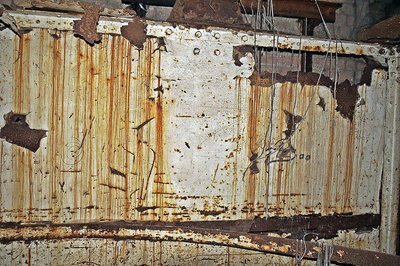 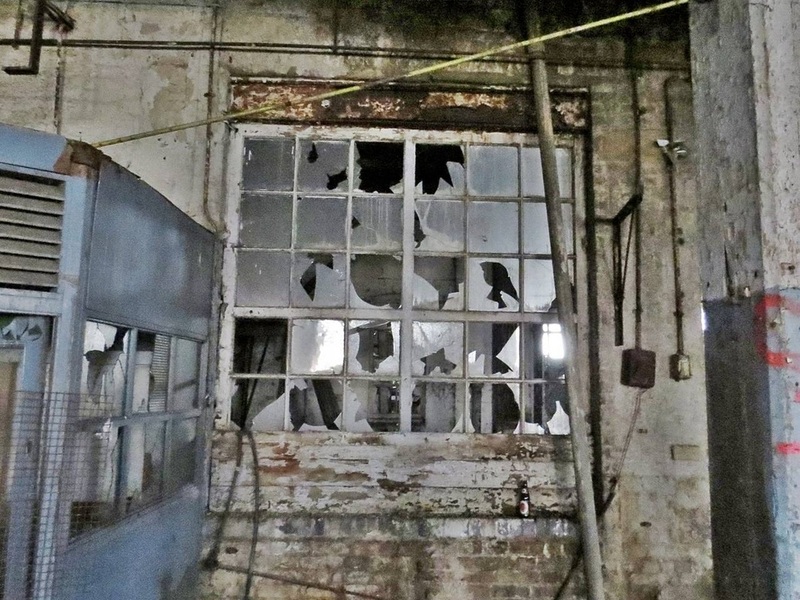 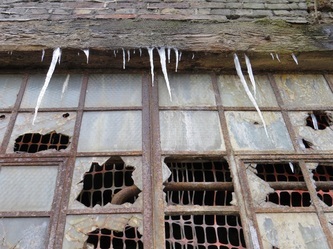 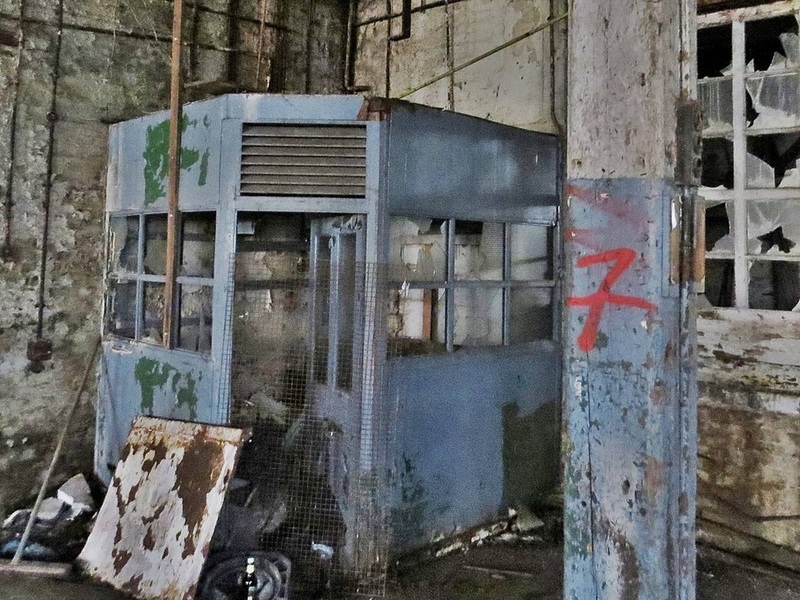 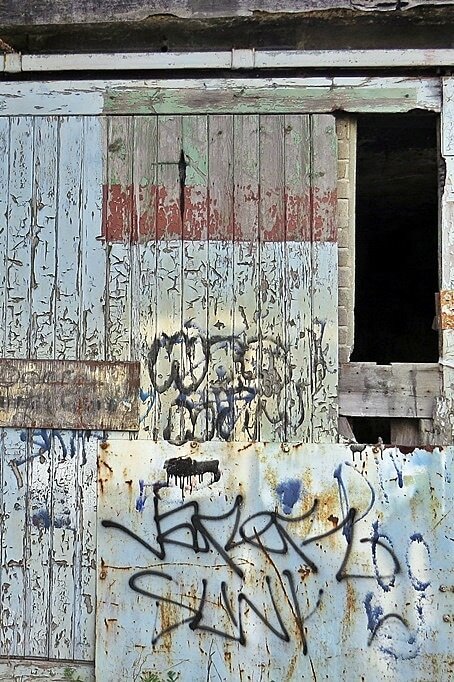 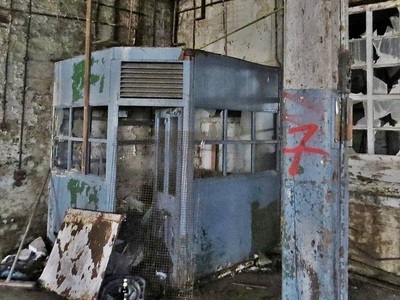 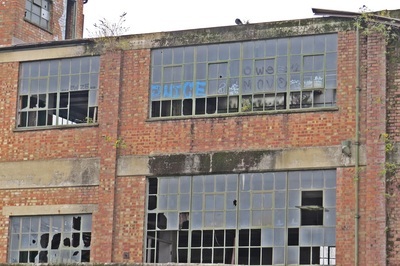 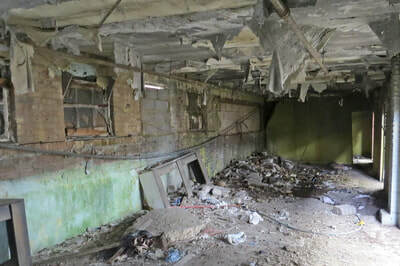 Steve Dicken writes to Derelict London : "I was an apprentice at this mill in the seventies, seeing it again made me sad remembering the old days. 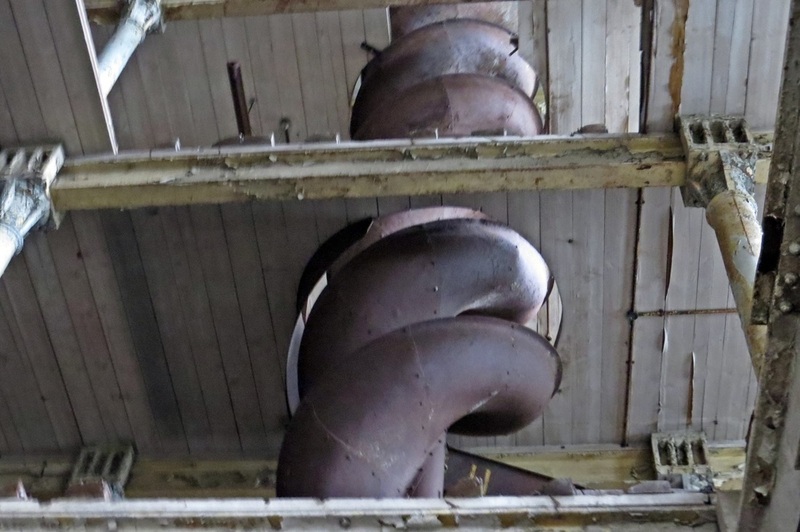 Me and my mates used to slide down the spiral bag chutes on night shift...I used to fix those elevators......ride the man hoist.... my sweat is in those timbers. 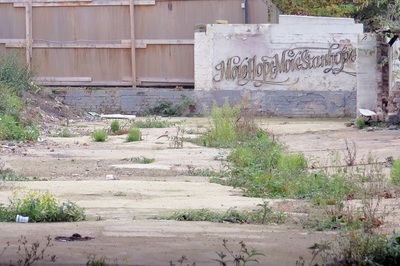 The car park where I parked my car is a field! 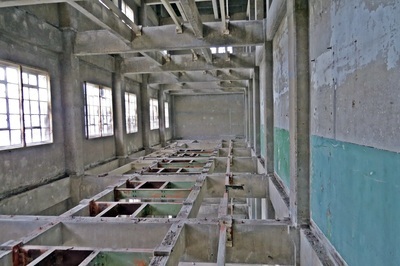 My Dad and brother worked there also - D silo, it was unused back then, just a giant pigeon roost. 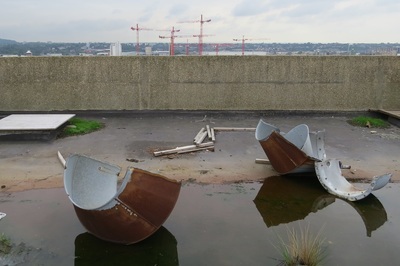 Swans nested behind the silos that stood away from the right hand end of Millennium (as you look coming in the dock gate). 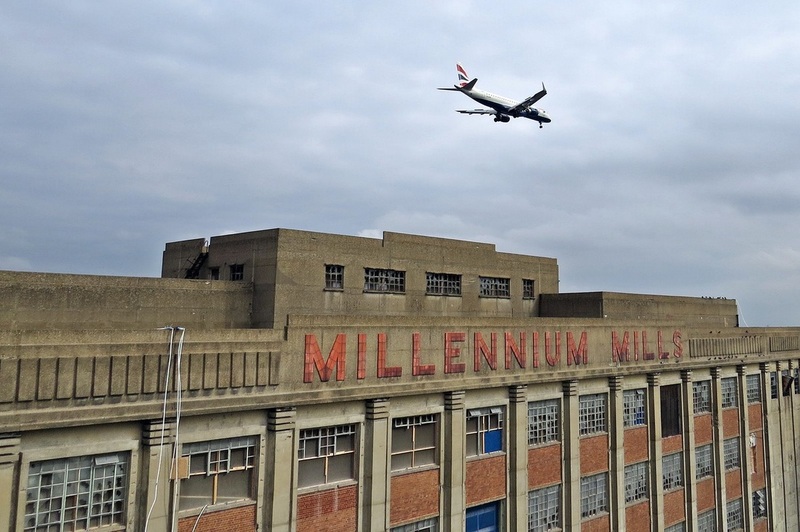 I used to watch them take off and land on the docks. 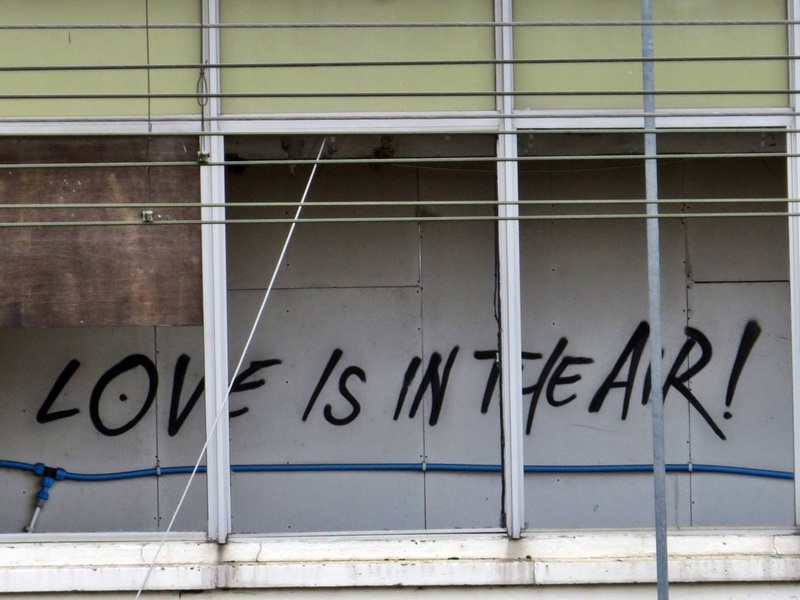 I kind of hope that some would still be there. I can still feel the rollerfloor in the soles of my feet and the smell of germ cooking and wheatfeed in the rain. 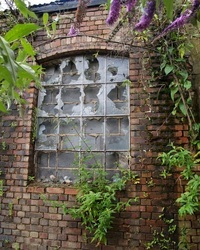 A lot of history and atmosphere lost forever." 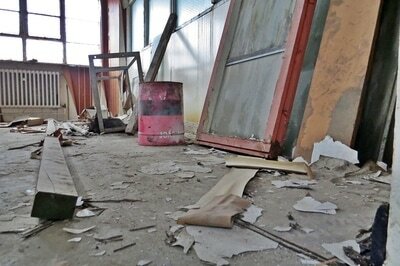 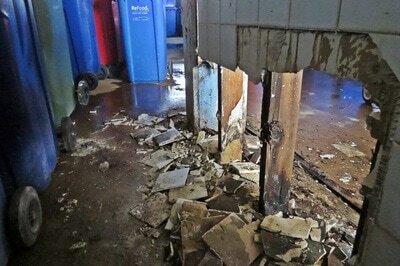 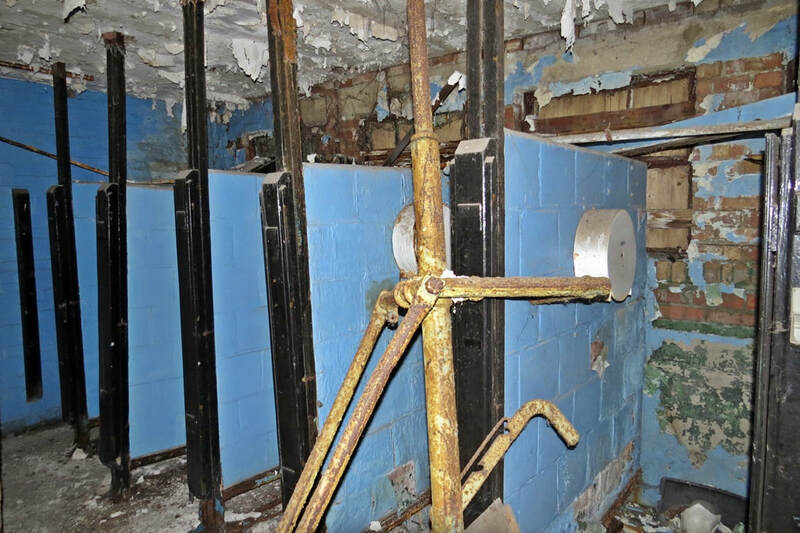 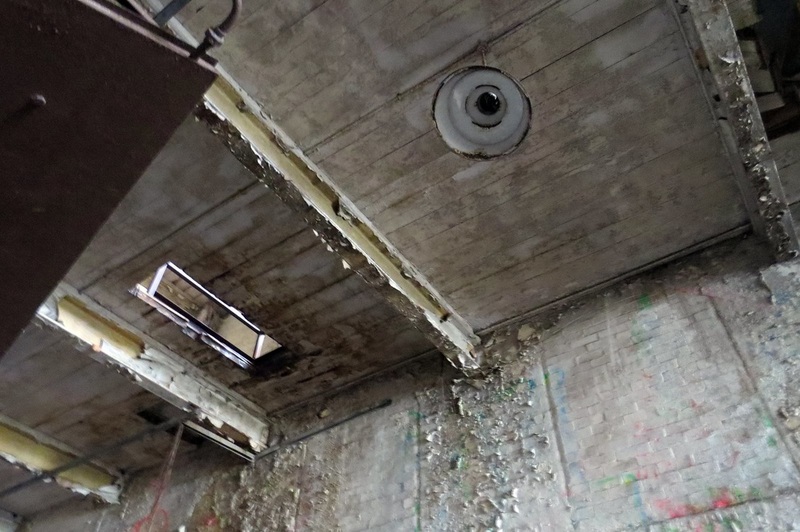 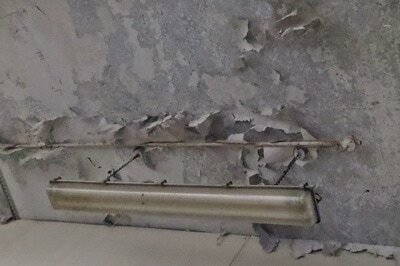 Work has commenced this year with the asbestos, machinery and much of the flooring being removed. 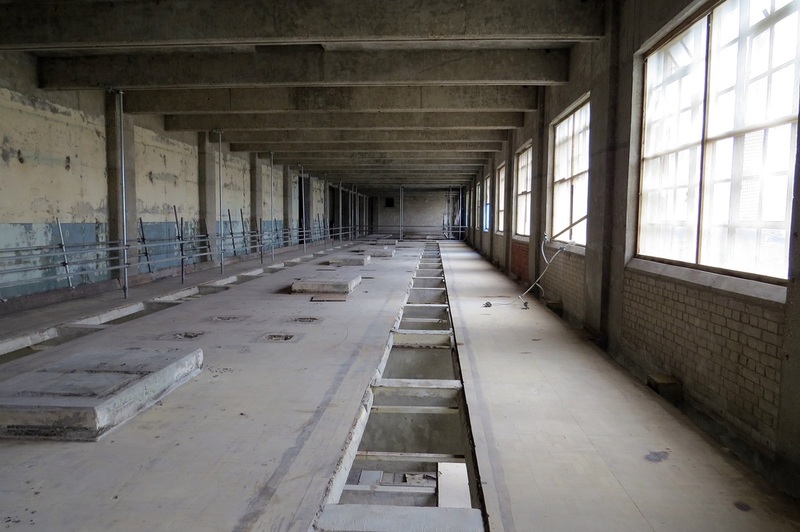 Below are pictures from September 2015. 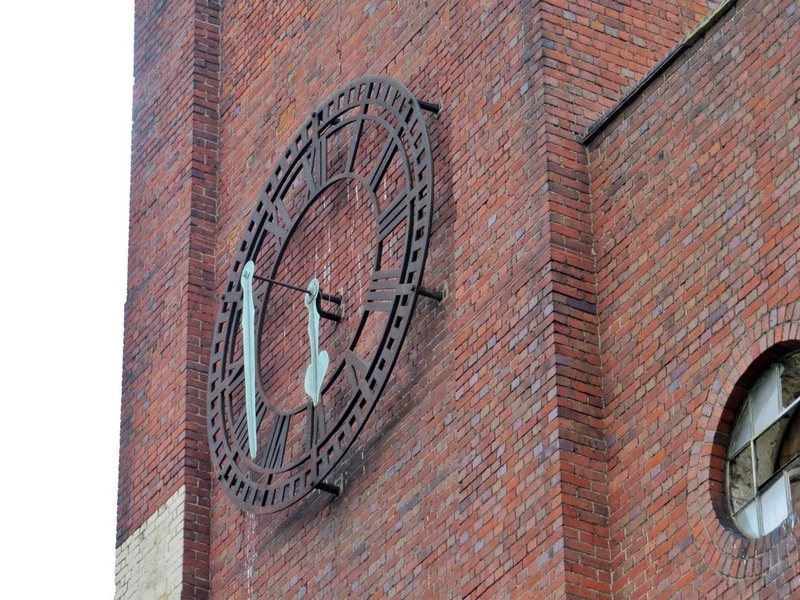 Some pics of the adjacent Rank Hovis Mill are to be found further down this page. 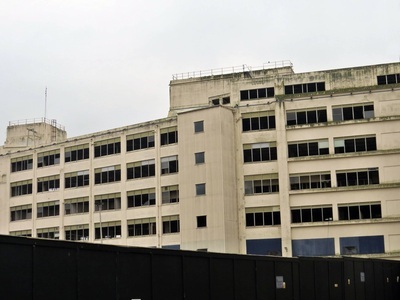 The immediately adjacent building to the Millennium Mills is the former Rank Hovis Premier Mill. This building was built for Burgoyne Burbidges and Co. who have a history of more than 260 years.Now based in Mumbai the company specialise in chemicals,solvents, dyes, amino acids etc. It originally began producing glassware and chemicals & drugs for Pharmacists in Moorgate moving to this East Ham site in 1892. 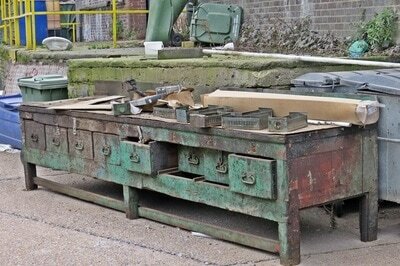 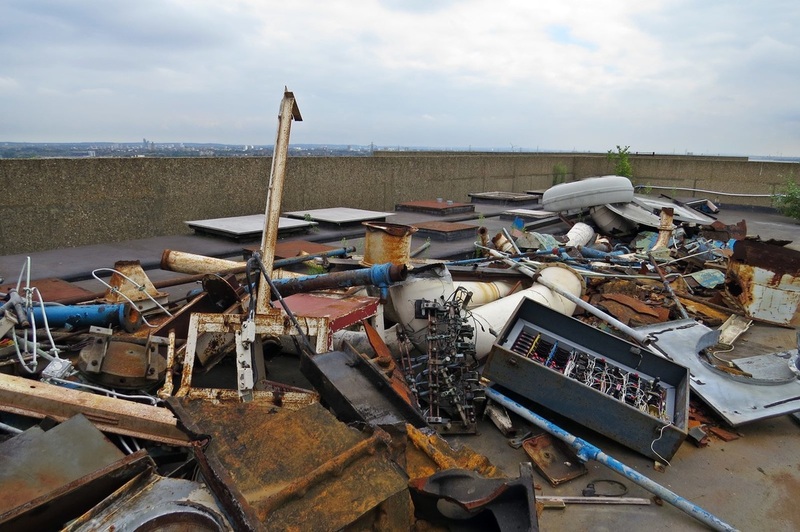 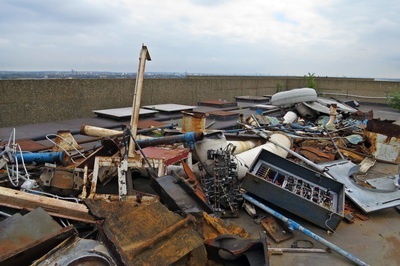 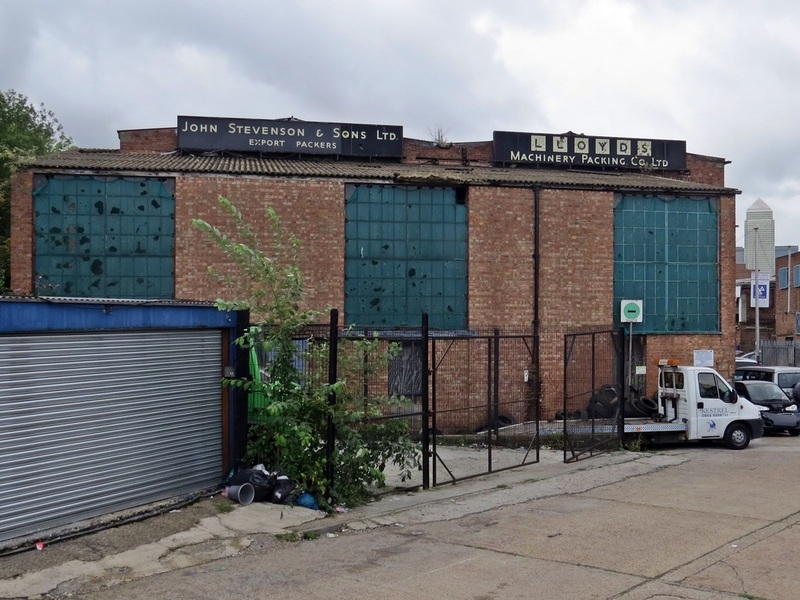 After Burgoyne Burbidges left the site was a Newham Council Depot in the late 70s & early 80s. 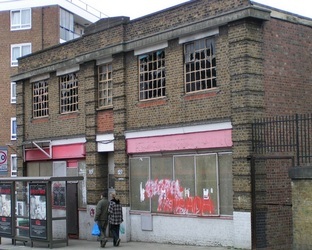 It had both stores and offices used for training. 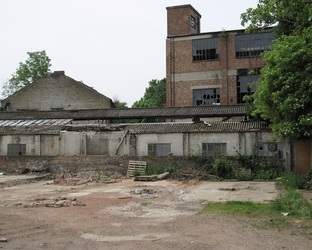 Much of this large factory site was demolished to make way for flats. 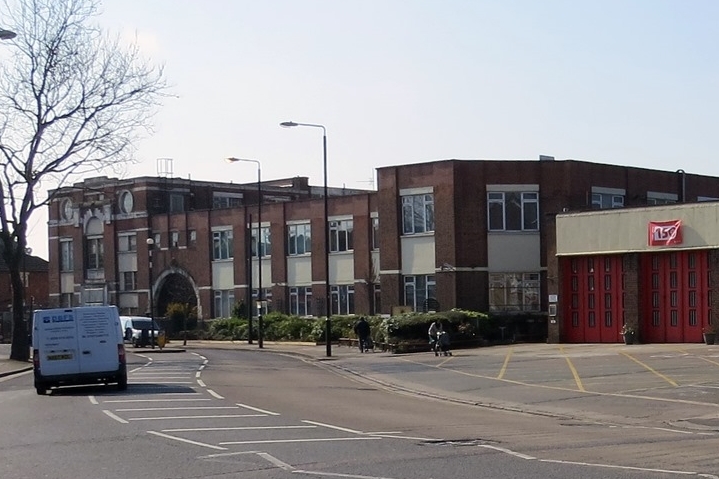 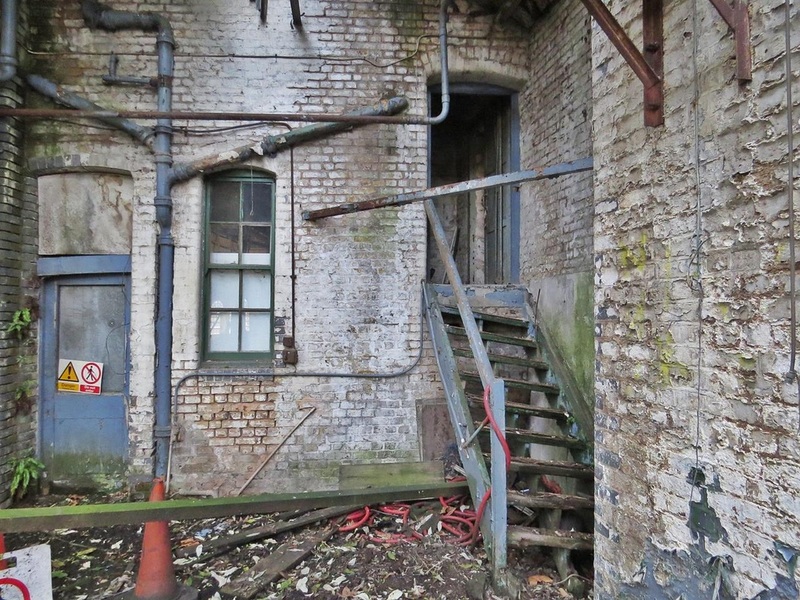 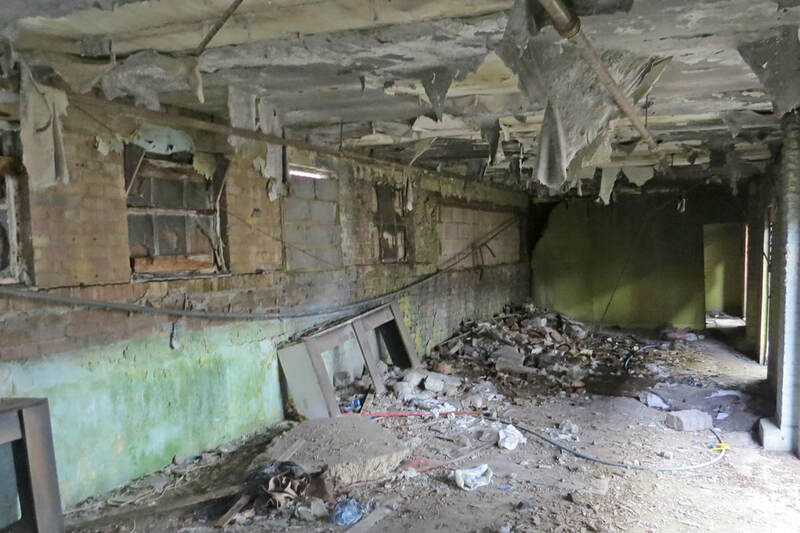 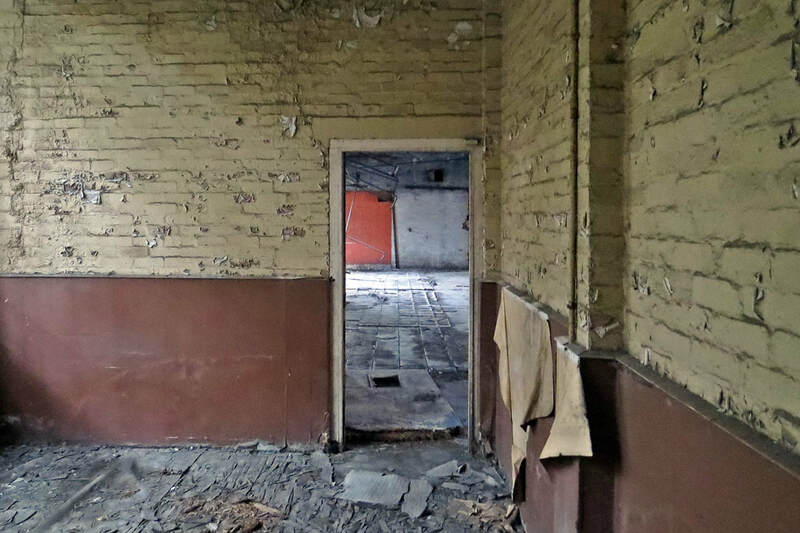 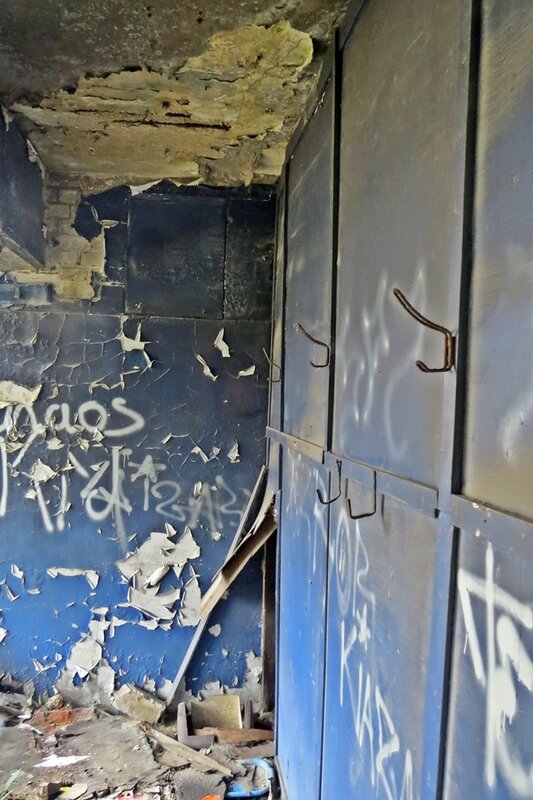 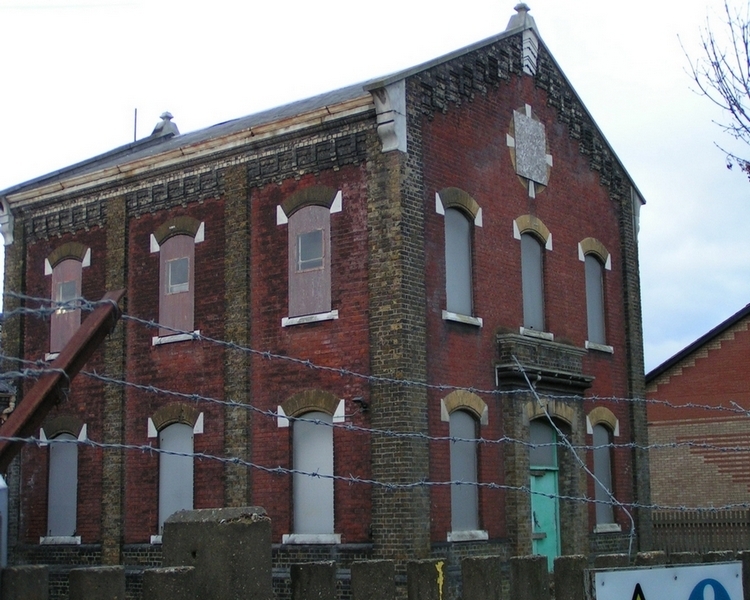 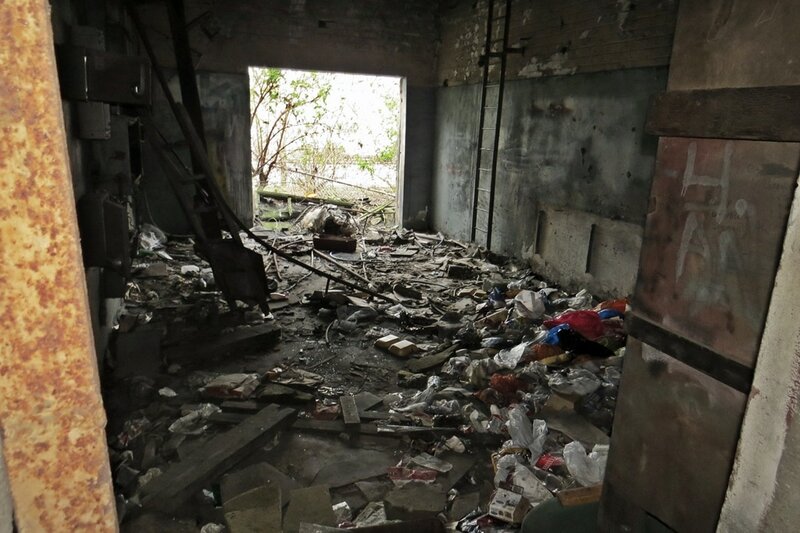 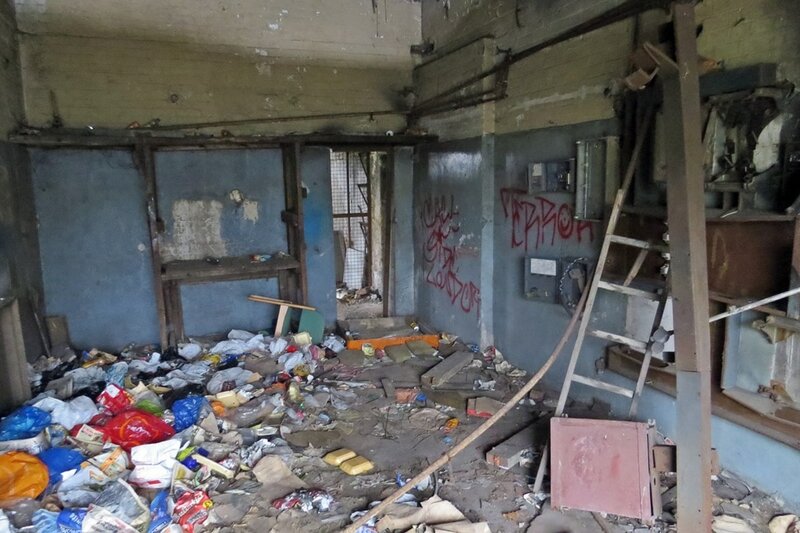 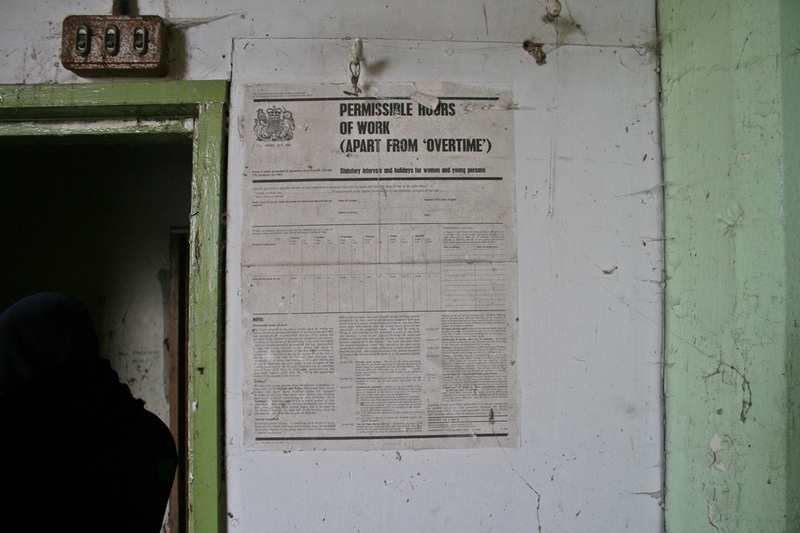 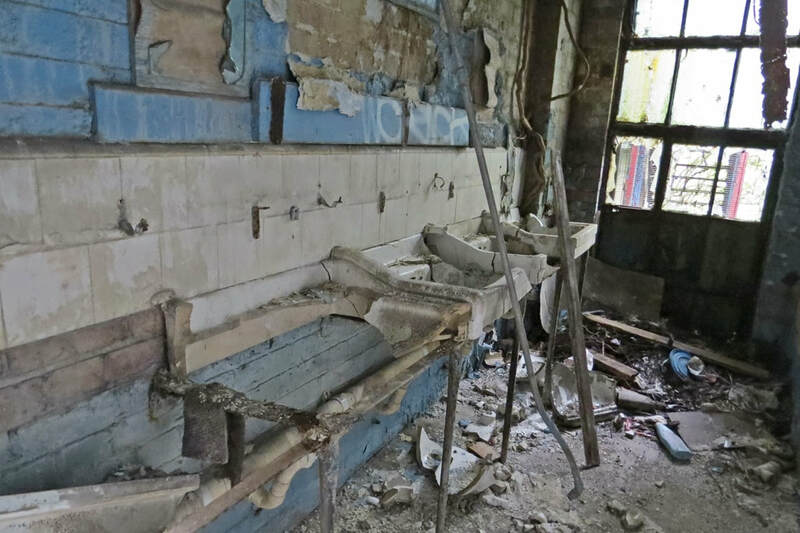 Part of the main front building was taken over as a fire station and some has been left derelict as you can see in these photographs taken in 2016.It has been padlocked and chained for years I took photographs here in 2003 and nothing has changed. 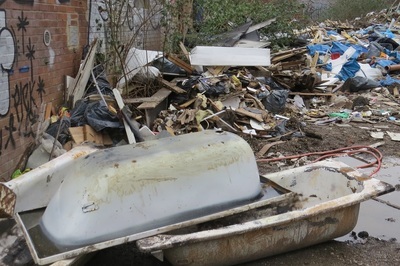 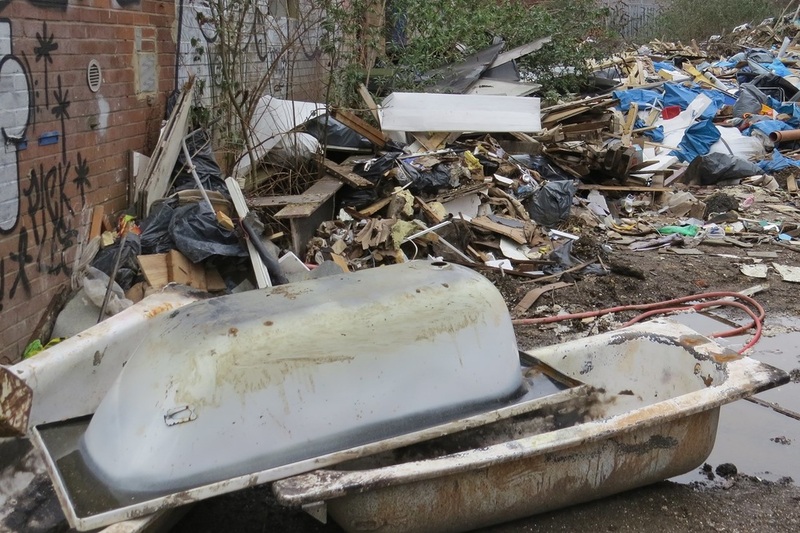 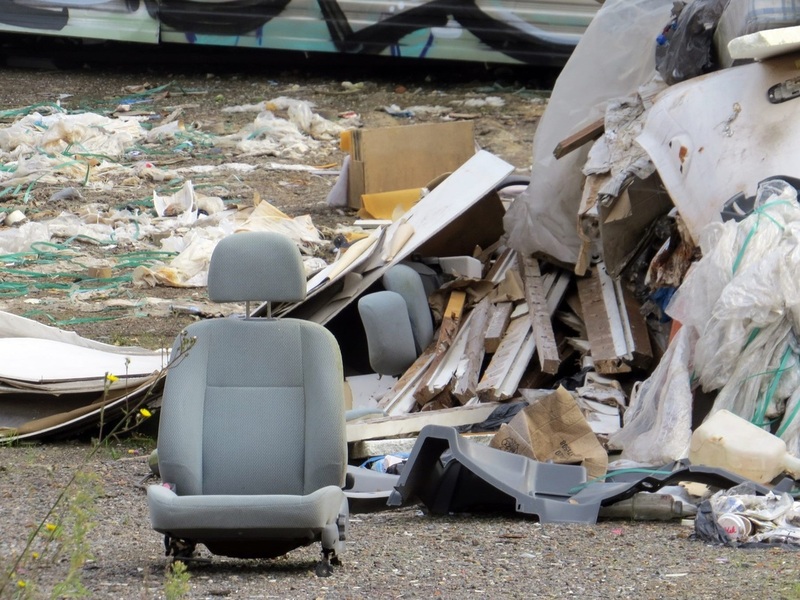 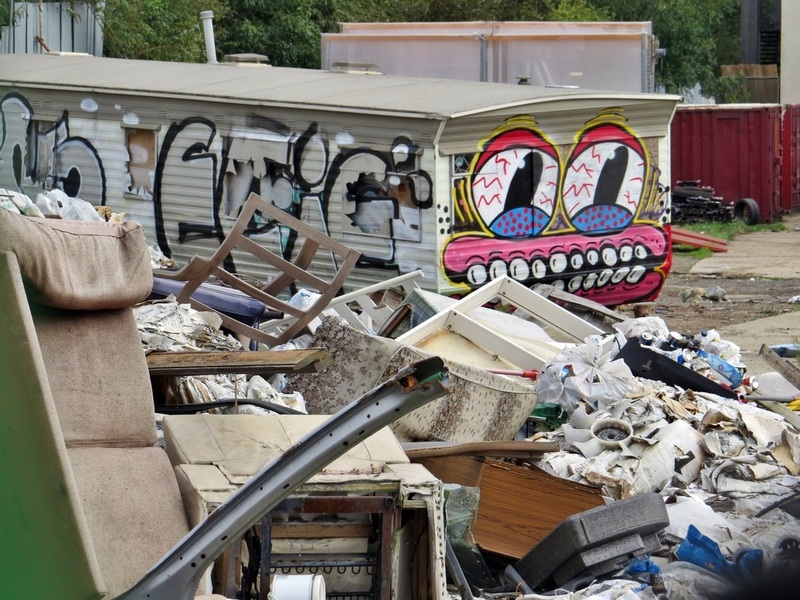 Travellers settled on the site in approximately 2001 but were evicted. 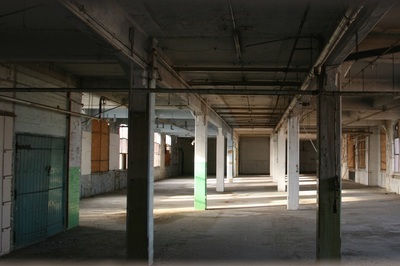 The site is on the books of a film location agency who occasionally hire it out. 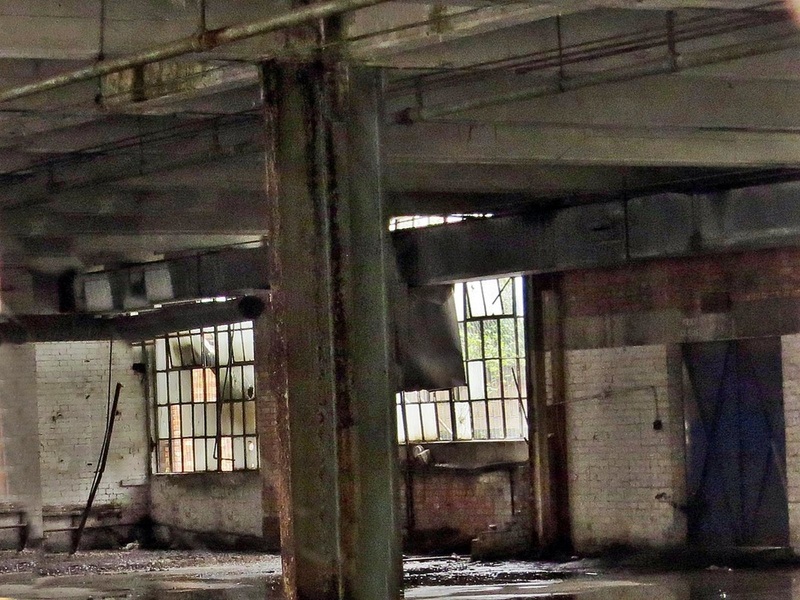 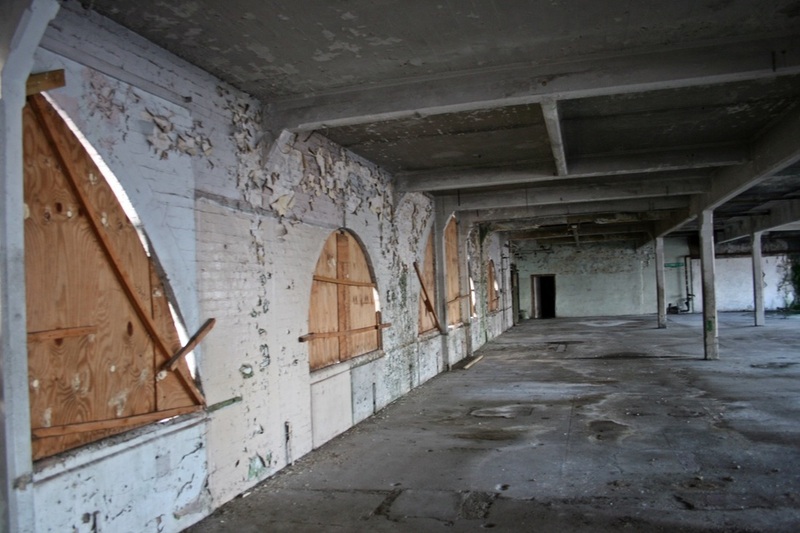 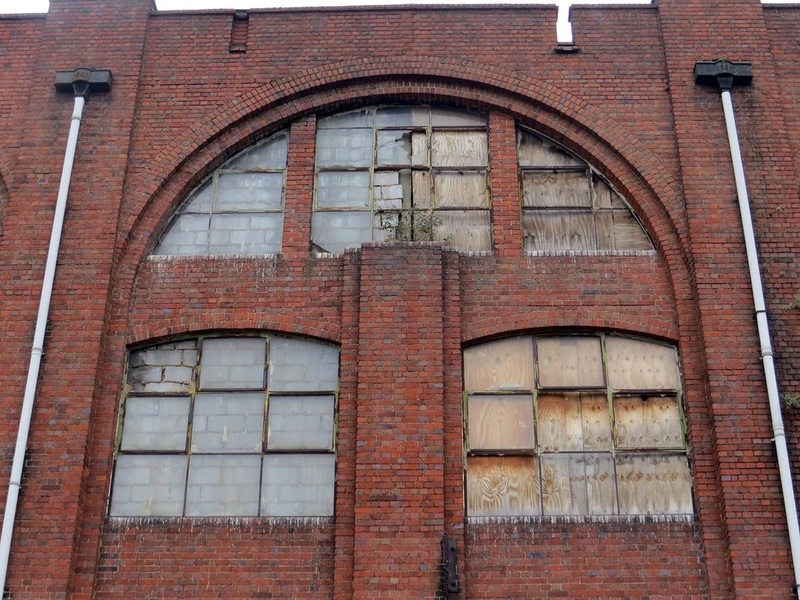 ​​Originally a dog biscuit factory, the Phoenix works was until recently used for a wholesale food trade business. 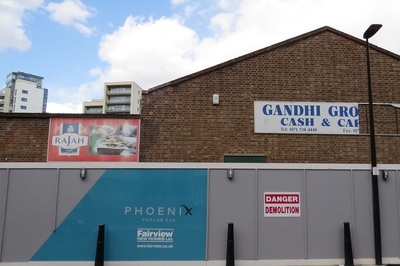 I walked by 5 Star (Edible) Products Ltd and Gandhi Cash and Carry frequently over the last few years and wondered how much longer it would be before this prime canalside site (next to the Limehouse Cut) gets bought up by developers. The site had a shisha bar operating under a tent from 4pm to 4am every day, seven days a week though this was closed down by the police due to pressure from local residents. 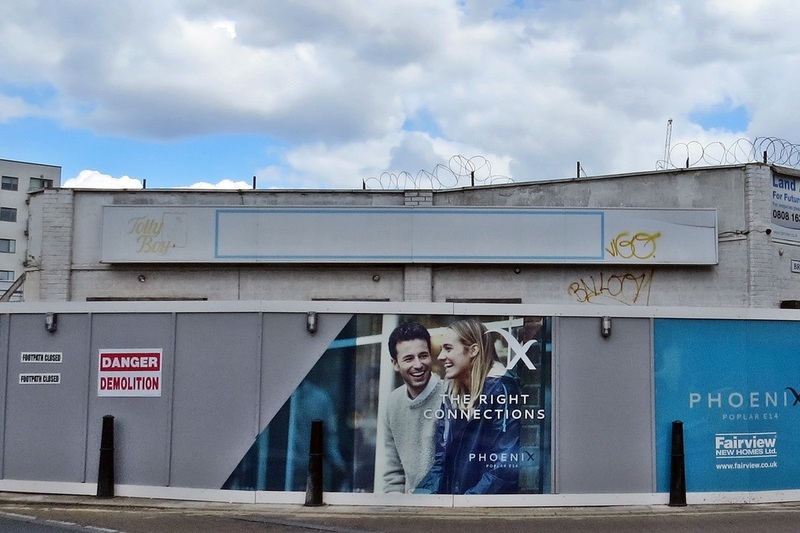 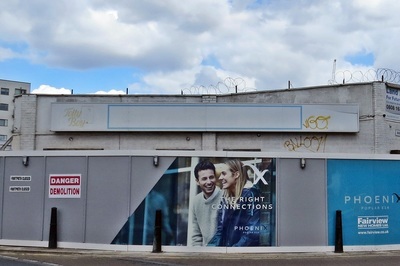 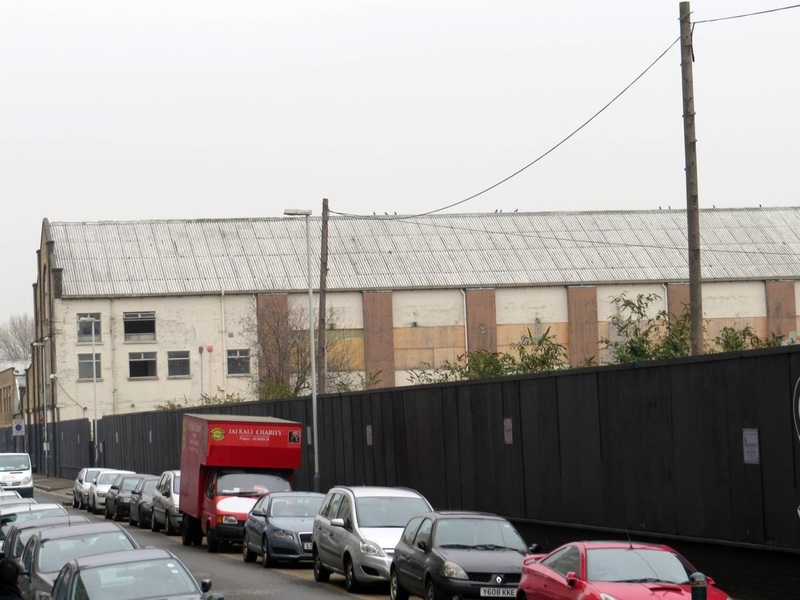 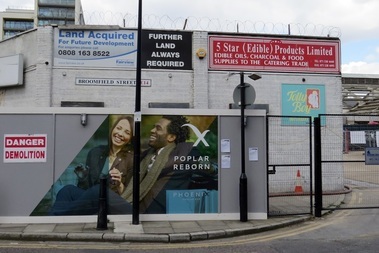 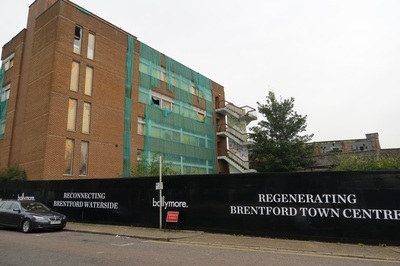 Now Fairview Homes have taken over the site and demolition is well underway with hoardings proclaiming "Poplar Reborn"
This used car showroom occupied a prominent position on the A40 Western Avenue. 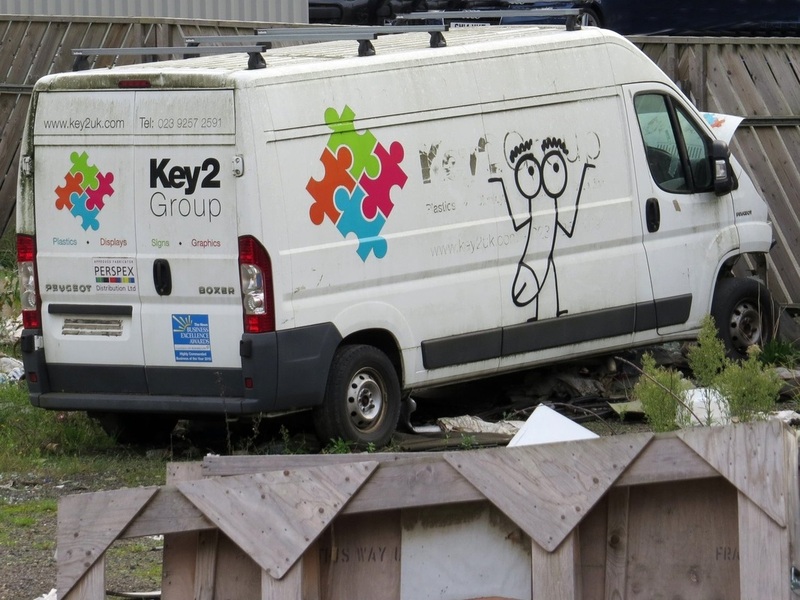 In 2008 the Financial Services Authority cancelled the permission granted to P & S to carry on regulated activities and the company lost a legal wrangle lasting 7 years as the non-franchised car retailer used the Mercedes-Benz logo without its permission. 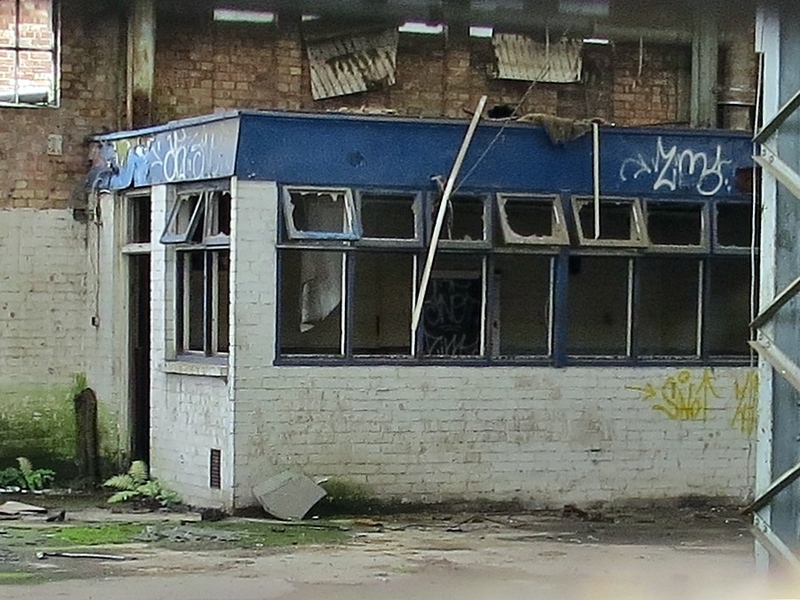 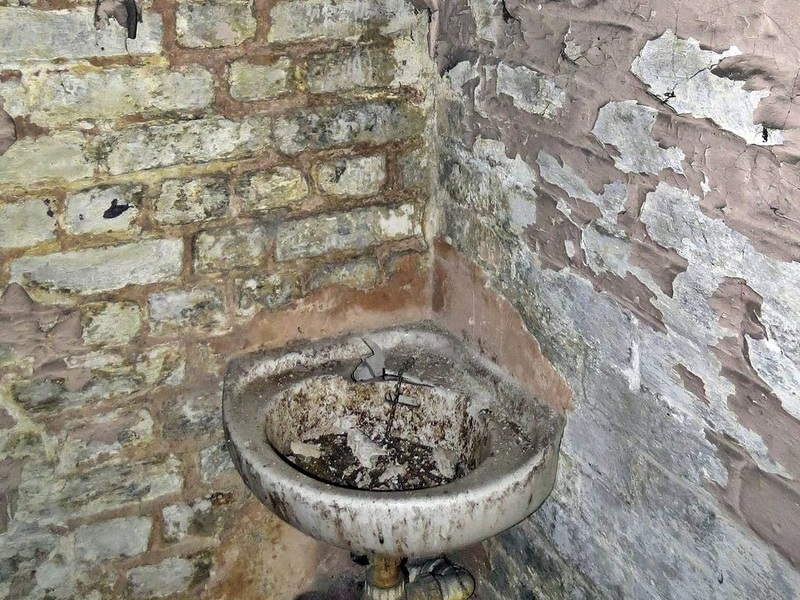 There appear to be no current planning applications for this site. 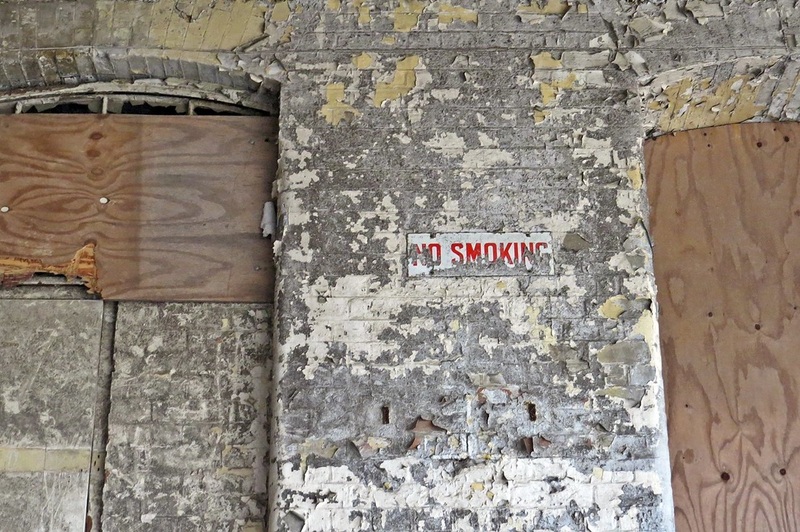 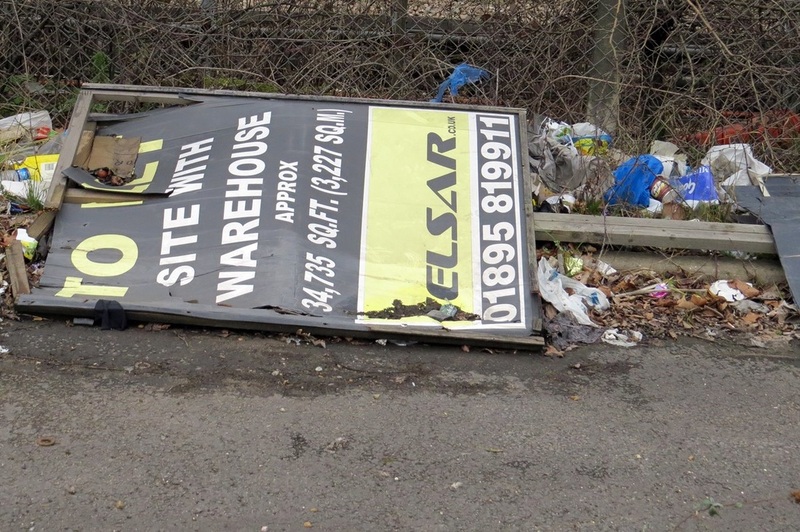 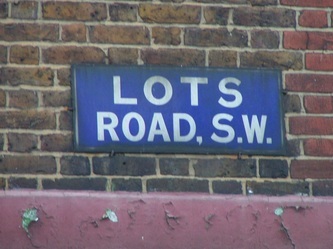 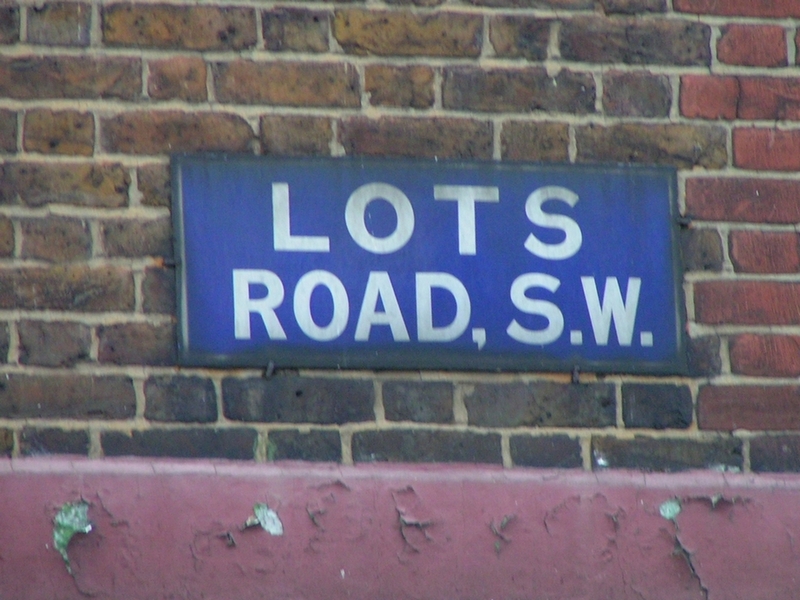 The "To Let" sign remains discarded within the site. 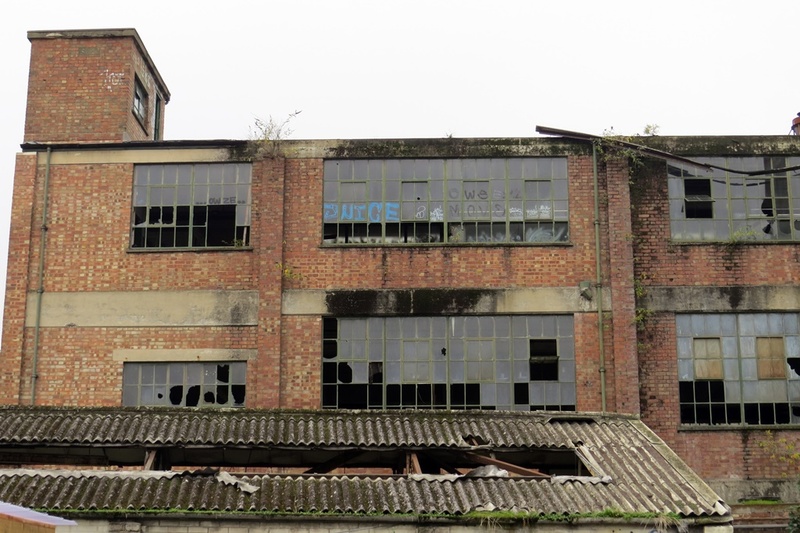 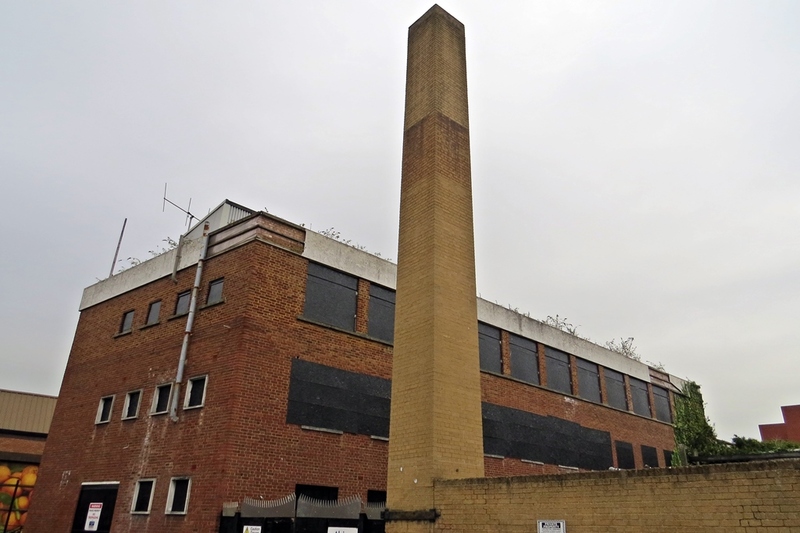 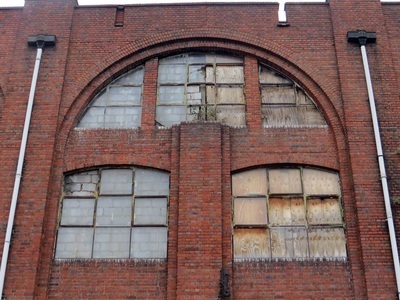 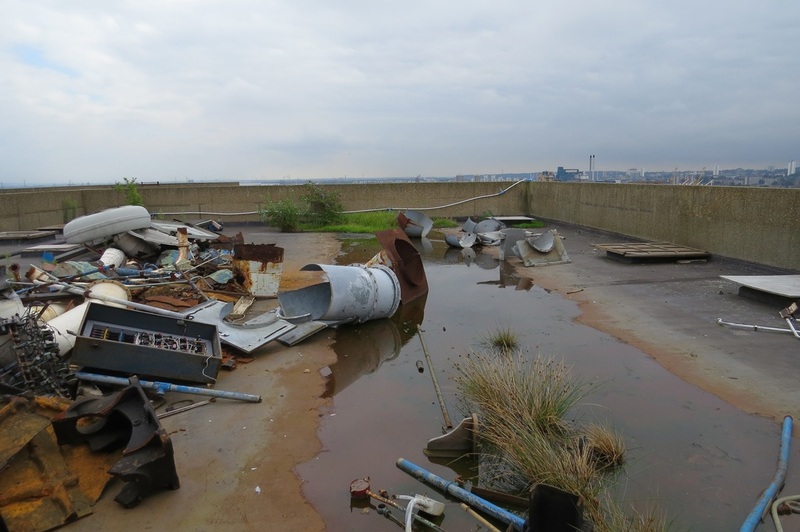 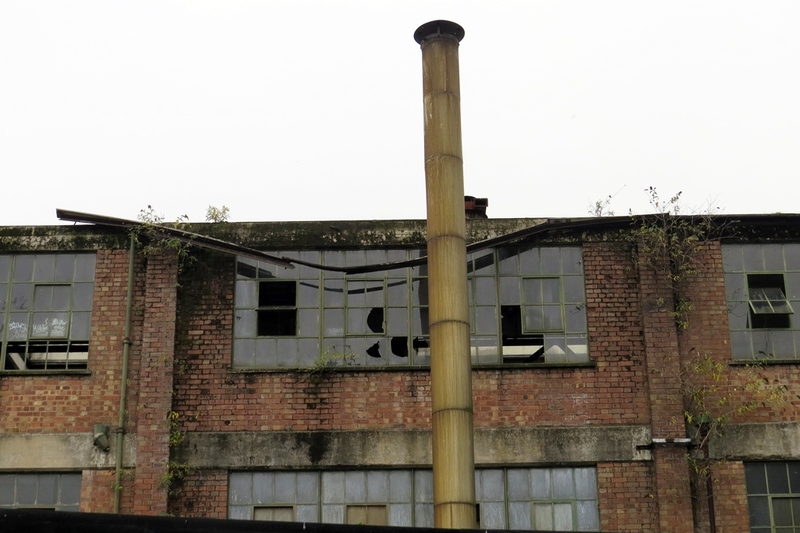 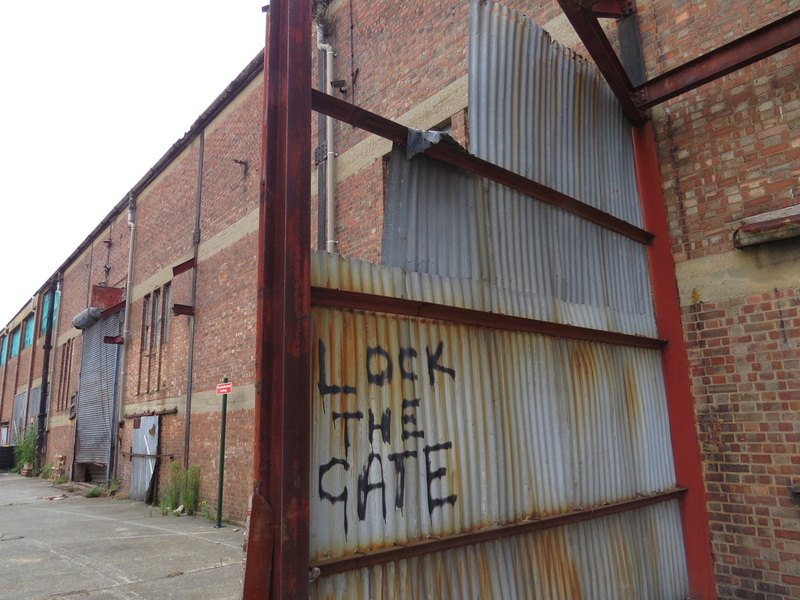 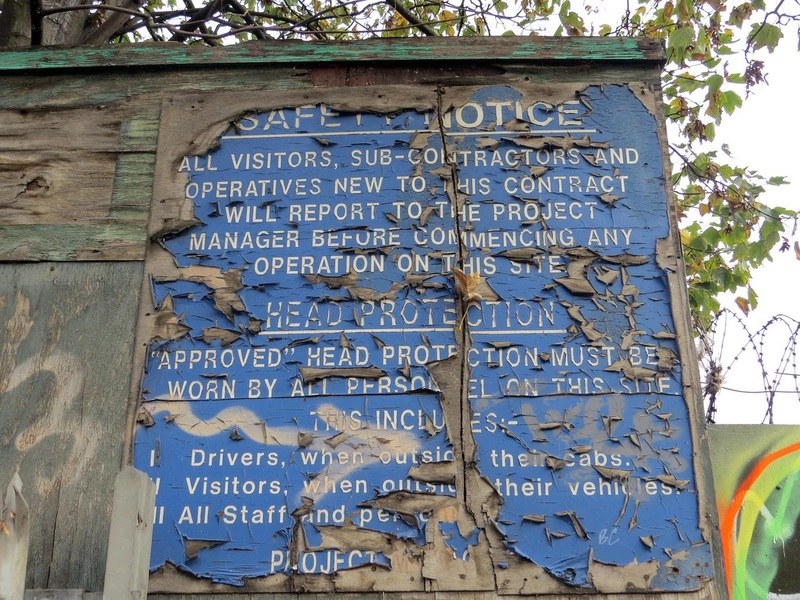 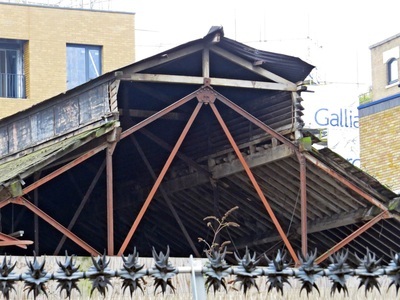 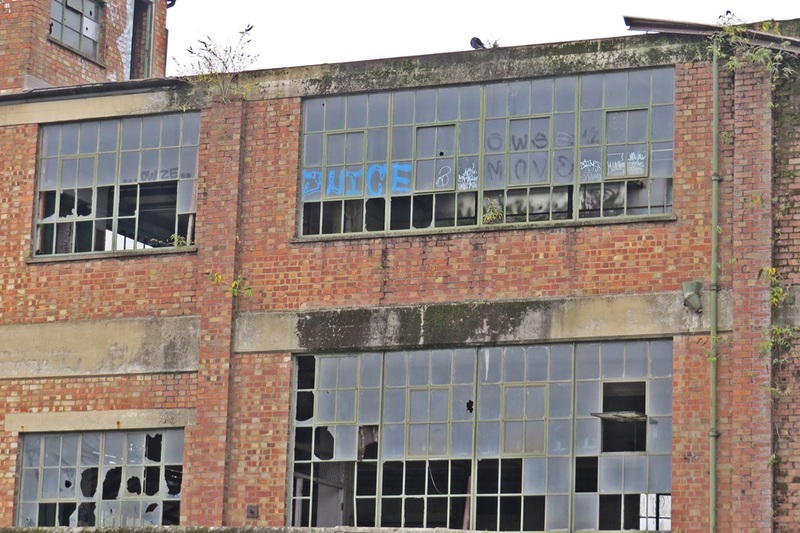 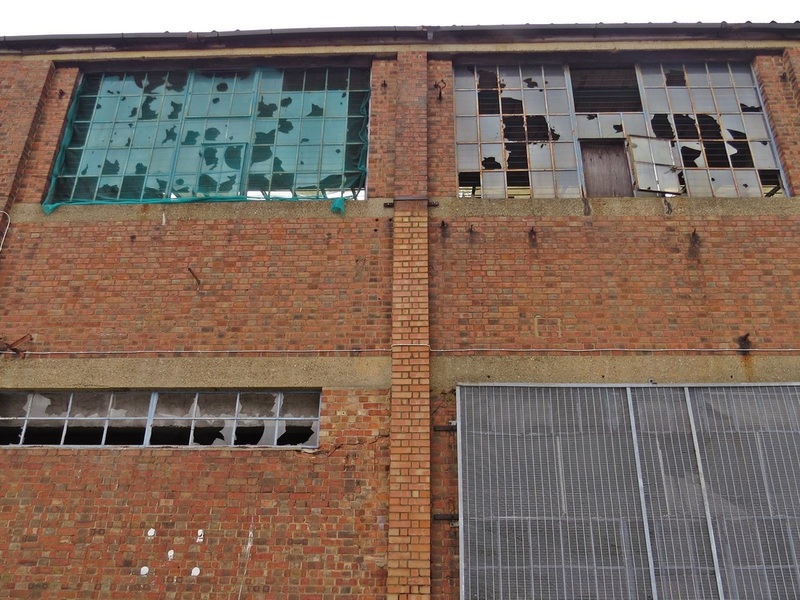 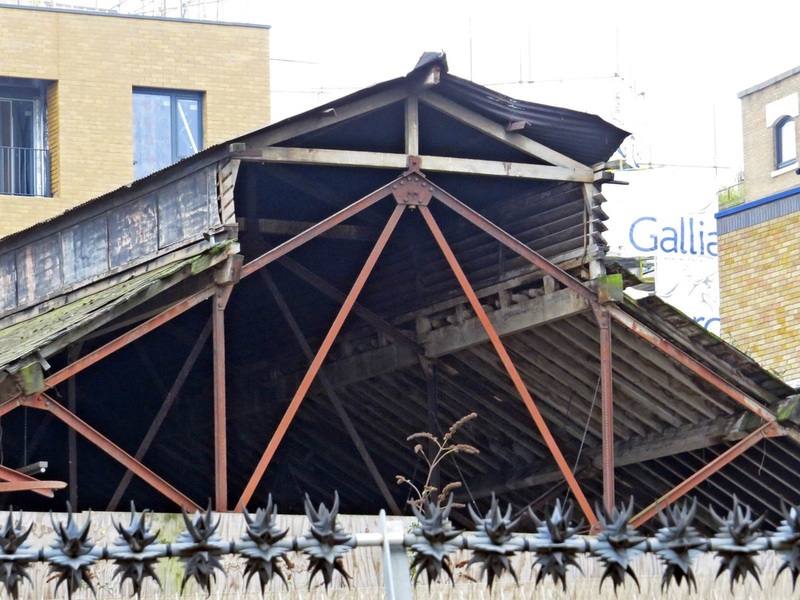 I was up near the Olympic Stadium and just off the Greenway I was surprised to find a couple of very old industrial buildings that have been derelict since way before the Olympic bid was even proposed along. 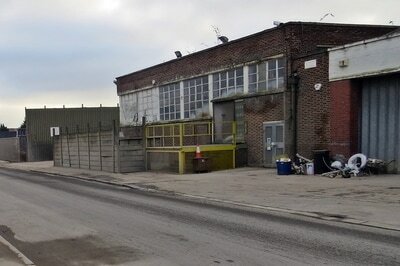 Just round the corner is a more recently vacated 1970s block last occupied by Dudley Stationers. 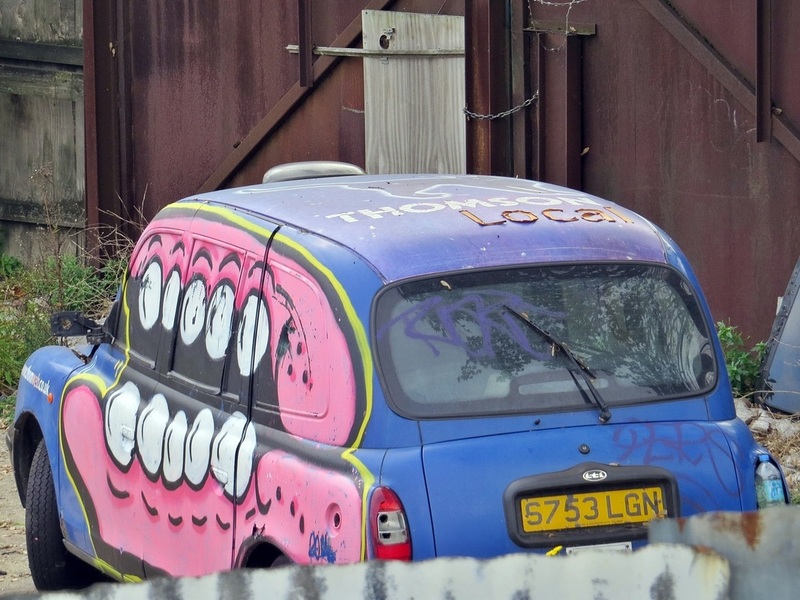 A safety notice in the advanced state of decay fronts a fenced off disused piece of land with the odd abandoned vehicle - a taxi cab, white van and a mobile home, all adorned with graffiti (or should that be streetart?) 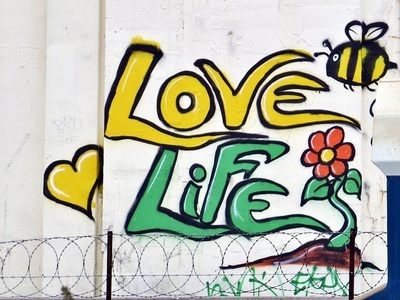 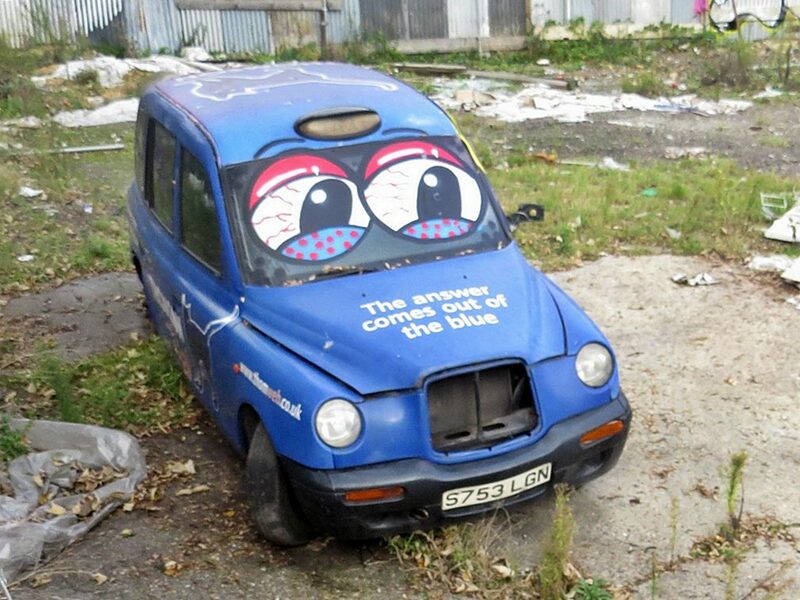 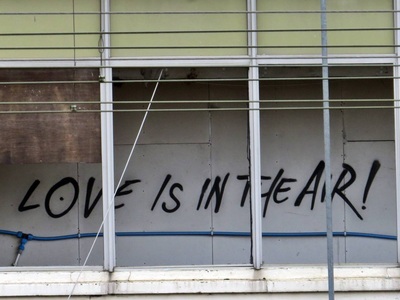 What certainly is old school graffiti is the Will You Marry Me? 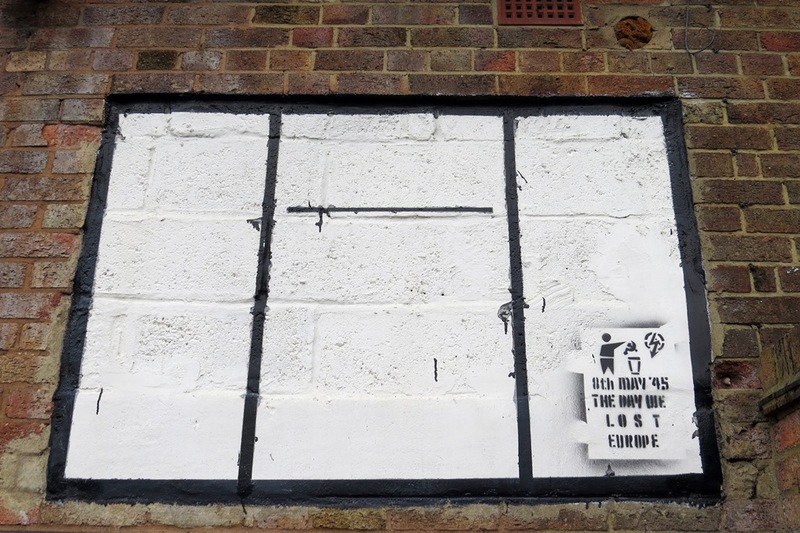 (I need a European Passport) daubed along the longth of a fence fronting onto Wick Lane. 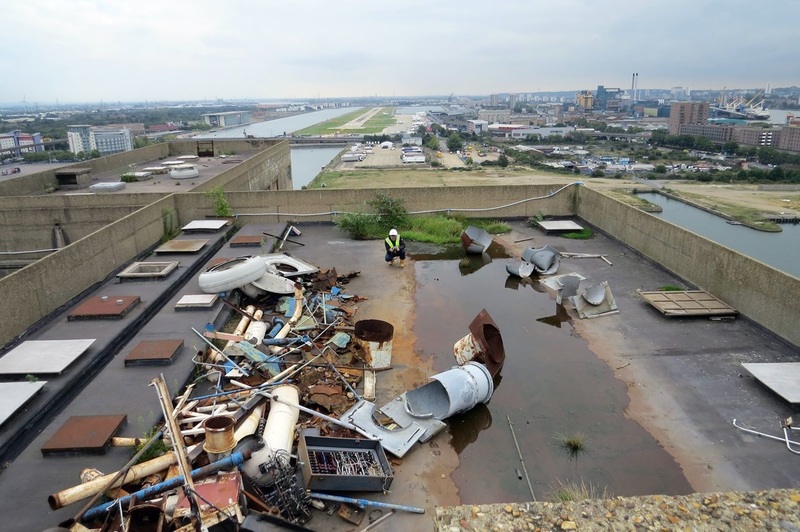 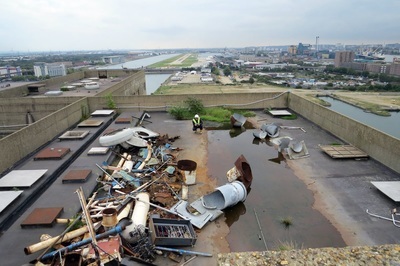 I walked the pre Olympic site frequently in the early 2000s and fondly remember the Carpenters Road fridge mountain, the Pudding Mill River albeit clogged with tyres and the scores of abandoned cars & engine parts along Marshgate Lane. 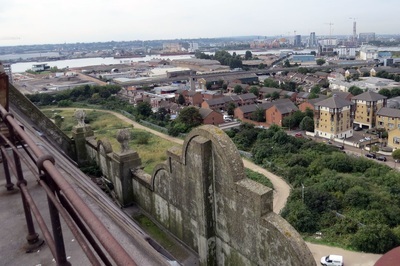 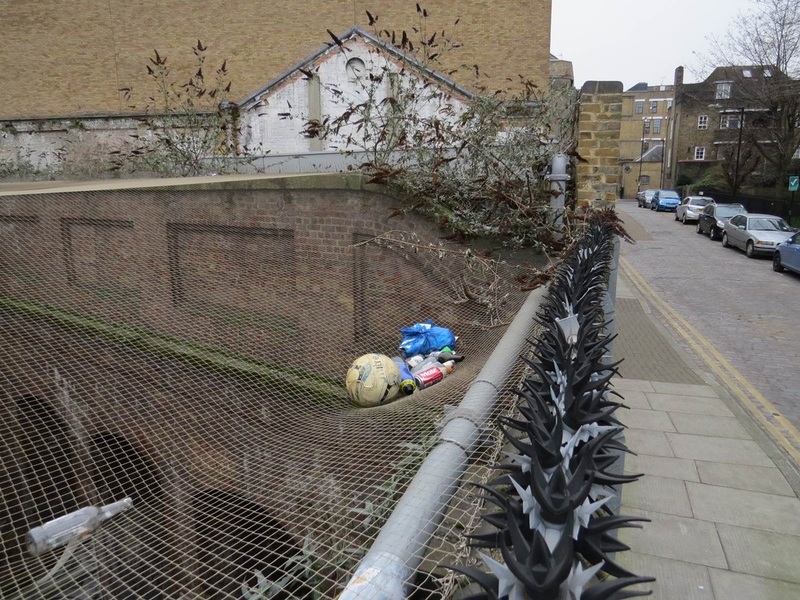 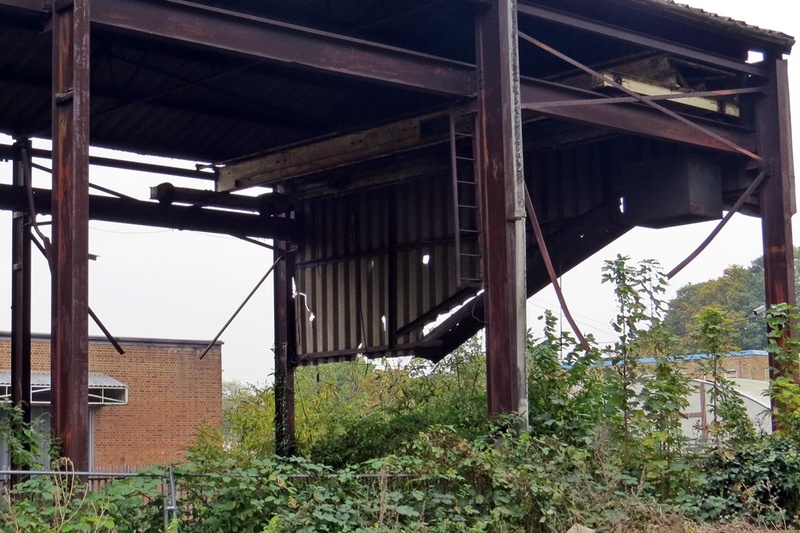 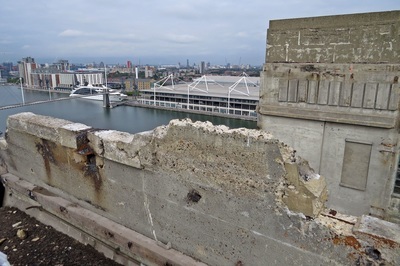 All that decay was cleared away and the Pudding Mill River culverted to make way for the stadium but as you can see from these pictures taken late in 2014 there are still pockets of dereliction and reminders of the area's pre Olympic landscape. 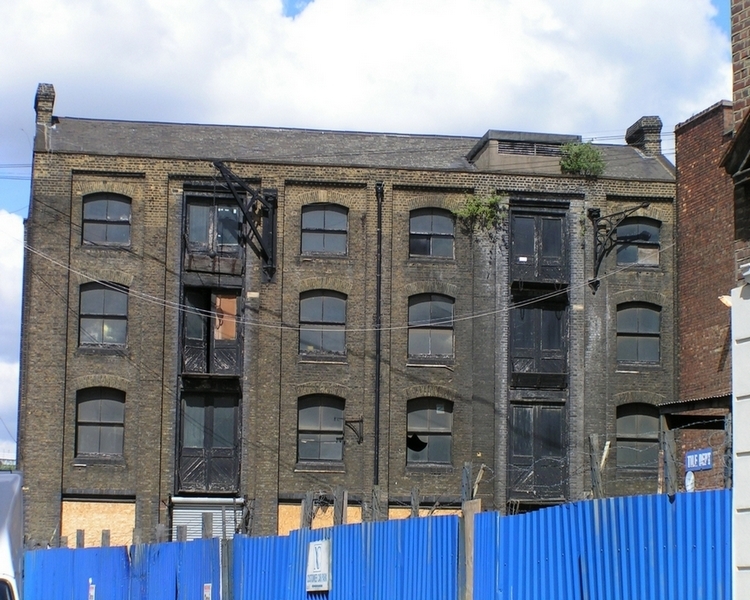 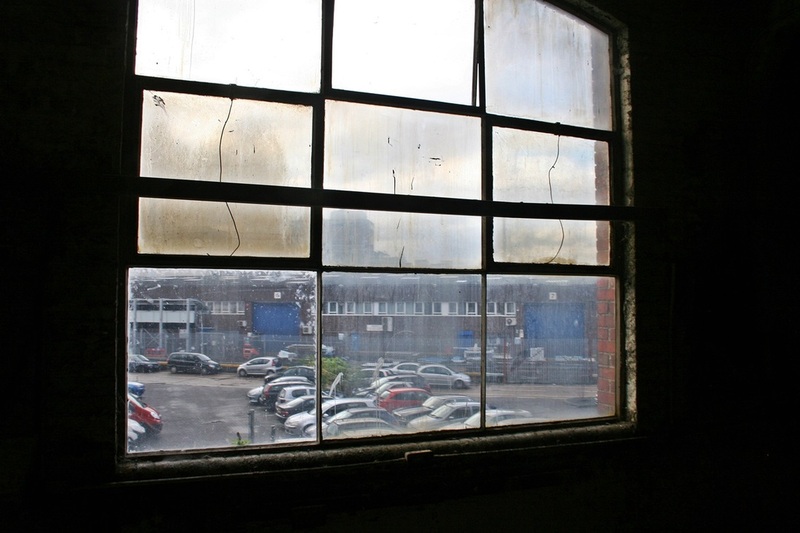 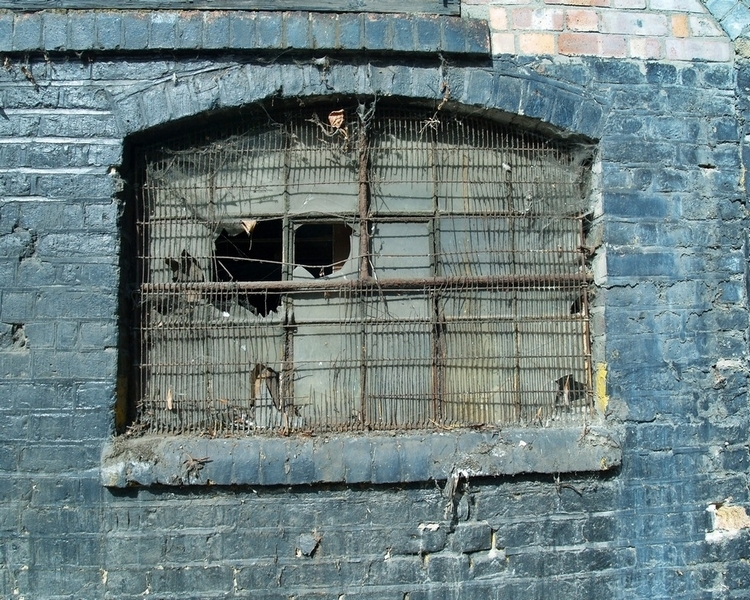 Back in 2003 when I first started this website I loved wandering around the semi derelict industrial areas off Stratford High Street. 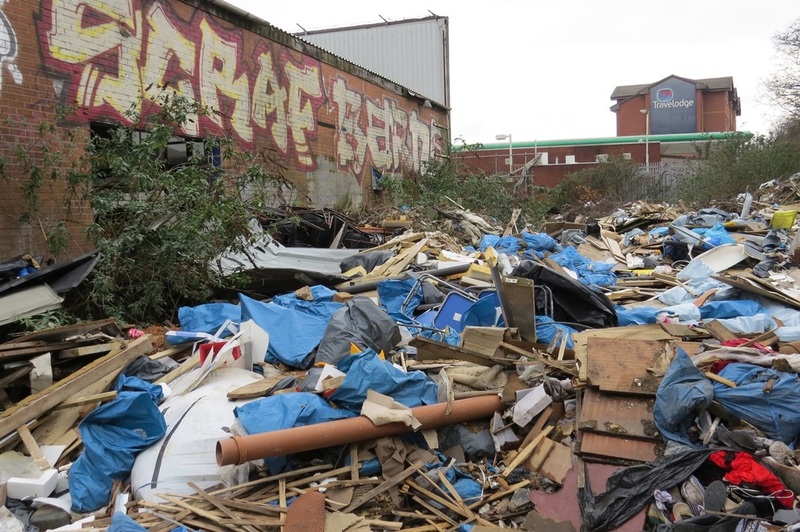 I imagined all of this to be swept away by the regeneration but as you can see below there are a few areas around Marshgate Lane and Cooks Road in Stratford. 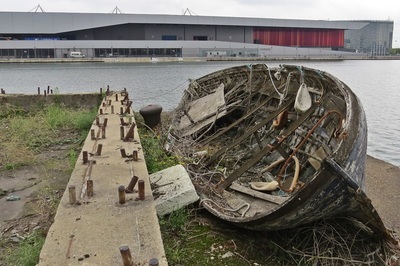 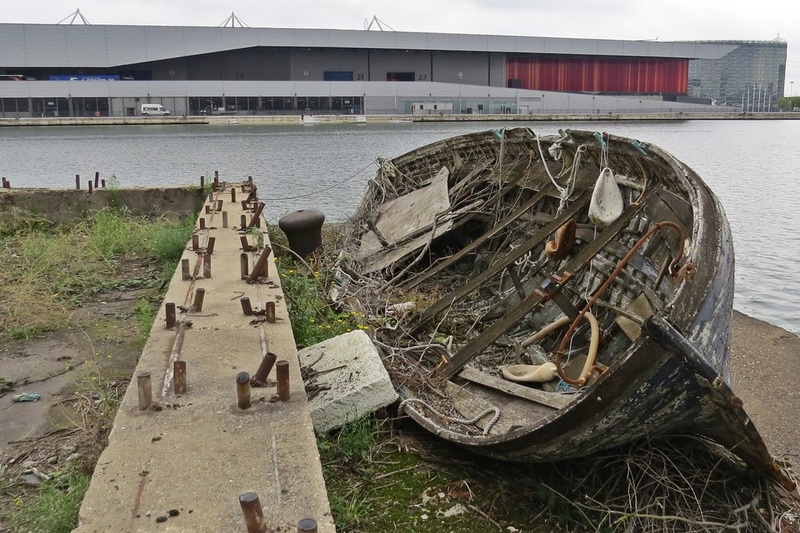 More information about the decline of all the docks in London together with tracing modern day clues as to their existence can be found in my London's Lost Rivers book. 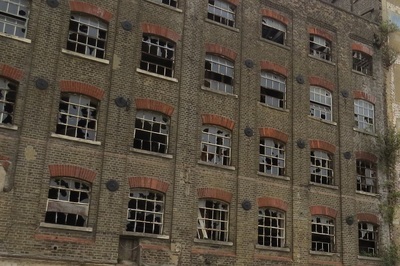 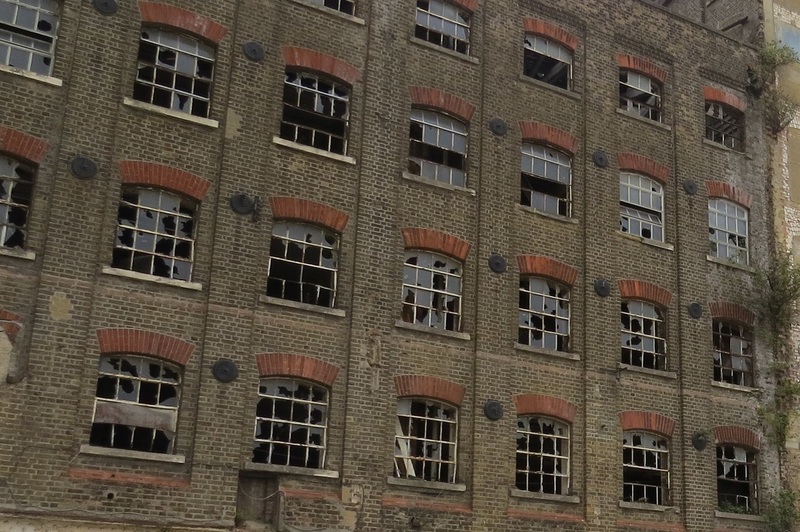 I also give a 3 hour walking tours of the Wapping area. 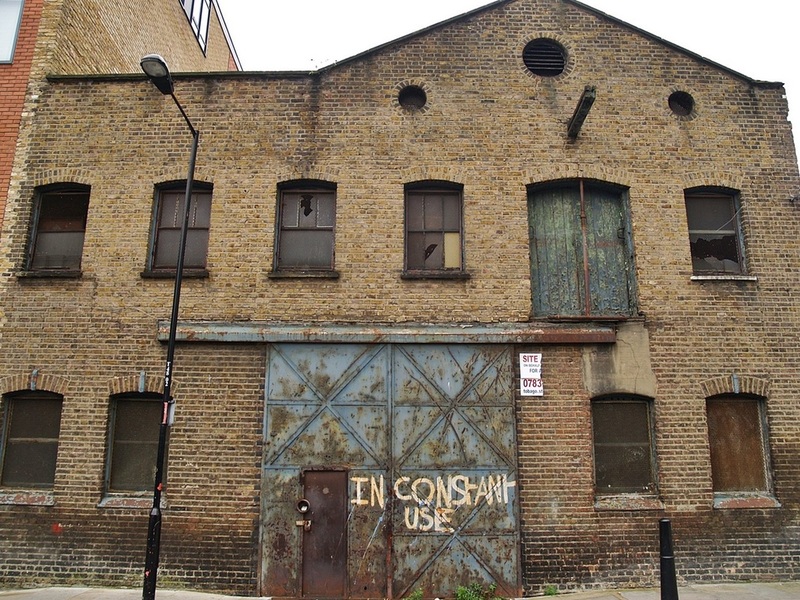 This former warehouse fronting Wapping High Street (opposite Wapping Station) was trading as Jacob Alex & Co, Paper Stock Merchants, 'all classes of Waste Paper Cleared. 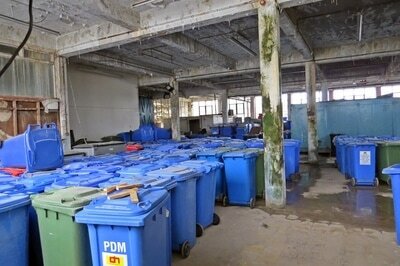 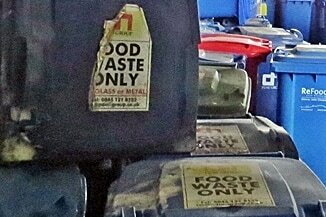 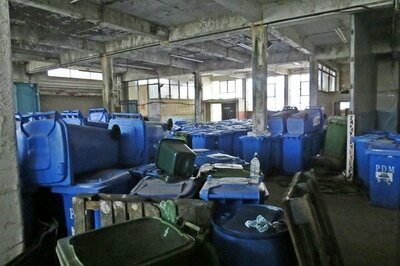 All Waste cleared guaranteed to be re-pulped.' 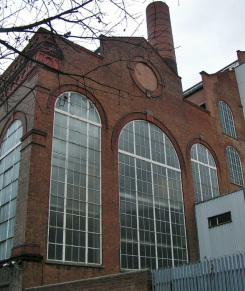 in 1910-1911. In 1946 they were Jacob Alex & Co,Rags & Waste Papers. 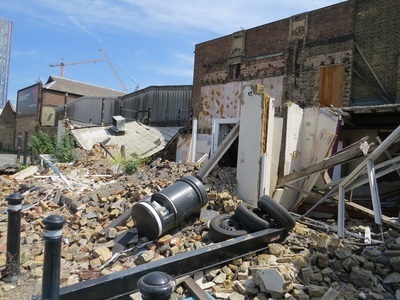 The rear of the building has been partially demolished. 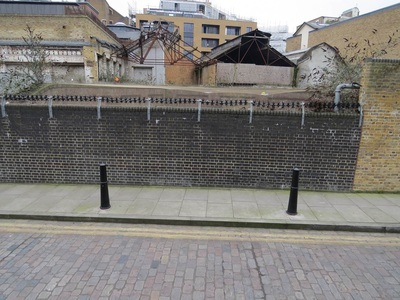 the is visiable from the street behind though securely protected by a wall and heavy duty spikes. 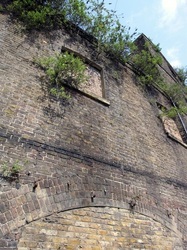 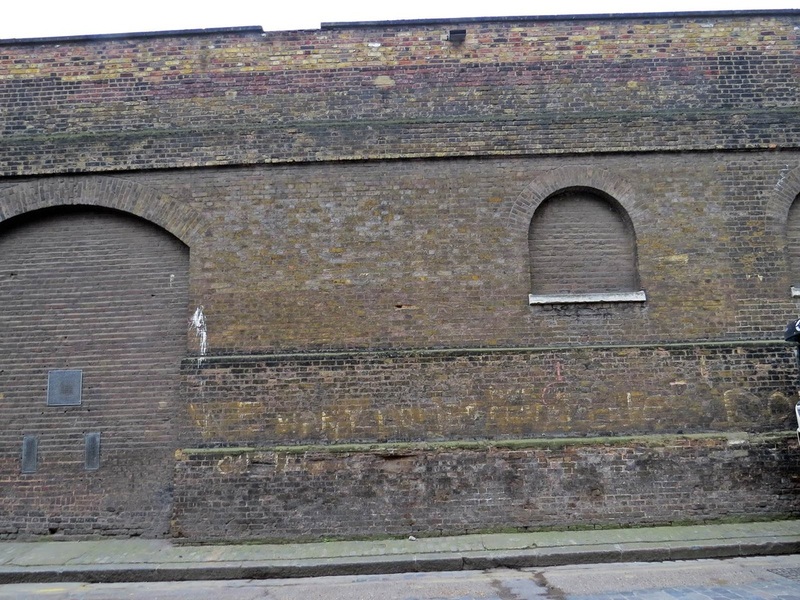 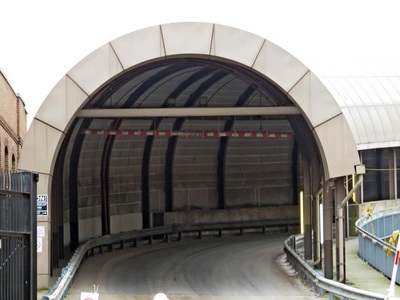 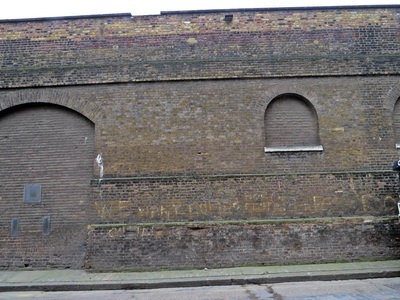 Immediately the other side of the wall after a massive drop is the vent shaft of the railway line of the Thames Tunnel now used by the Overground. So, in other words, don't bother climbing that wall! 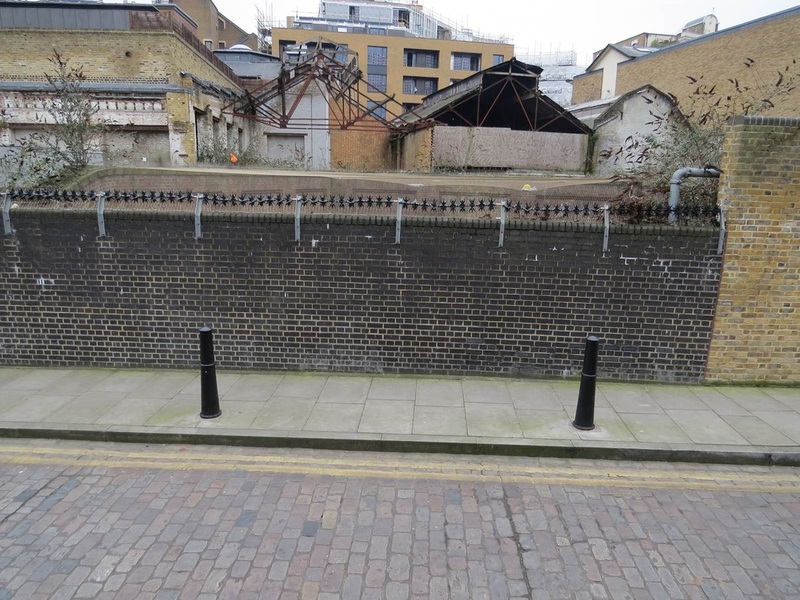 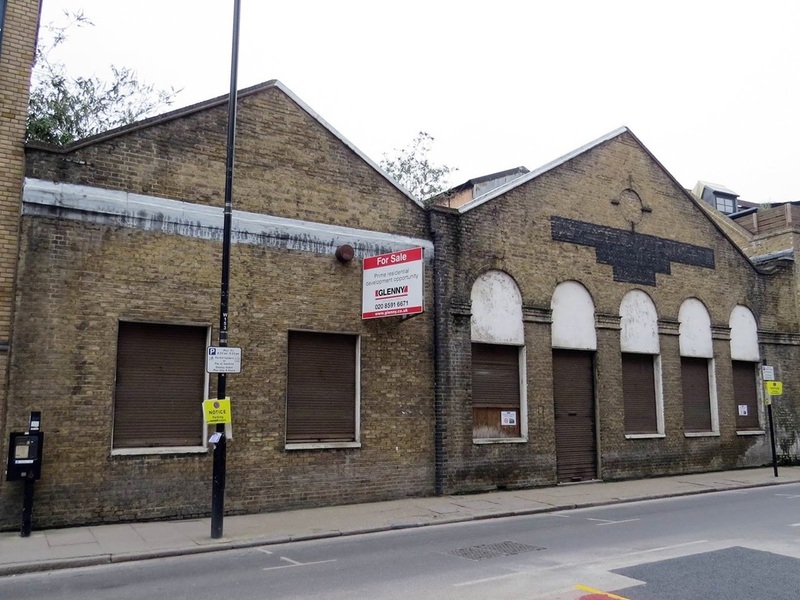 Application has been made to retain the facade fronting Wapping High Street & redeveloping the site into a retail unit and 27 residential units. The original buildings are believed to have been terraced housing according to a map dated 1875 but an 1894 map shows the plot as cleared and identified as ‘Recreation Ground’. 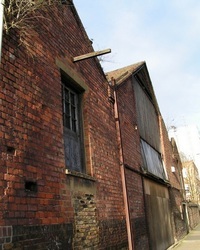 The plot remains undeveloped up until at least 1921. 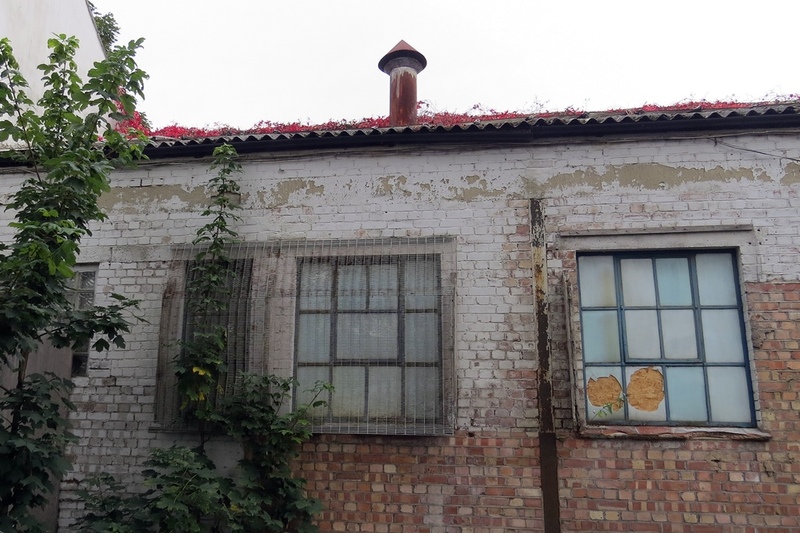 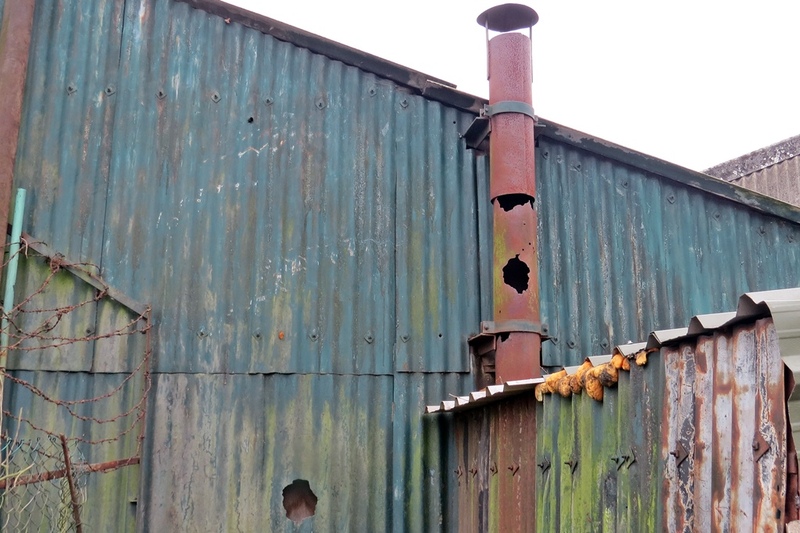 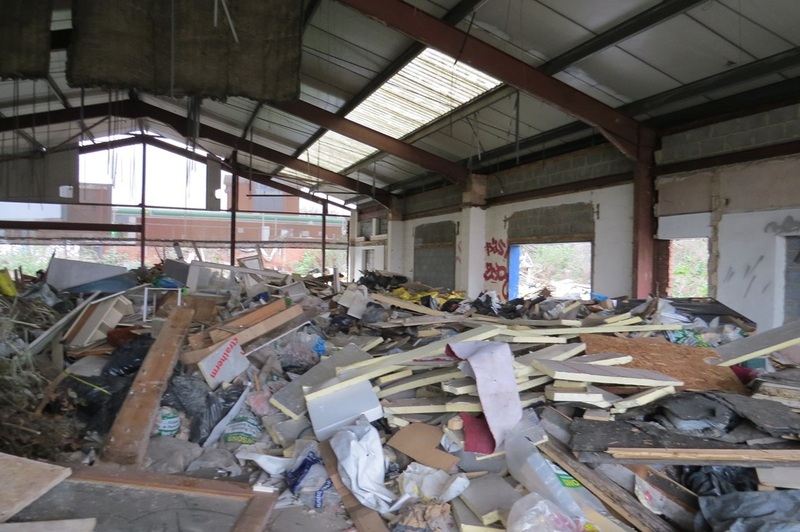 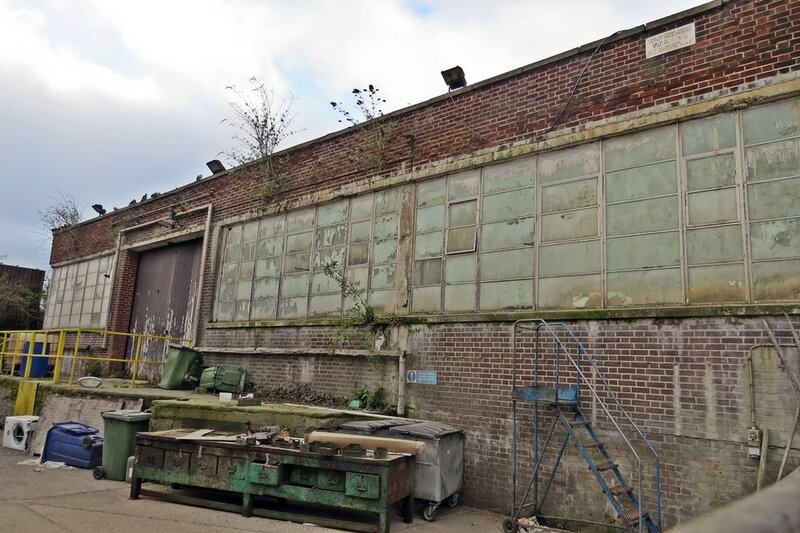 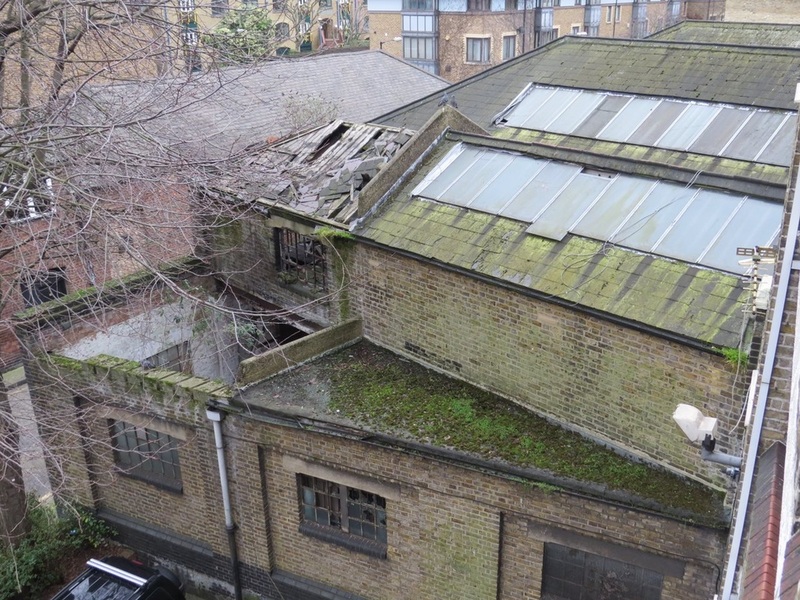 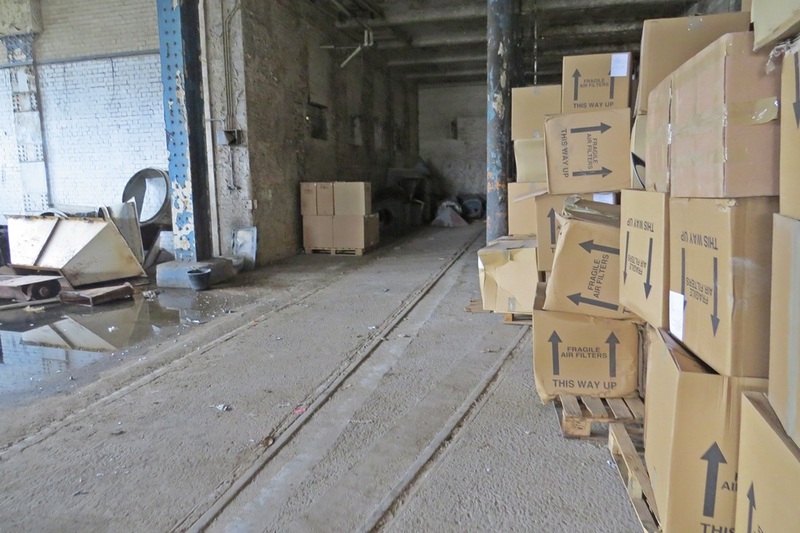 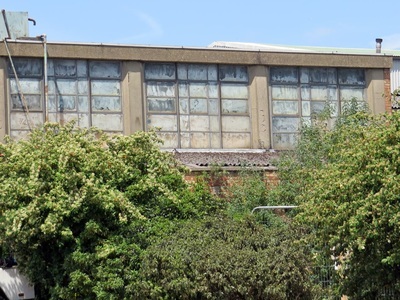 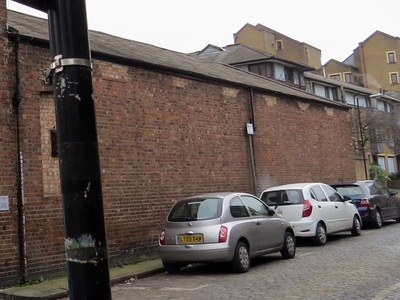 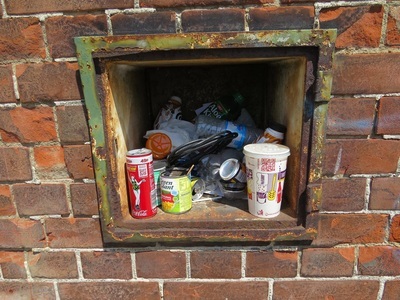 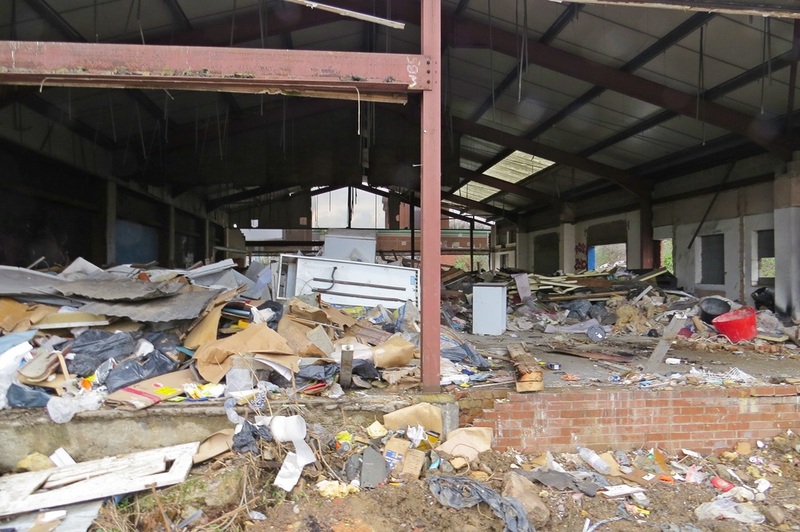 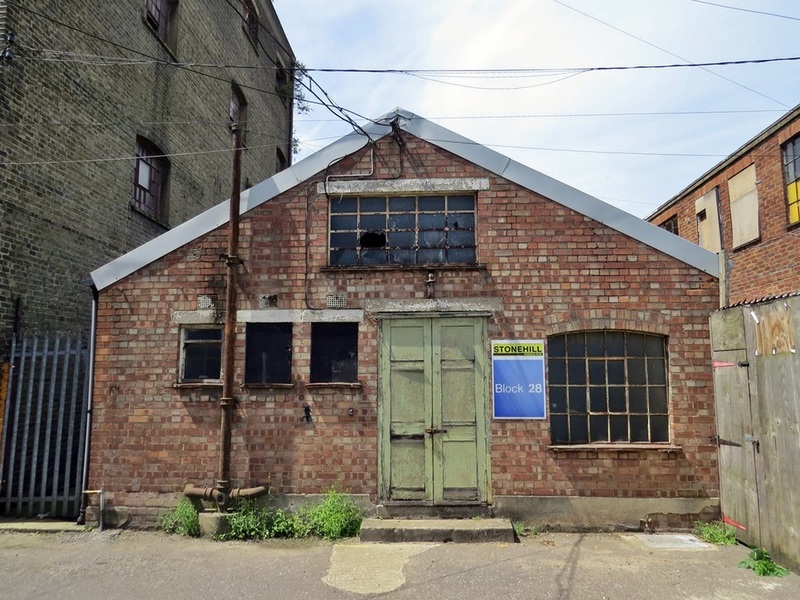 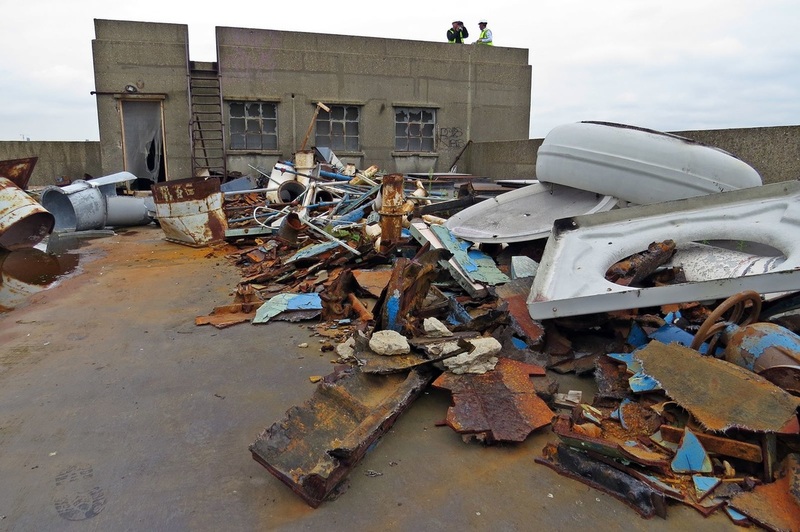 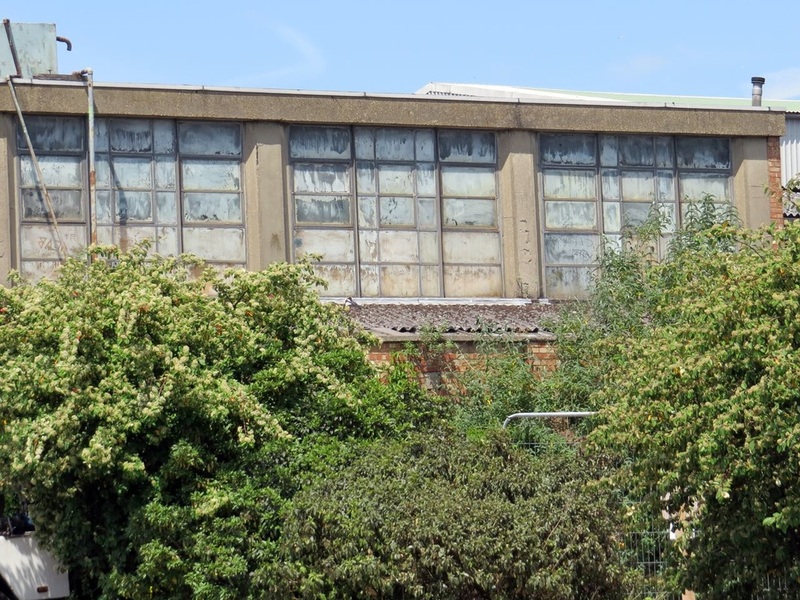 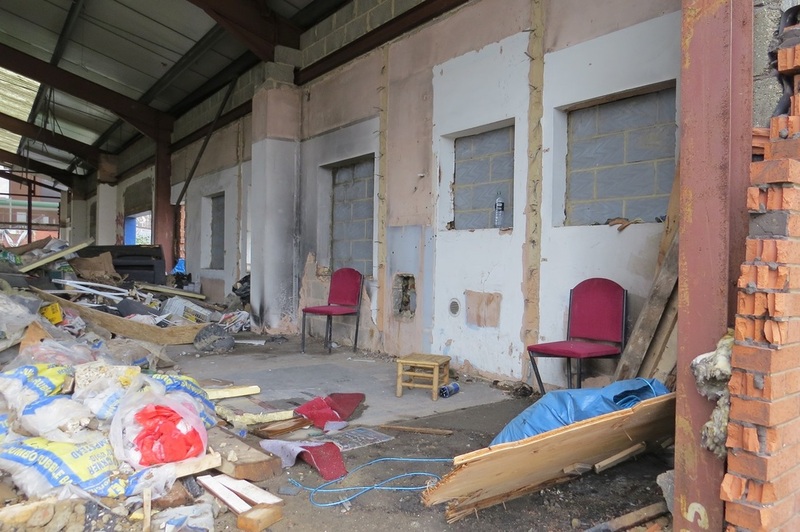 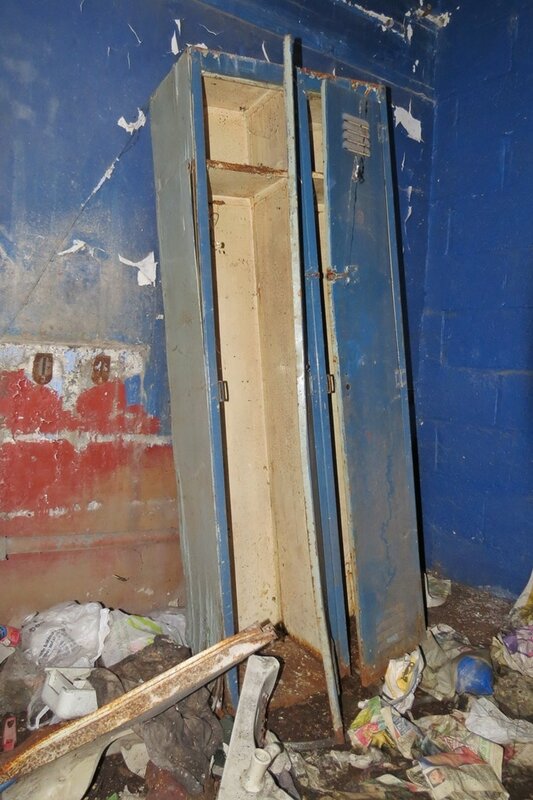 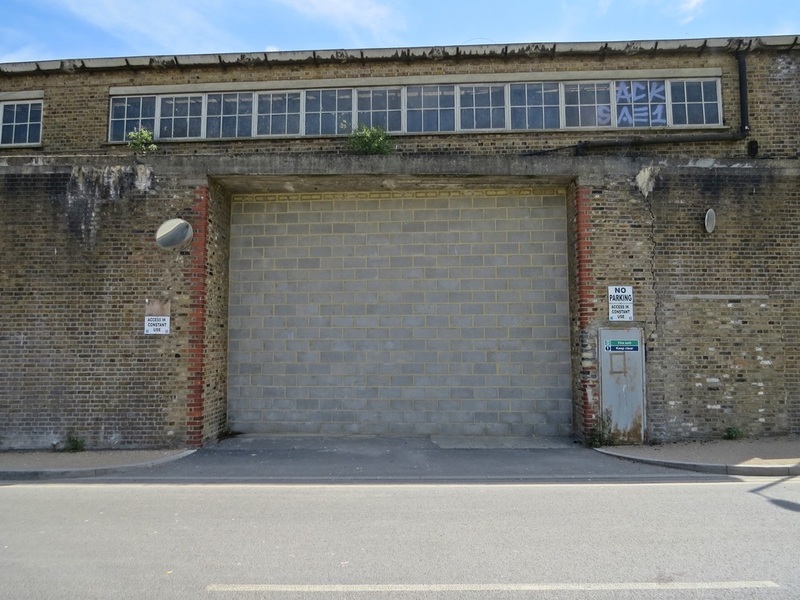 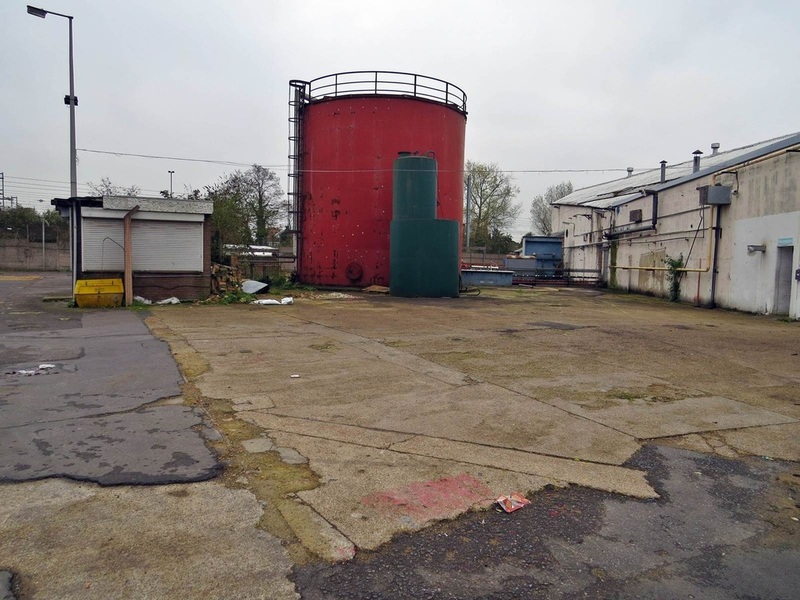 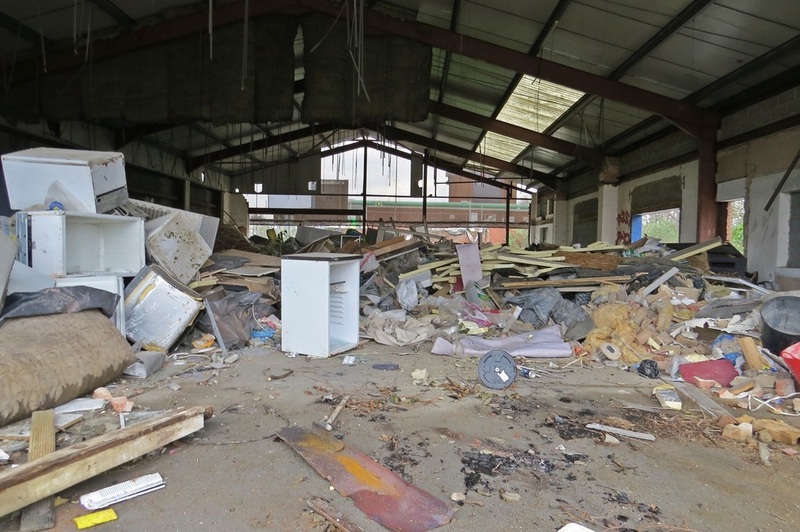 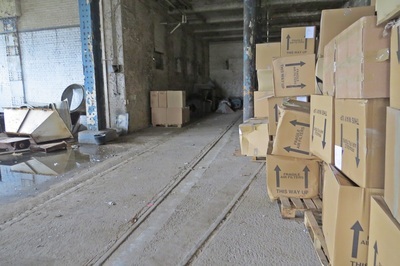 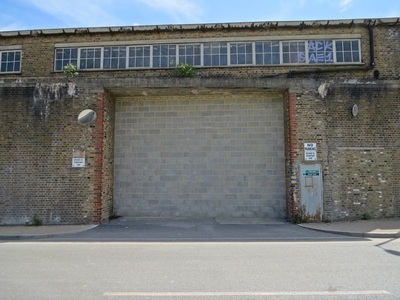 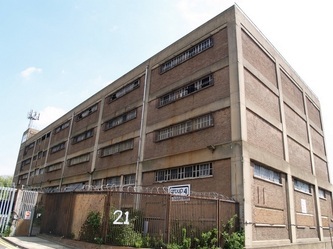 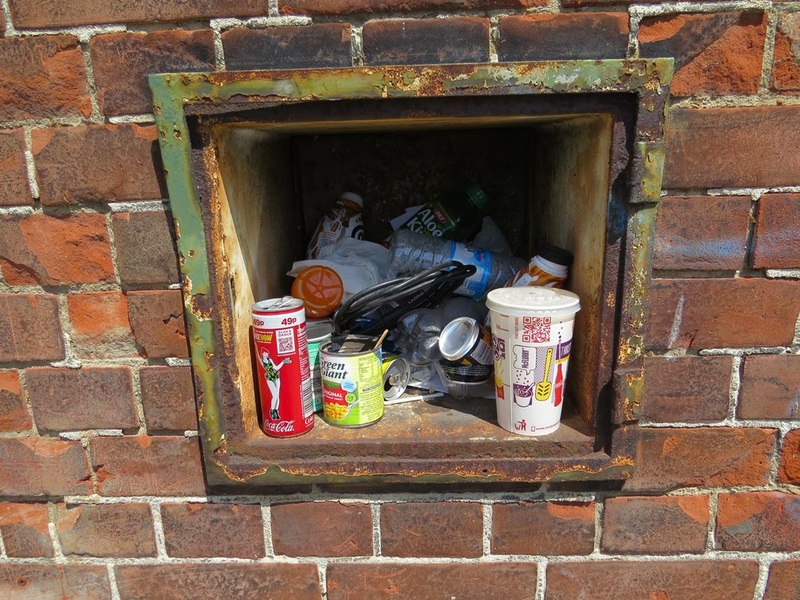 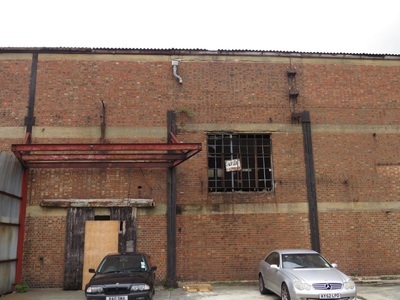 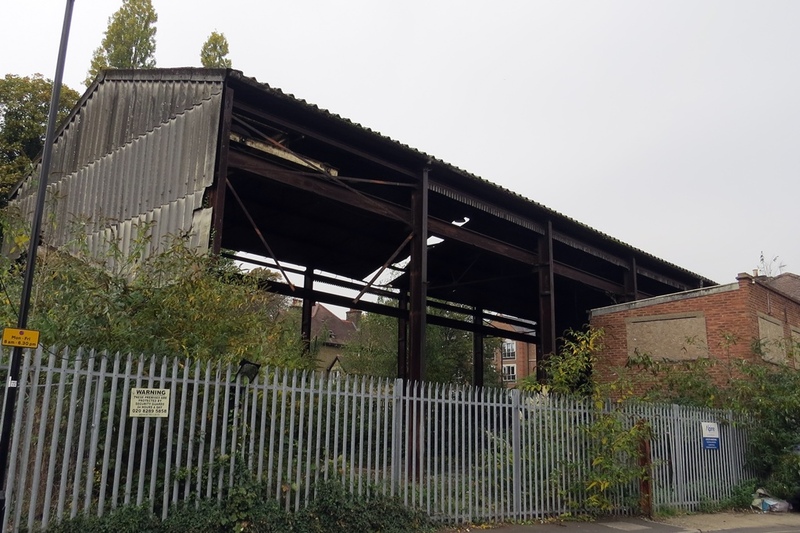 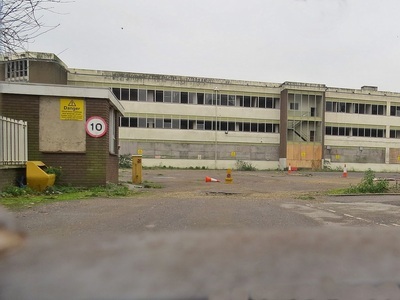 According to the planning documents this building is still in occasional use as storage for vehicles although it is noted that it is not confirmed whether this use is indeed lawful. 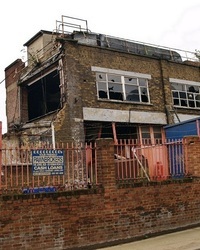 Application has been made to demolish the building and construct flats. 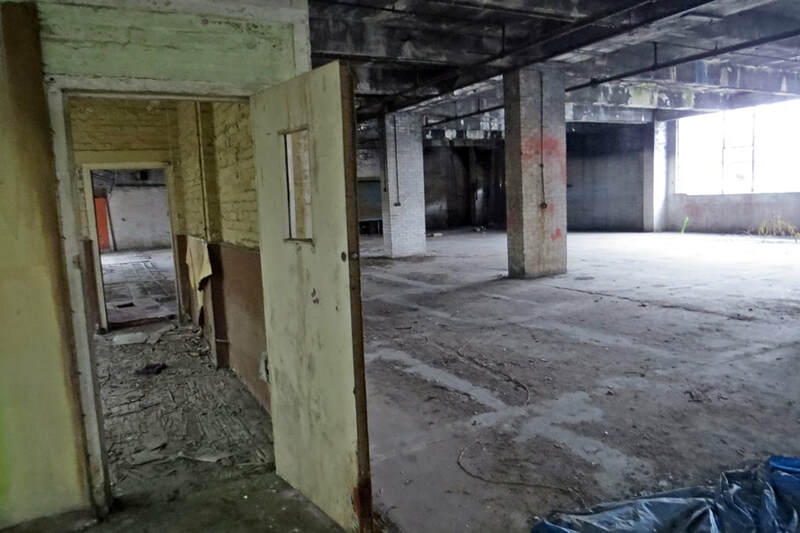 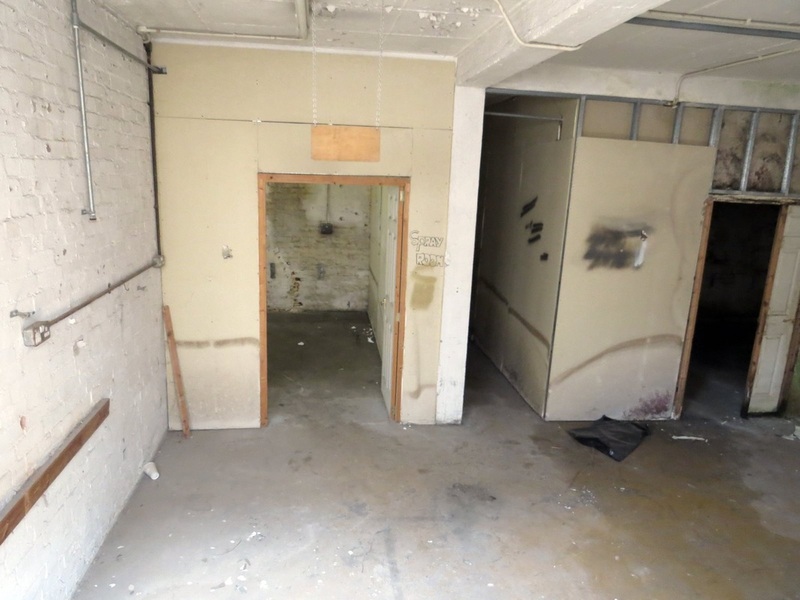 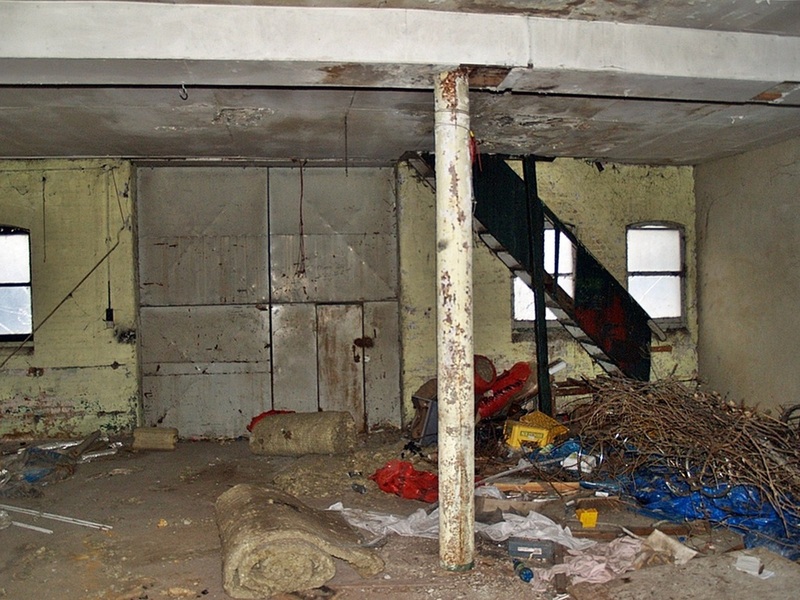 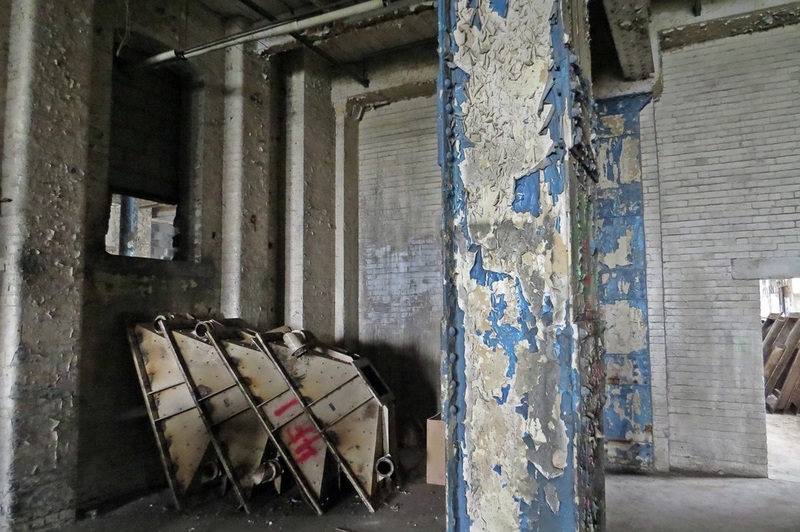 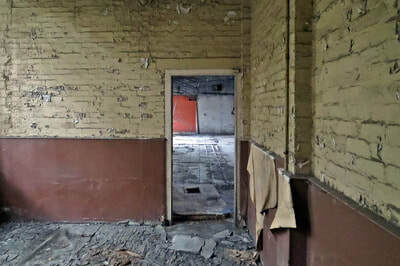 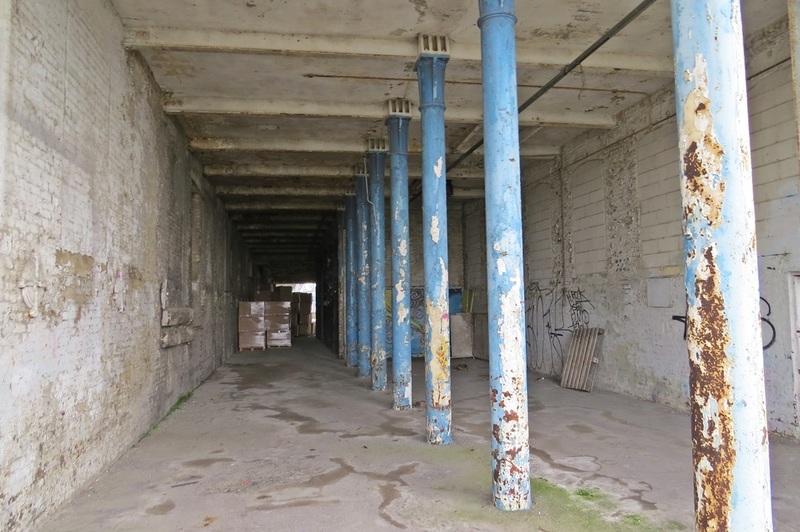 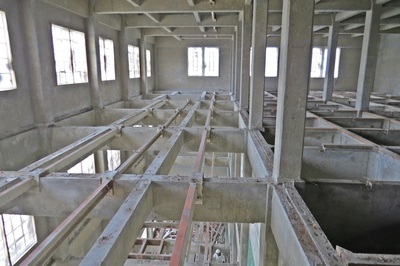 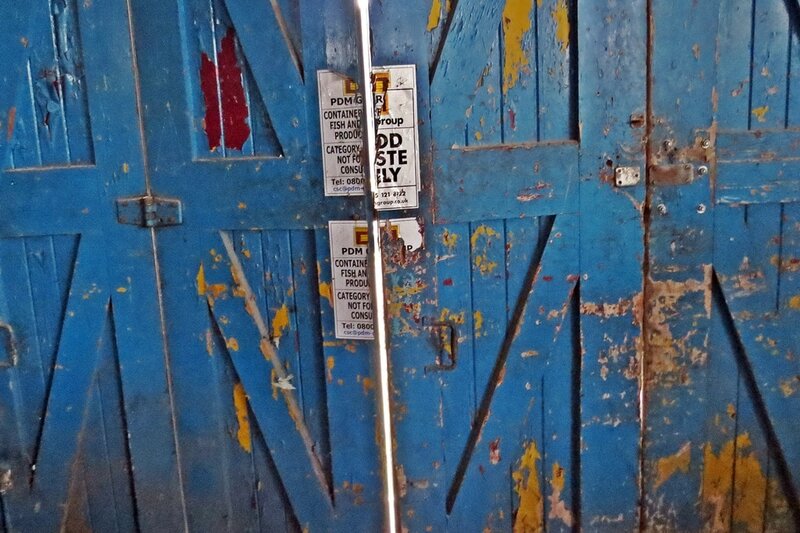 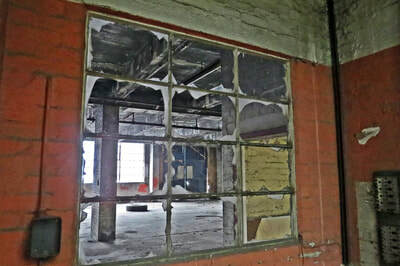 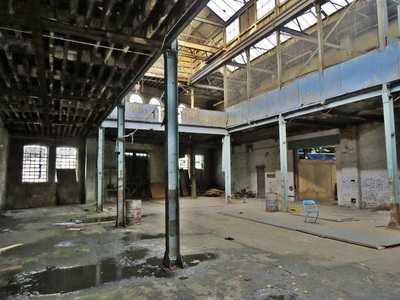 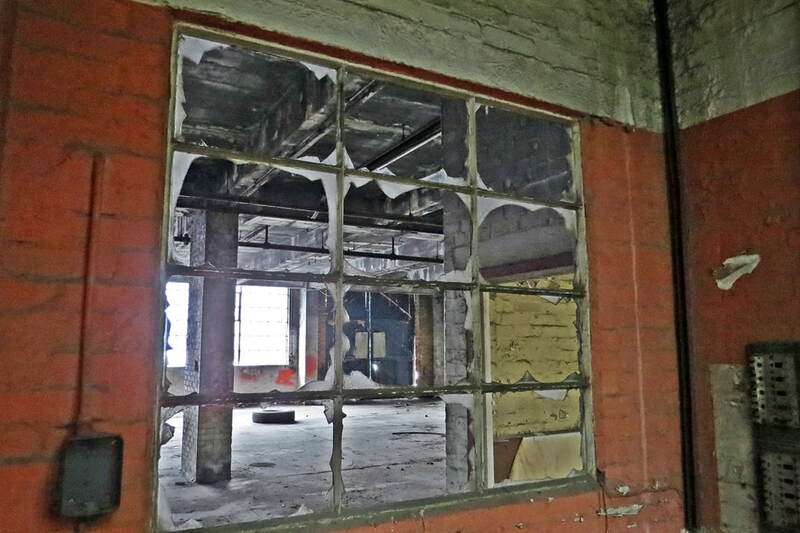 Situated on the site of a previous warehouse (that was built in 1860 & called the Messrs Innes Bros Warehouse) this is an early twentieth century single storey warehouse though inside there is a stairwell indicating that indicates there was originally another floor. 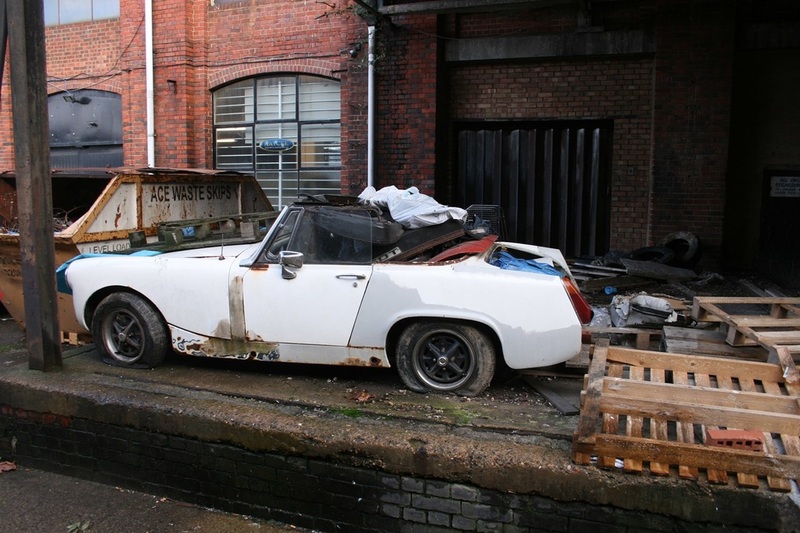 Occupied by the Wapping Packers in the 1970s and last occupied by Thames Autos. 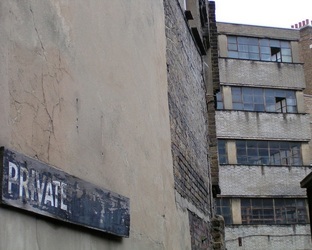 Despite the address the main entrance of the building is actually on Cinnamon Street. Application has been made to demolish the building & redeveloping the site into 4 town houses. 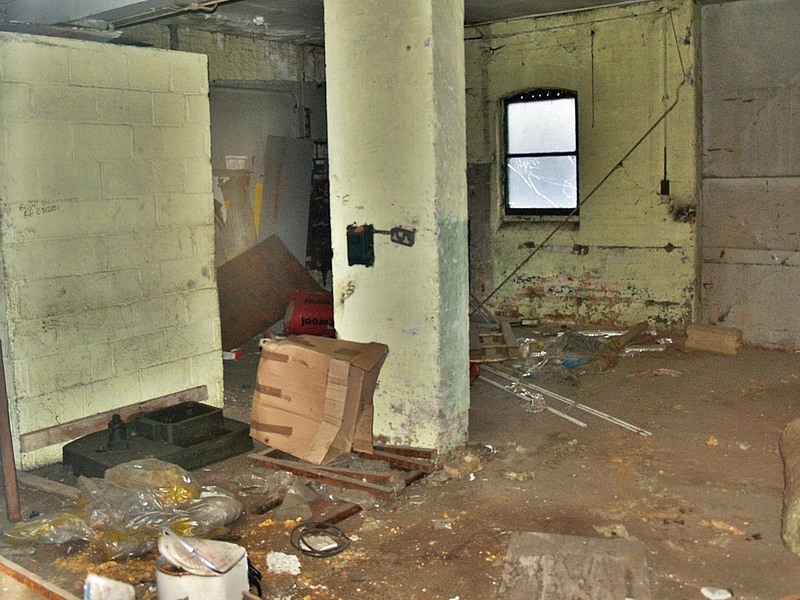 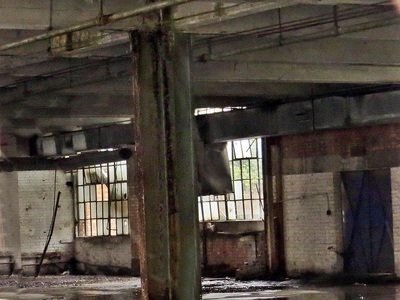 Red Lion Court is a partially demolished warehouse located on Reardon Path (previously called Red Lion Street). 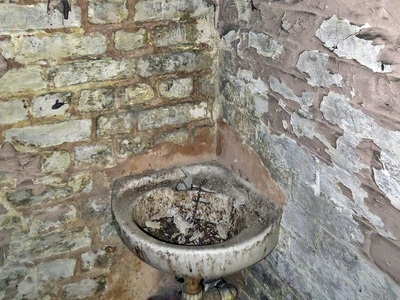 Dating back to the Victorian times. 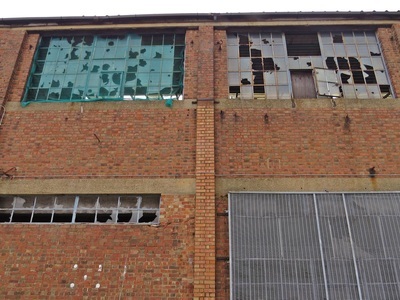 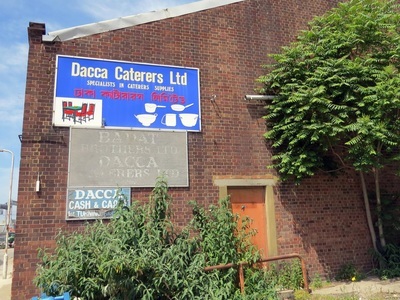 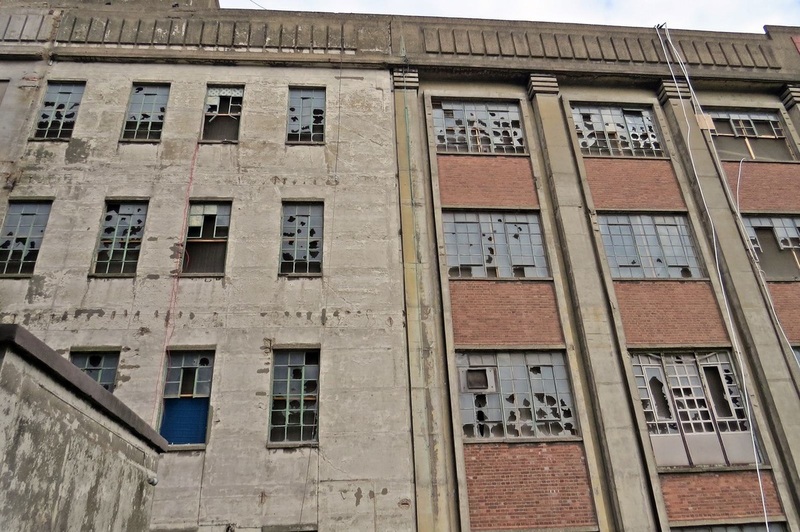 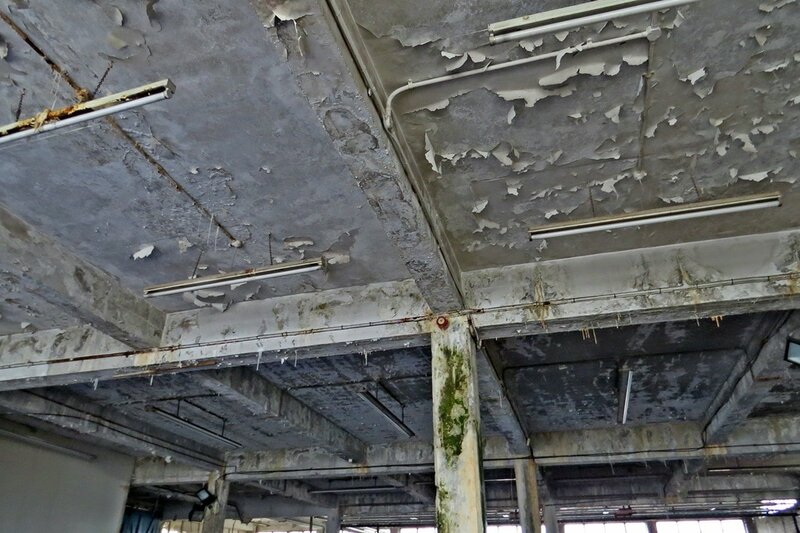 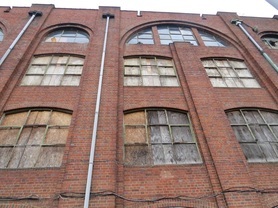 During the 1940s the building was under the ownership of Pye Storage Ltd, then Coordinated Traffic Services and by The Mentex Co from the 1960s where the building is listed as a cotton and plastics factory using recycled cotton combined with plastic to make hosepipes .The building has been derelict for well over 20 years although initial conversion to residential use did begin in the early 1990s but the developer went into receivership soon after starting work. 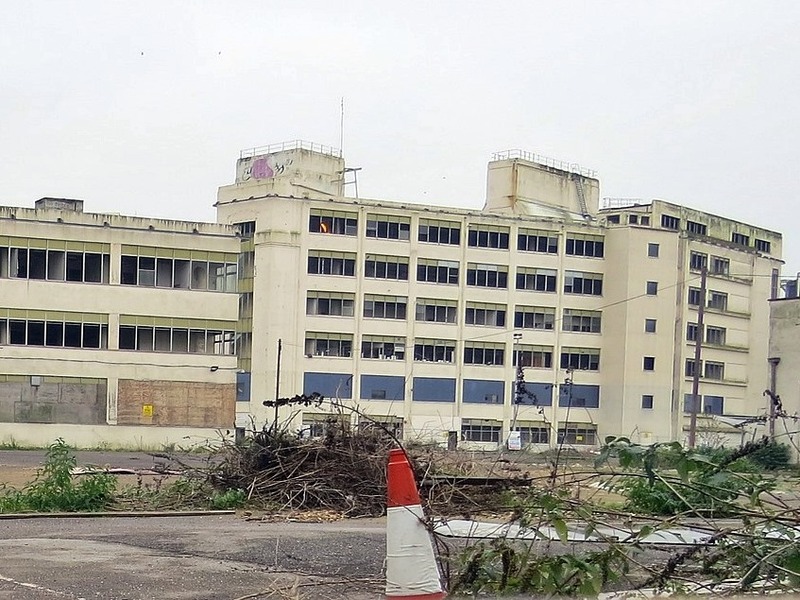 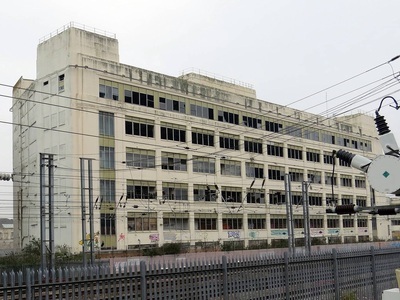 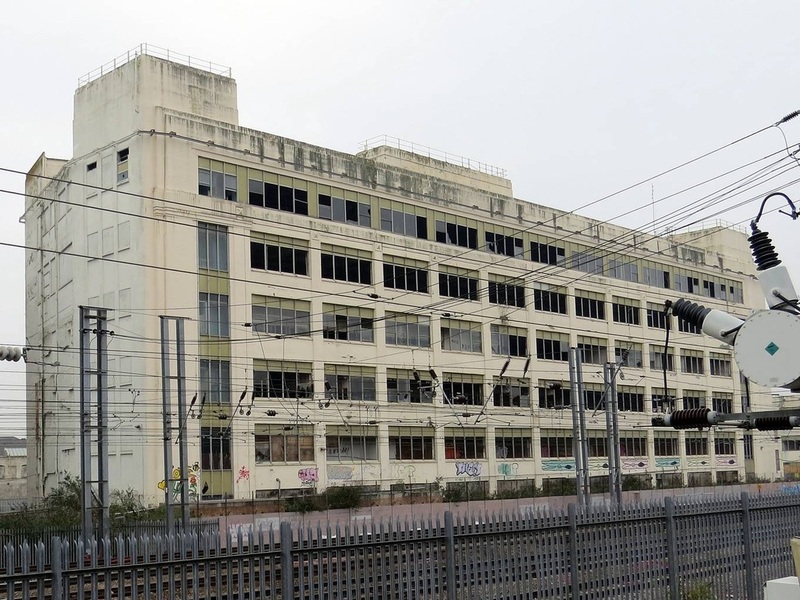 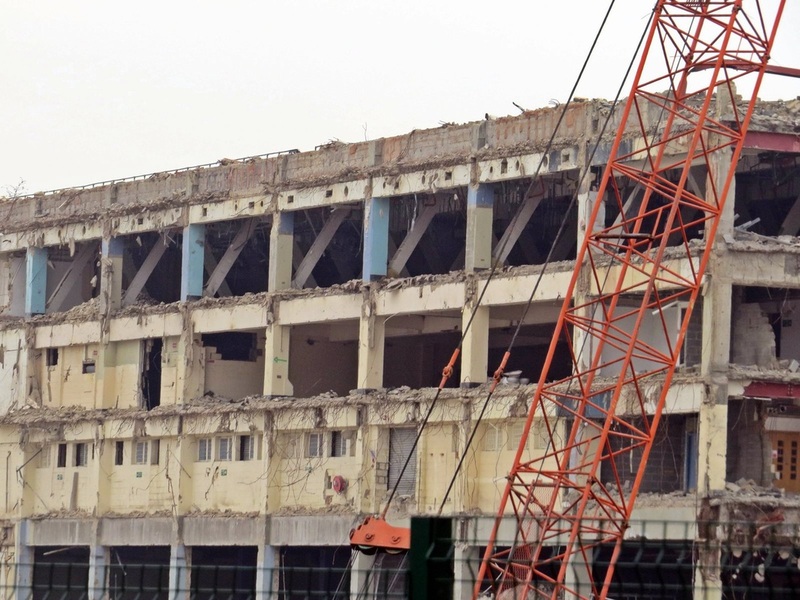 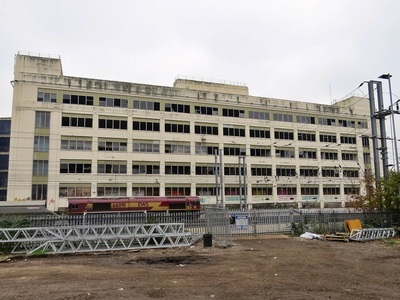 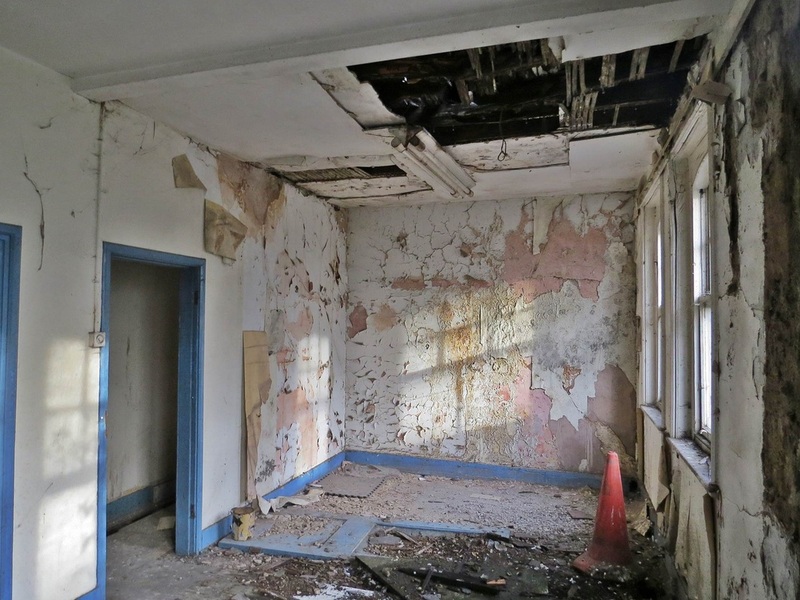 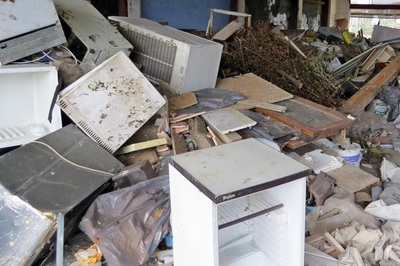 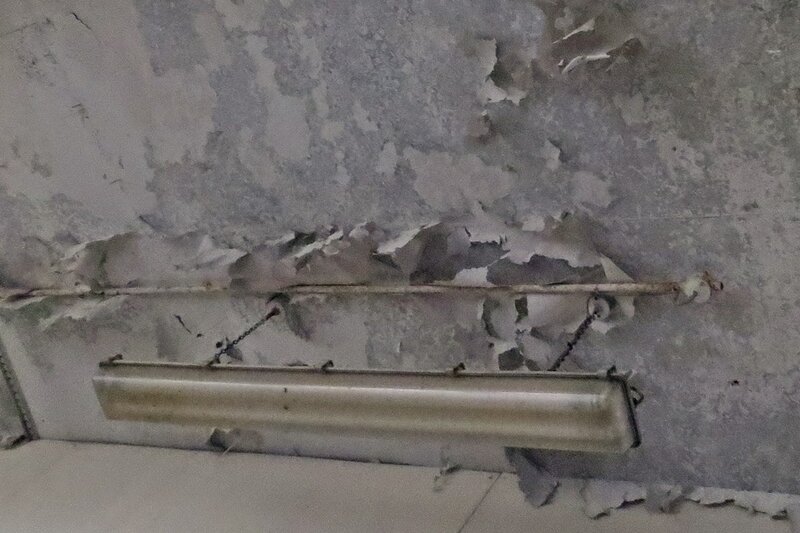 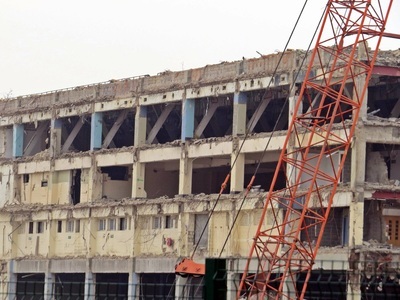 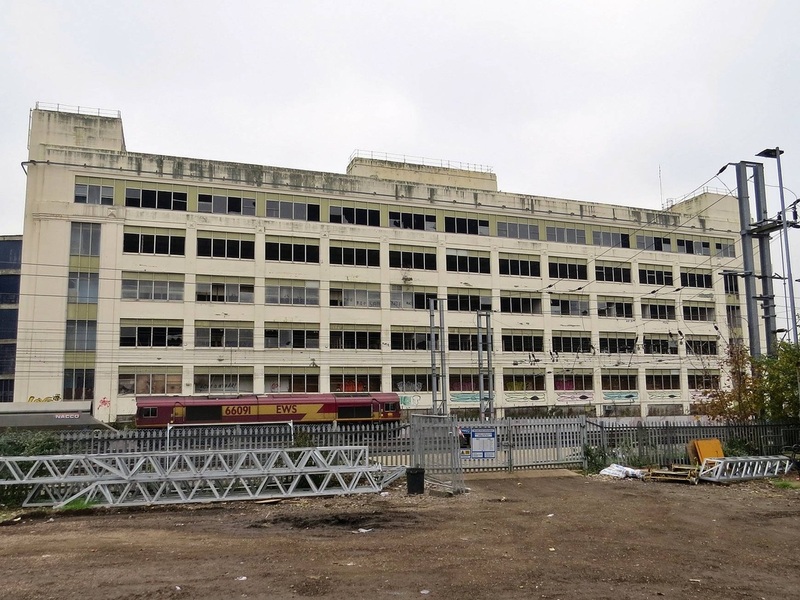 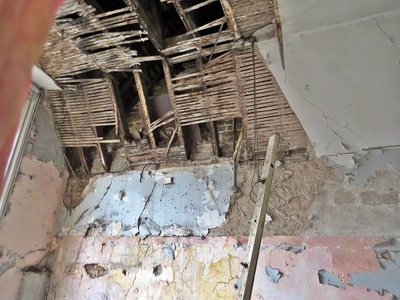 The building is now considered to be in such a bad state that the latest proposals are to demolish it and build 1 6 storey building consisting of 26 flats. 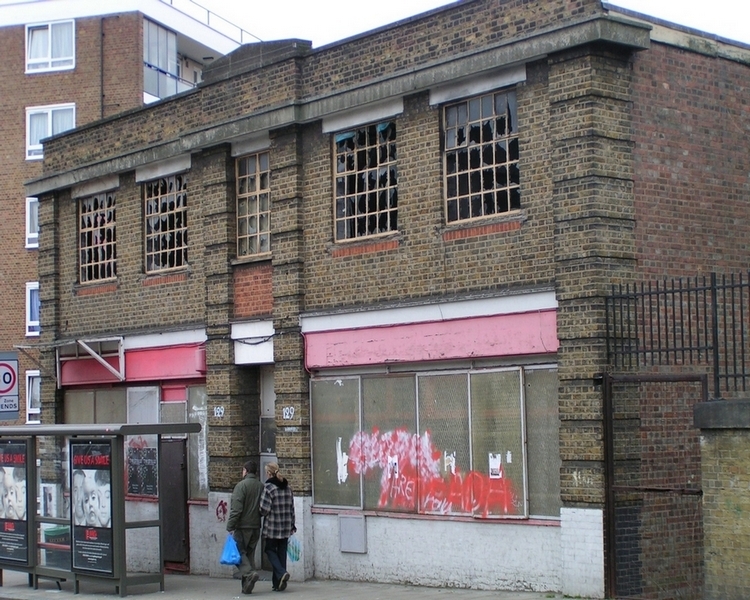 Rupert Murdoch moved his News International printing and publishing works into Wapping in 1986. 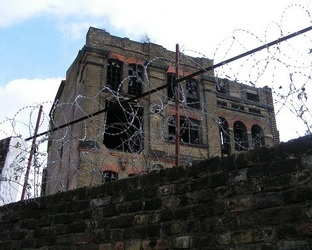 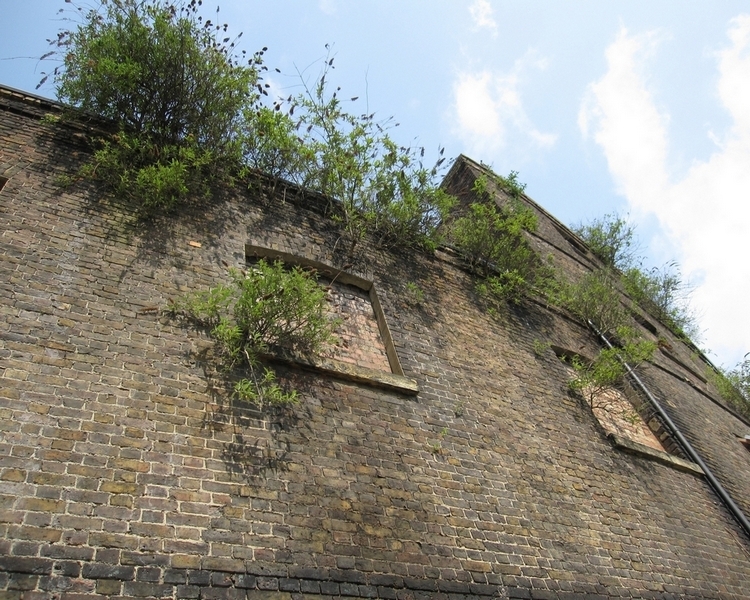 The plant was nicknamed "Fortress Wapping" when sacked print workers effectively besieged it, mounting round-the-clock pickets and blockades in an ultimately unsuccessful attempt to thwart the move from Fleet Street to Wapping.More than 400 police officers were injured, and more than 1,000 arrests made during the dispute. 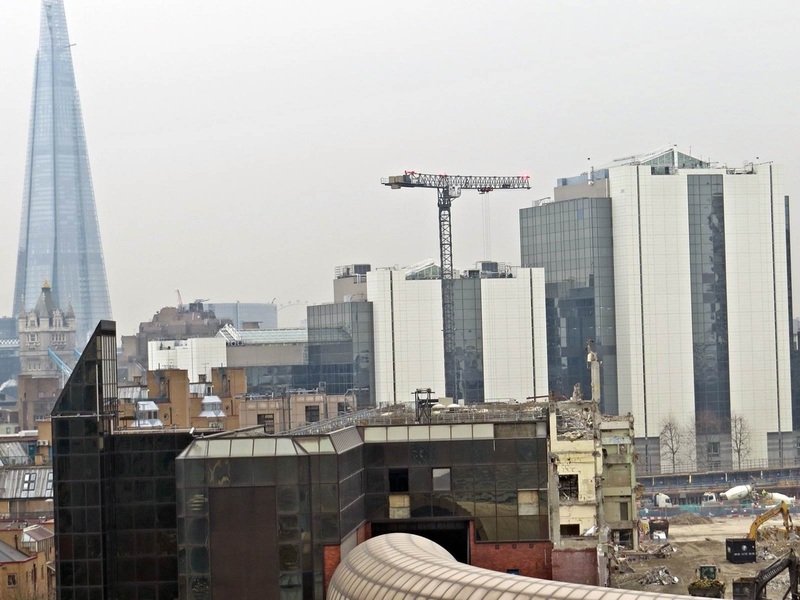 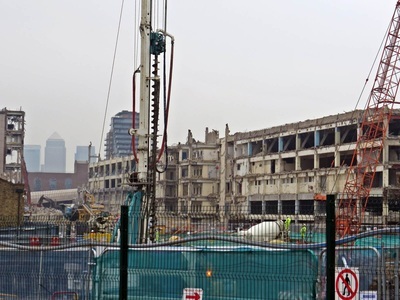 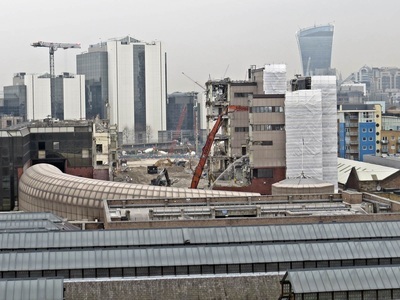 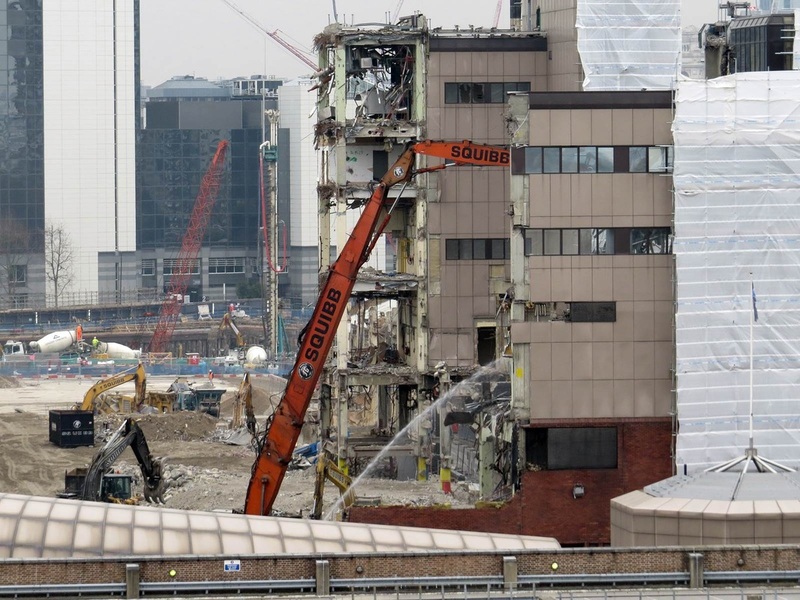 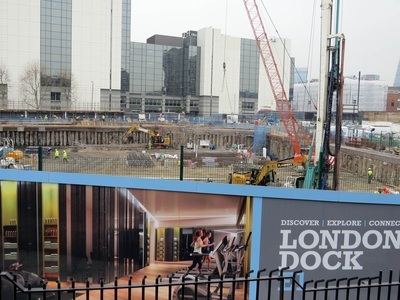 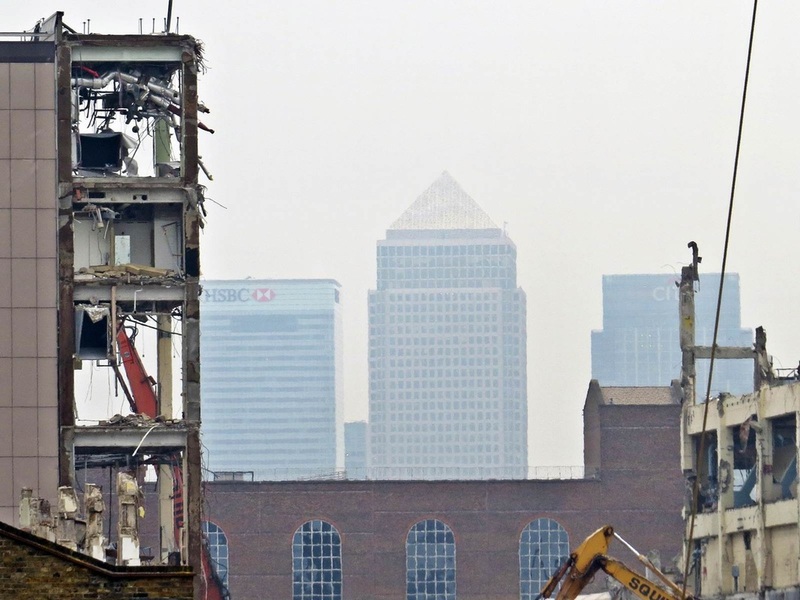 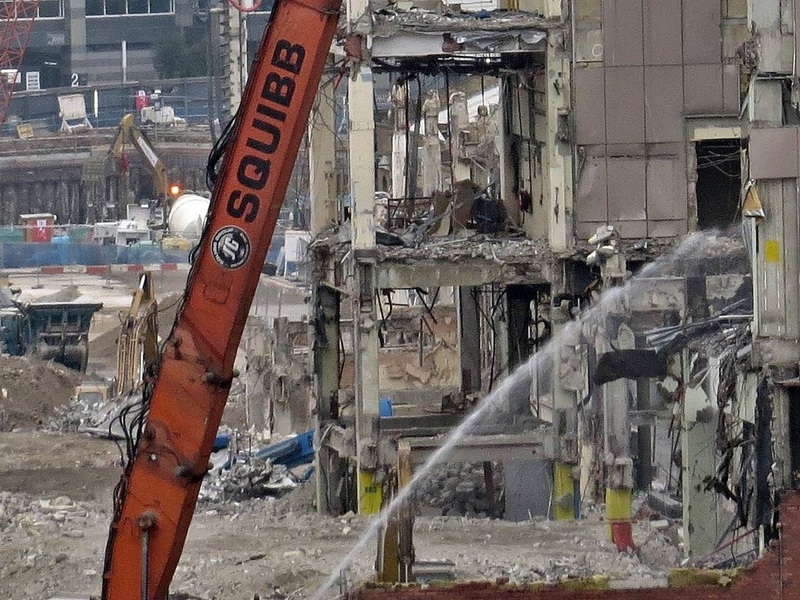 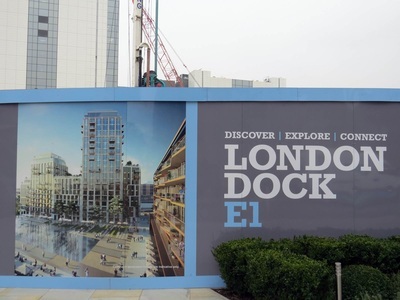 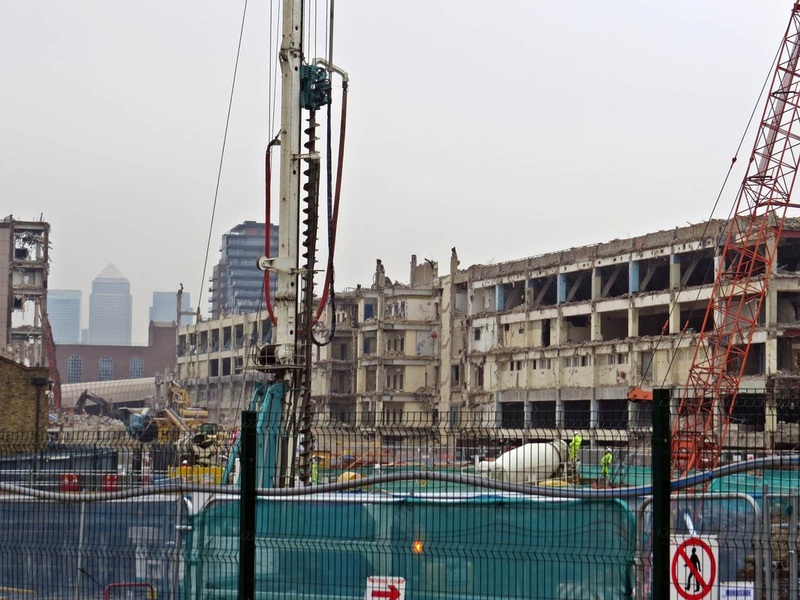 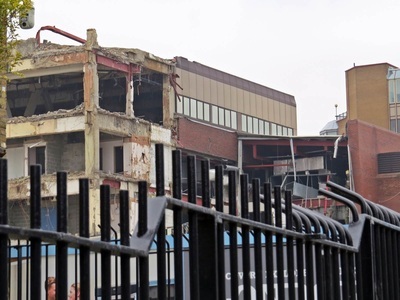 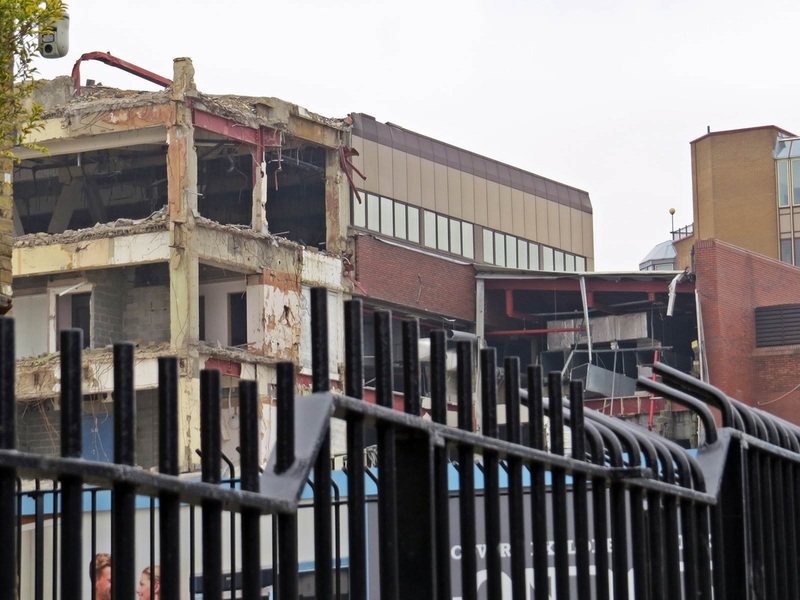 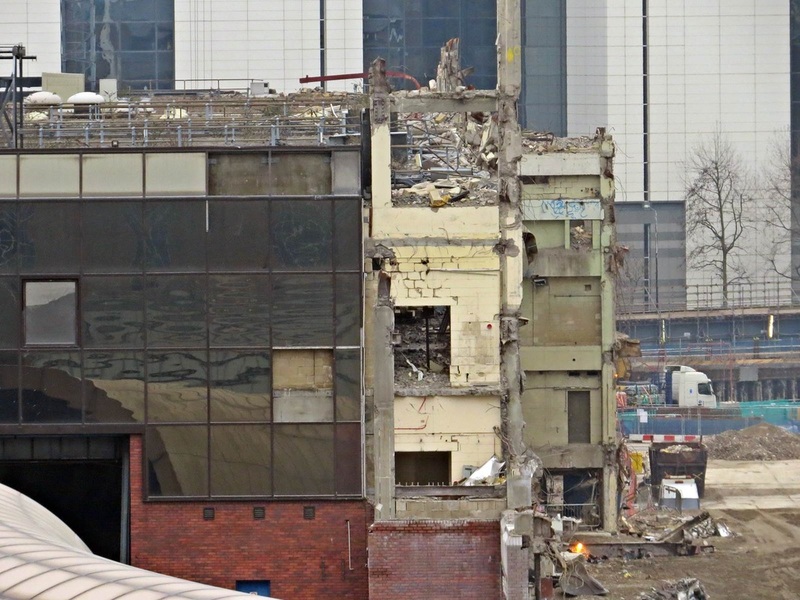 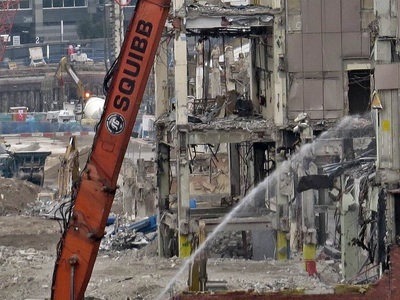 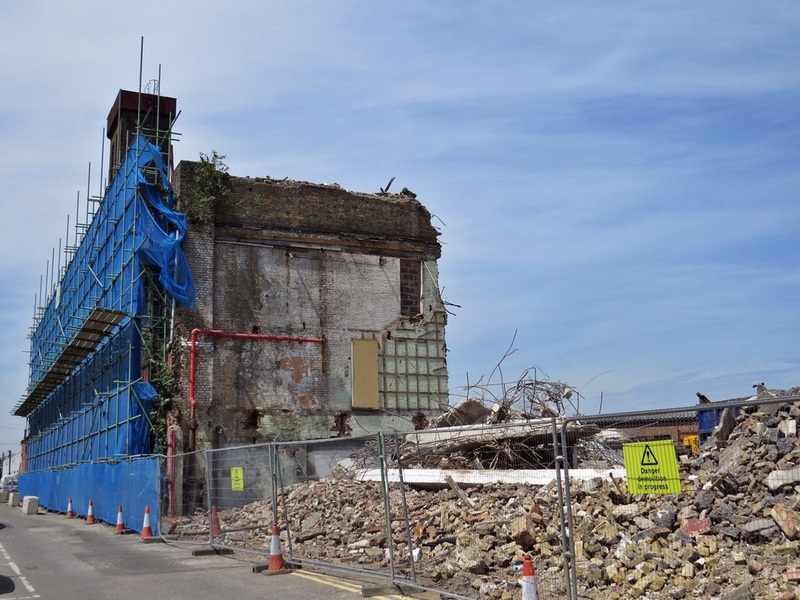 The works have now closed and most buildings are being demolished to make way for the London Dock development - 1,800 new homes with a centrepiece tower 25 storeys high. 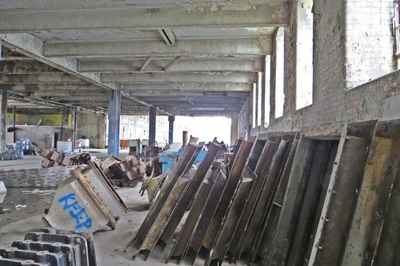 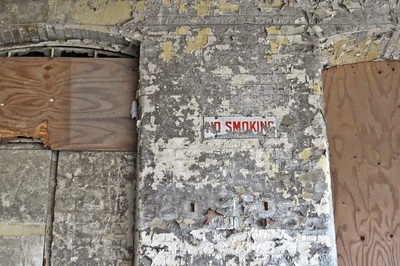 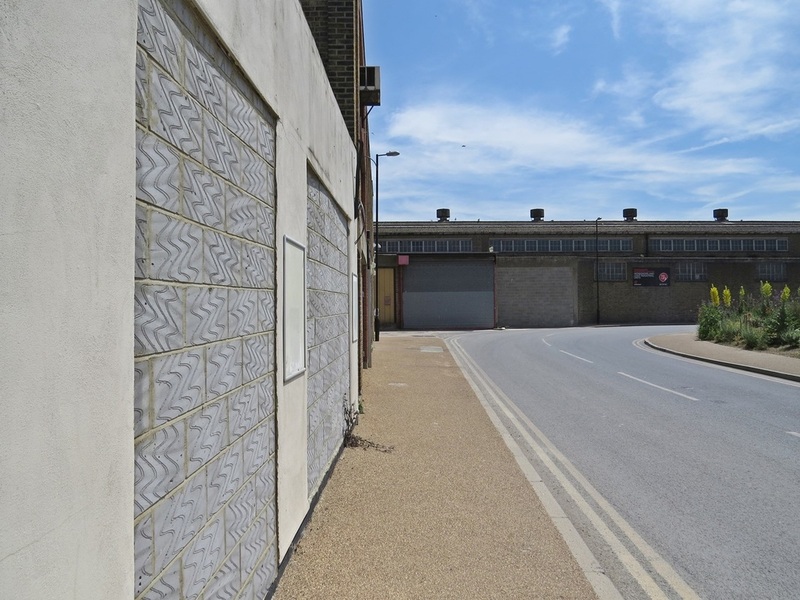 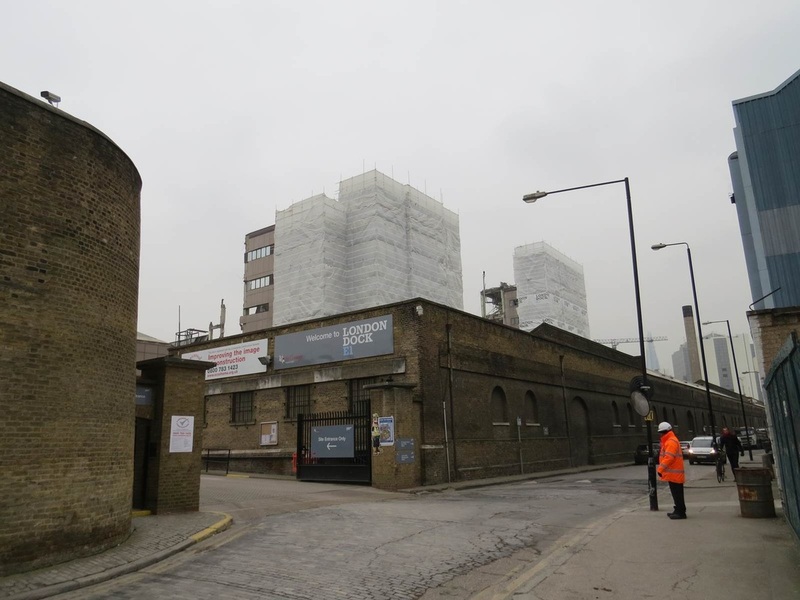 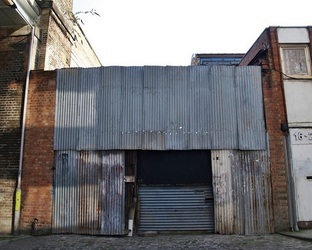 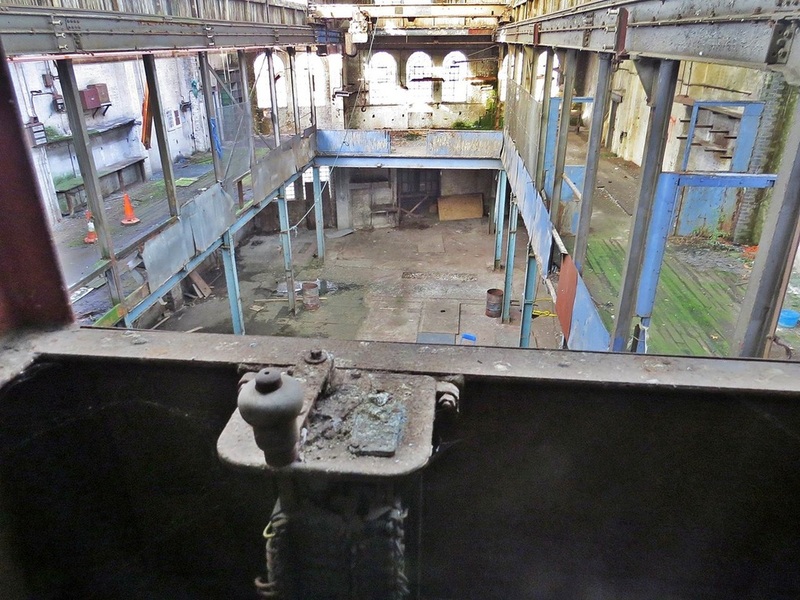 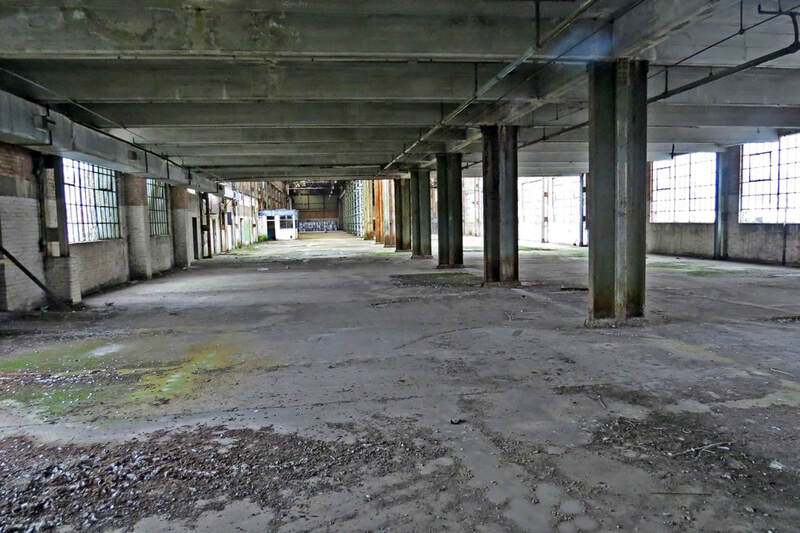 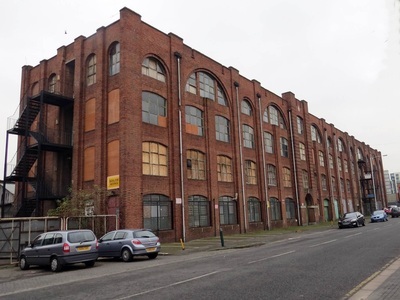 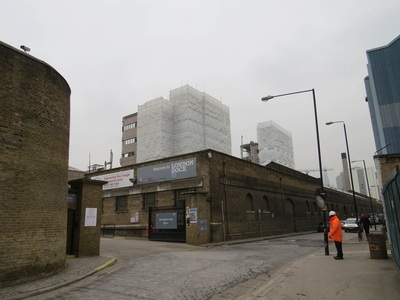 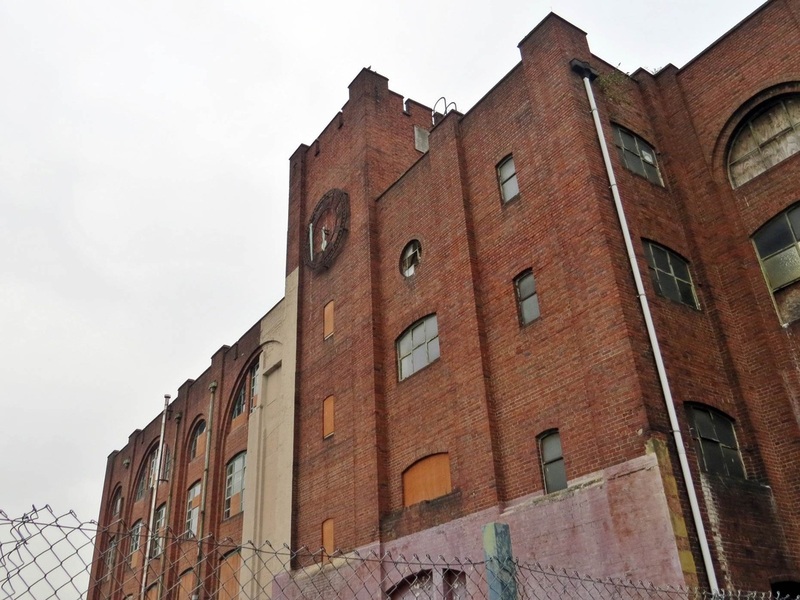 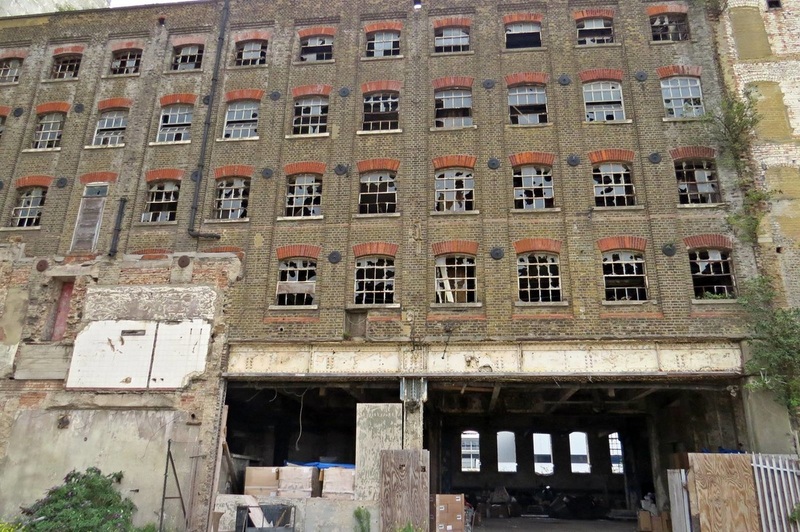 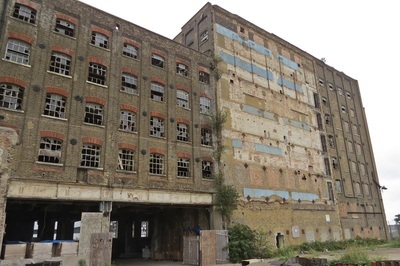 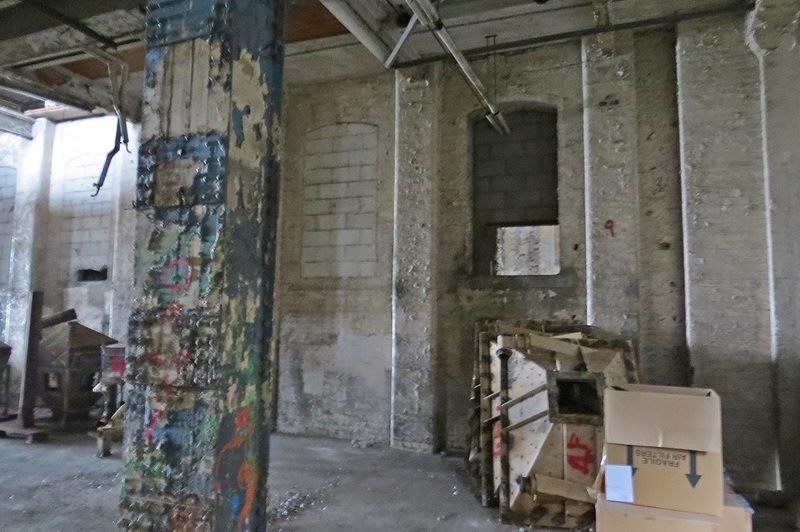 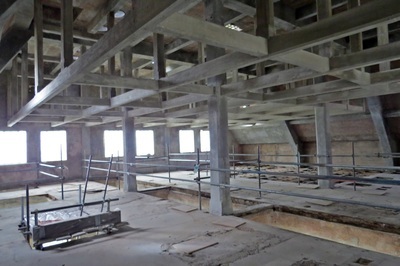 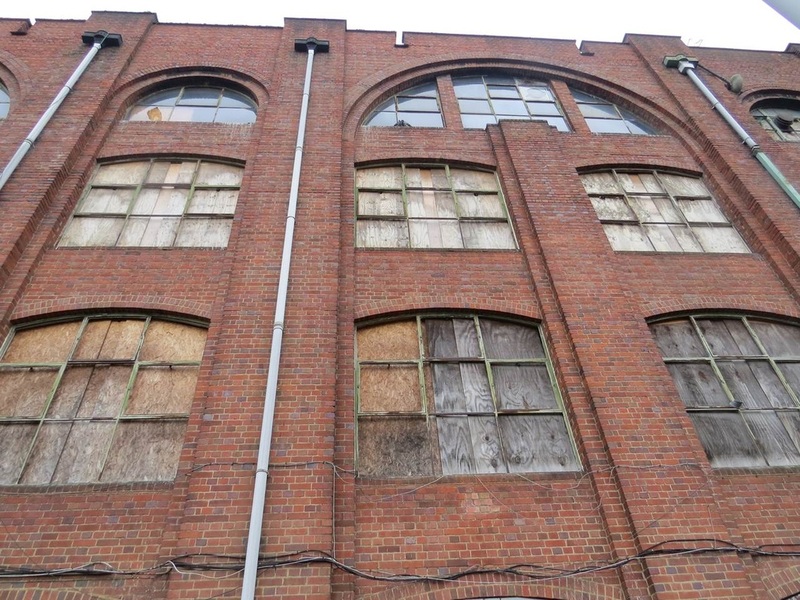 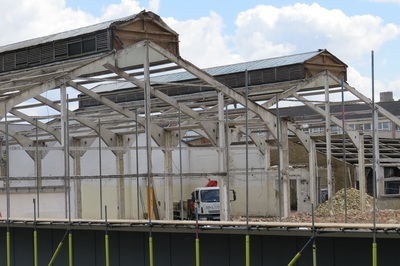 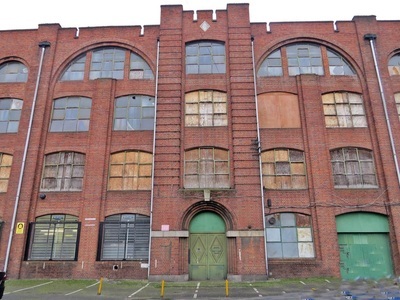 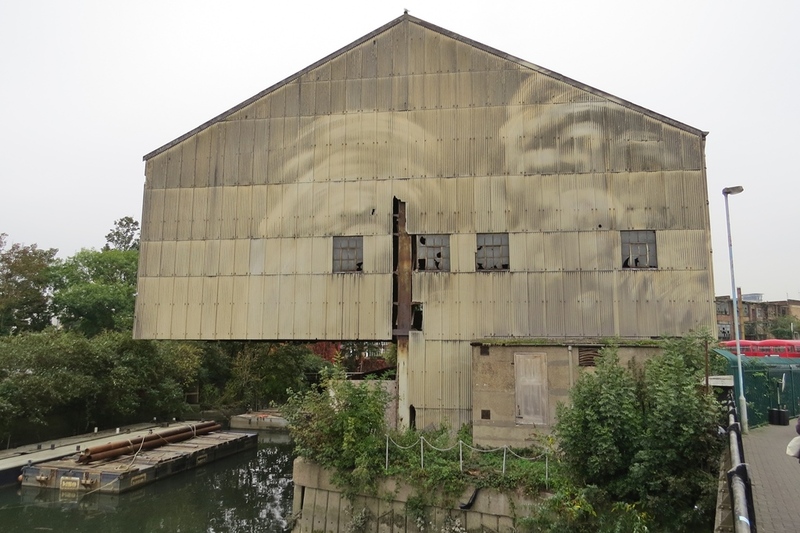 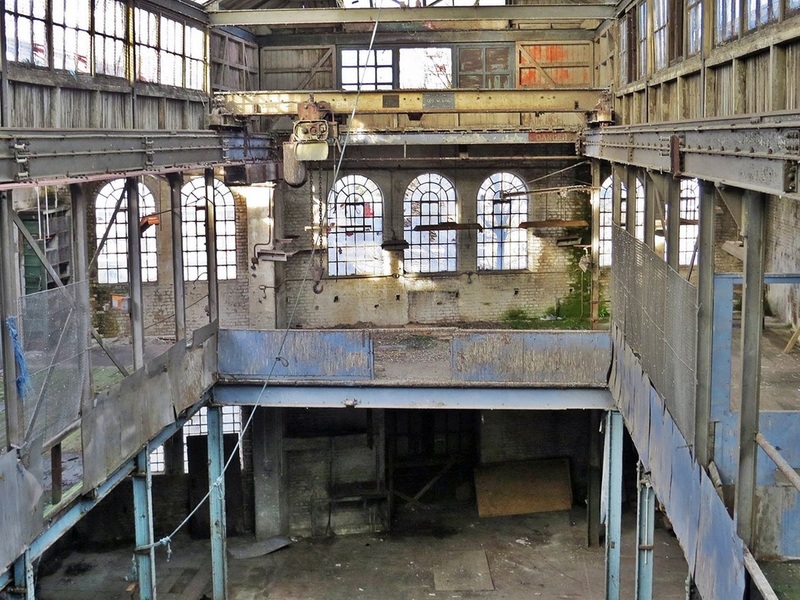 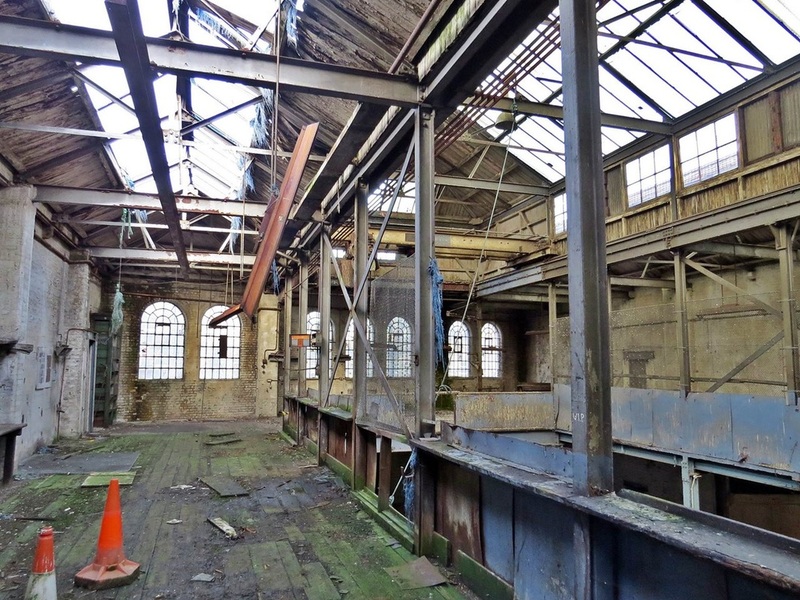 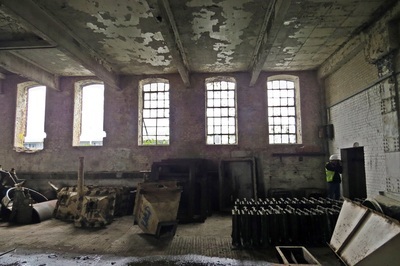 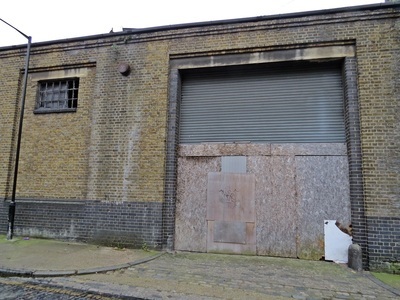 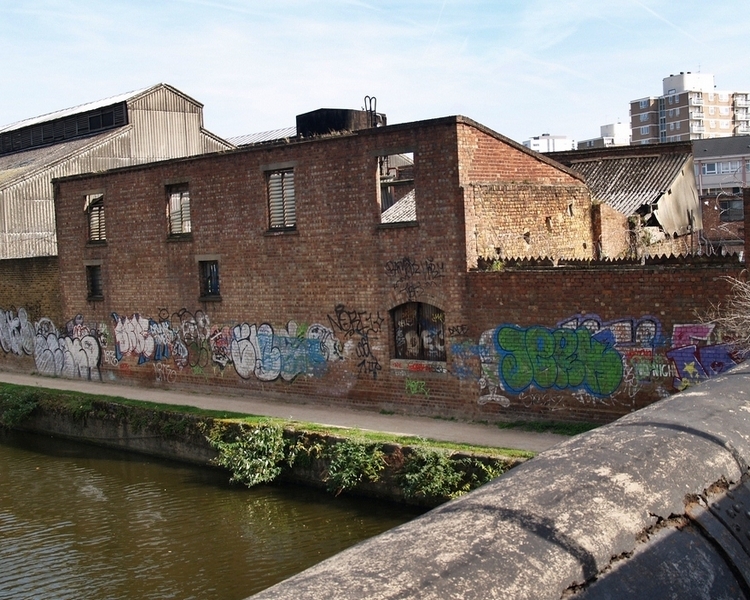 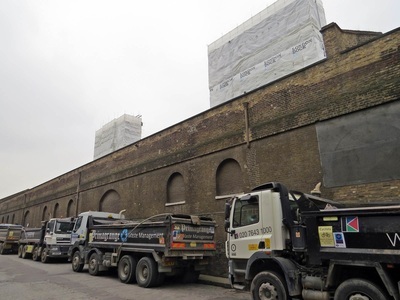 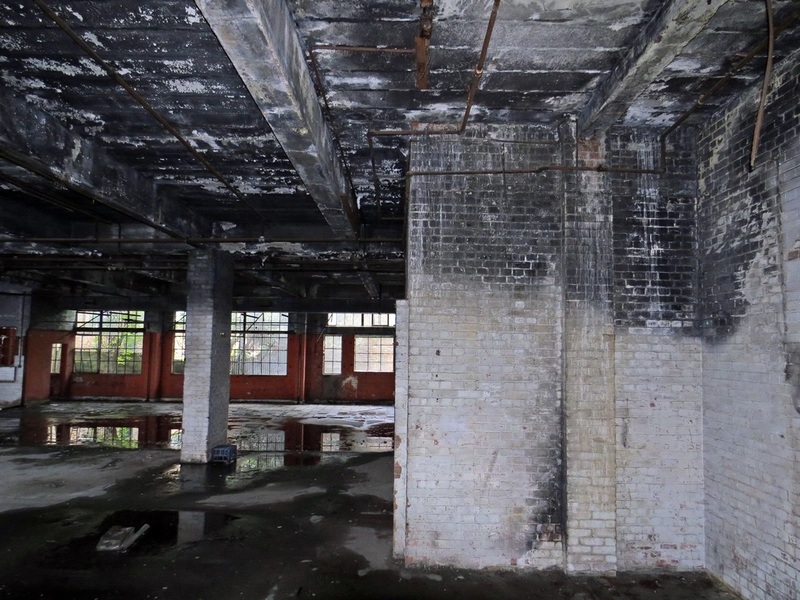 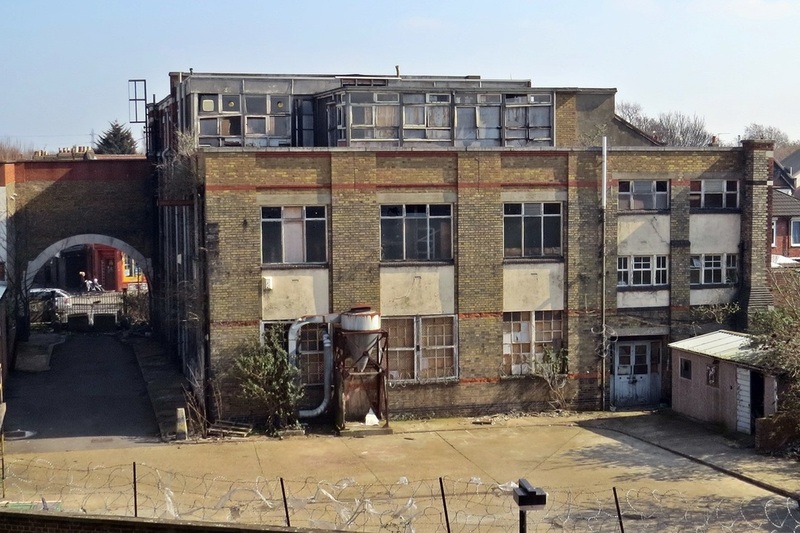 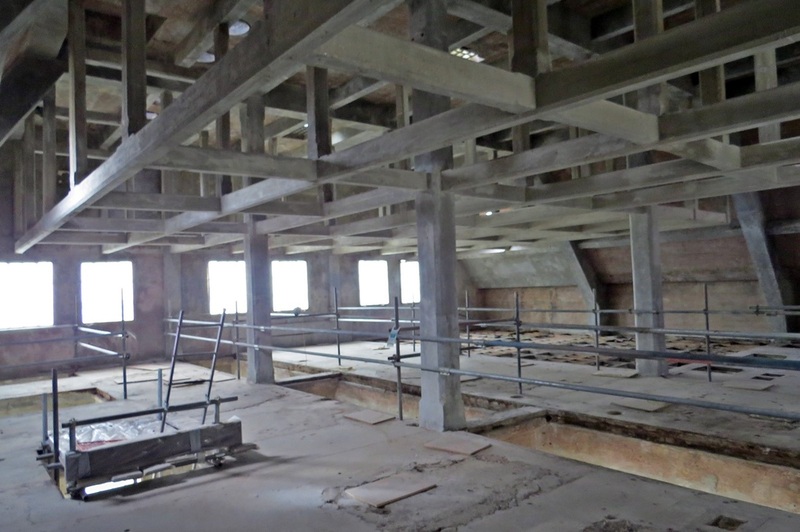 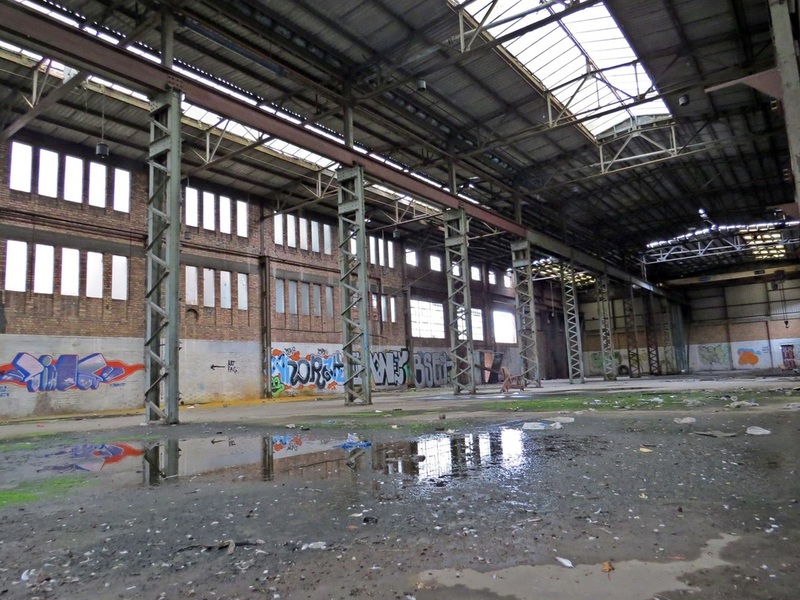 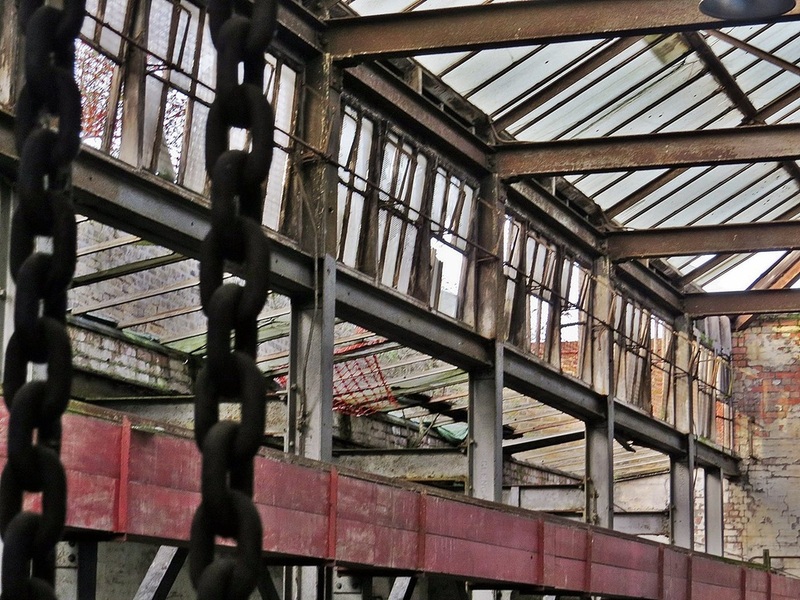 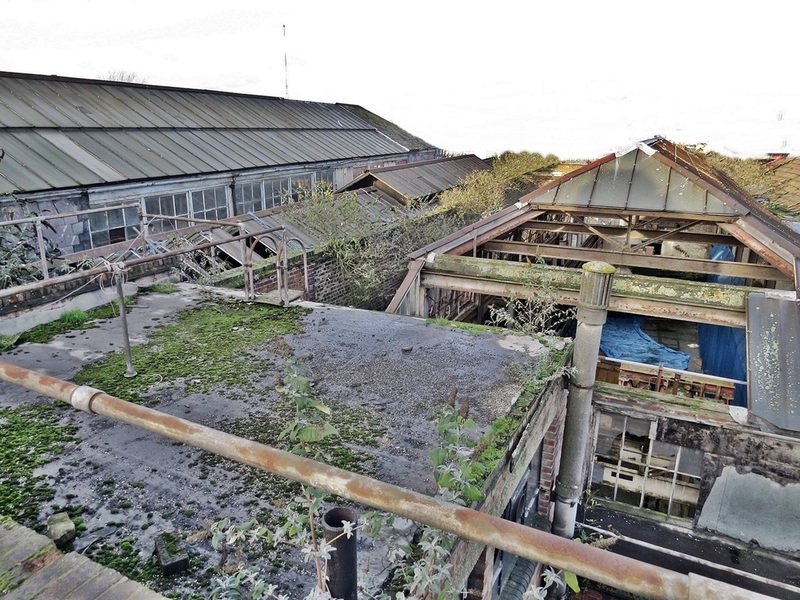 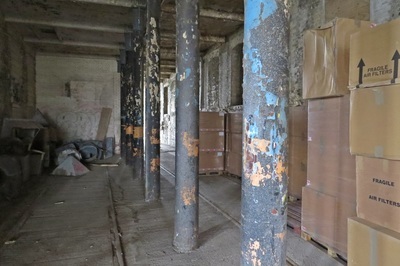 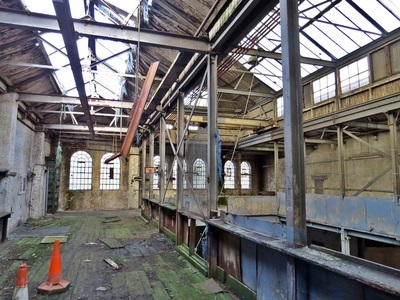 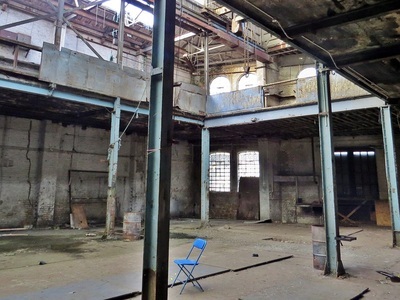 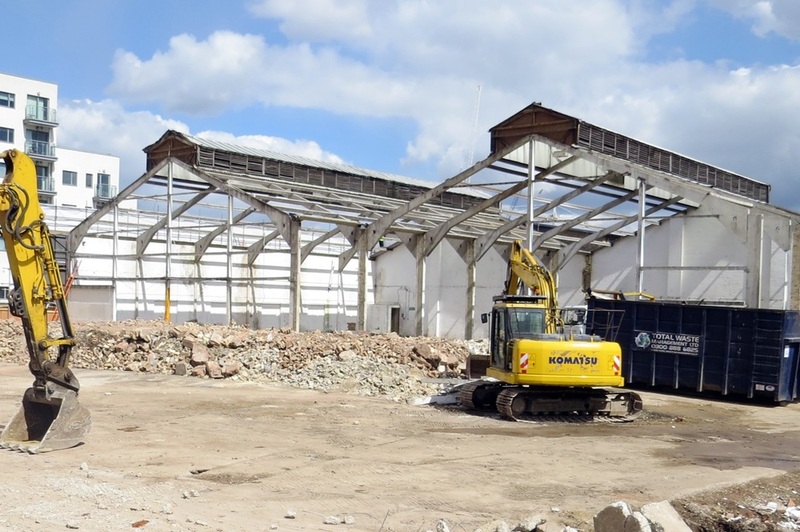 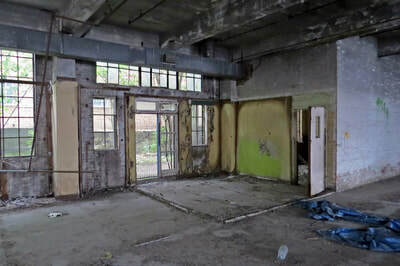 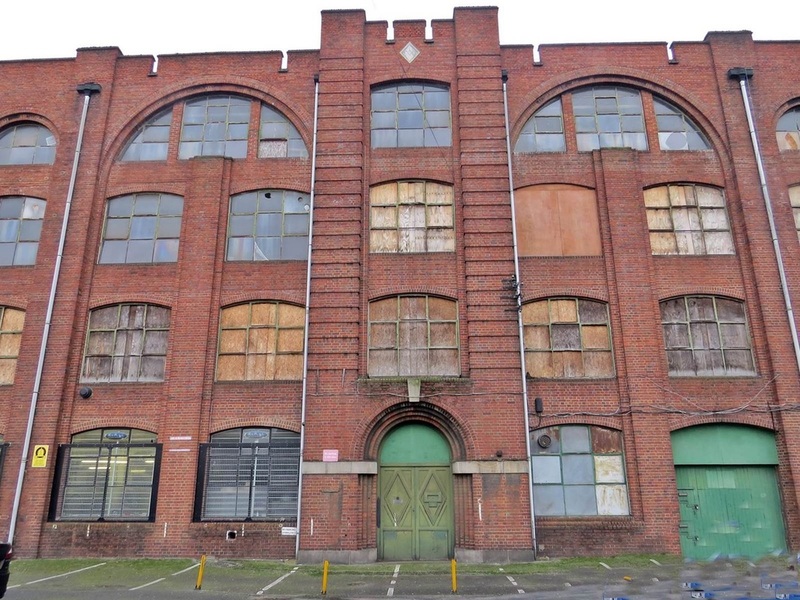 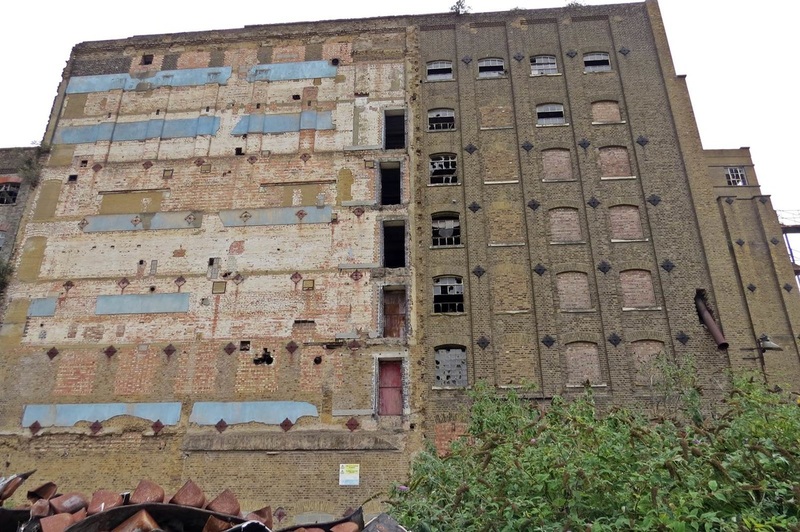 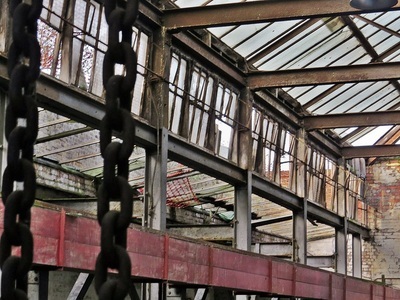 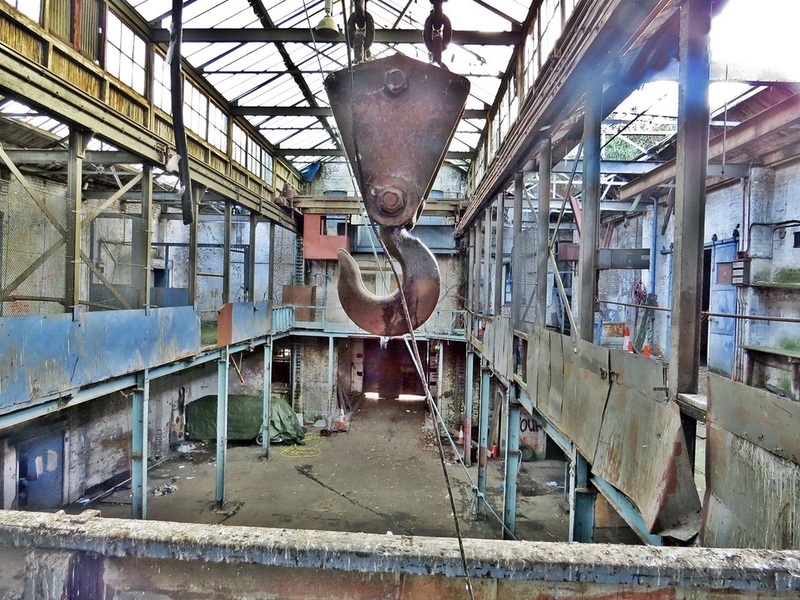 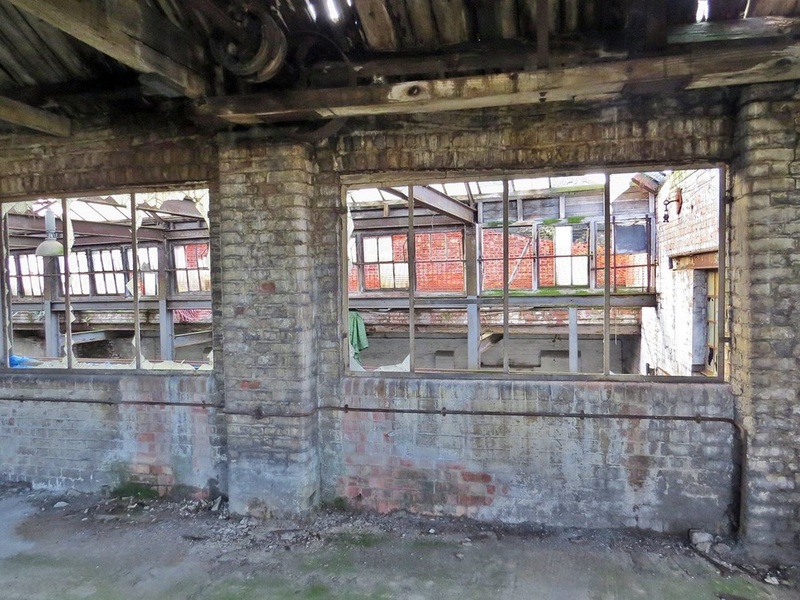 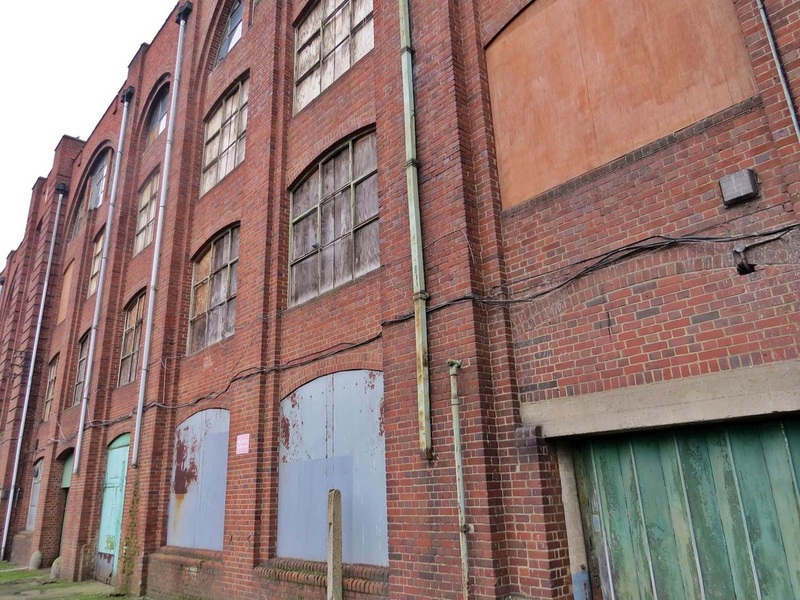 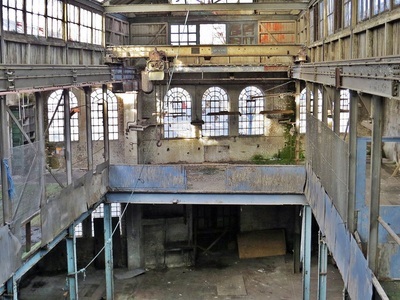 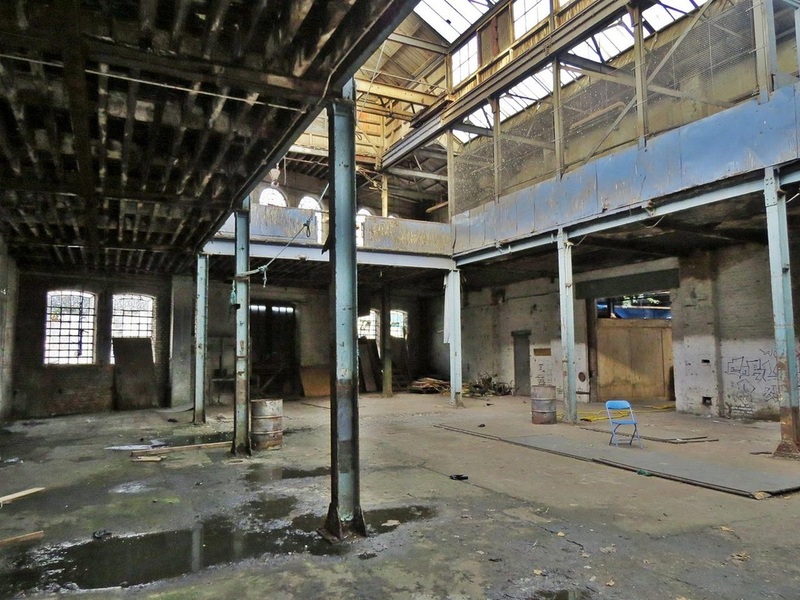 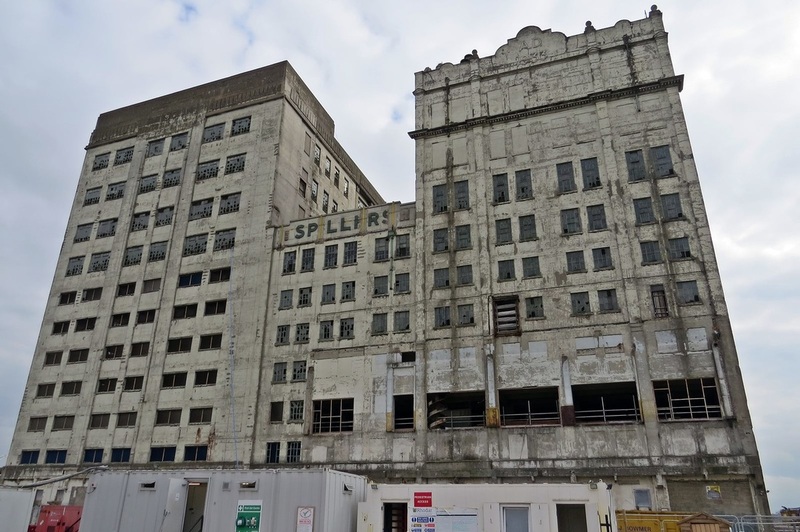 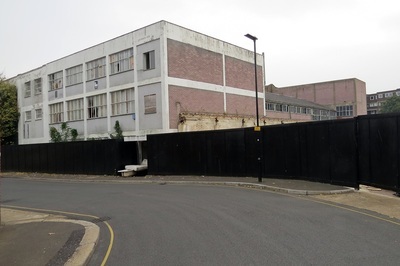 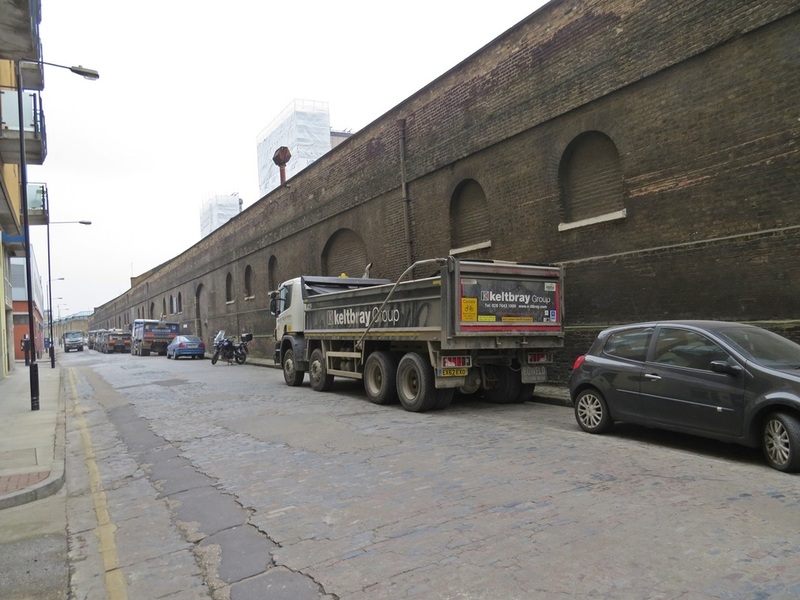 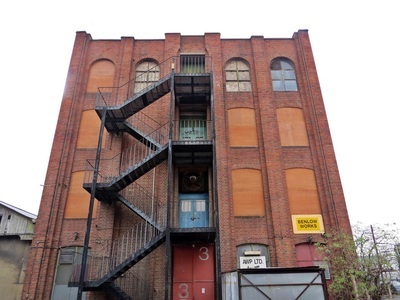 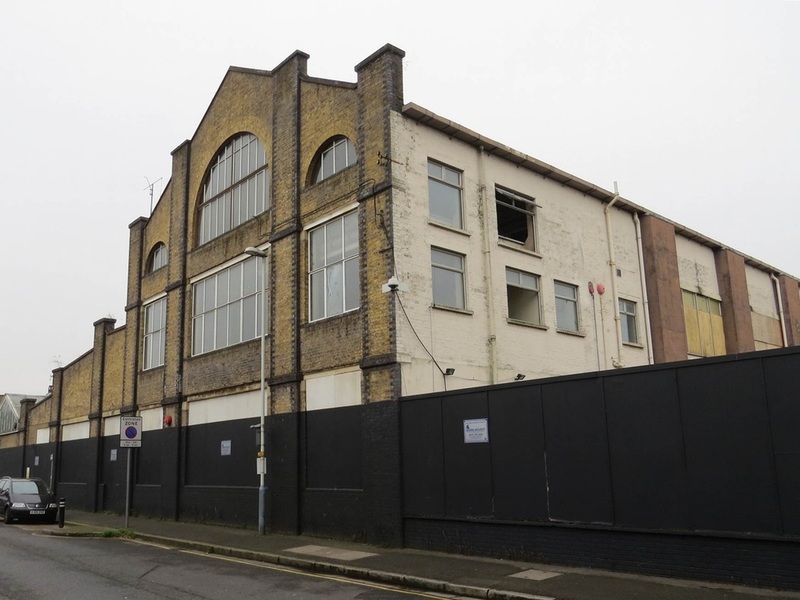 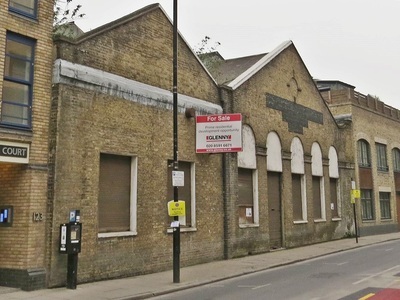 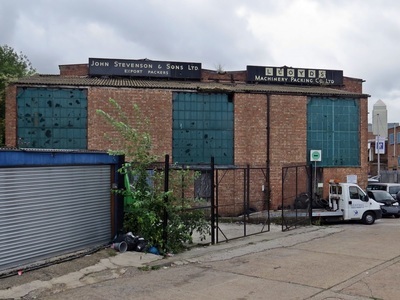 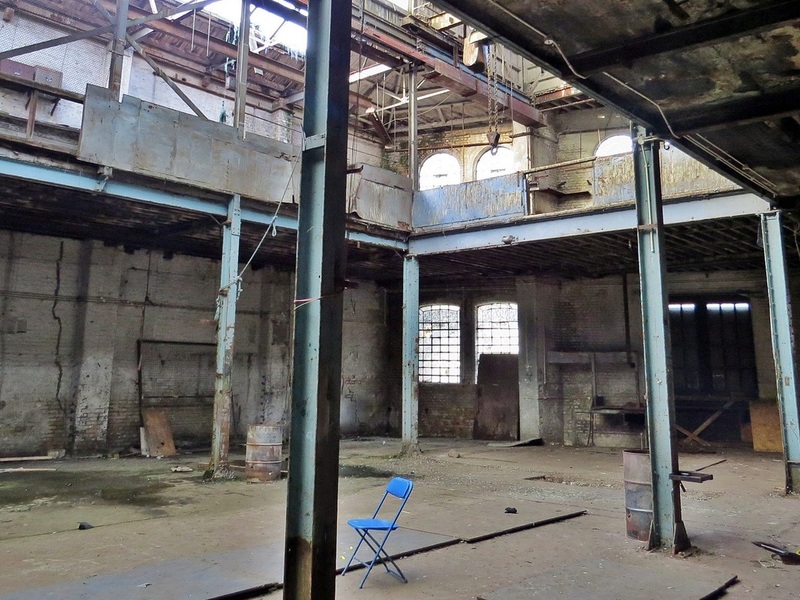 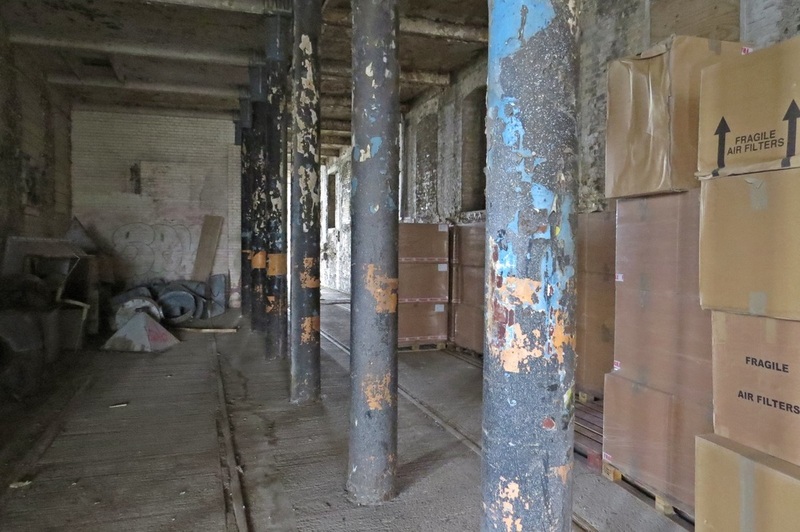 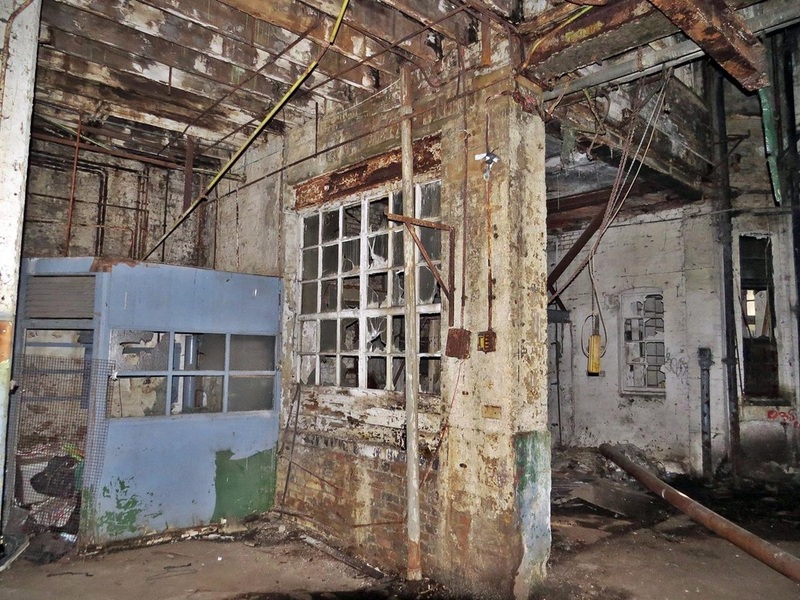 The development will preserve a docks-era Grade II-listed rum warehouse, which will be retained and converted into restaurants, cafés and small offices. Purchased from a farmer in 1908 this factory building was erected the following year. The original purpose of the factory was to produce Orchestrelle organ players - a reed organ constructed on the principle of the mechanical player piano and designed to imitate the effect of an orchestra. 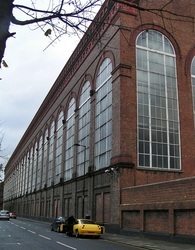 Aeolian also had a manufacturing plant in Gotha, Germany. 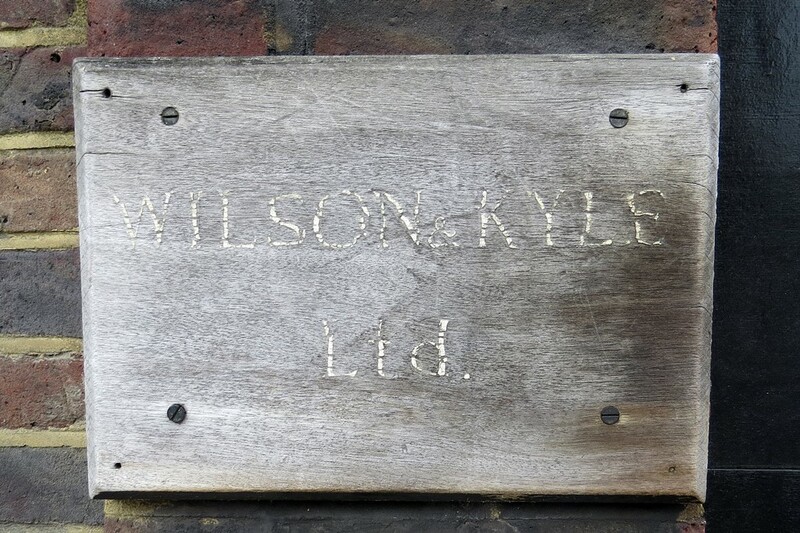 In 1912, the Orchestrelle Company was transformed into a public limited company registered in Britain, and after the Great War it expanded considerably, By 1920 it had effectively changed its name to Aeolian, in line with the American parent company. 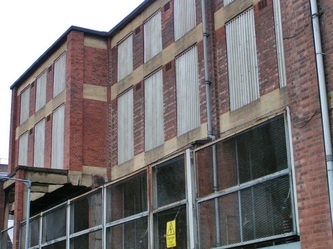 A perforated music roll factory was erected in 1910, and a six-storey building and was built at in rear in 1920 to accommodate a piano factory.These buildings were demolished in 1977. 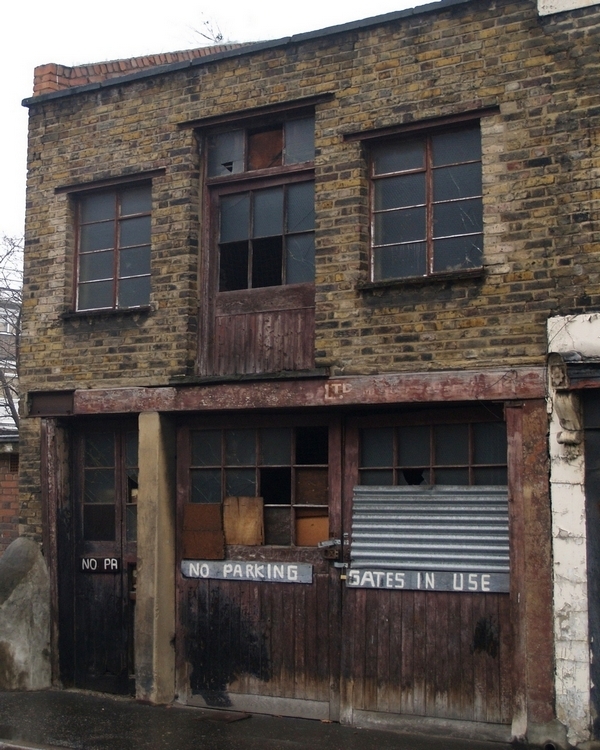 Trade declined in the early 1930s and this original building from 1909 was bought after the Second World War by a property owner named Benny Lowenthal, and he renamed it the Benlow Works after himself.Over the years Kraft Cheese and Walls Sausages and Meat Pies used the premises. 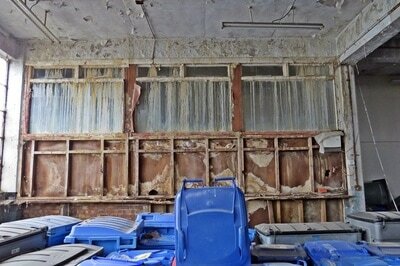 Today this Edwardian Grade II listed building looks a sorry unloved state with many broken and boarded up windows. 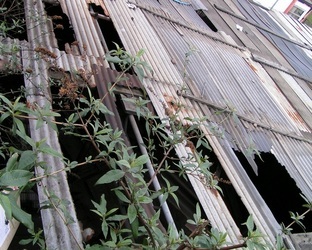 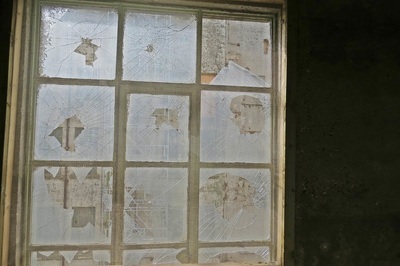 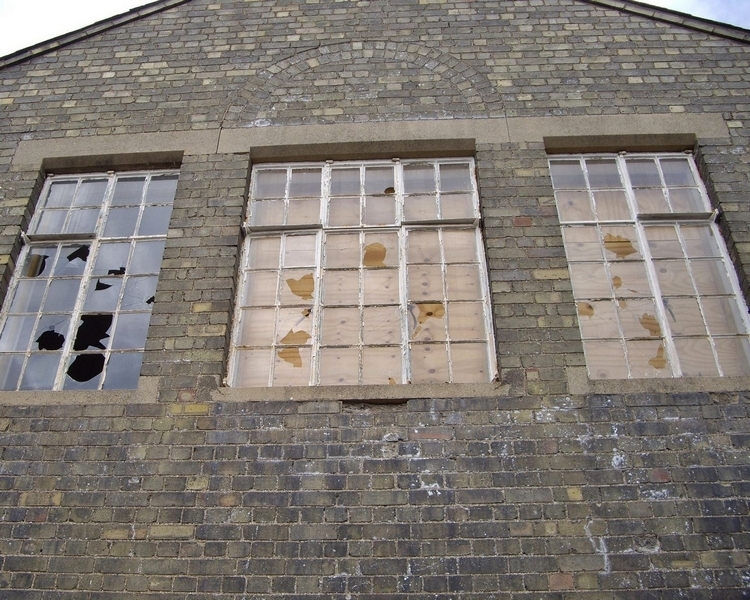 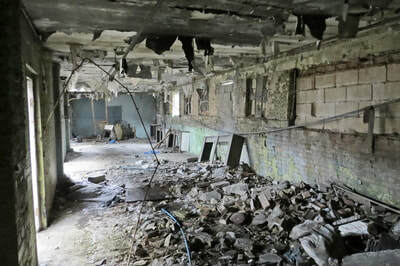 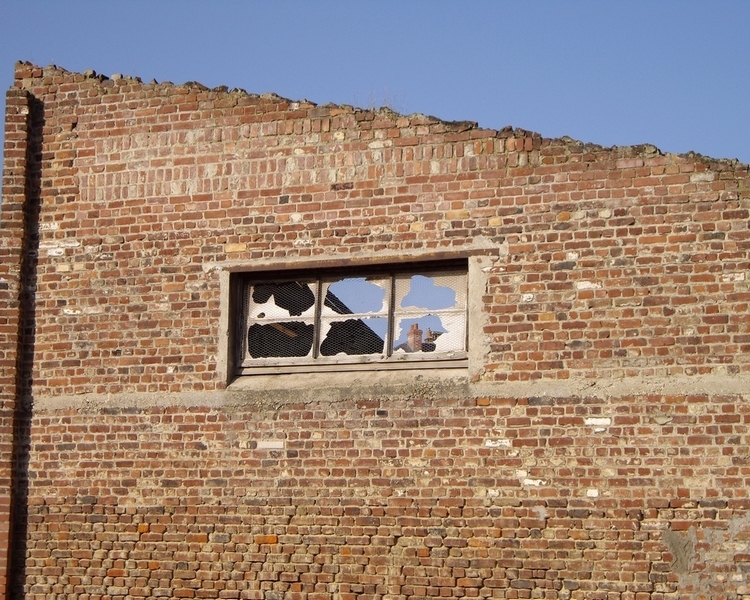 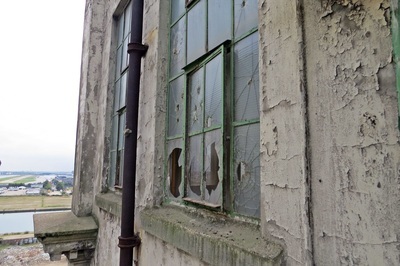 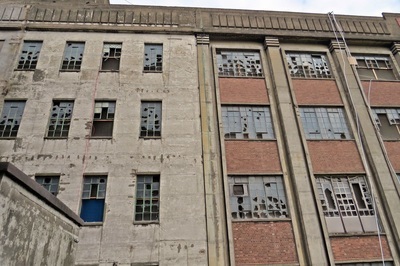 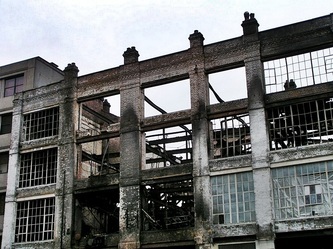 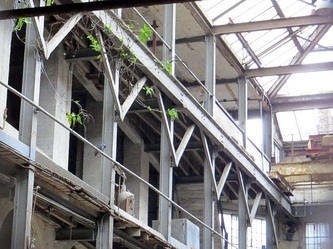 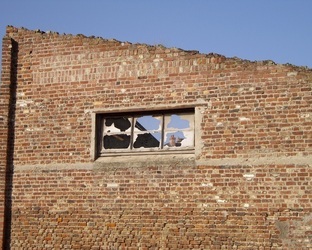 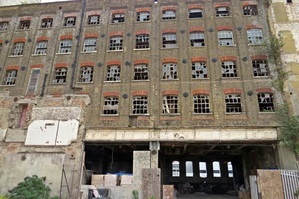 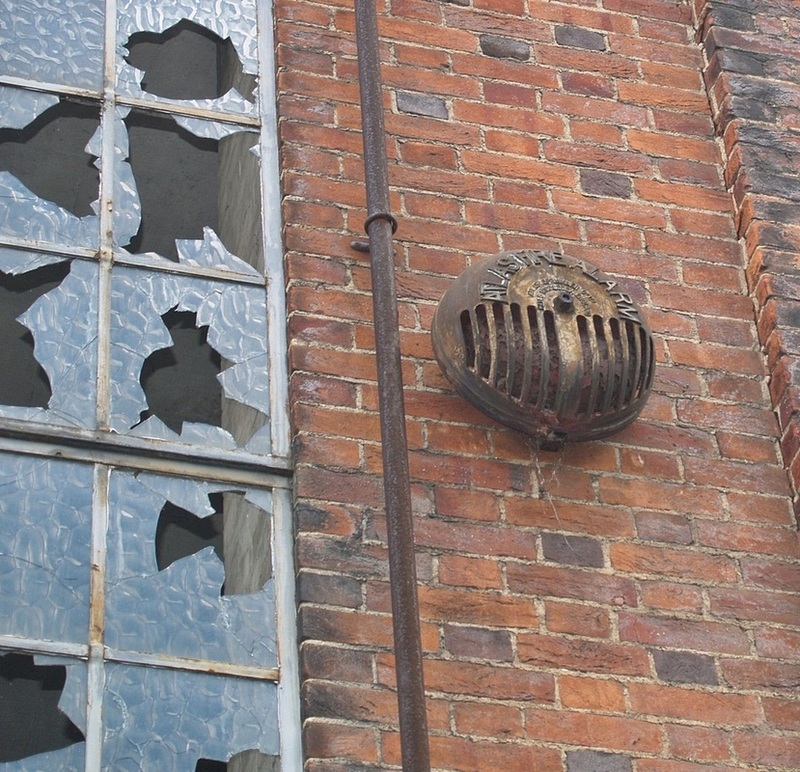 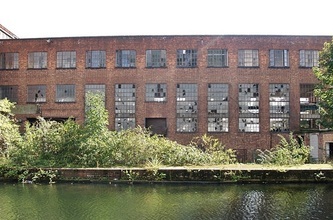 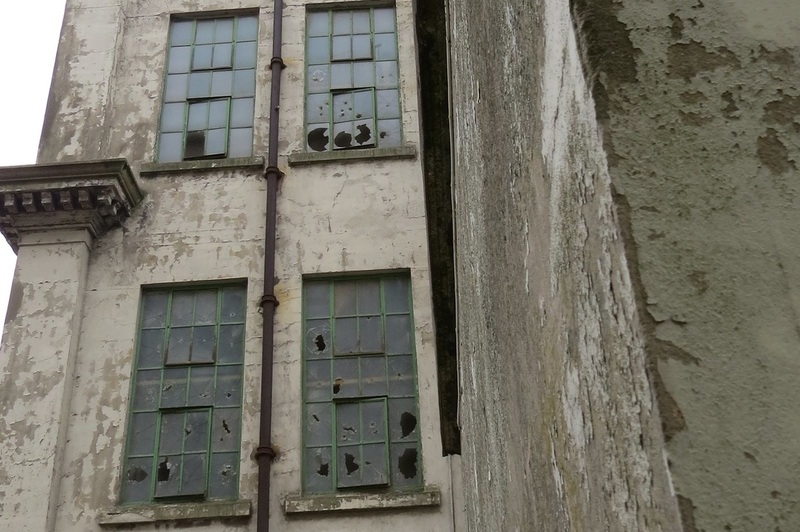 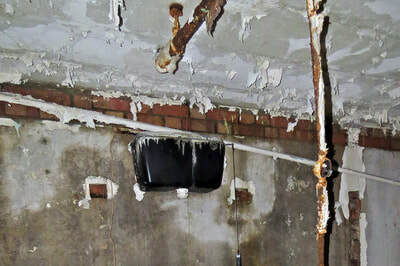 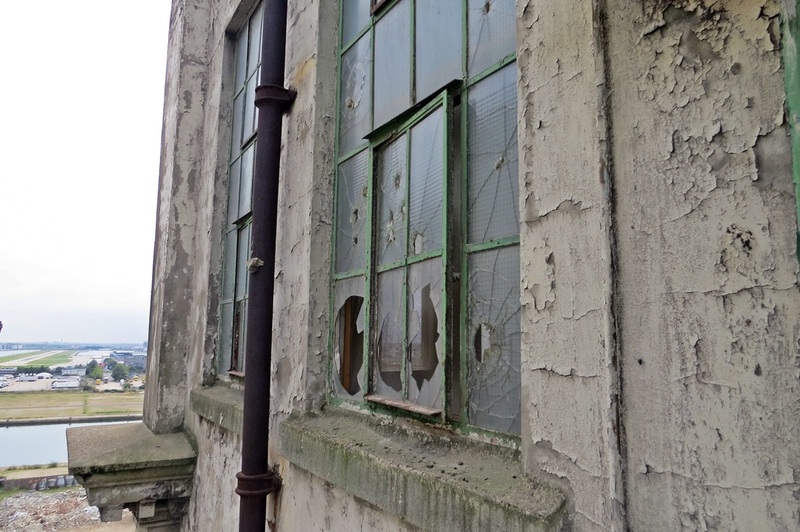 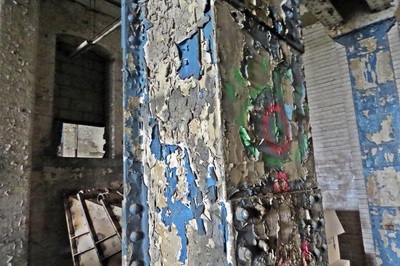 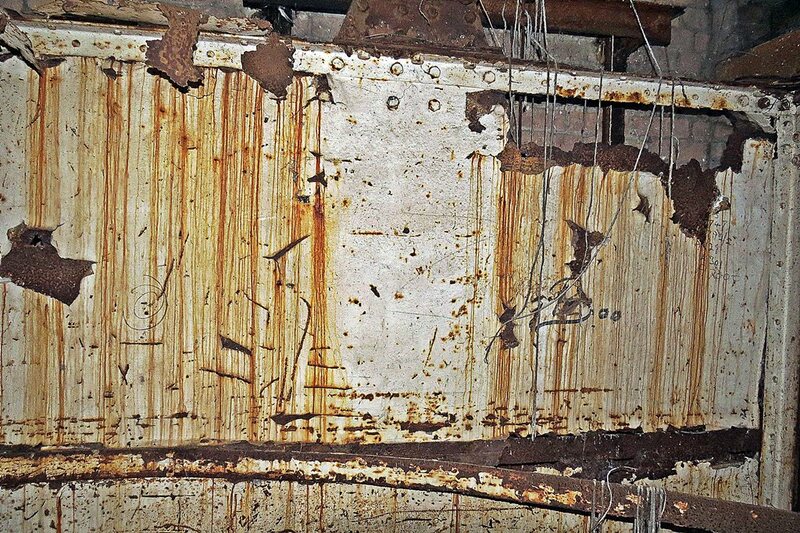 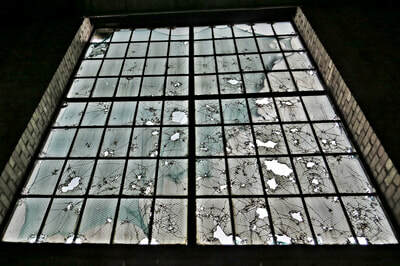 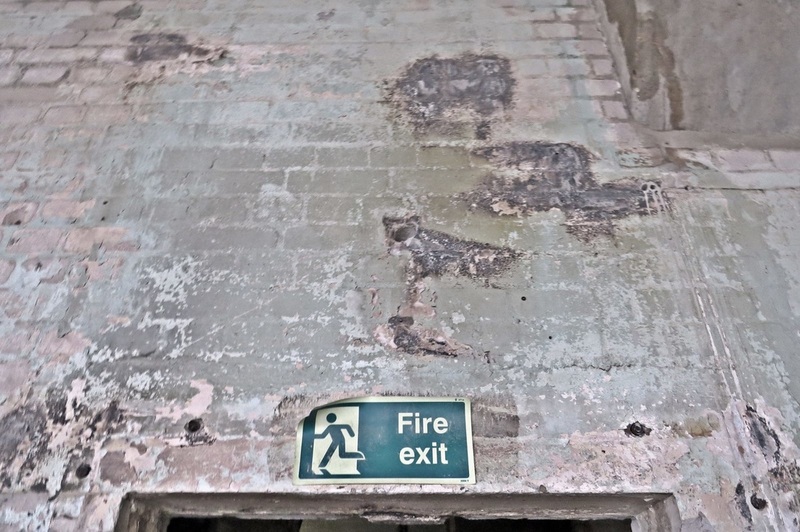 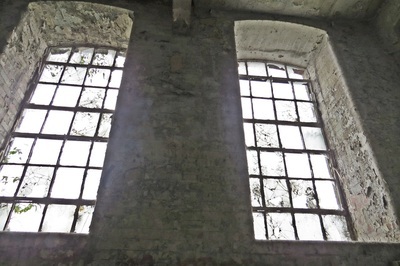 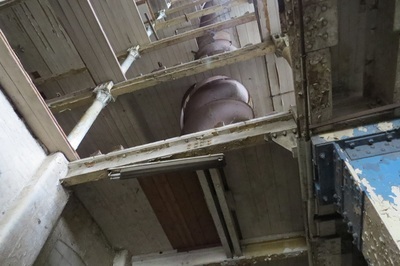 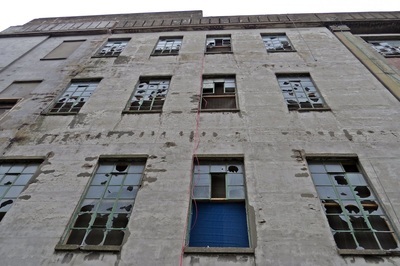 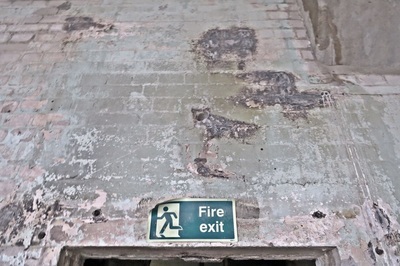 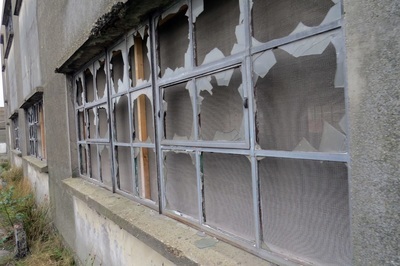 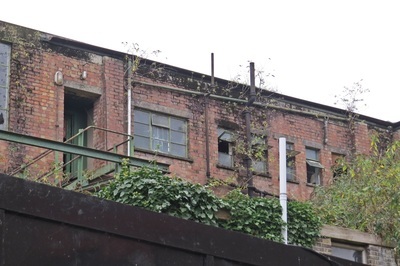 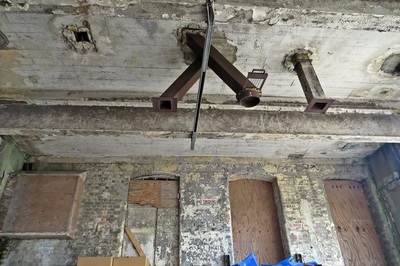 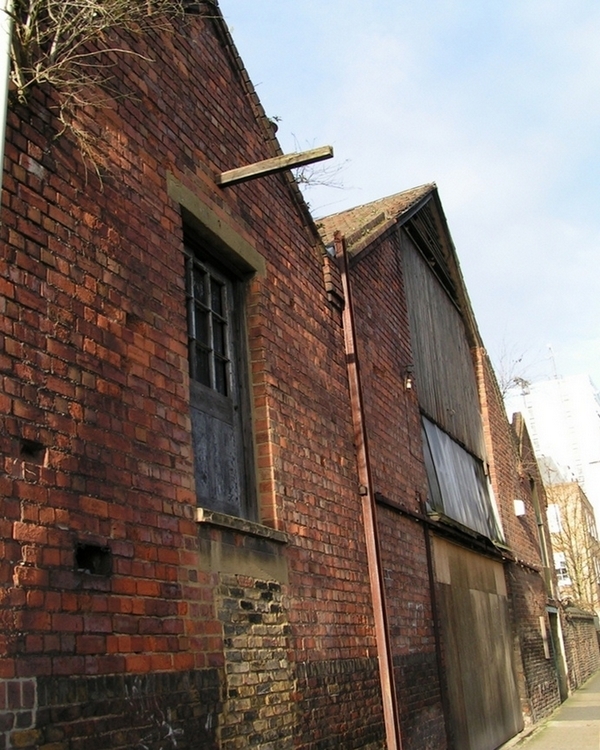 Partially derelict, there are some parts of the building still in use by a sheet metal works.According to English Heritage, recent temporary repairs have been undertaken by the owner, so that the building is in a weather tight condition but no solution has been agreed for future use as yet. 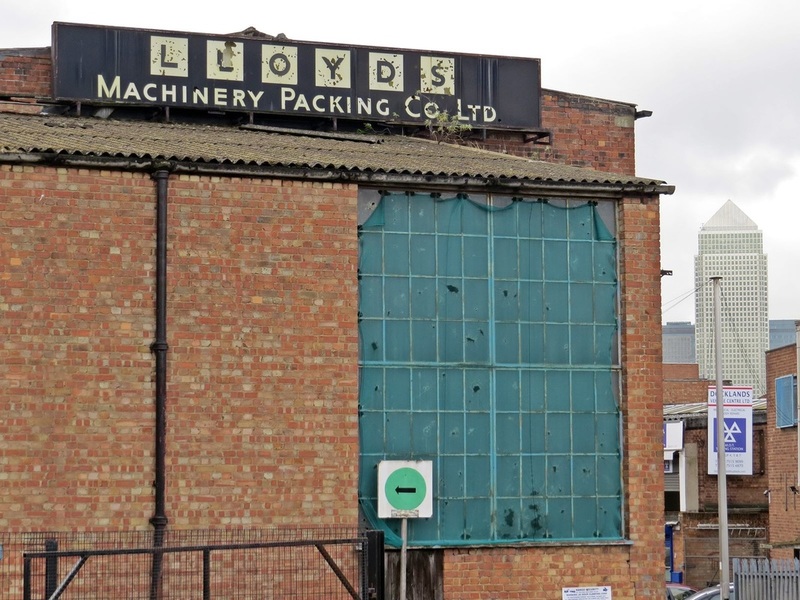 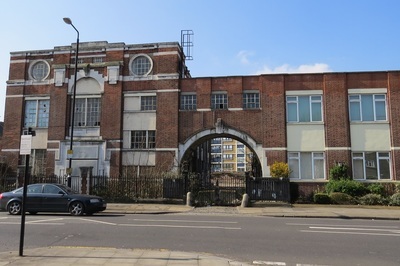 This site in Hayes was created in 1907 for The Gramophone and Typewriter Company, an American manufacturer of the first domestic gramophone players. 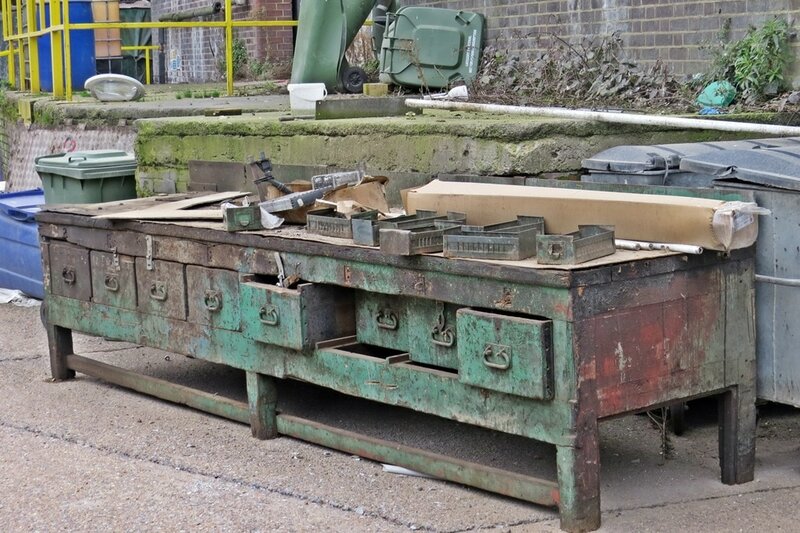 The "record players" in those days were carefully crafted in wooden cabinets. 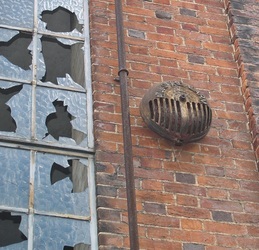 As the company grew it began to press its own records (using a shellac-based compound before vinyl was introduced) and released them under the new label His Master’s Voice (HMV).More buildings were added as manufacturing expanded despite a break during the First World War for munitions production. 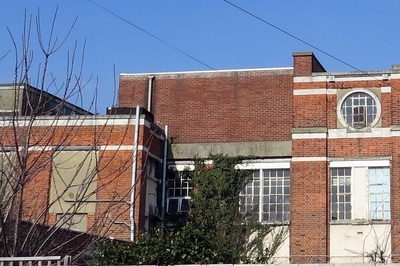 By 1929 the site covered more than 58 acres, with 7,500 people employed there & in 1931 the company merged with the Columbia Graphophone Company, to create Electric and Musical Industries Ltd (EMI).The manufacture of radios, televisions, fridges and other domestic appliances followed plus the world’s first airborne radar system – used to win the Battle of Britain, was developed here.The site was bombed in 1944, killing 37 workers. In 1952 EMI released its first vinyl 33rpm albums as well as 7 inch singles.In 1962 EMI subsidiary Parlophone signed the Beatles whereby all the records were manufactured here by an onsite workforce which totalled 14,000 people. The Rolling Stones, The Beach Boys, Elvis Presley & Cliff Richard were just some of the other acts to have records pressed at this plant. 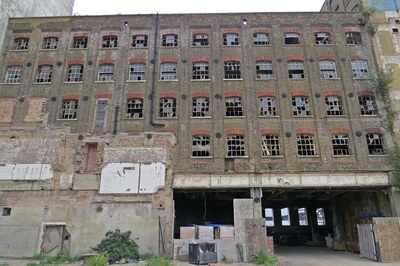 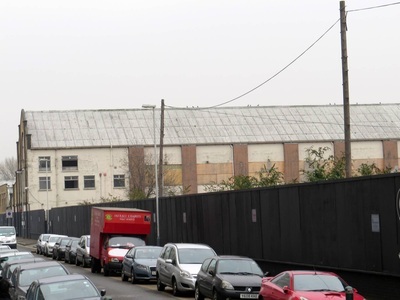 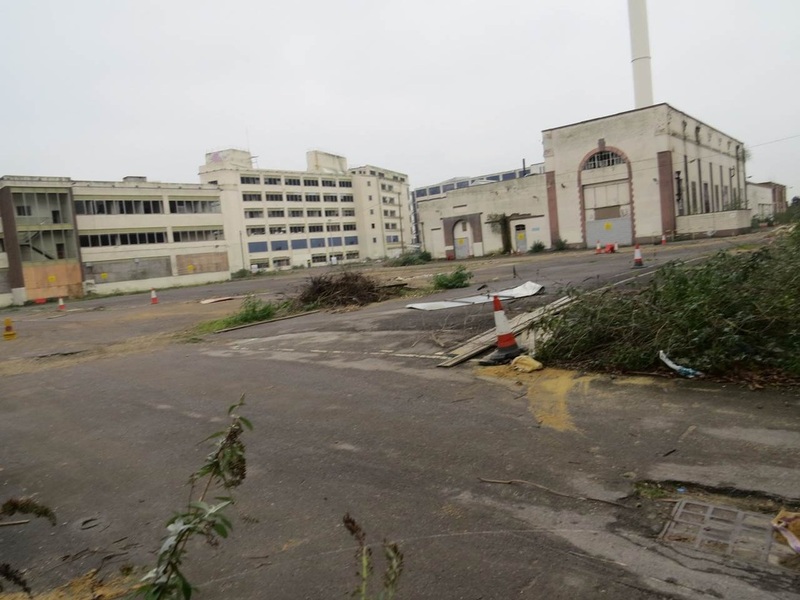 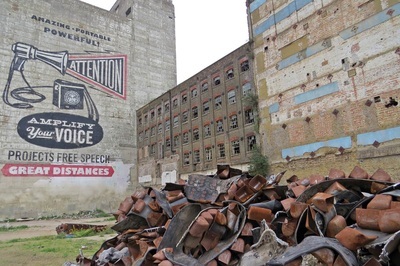 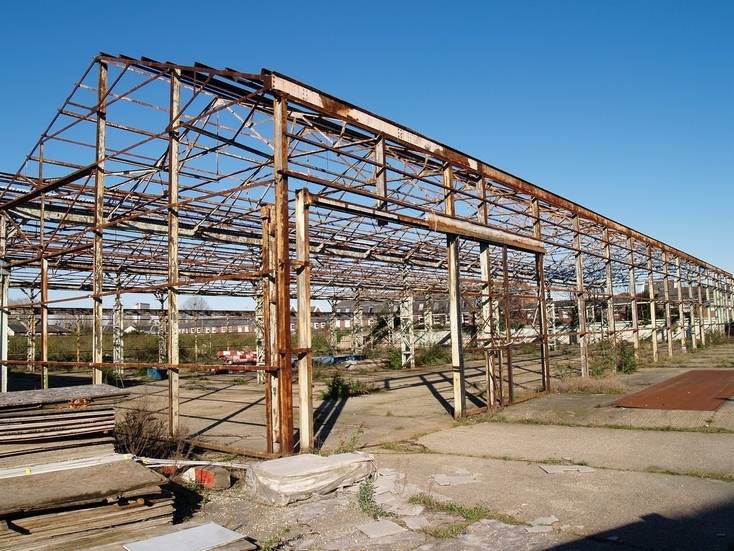 Plans propose to turn the derelict part of the site (pictured here) into a phased £250 million programme to create a mixed-use development - business space, up to 510 new homes, a multiplex cinema, restaurants, cafés and bars, car parking and landscaped public space.Some of the older industrial buildings will be refurbished and brought back into use. 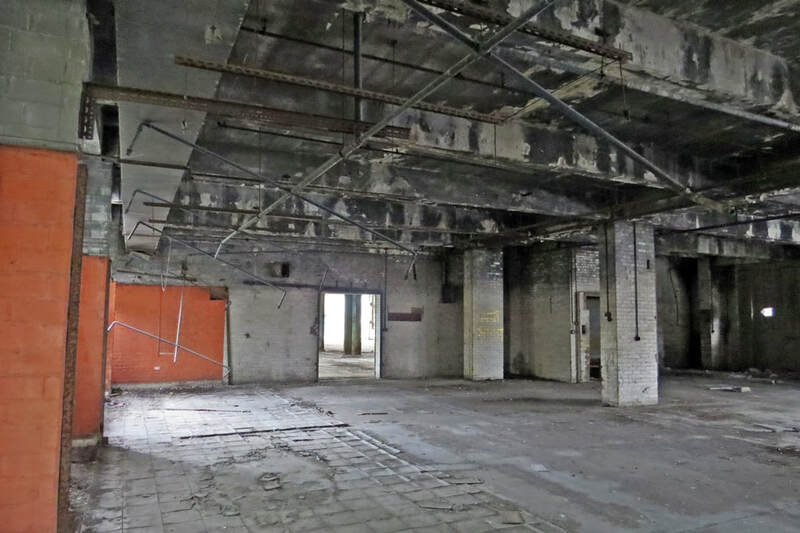 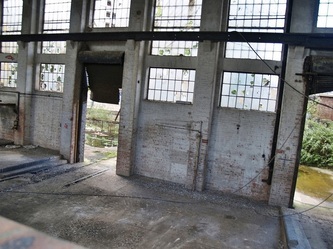 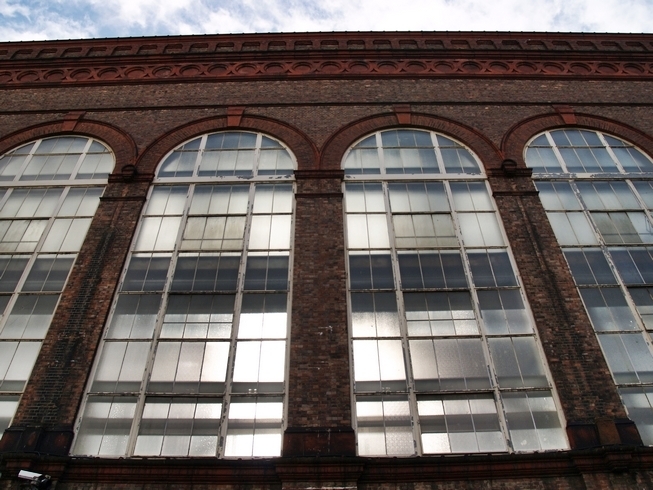 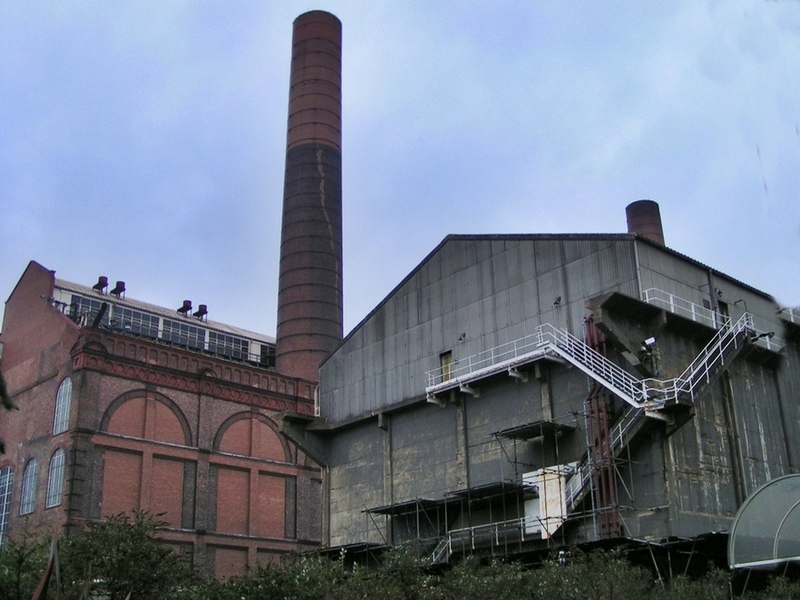 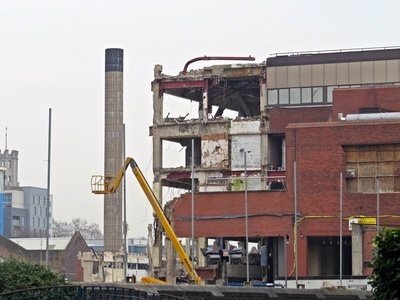 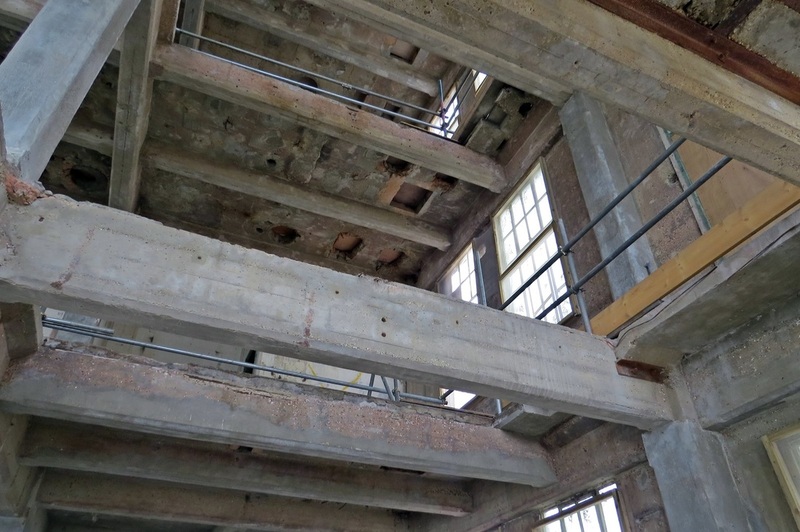 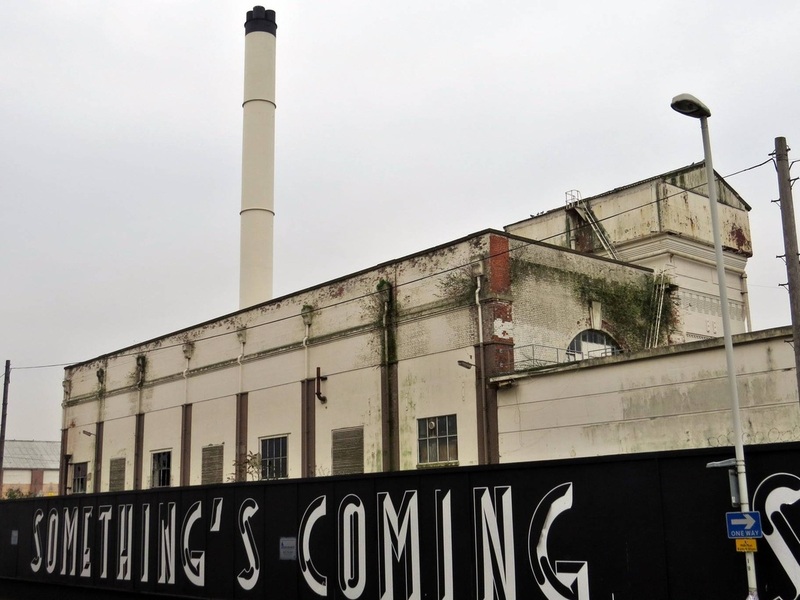 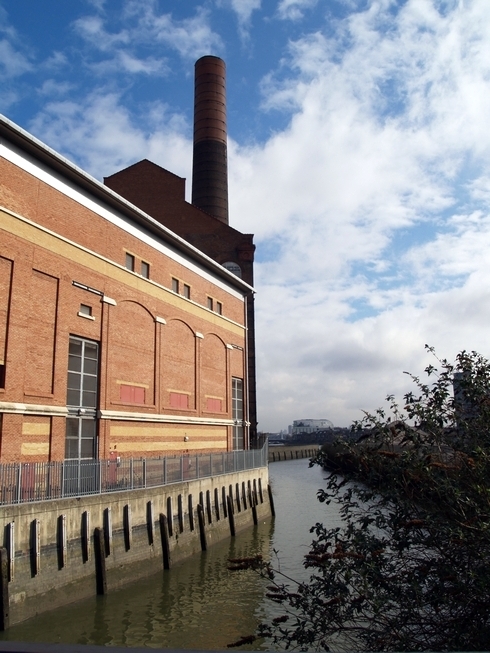 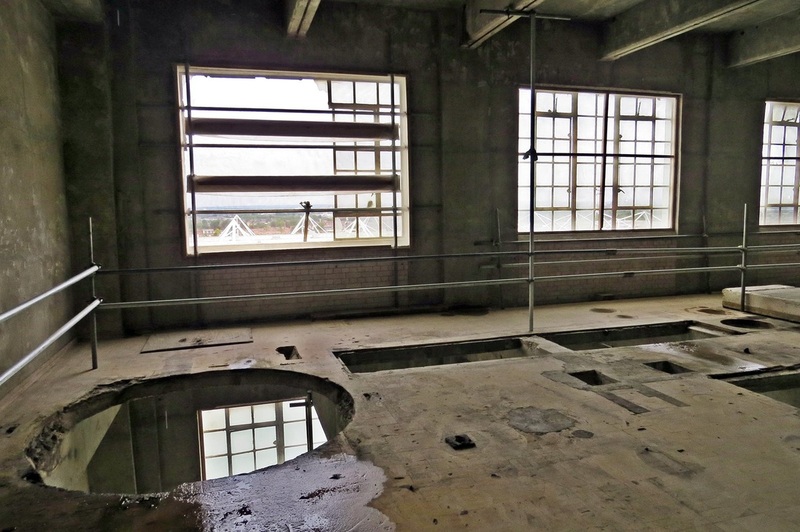 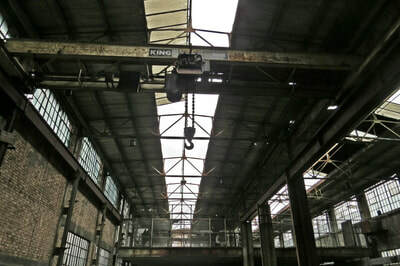 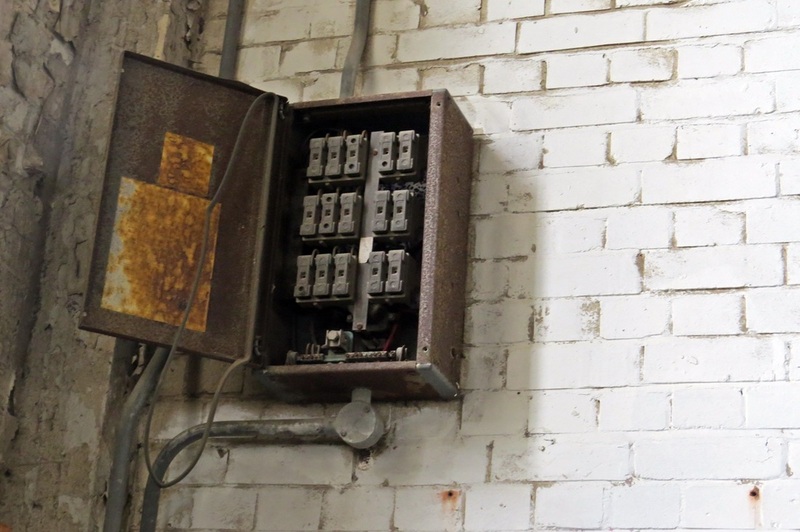 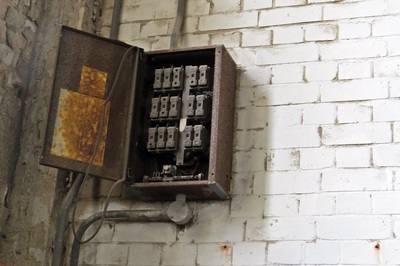 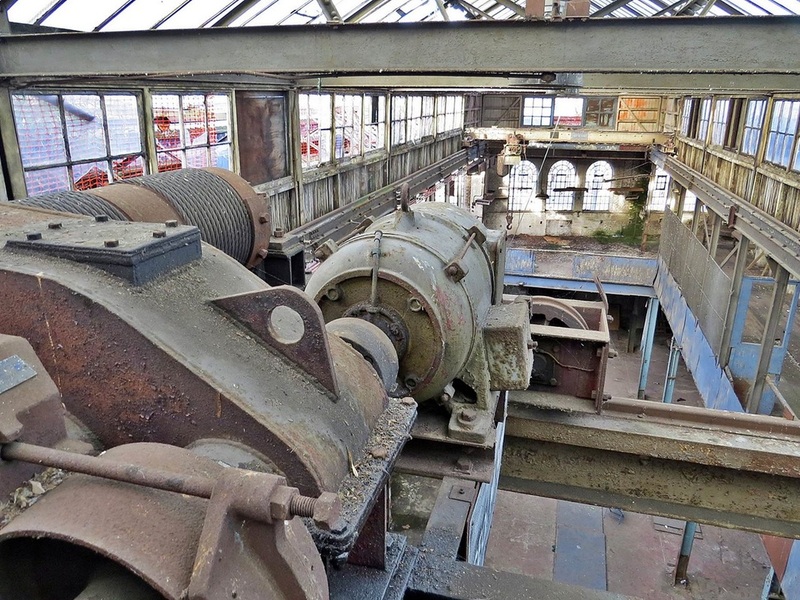 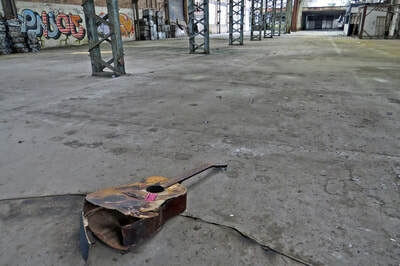 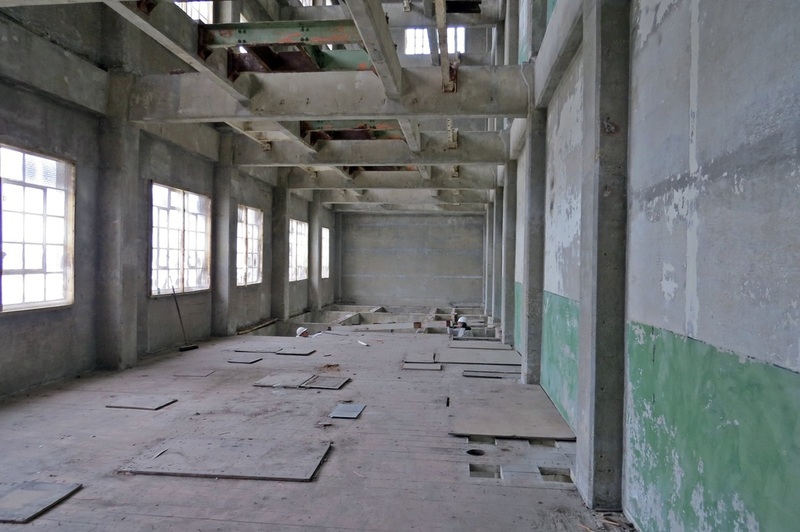 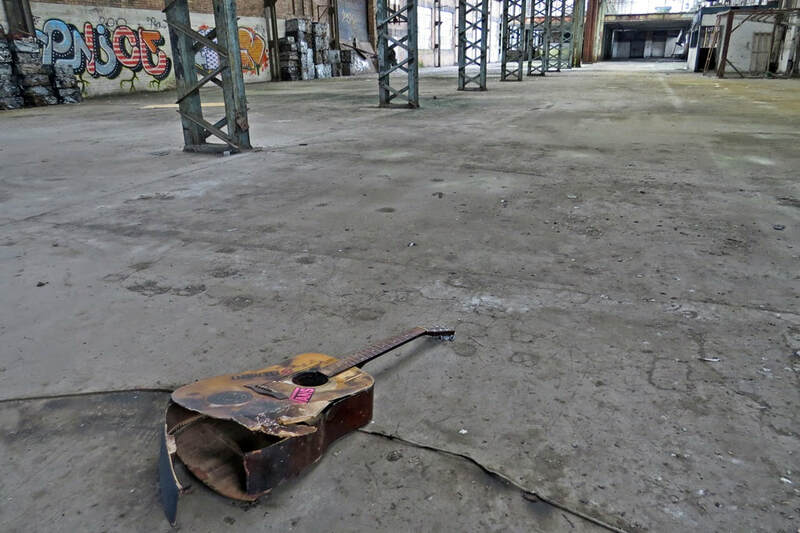 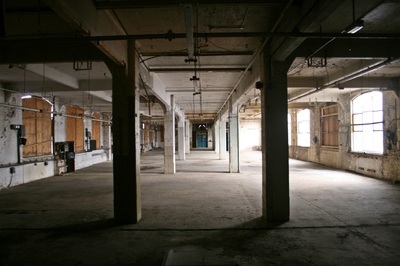 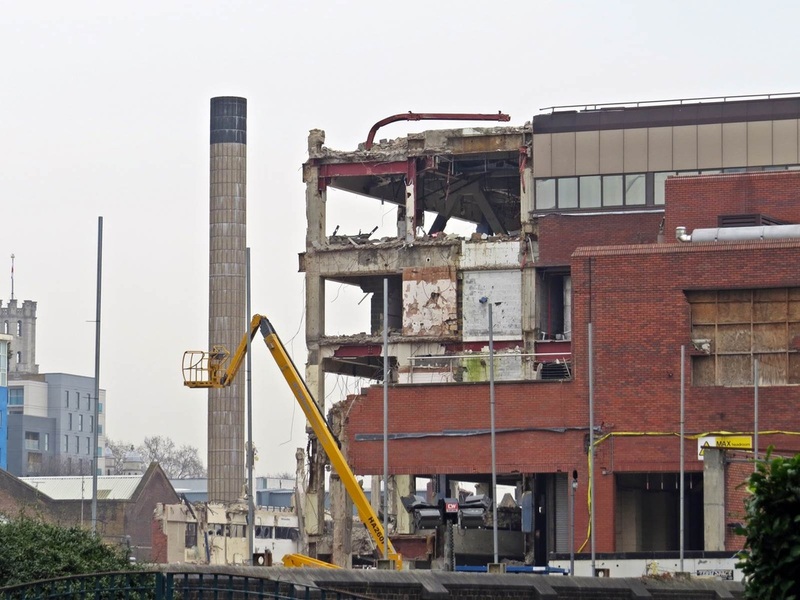 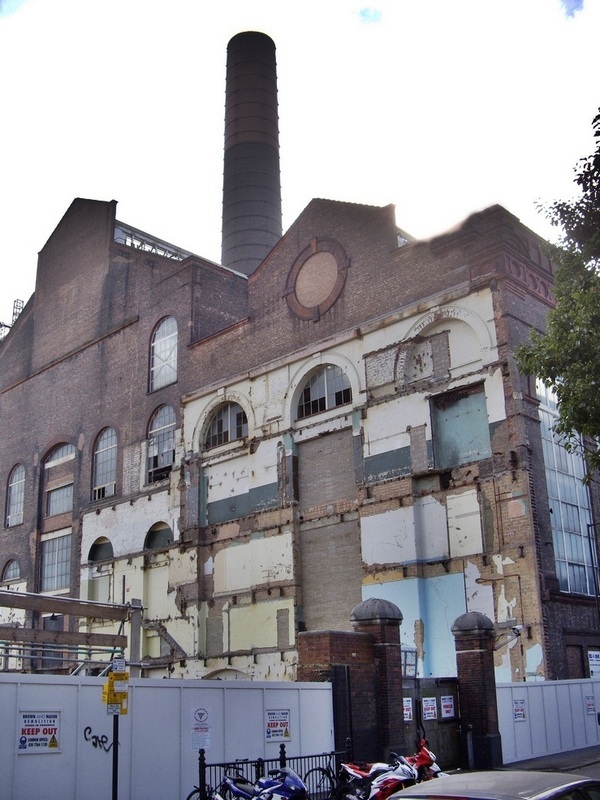 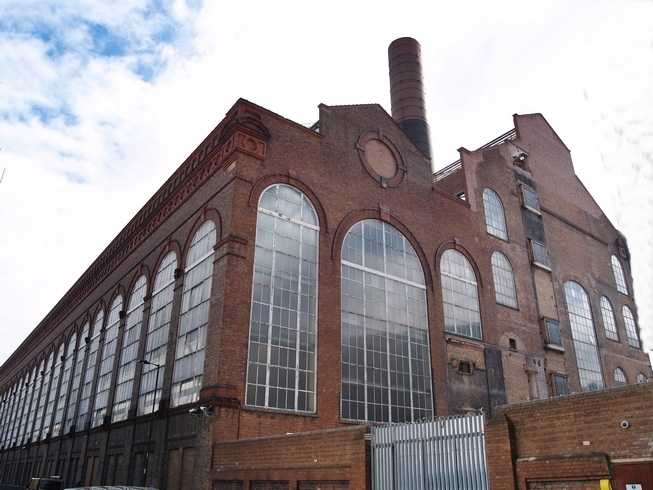 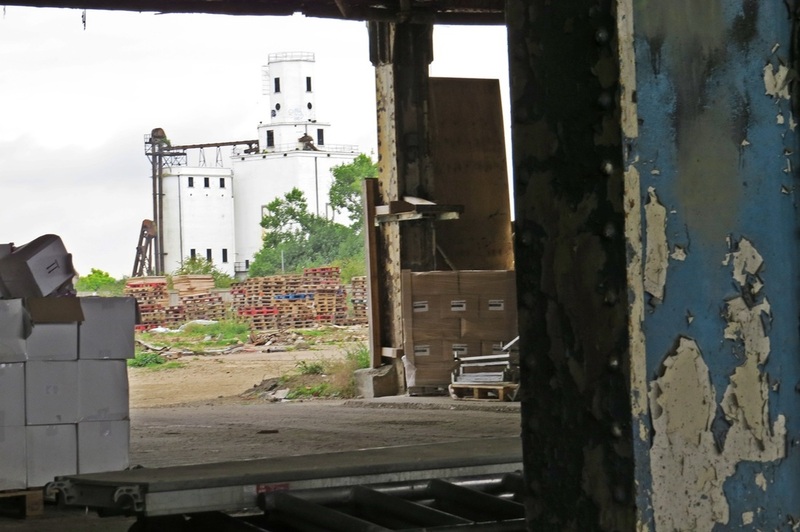 The Powerhouse will become the home of the new combined heat and power scheme for the entire site, and the home of a live music venue and a museum celebrating The Old Vinyl Factory’s industrial and cultural history. 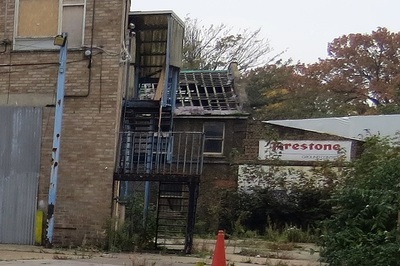 Here are a few pictures of a business park or trading estate ( as we used to call them) that has a few derelict parts, some demolition in process but the majority is still a thriving magnet for industry - a prominent industrial/commercial estate with a bus depot,scaffolders, demolition contractors, skip hire, vehicle salvage and ... a nightclub in one of the warehouses. 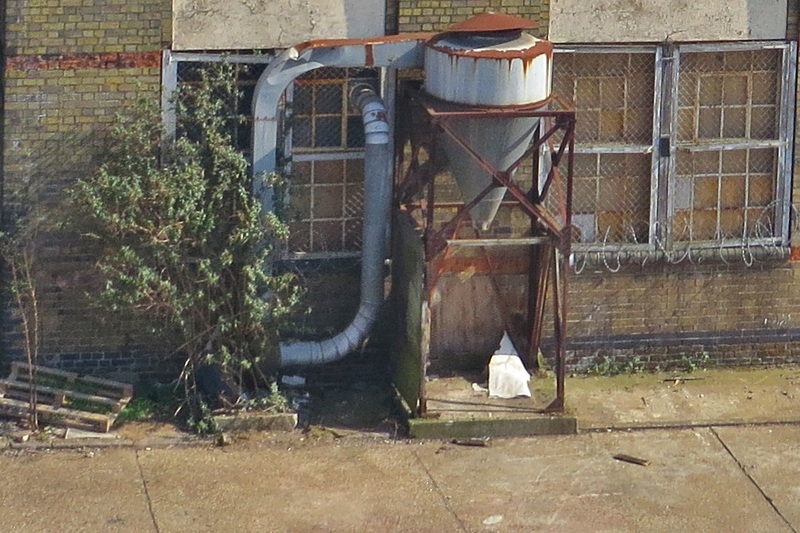 A rare sight so close to Canary Wharf. 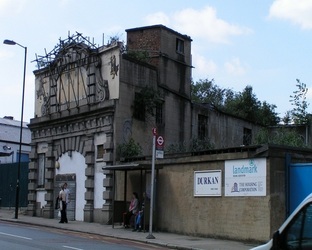 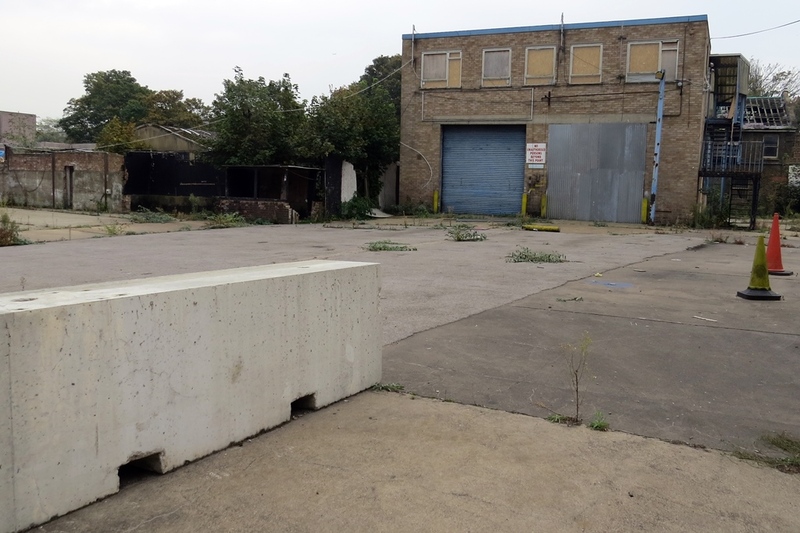 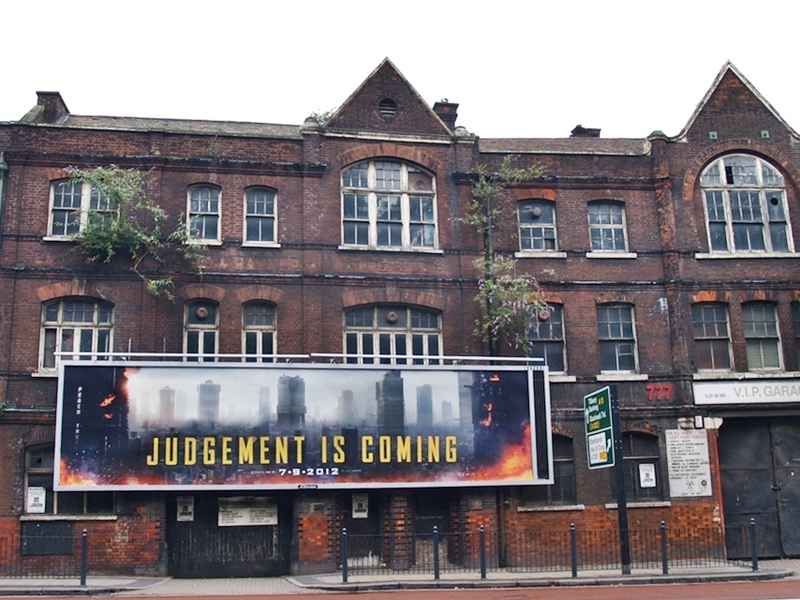 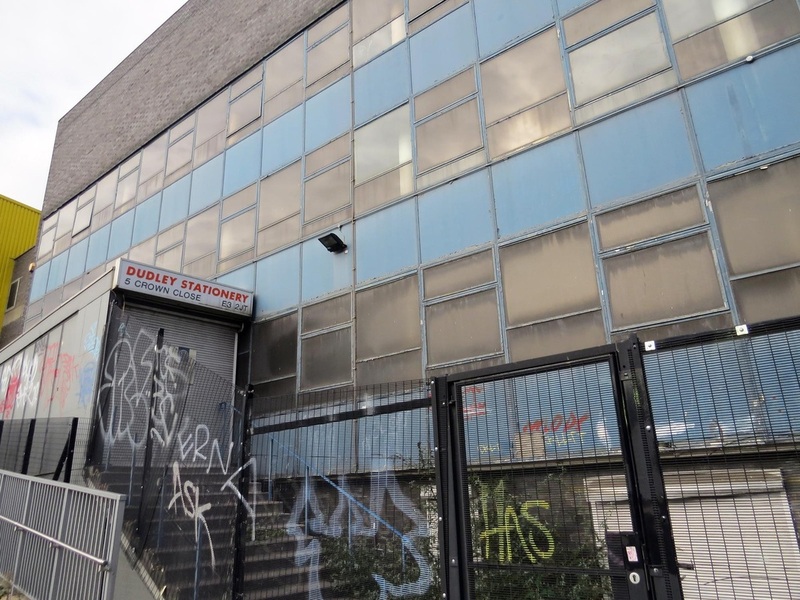 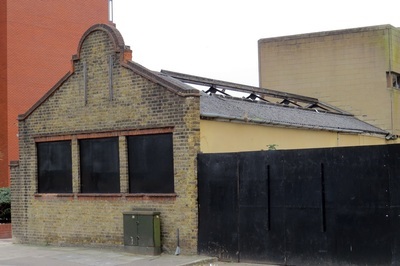 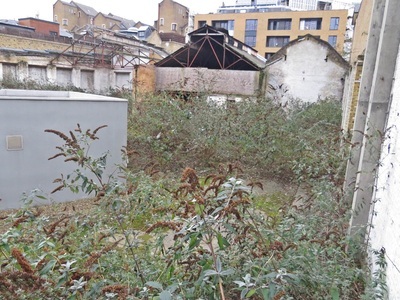 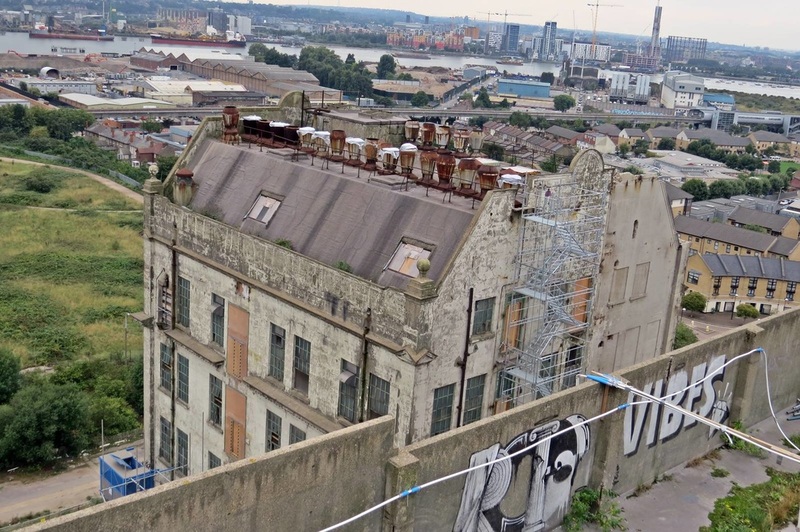 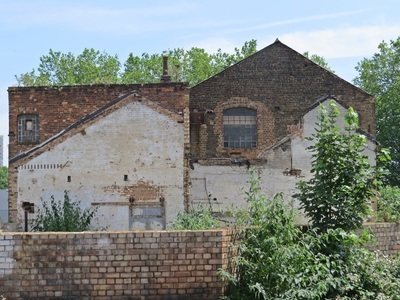 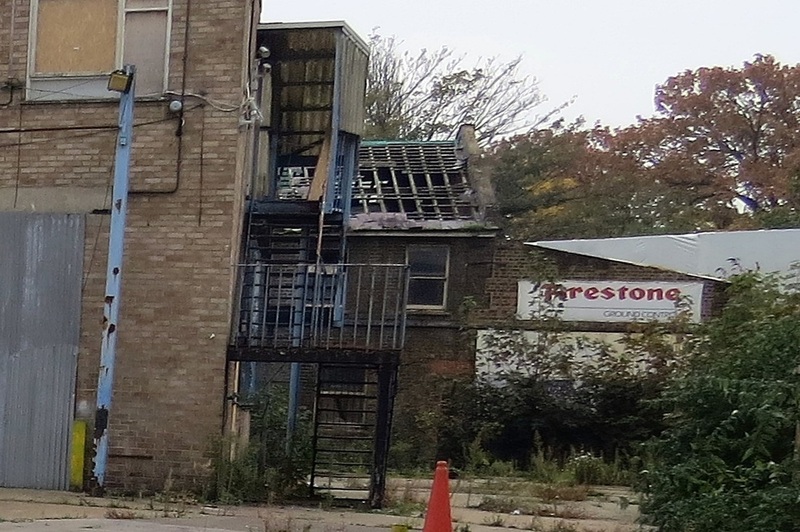 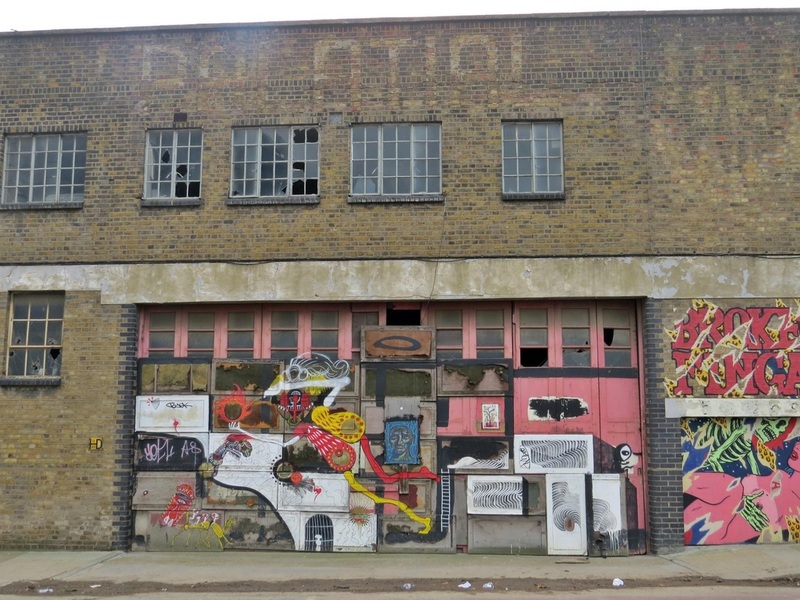 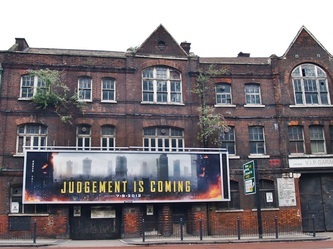 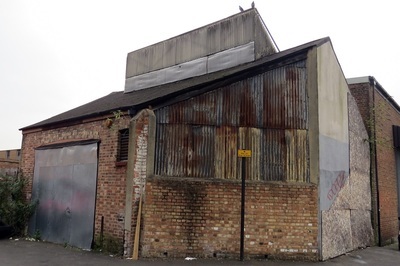 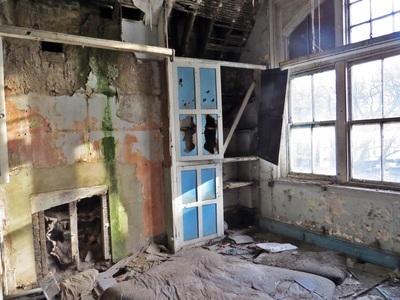 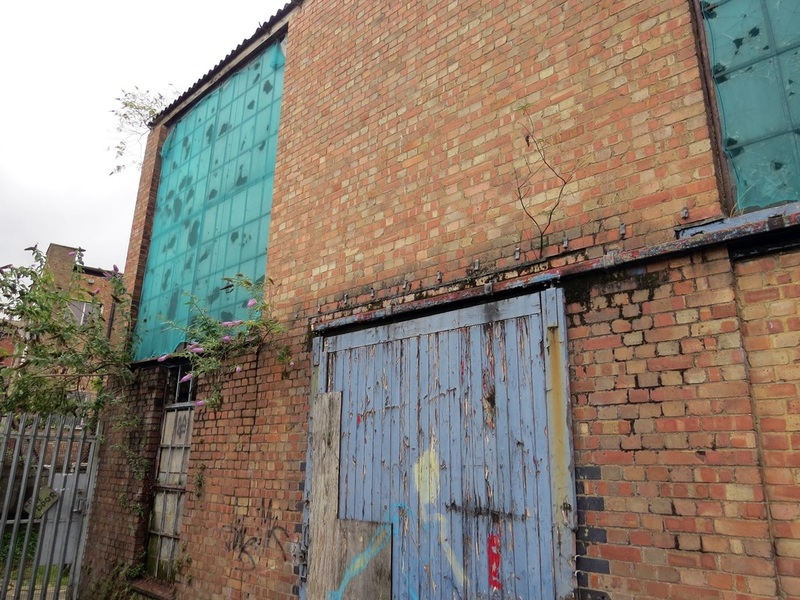 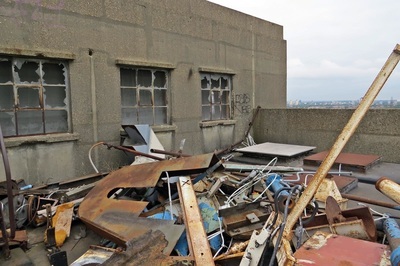 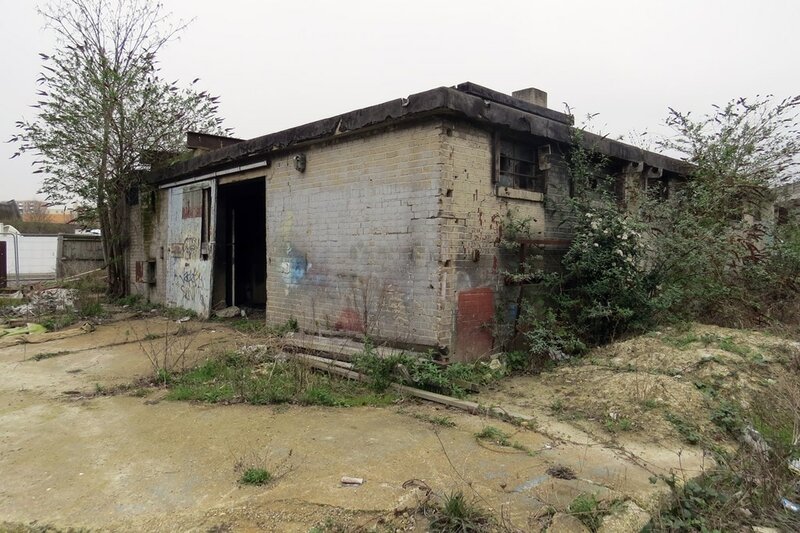 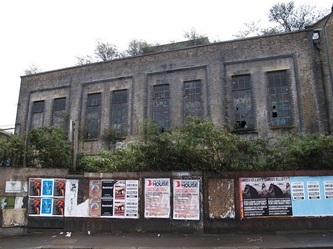 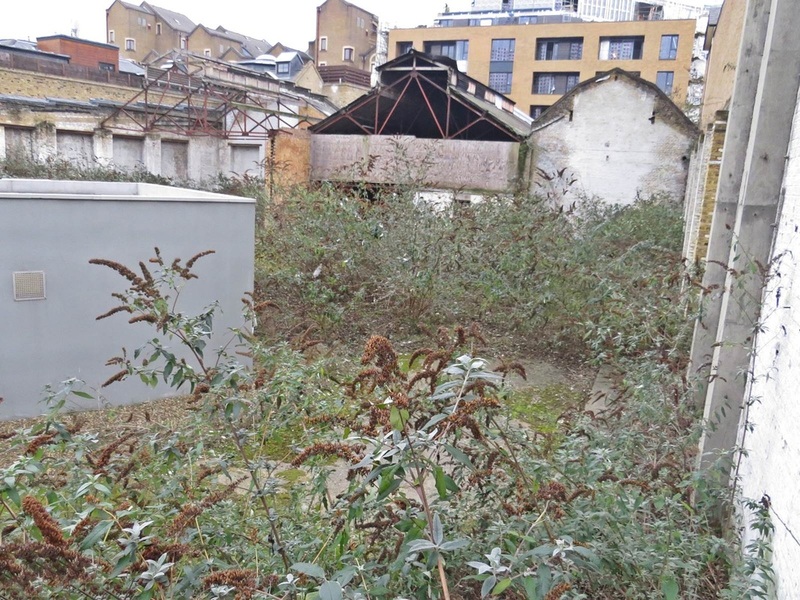 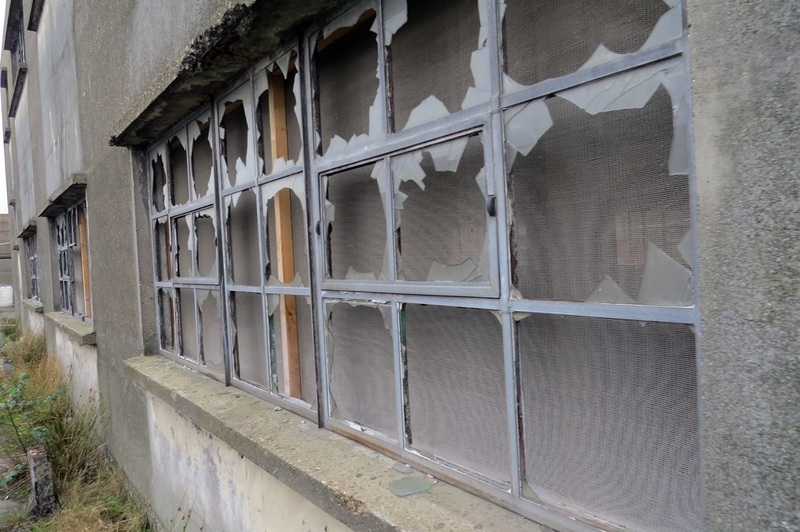 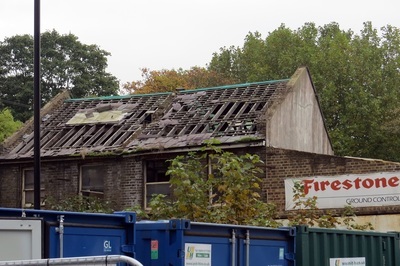 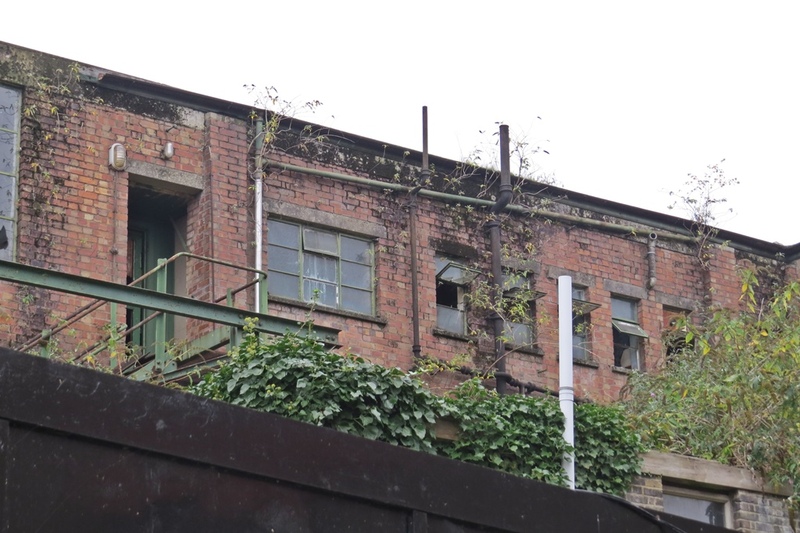 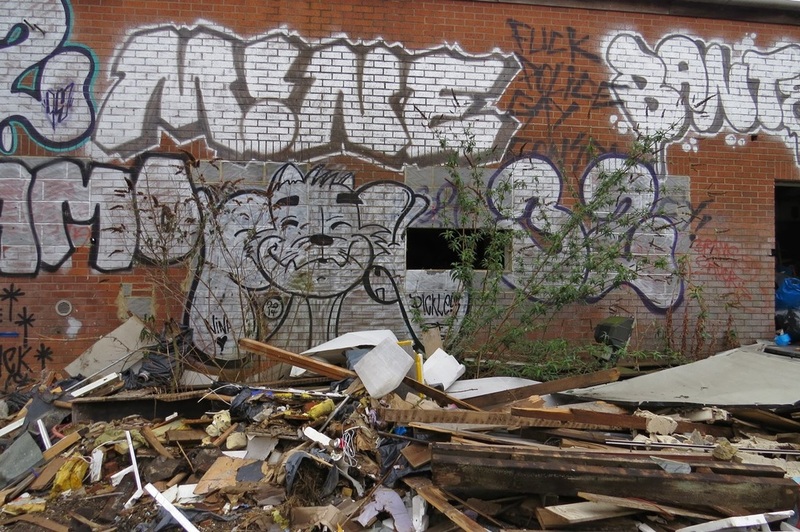 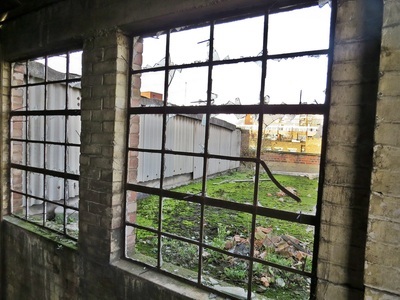 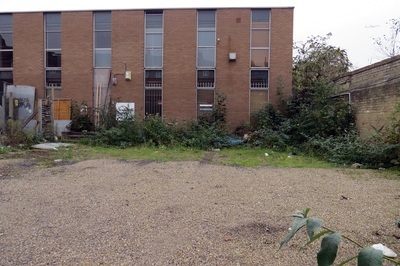 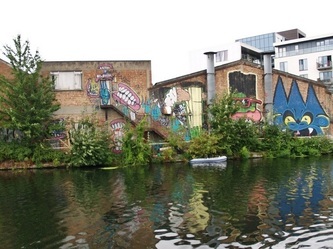 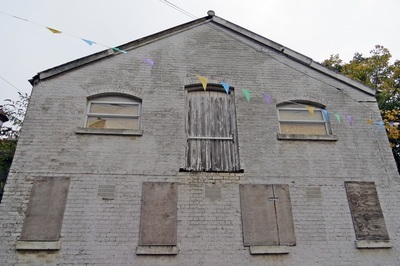 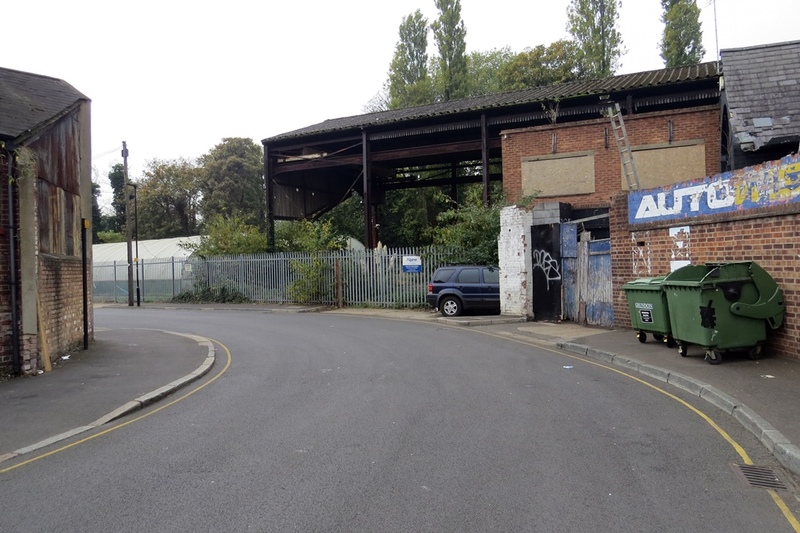 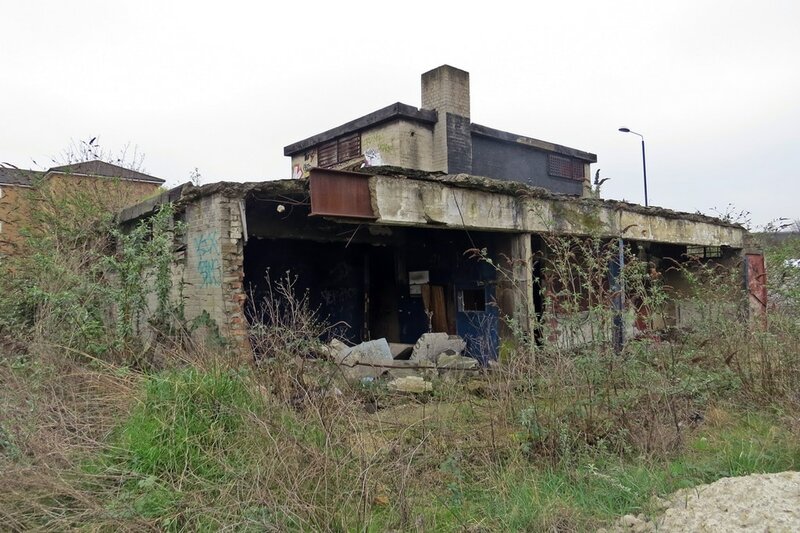 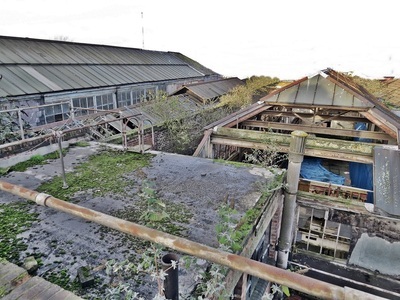 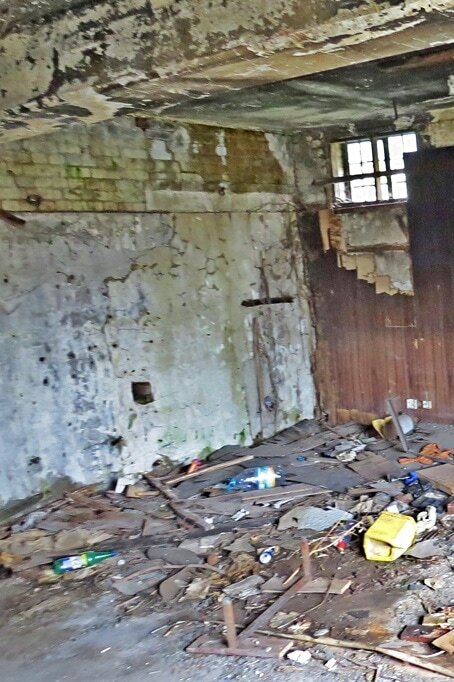 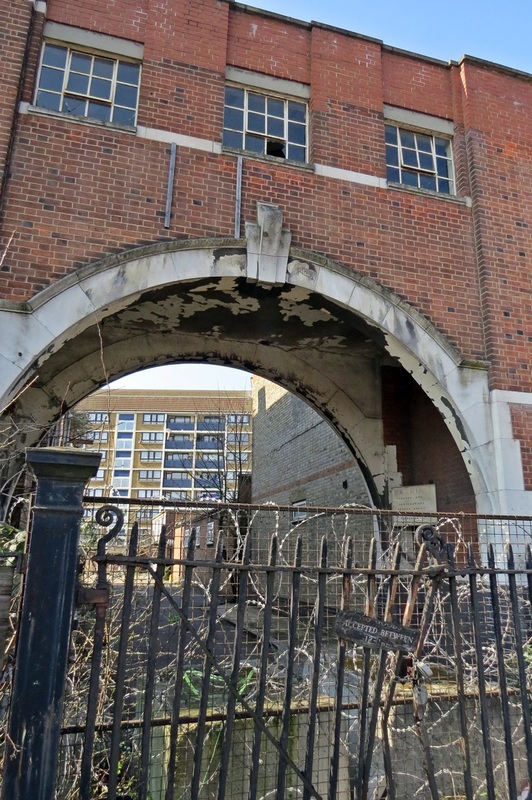 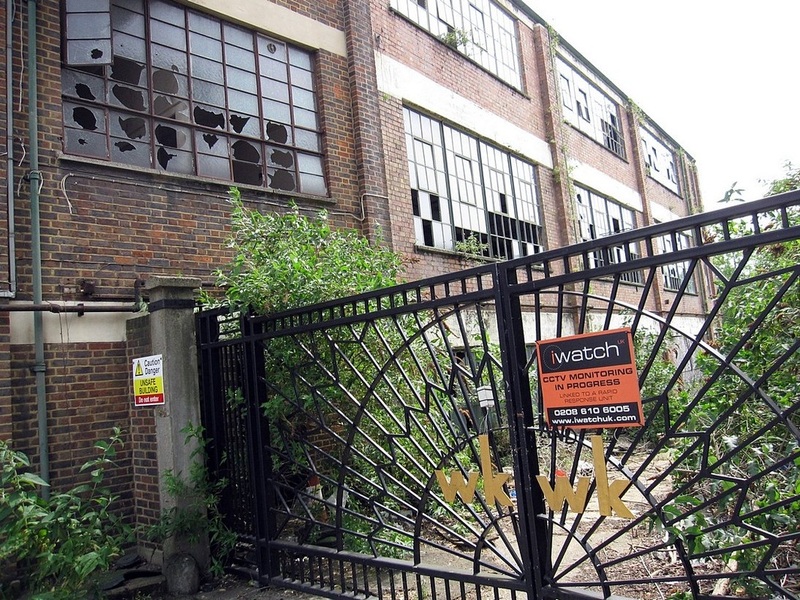 This derelict building and the adjacent plot of wasteland hadn't gone unnoticed and is subject to a planning application for a hi-rise tower block. A few months later this was demolished. 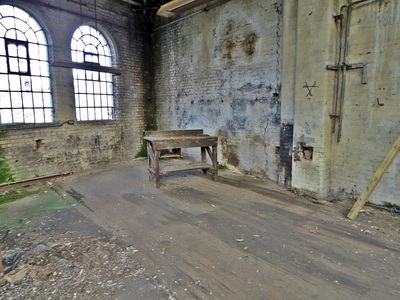 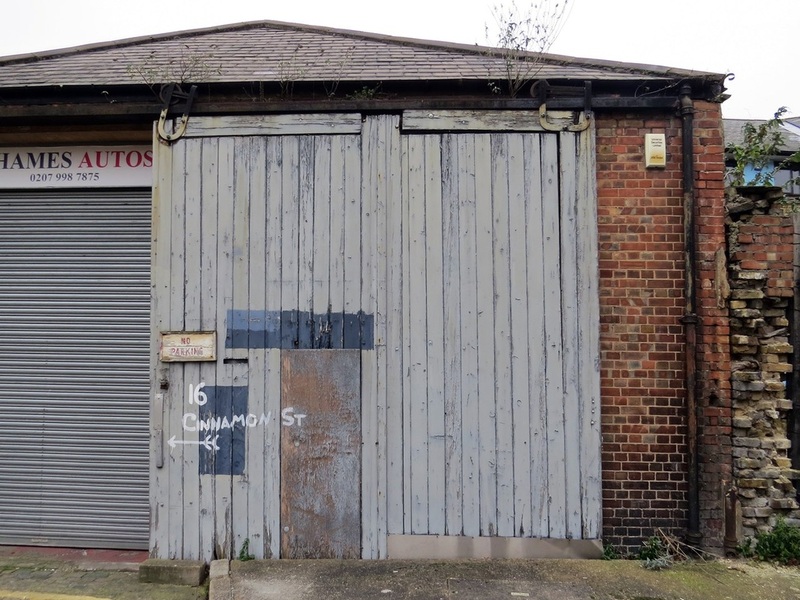 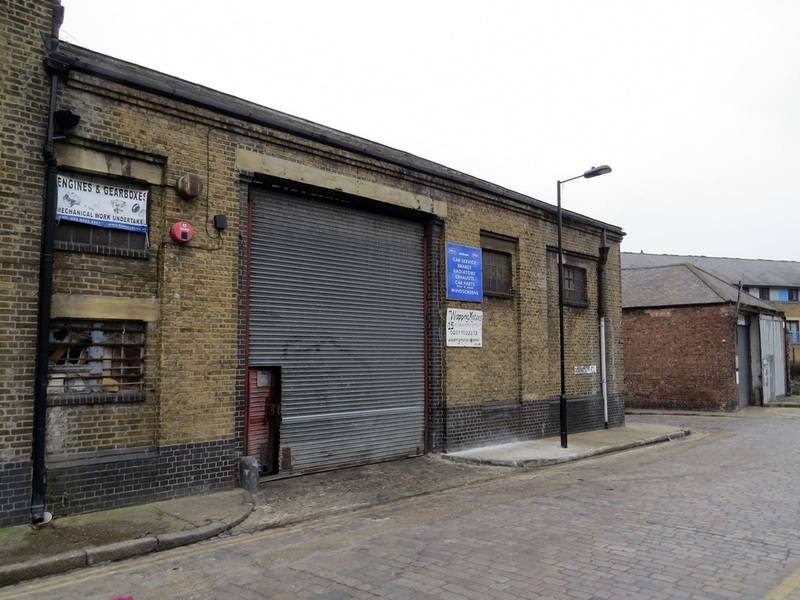 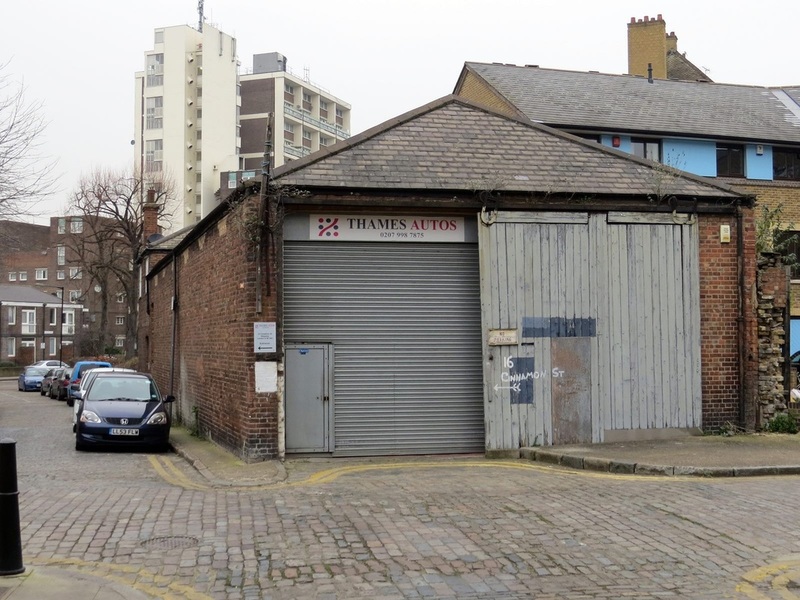 This workshop was built in 1869 as a sail-makers’ and ship-chandlers’ warehouse. 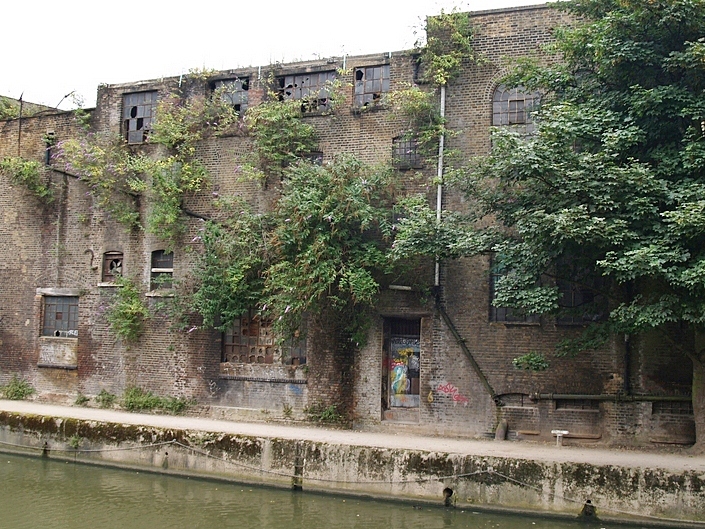 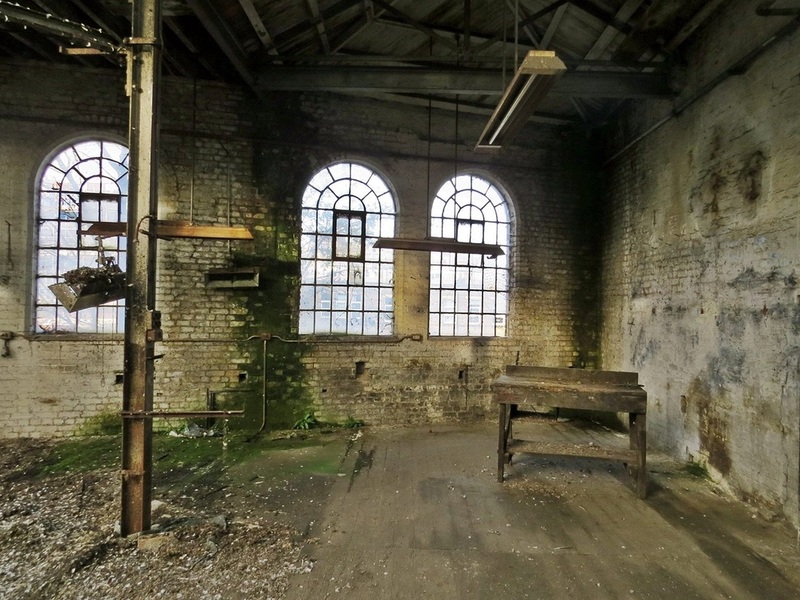 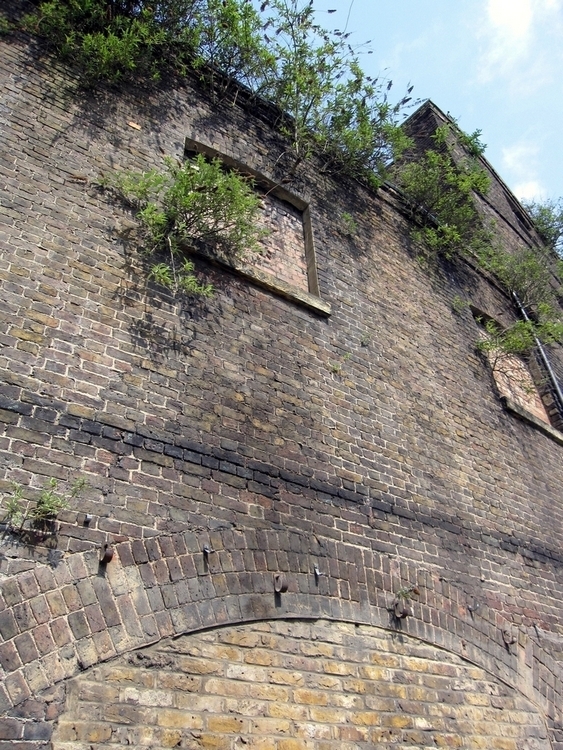 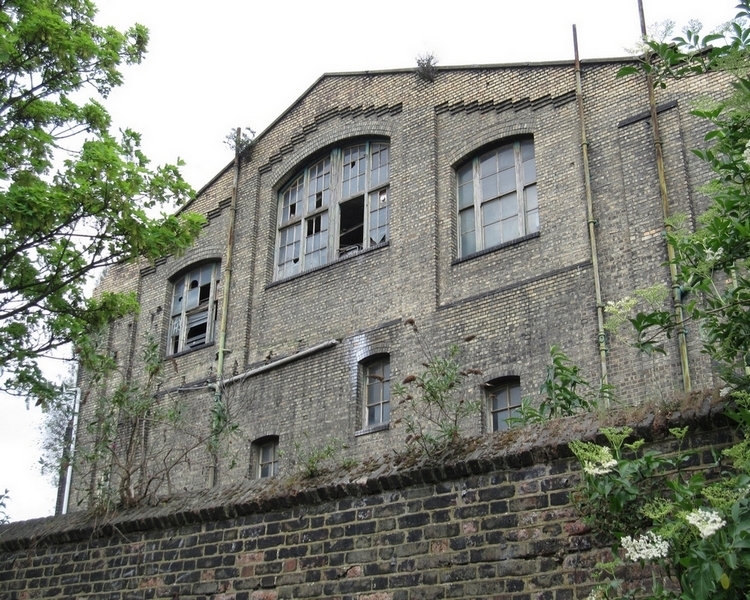 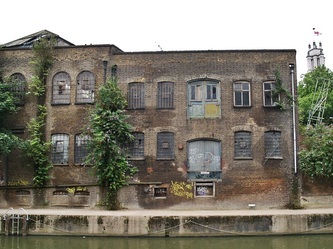 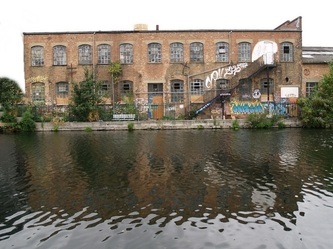 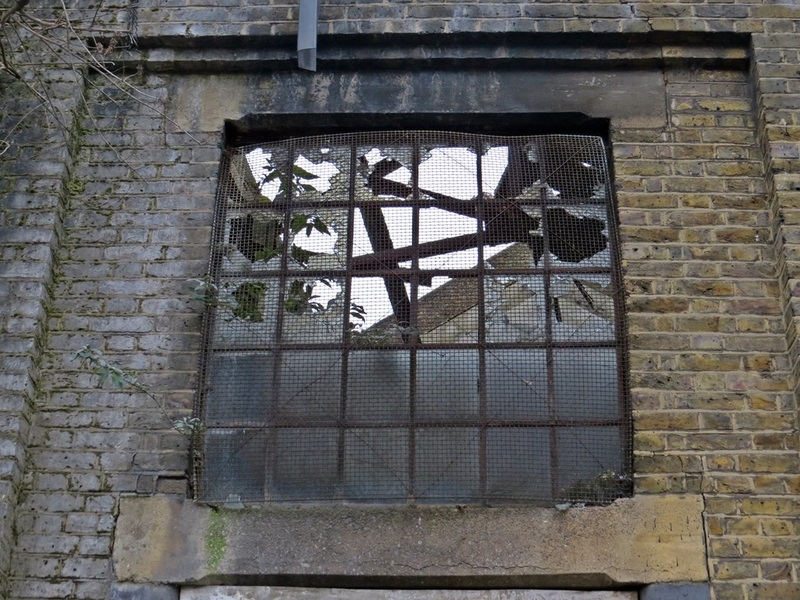 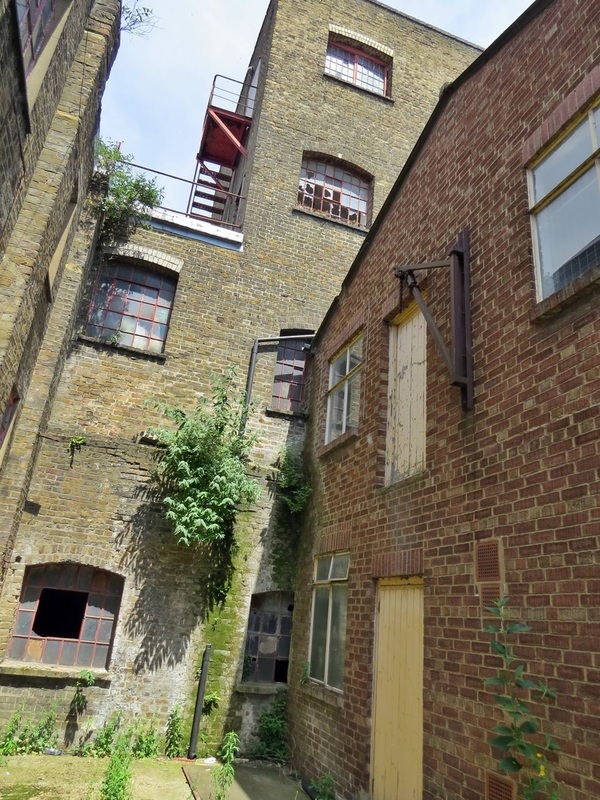 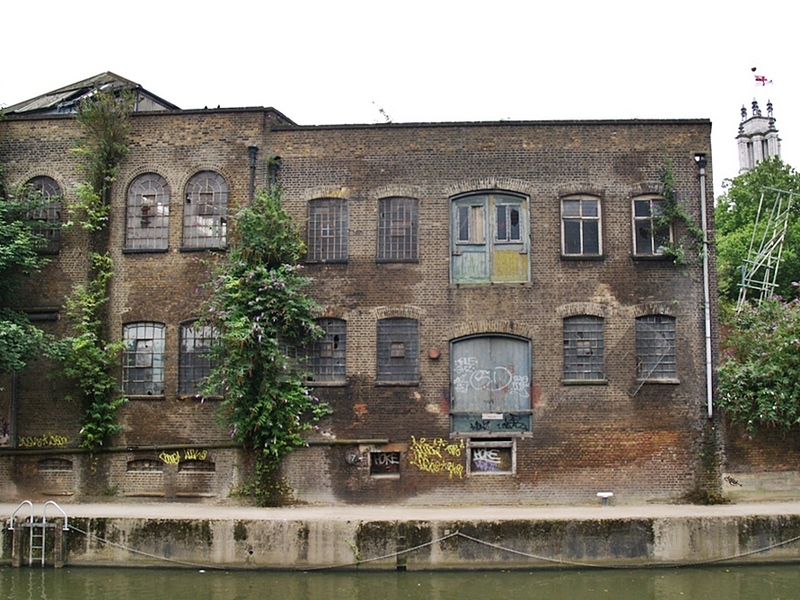 It was occupied by Caird & Rayner from 1889 to 1972 and was never substantially altered, so the building retains its original cast-iron window frames and two double loading doors that open on to the Limehouse Cut. 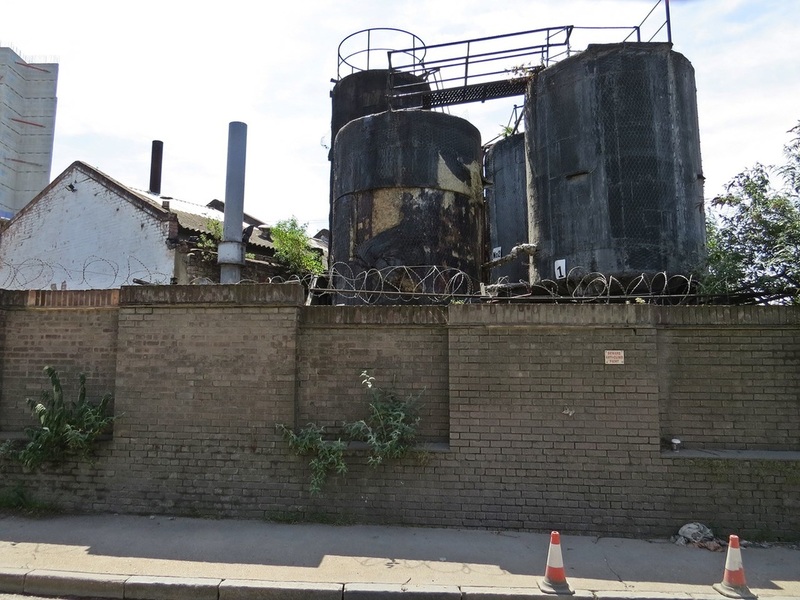 Caird & Rayner were engineers and coppersmiths who specialized in the design and manufacture of seawater distilling plant for supplying boilers and drinking water on Royal Navy vessels and Cunard liners. 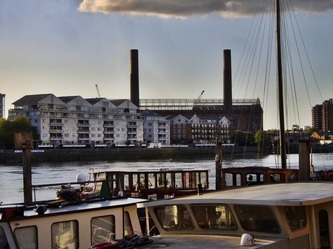 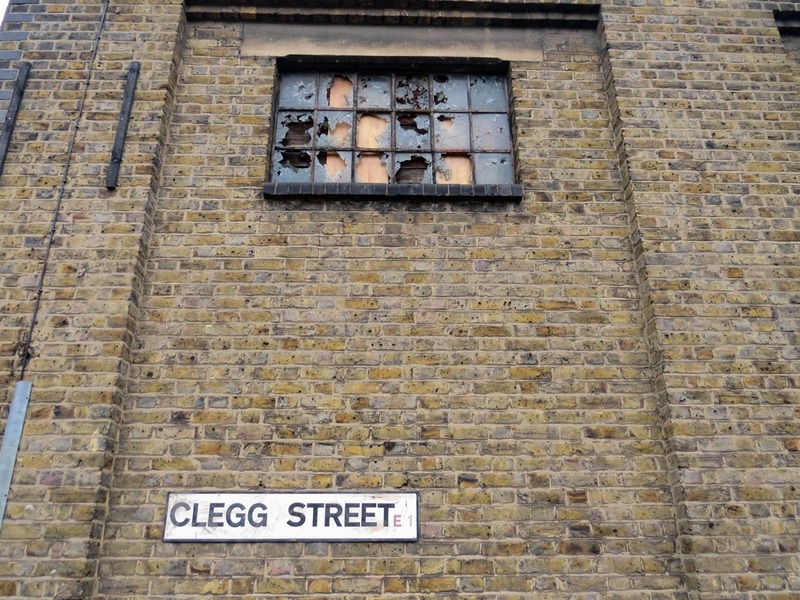 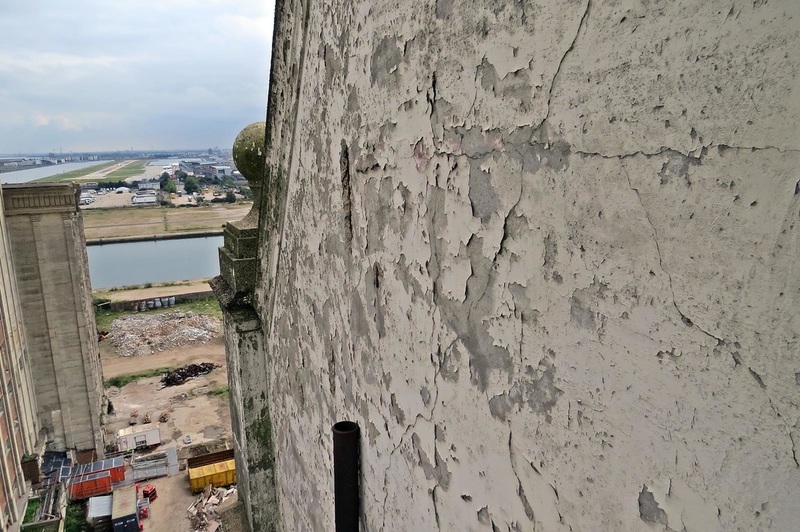 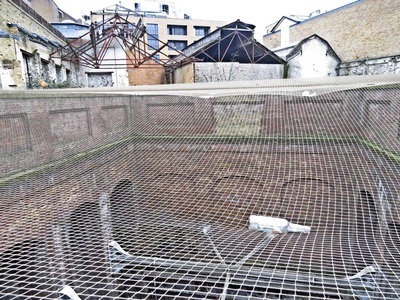 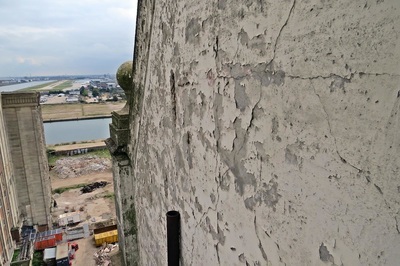 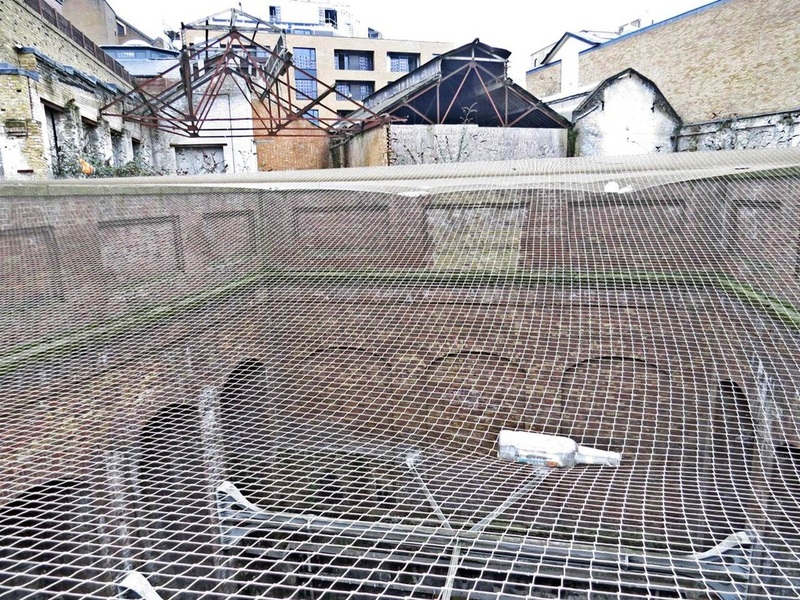 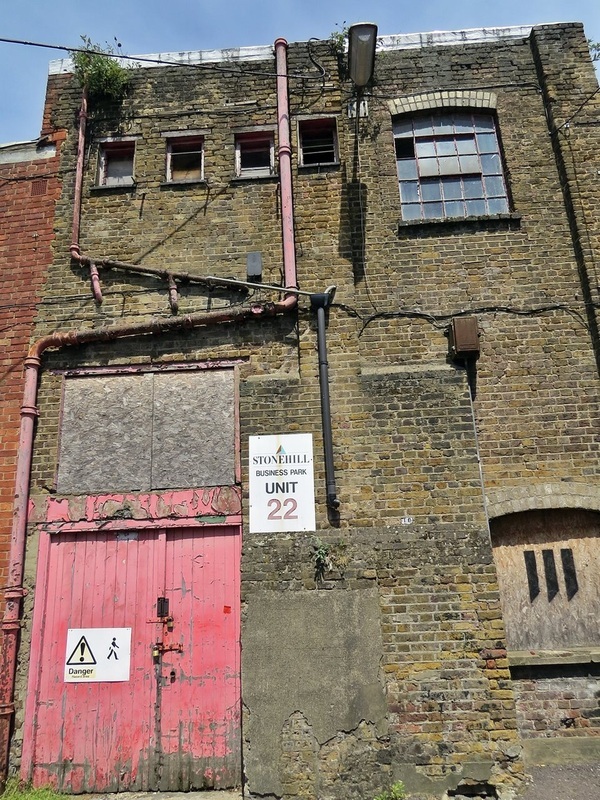 The building is the only original sail-makers’ and ship-chandlers’ warehouse surviving in Tower Hamlets. A few years ago a housing association attempted to demolish this building to build flats and even attempted to overturn the listed status of the property but this was blocked by English Heritage. 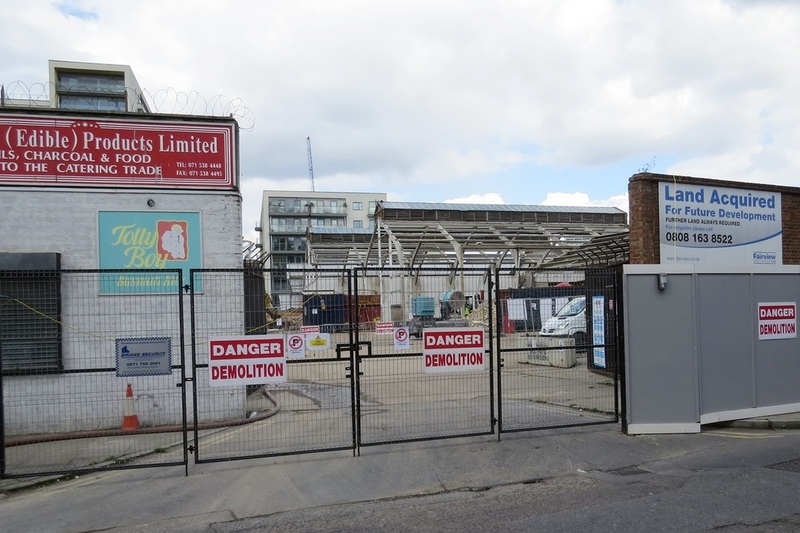 The derelict shops and small business units at the side/back have now finally been demolished to make way for a large housing development and Corals the bookmankers next door is also being demolished soon as part of that development. 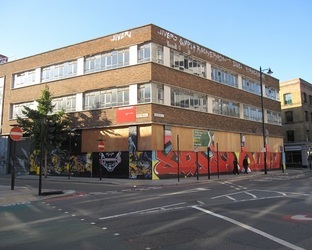 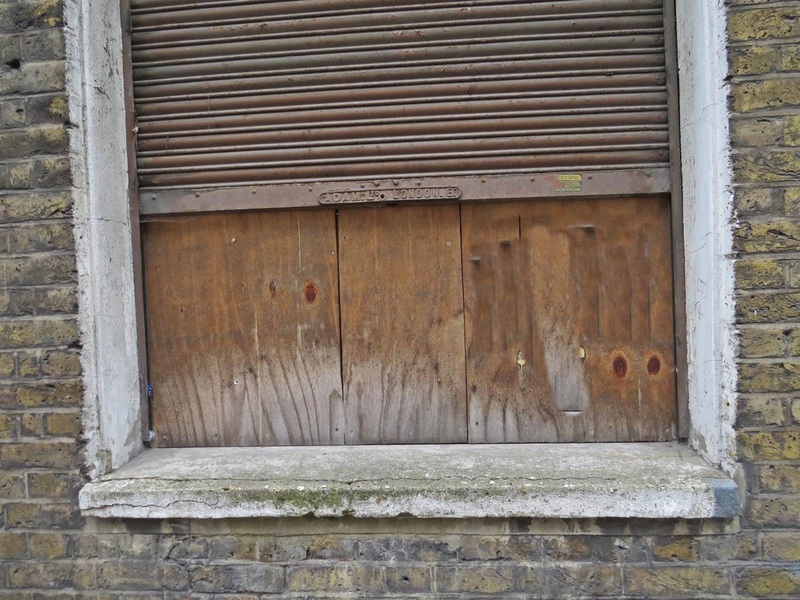 After various changes of ownership in recent years there are no immediate plans for 777 Commercial Road which remain vacant apart from some live in security and some very ferocious guard-dogs. 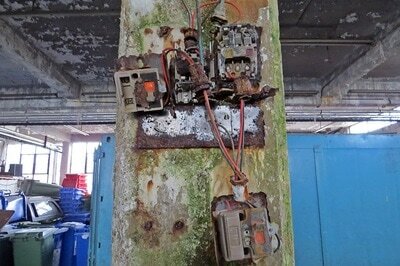 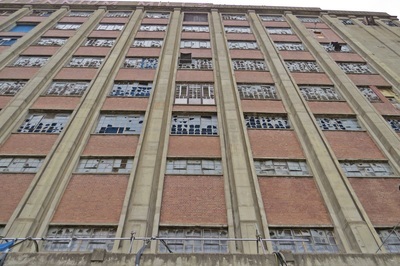 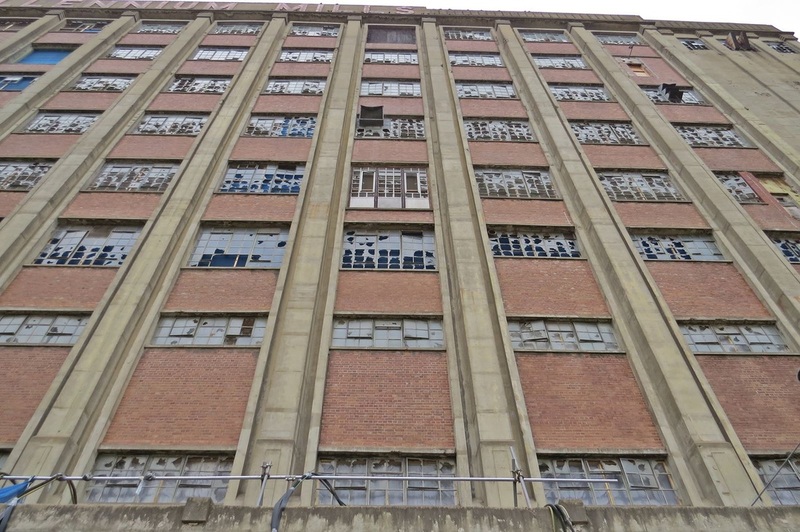 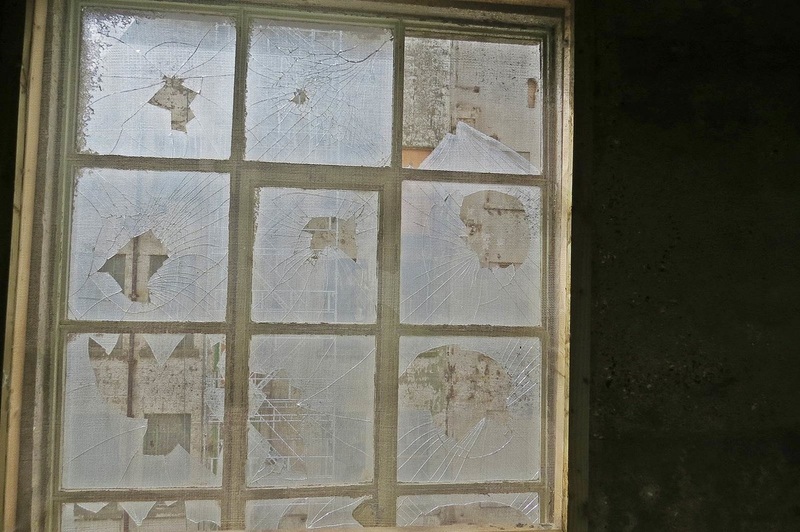 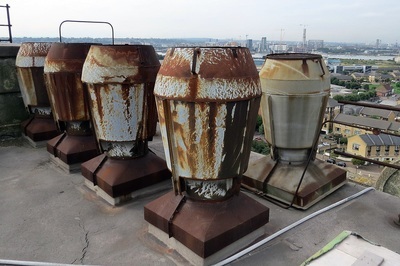 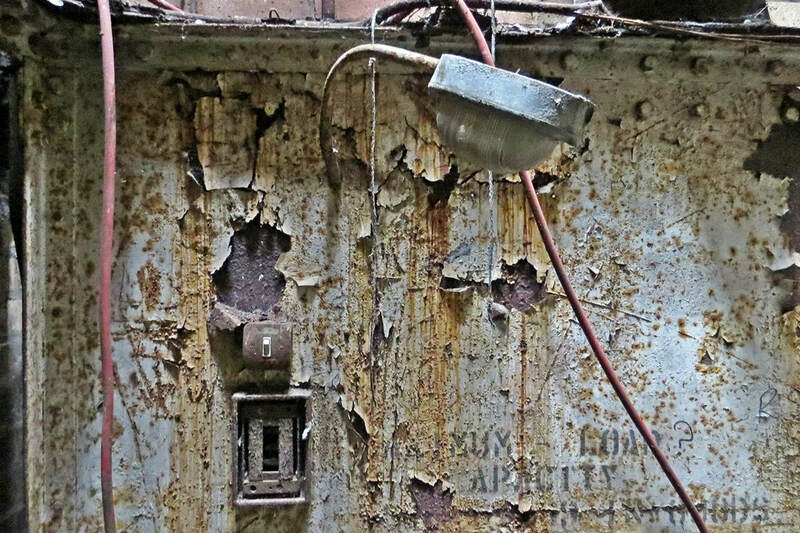 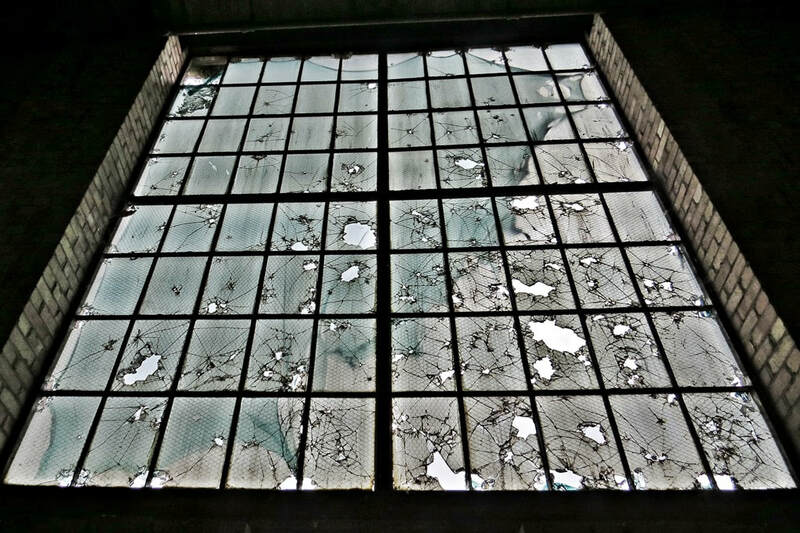 This building is very dangerous and it has some surprises for intruders. 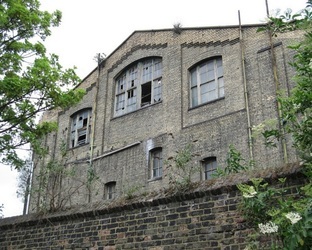 John Kirkwood whose father worked at Caird & Rayner until his death in the mid 80's writes to Derelict London:"The company produced water treatment plant, often for naval use and as such, they were regarded as a strategic industry during the war and there is a tale of one engineer who went off to join up, only to be ordered back by the military. 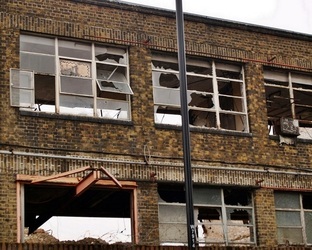 Due to the risk of being bombed out of London, the wartime government decreed that Caird & Rayner should have a shadow factory to which business could be transferred should the need arise. 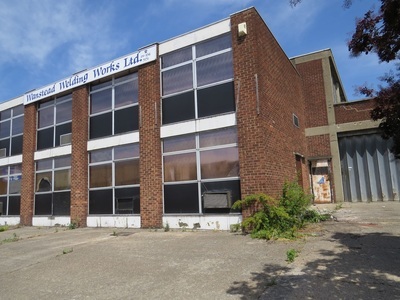 A property was located in Watford, and taken over by Caird & Rayner 'for the duration' but remained in the company thereafter. During the 1960's, business had declined and it was decided to relinquish the Commercial Road site and concentrate on Watford. There were redundancies, I believe, but the firm substantially relocated to Watford and our family moved in about 1967 to a place in Hemel Hempstead, within easy commuting distance of the Watford site. 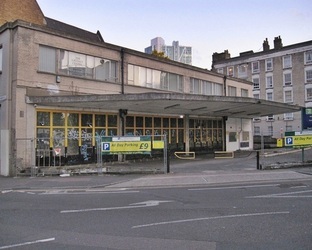 The move out of Commercial Road had it's 'moments'. 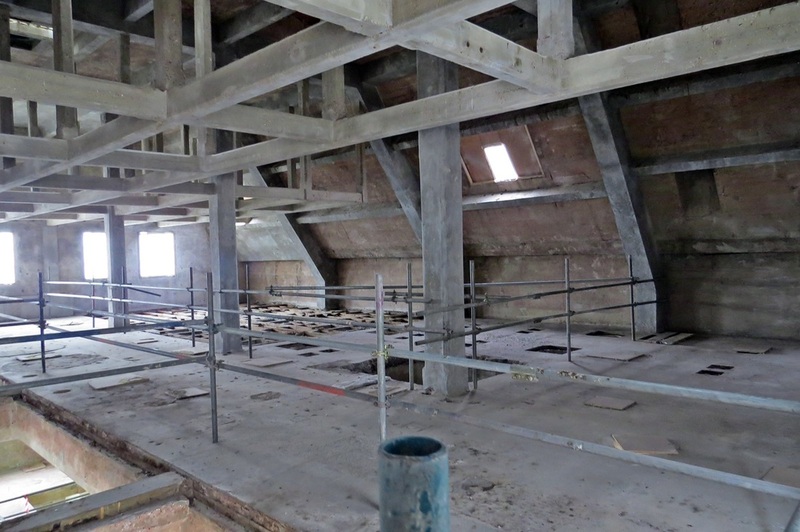 The building was, as you say, a sailmaker's loft, which meant the main part of the building had just a ground floor and a full height space in which to hang and manage sails, with a gallery round the insider perimiter, at first floor level. 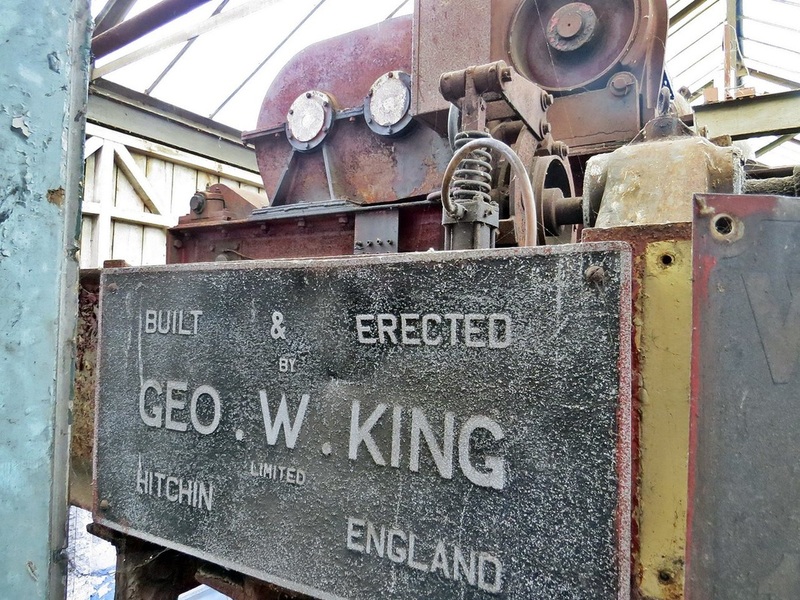 With the building's use as an engineering works, many machine tools had been installed in the gallery - lathes, milling machines, drills and the like. 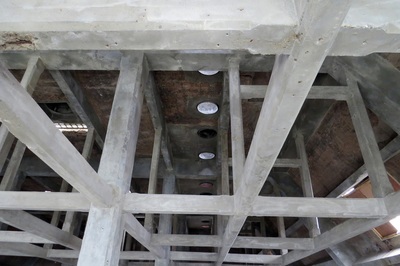 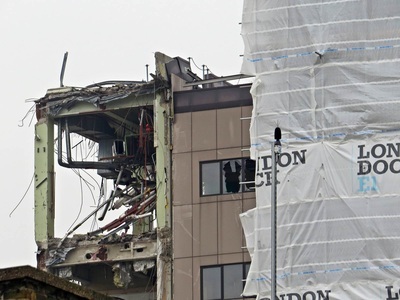 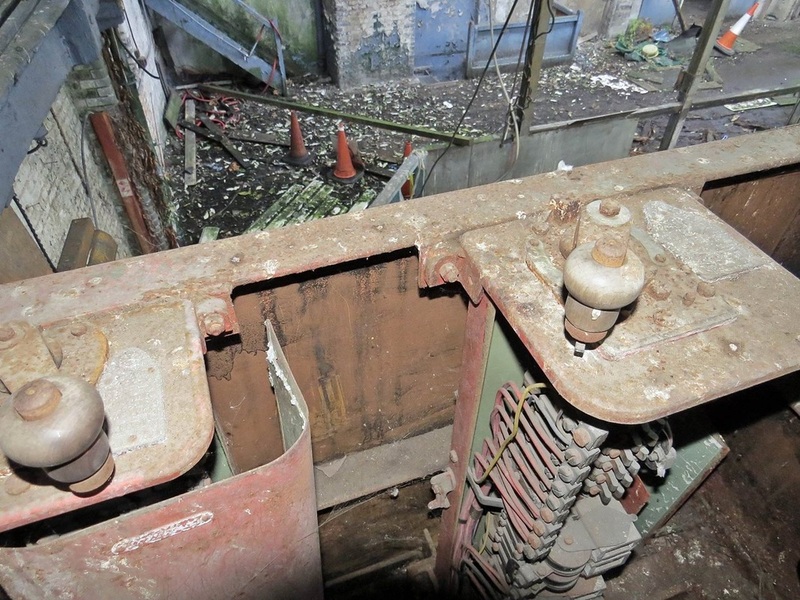 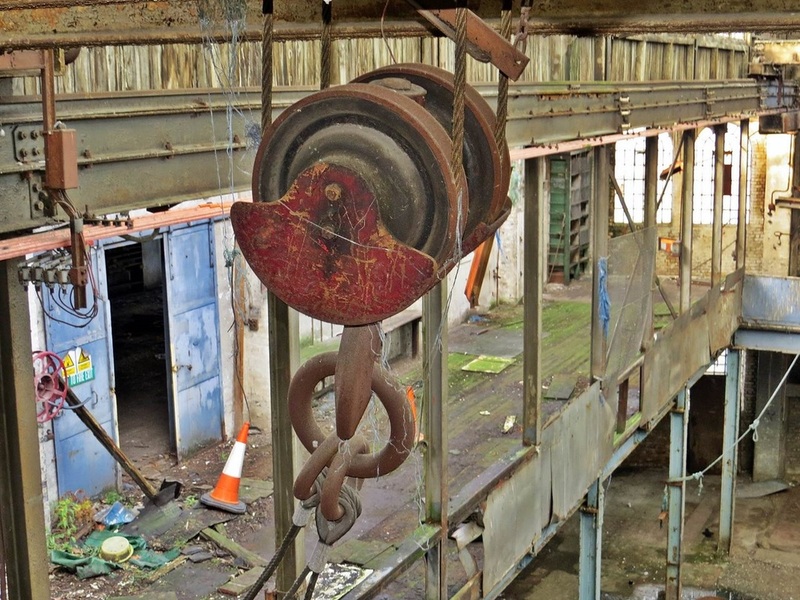 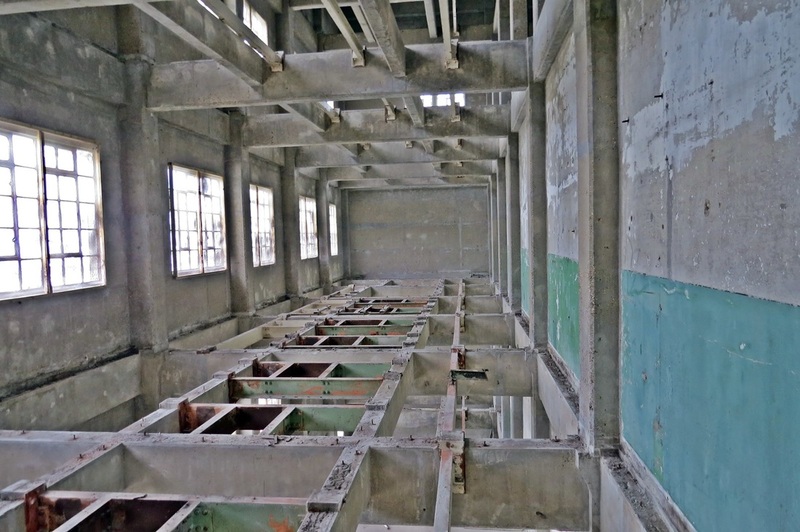 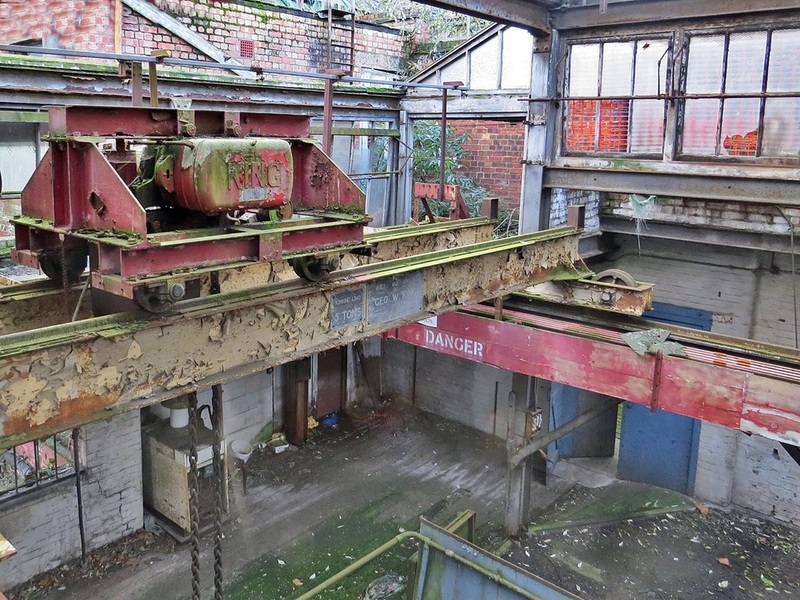 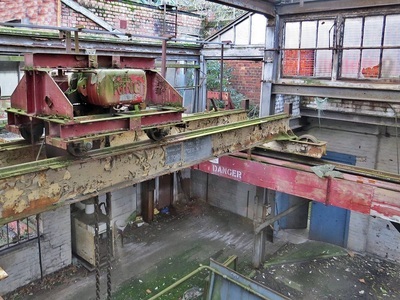 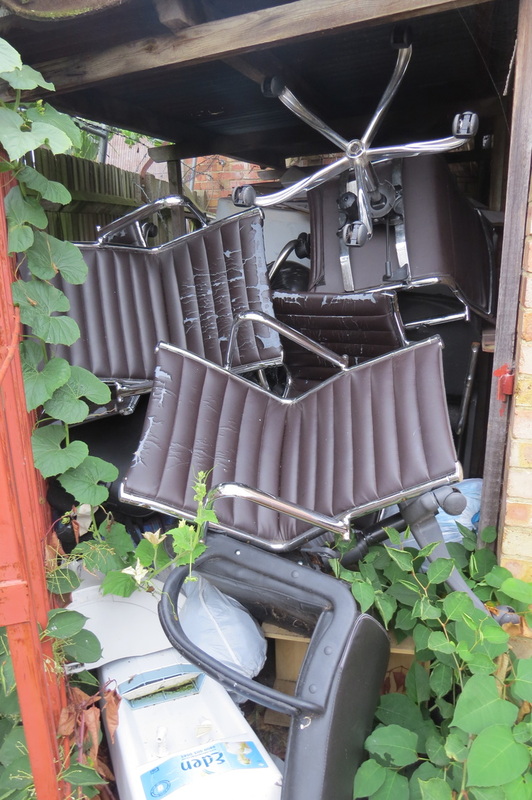 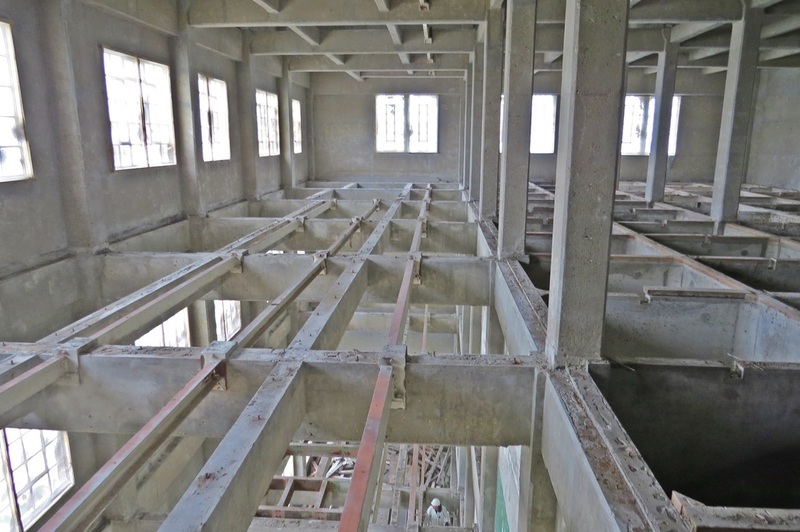 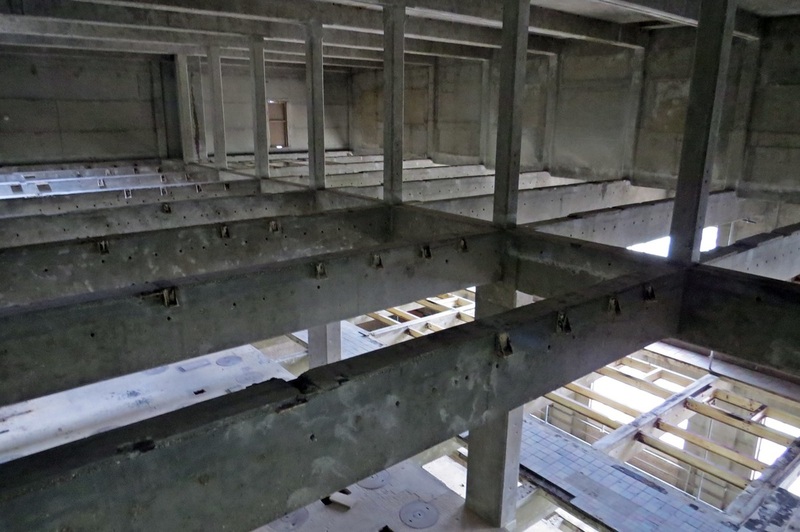 As machinery came out for transport, the weights were tallied up, but only until the company got scared when they realised the place should have long ago collapsed under the load." 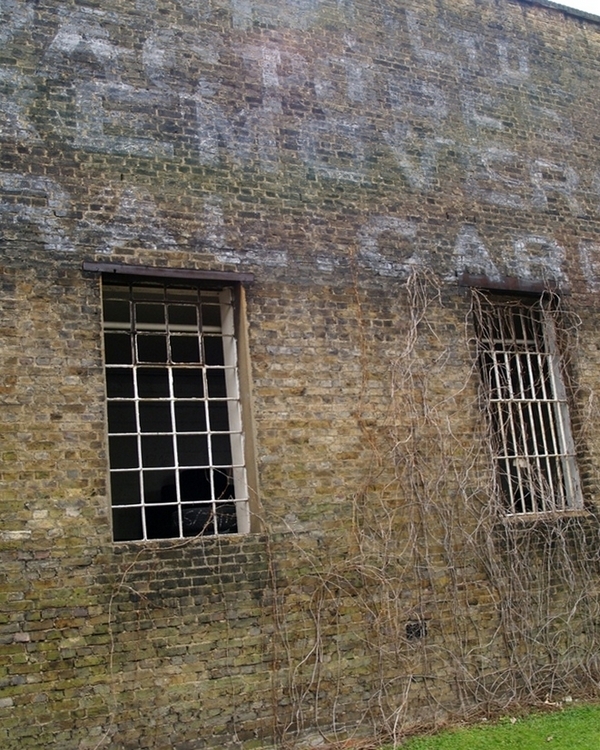 Ive no idea of what this place was used for as there weren't any clues or debris around. 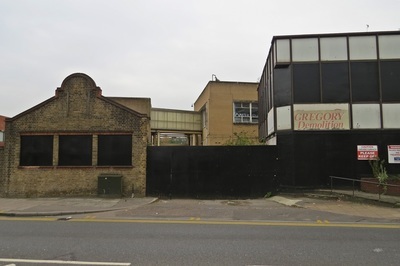 These industrial units one of which was a small printworks was halfway through being flattened when the demolition company went bust and the site was left unfinished for a couple of years. 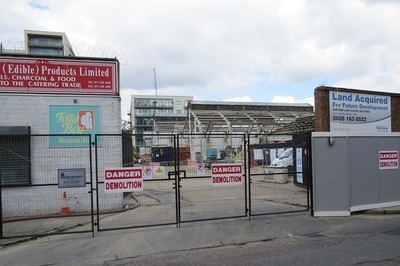 The site has now been cleared and as at late 2015 the building of flats is well underway. 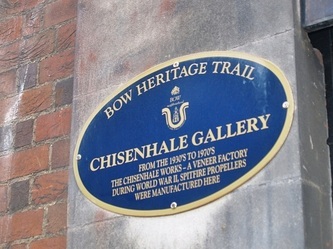 Morris Cohen built the Chisenhale Works building (called CHN Veneers) at the height of the Second World War in 1943 to produce veneer for the construction of Spitfire cockpits, as well as propellers and plywood for Mosquito aircraft. 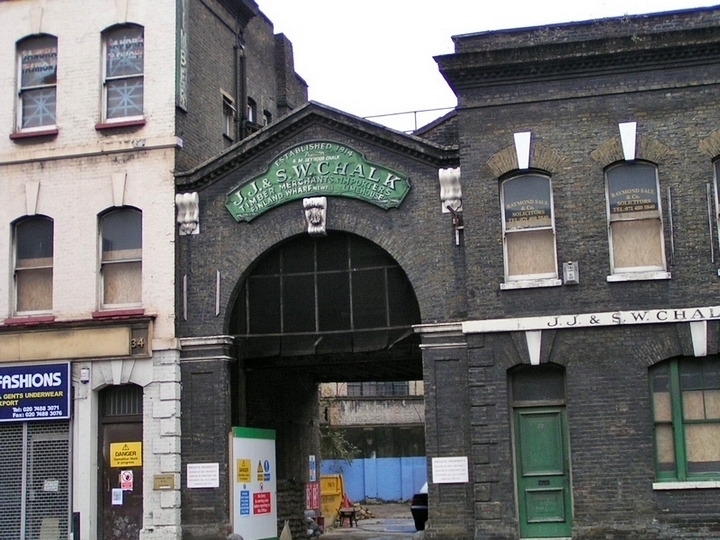 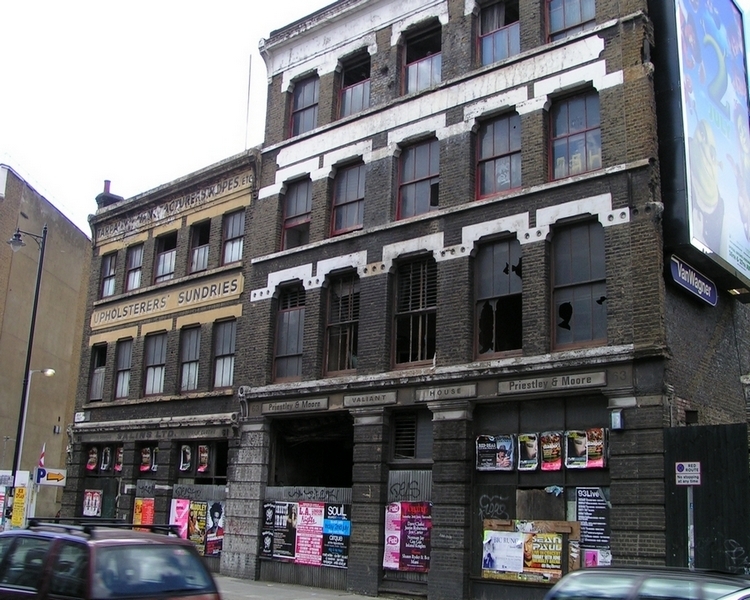 The works closed in 1972 and the building was then bought by the London Borough of Tower Hamlets. 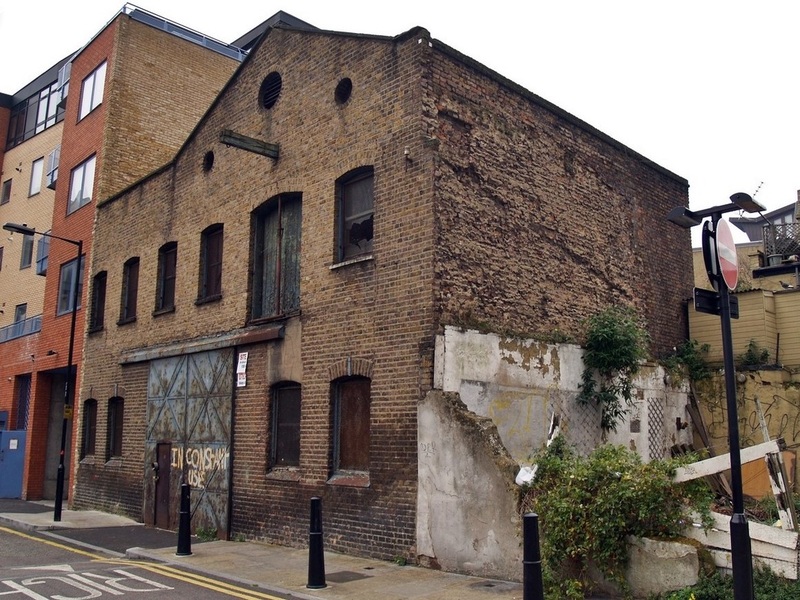 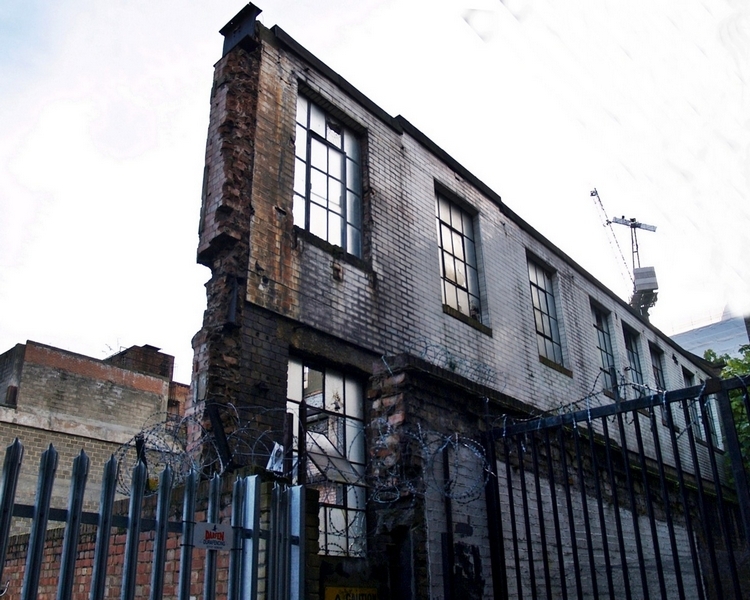 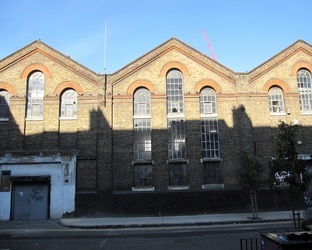 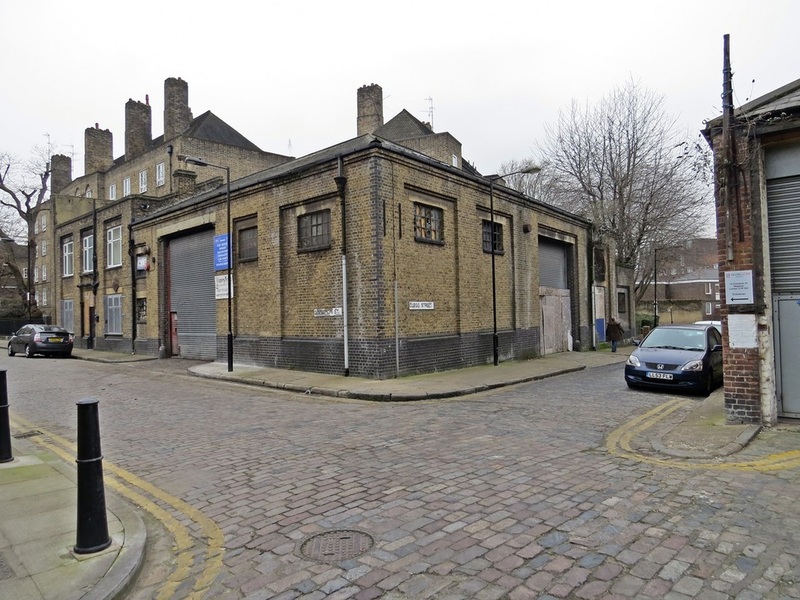 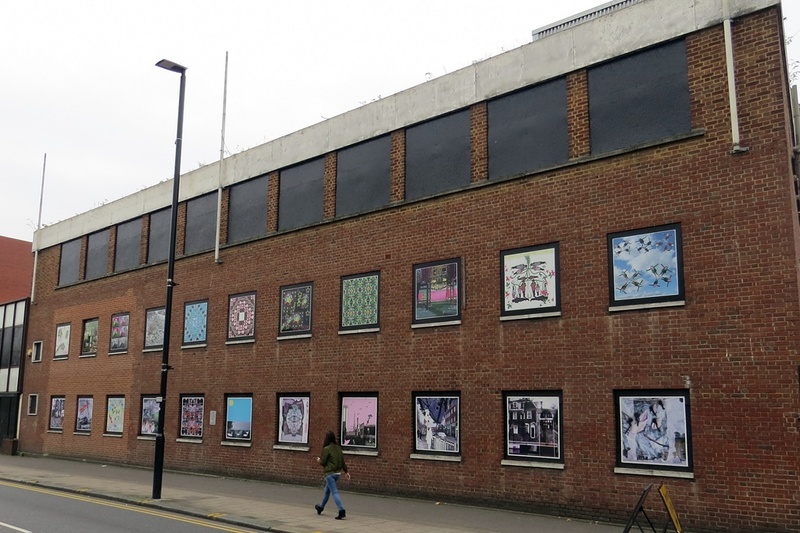 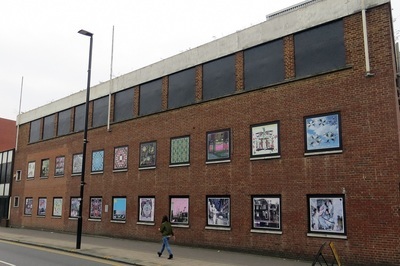 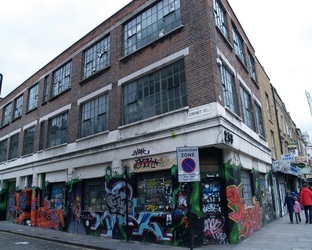 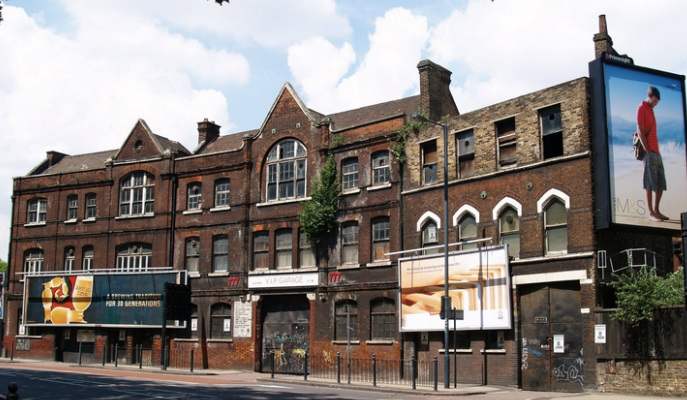 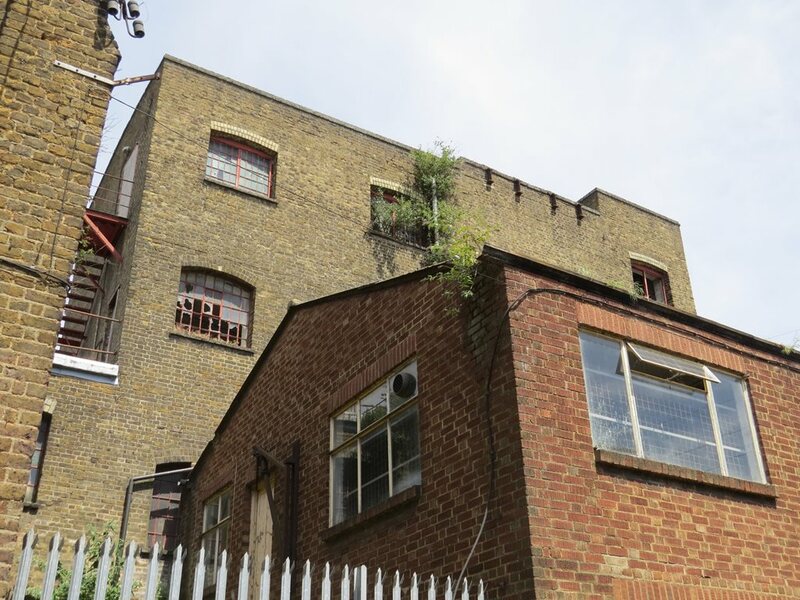 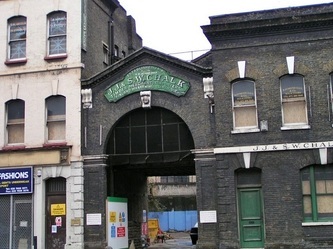 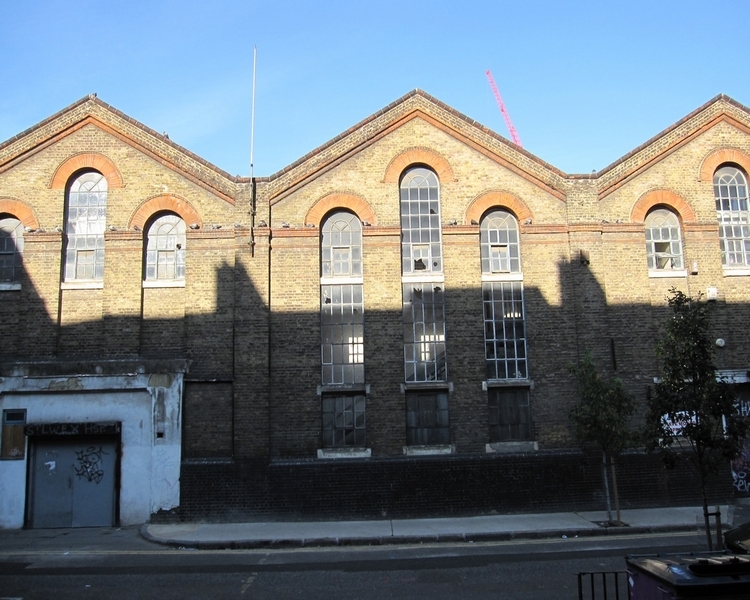 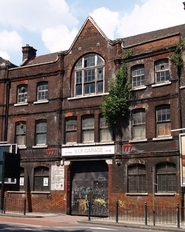 In 1980 a group of artists and a dance collective took over the lease at Chisenhale Works as the Arts Place Trust after being forced to relocate from their studio building in Butler’s Wharf in Docklands. 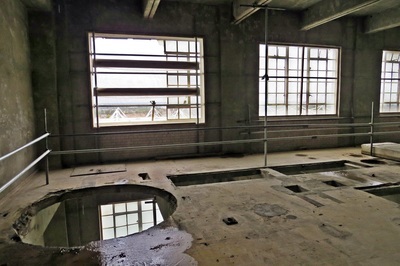 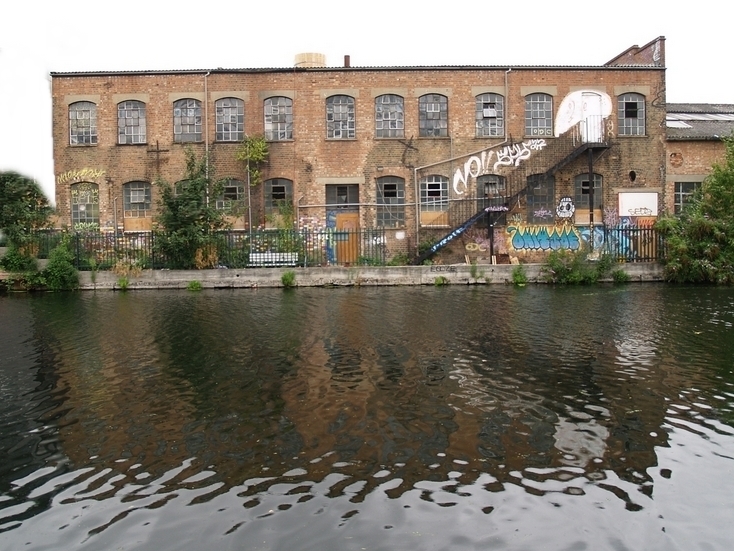 During the winter of 1980–1, the artists renovated part of the derelict building and created 40 studios. 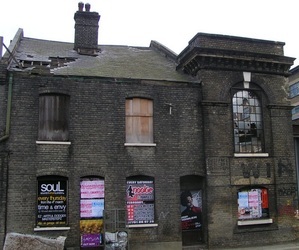 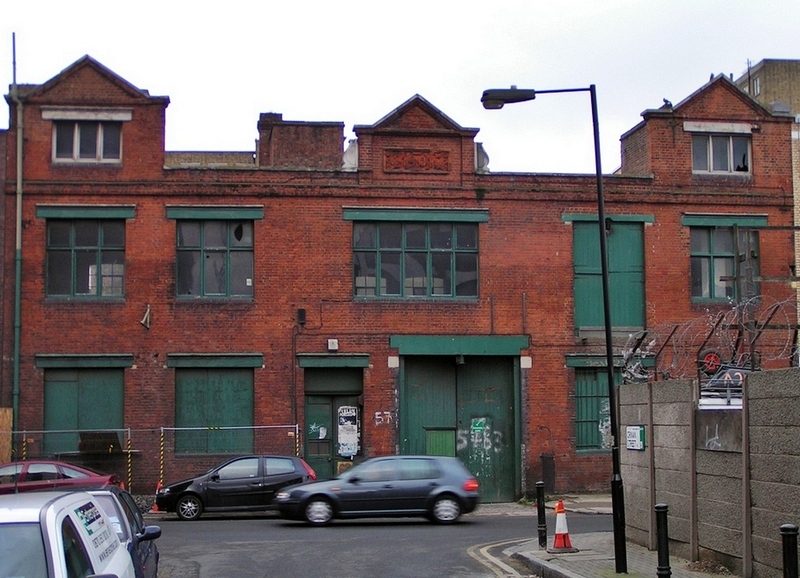 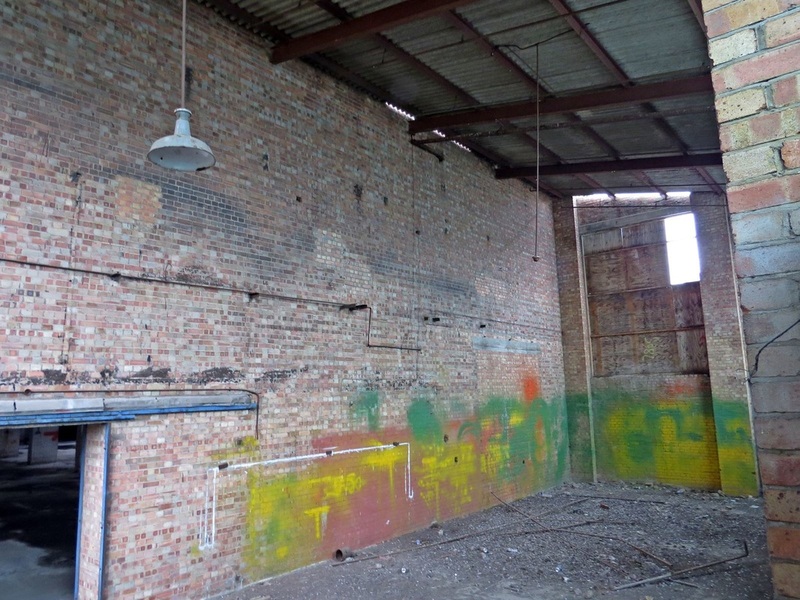 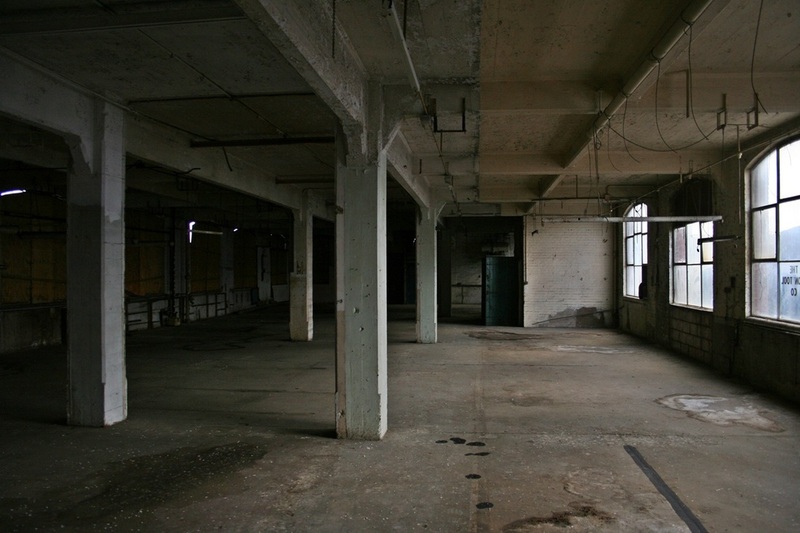 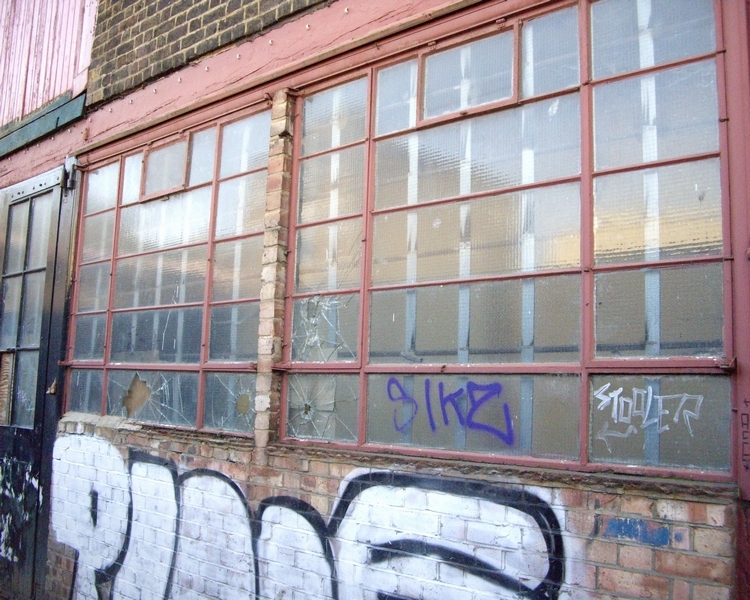 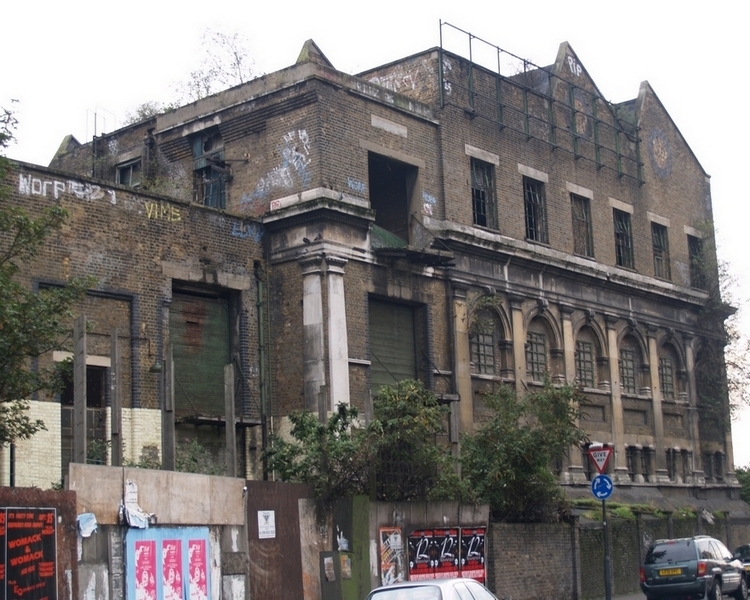 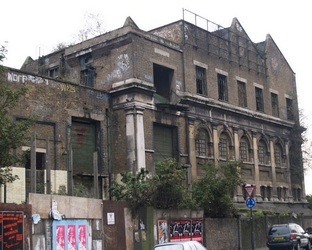 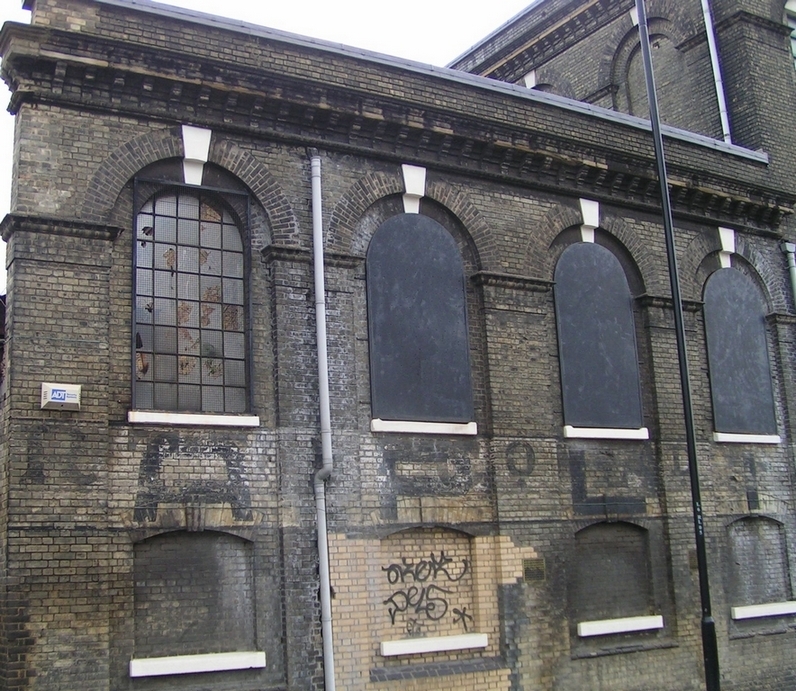 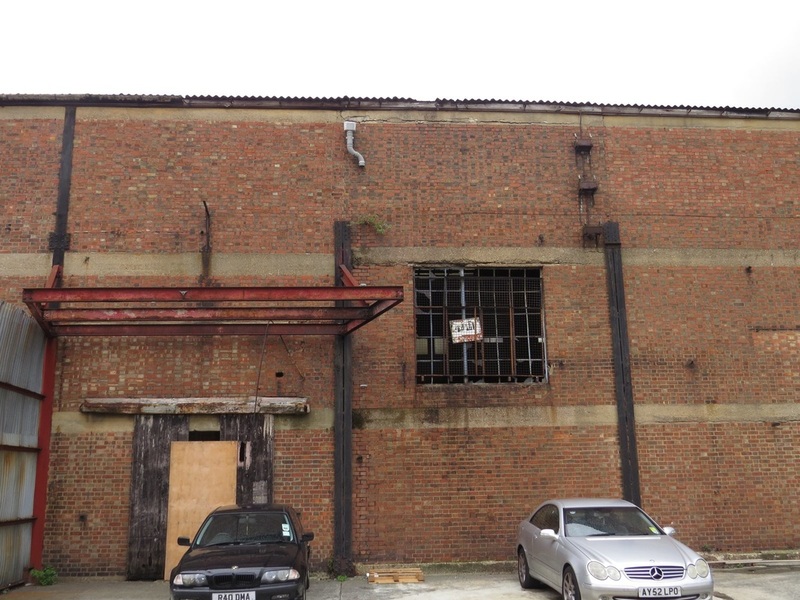 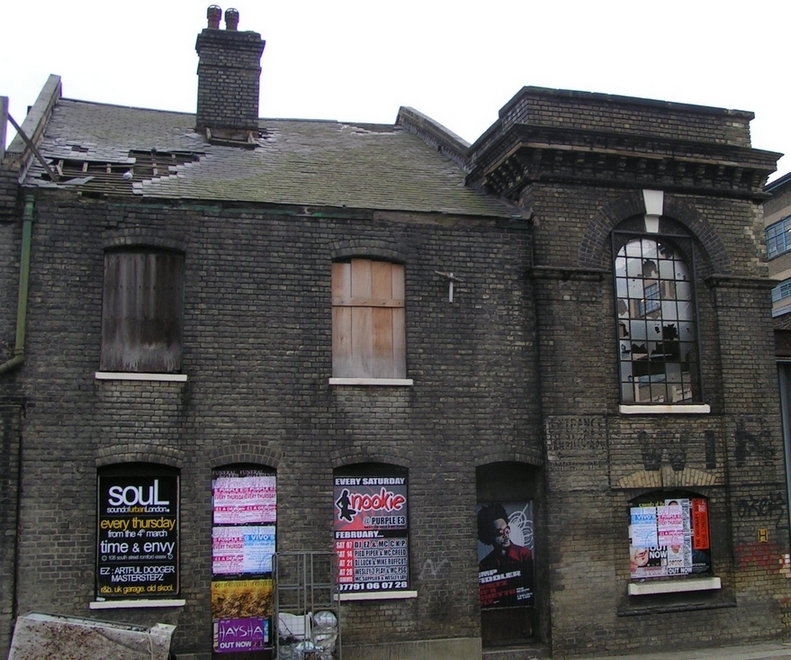 X6 Dance, meanwhile, established Chisenhale Dance Space in the derelict Black Horse Brewery building adjacent to Chisenhale Works. 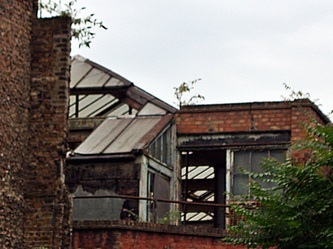 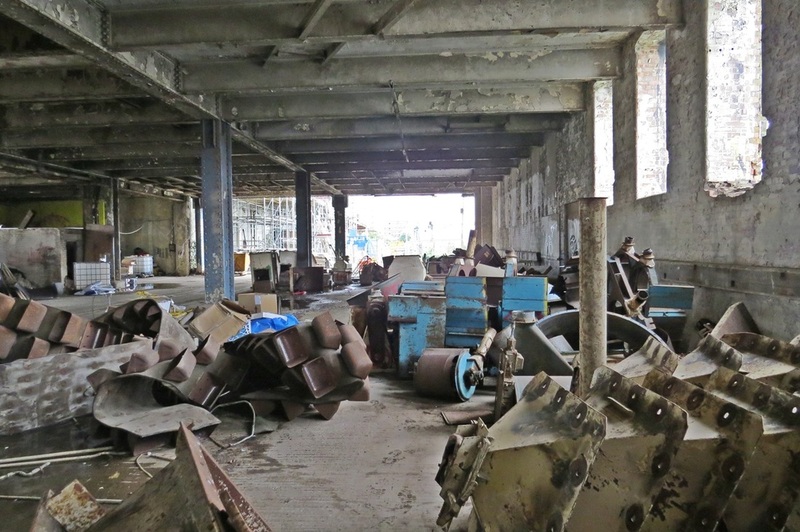 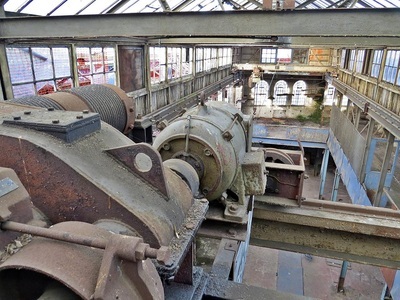 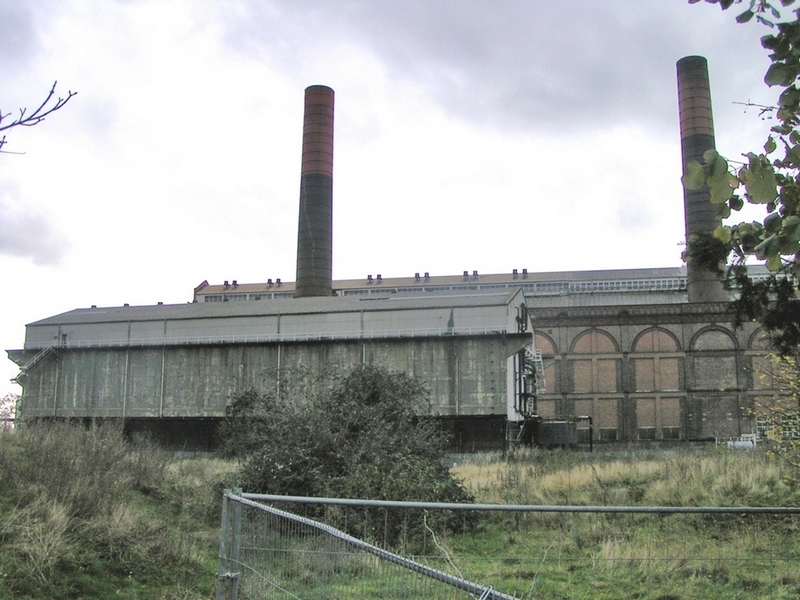 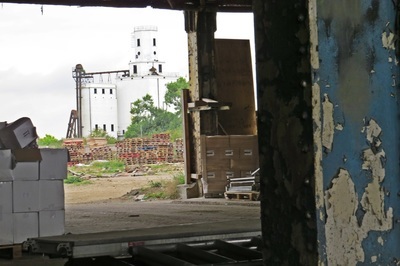 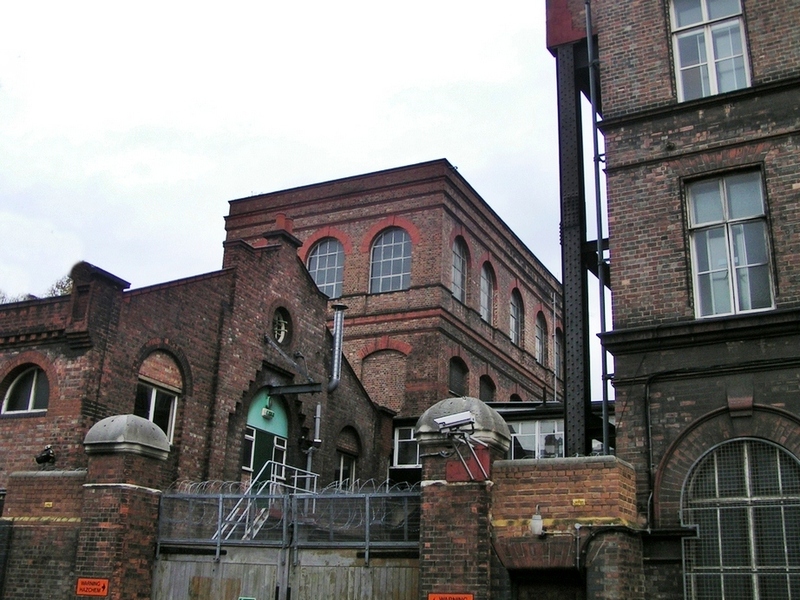 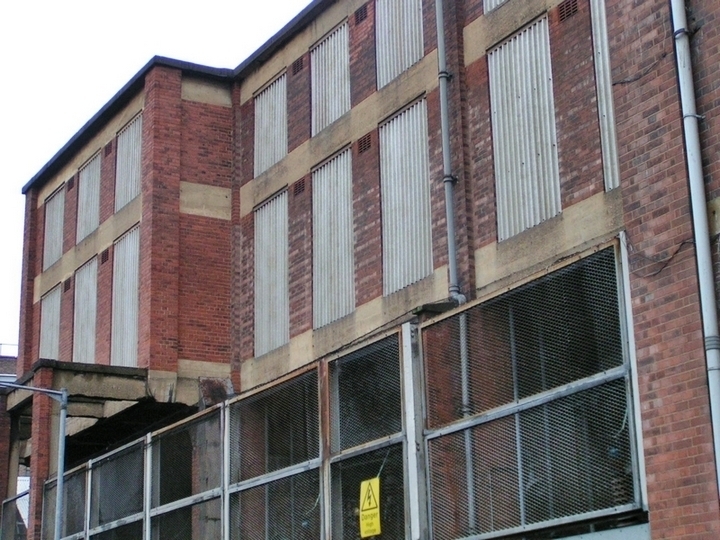 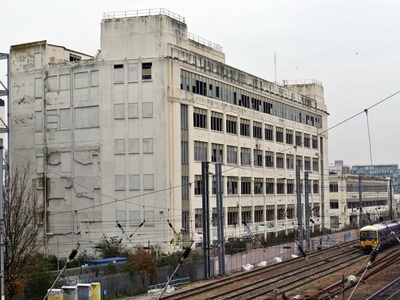 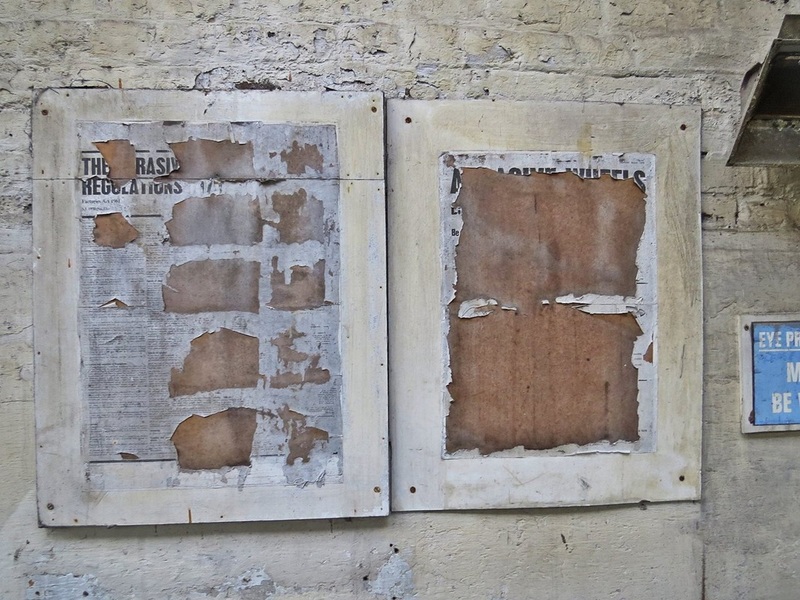 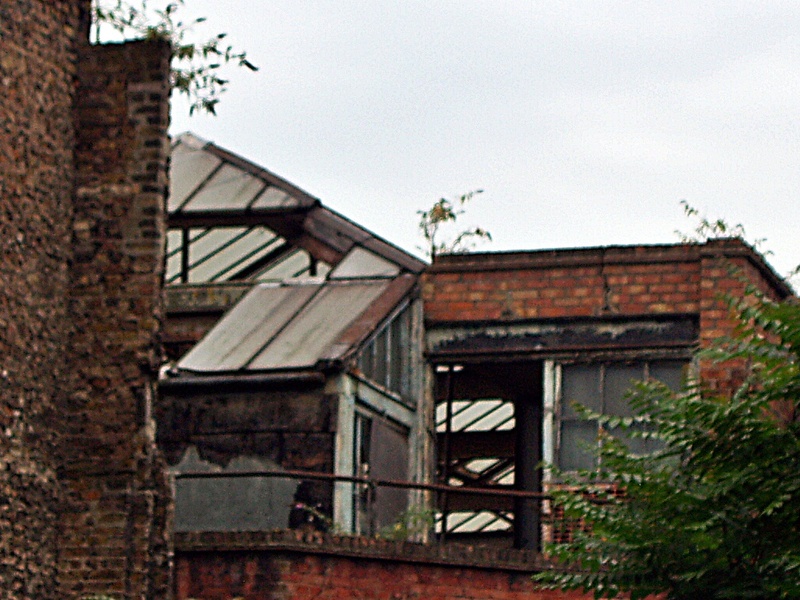 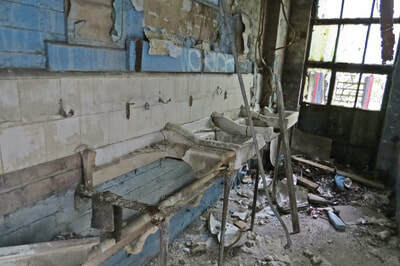 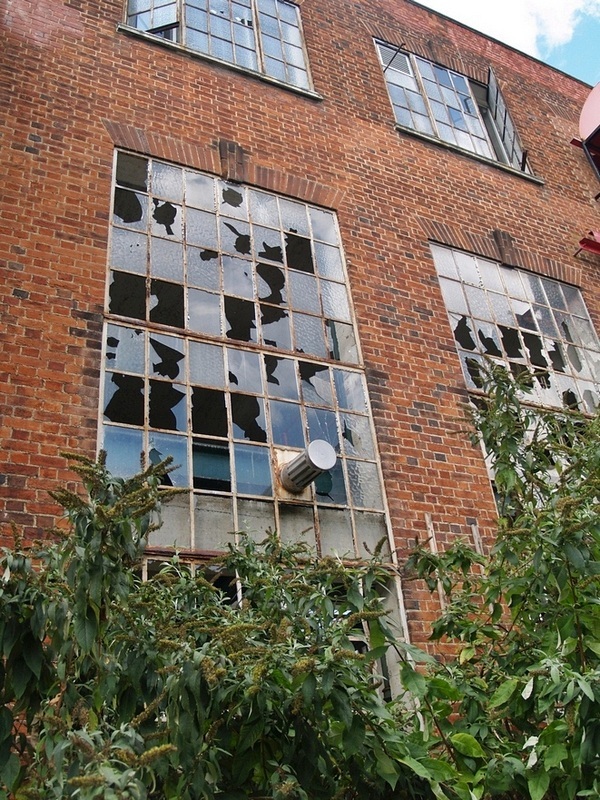 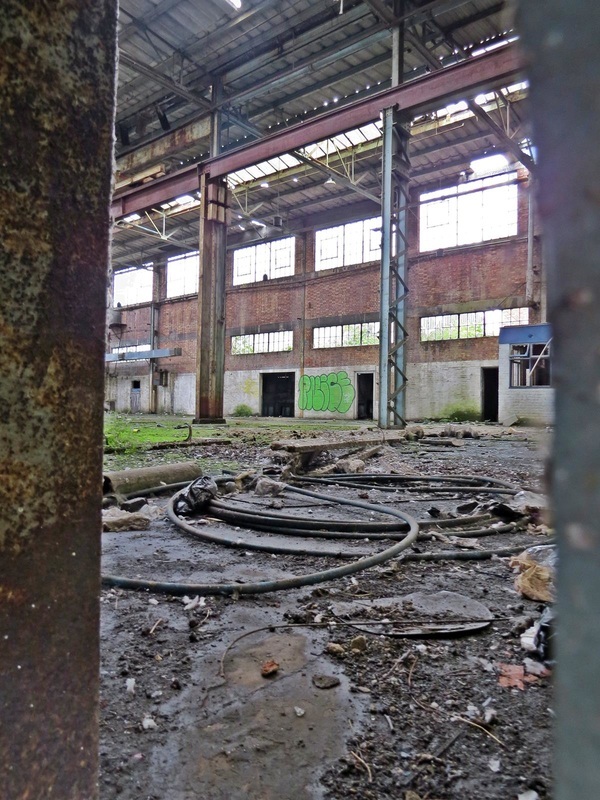 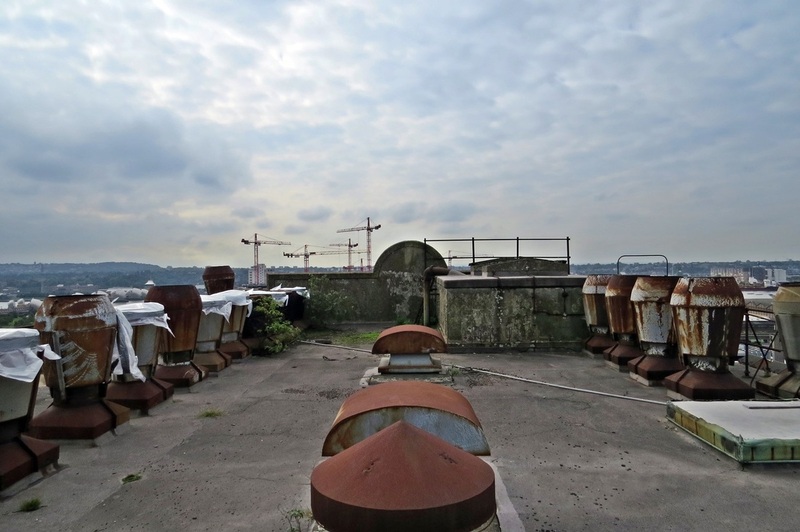 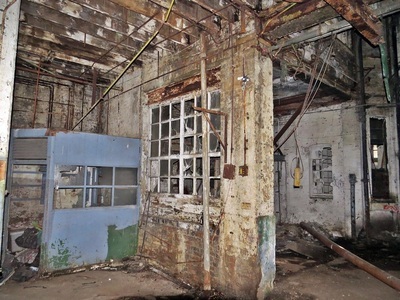 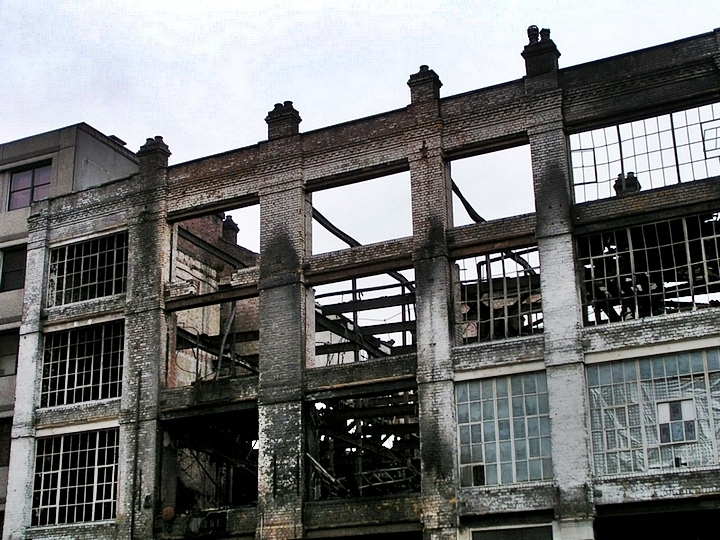 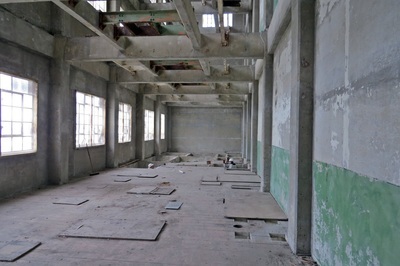 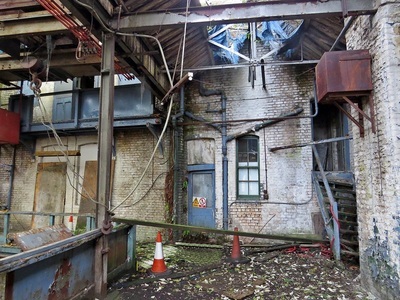 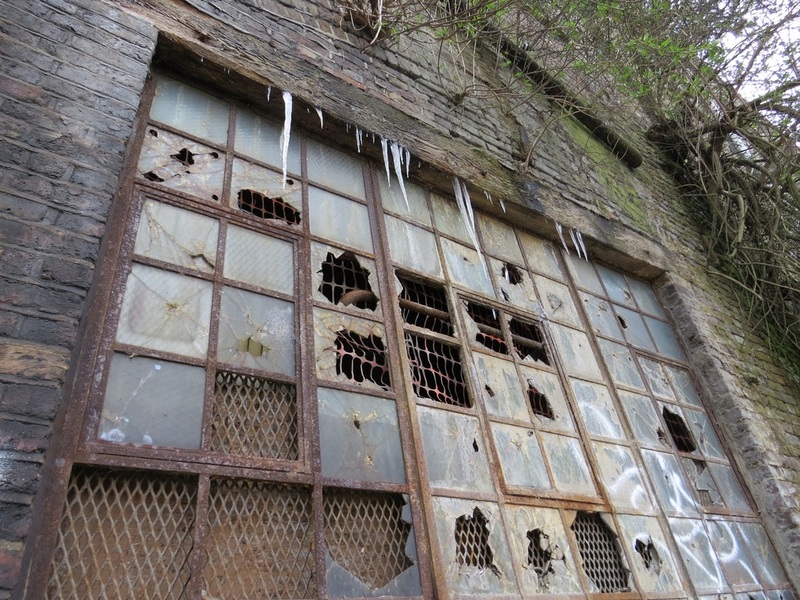 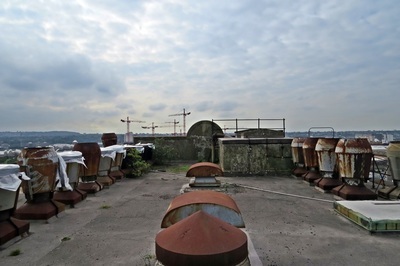 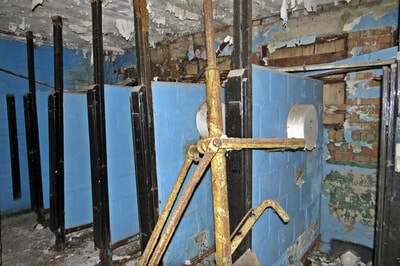 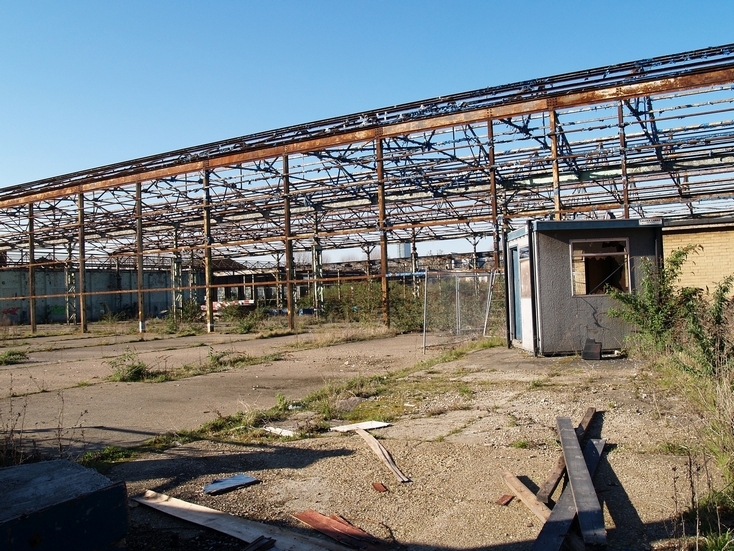 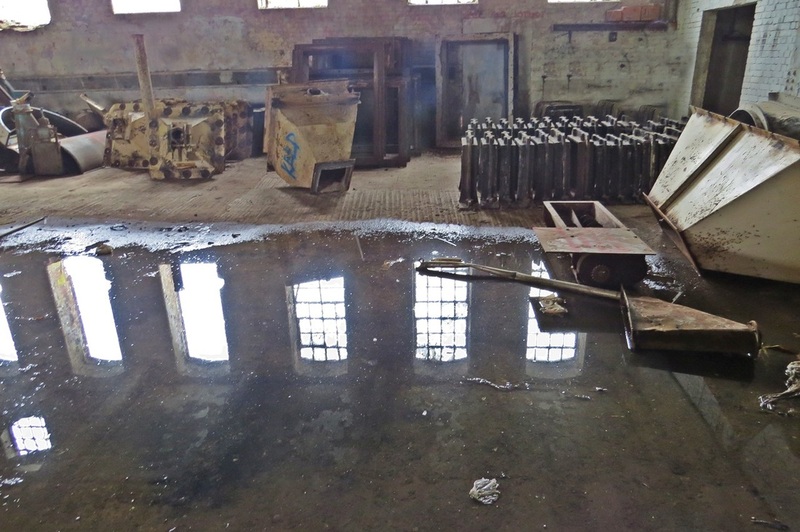 Although many parts of the old works pictured here still remain derelict, there appear to be no plans to redevelop them. Built between 1902 and 1905, on what was originally waste ground known as 'the Lots'. 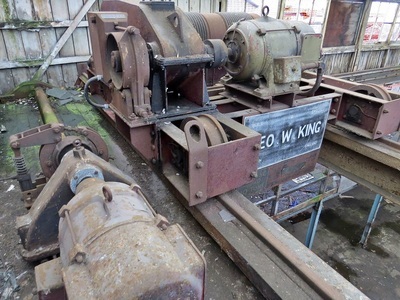 Its primary purpose was to provide power to the District Line and three other underground lines run by the Underground Electric Railway company. It was built to run on coal, conveniently shipped in via the river (Chelsea Harbour is built on the site of the old wharves). In 1915, with the closure of the Stockwell power station, Lots Rd also began supplying power to the City and South London Railway systems. 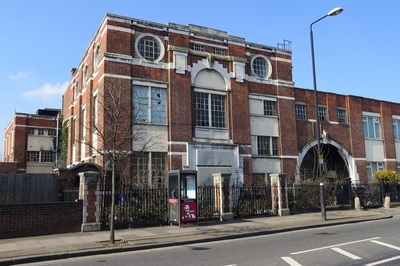 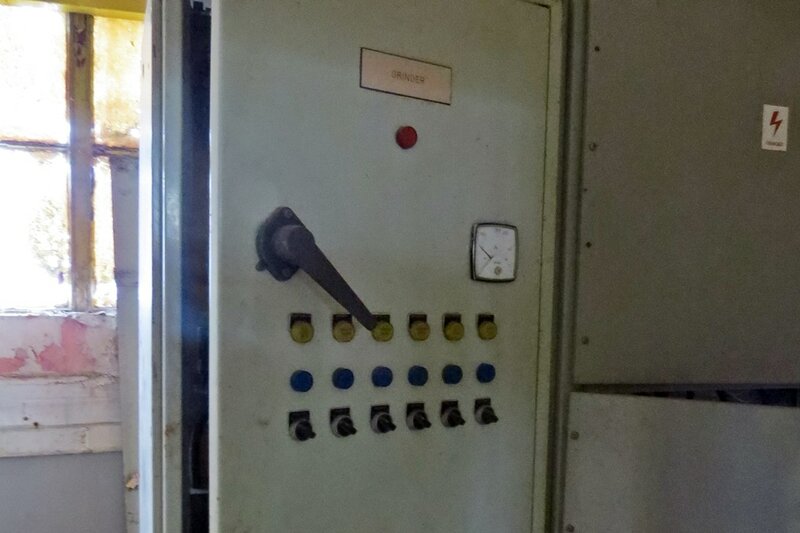 Between 1920 and 1925, the capacity of the station was increased from 63 to 92 megawatts and in 1928, the Central Line also obtained its power from Lots Rd. Major modernisation took place in 1963 when the number of chimneys were reduced from four to two and the power station was converted to run on oil. 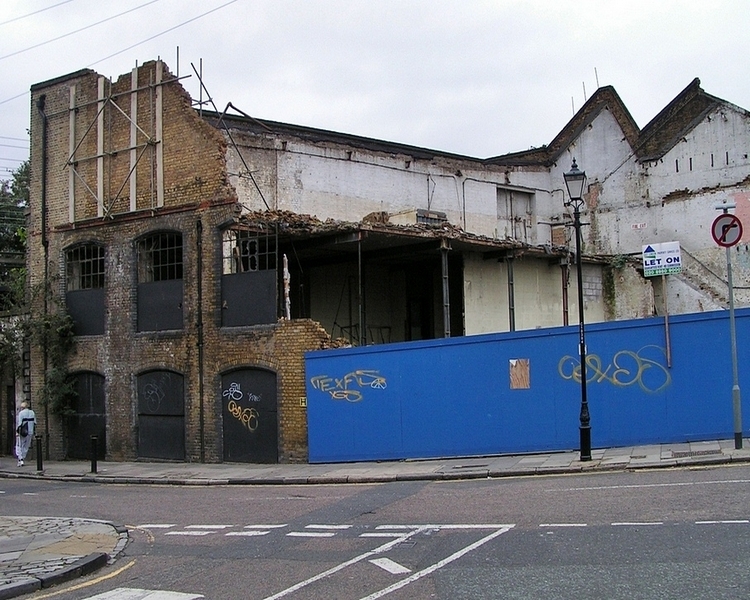 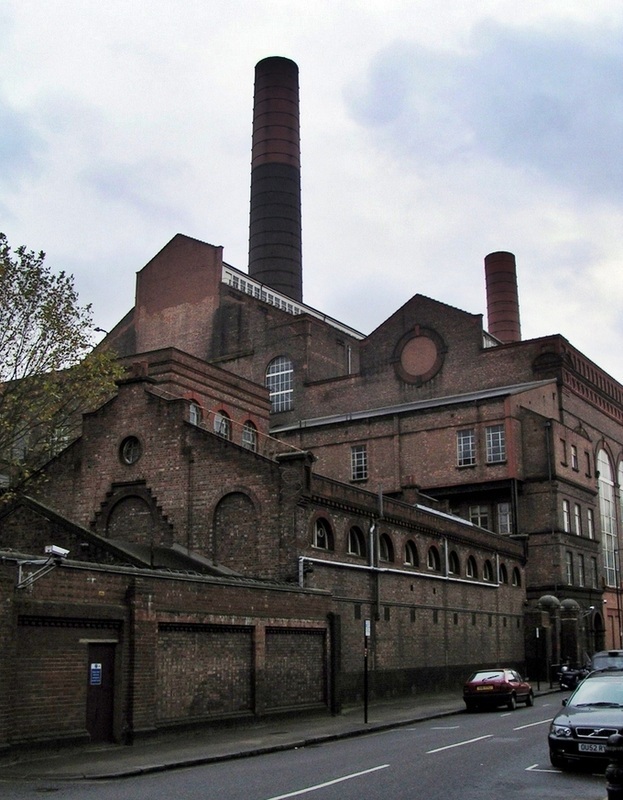 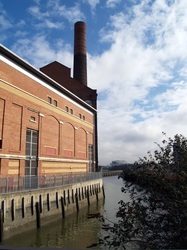 An adjacent building, on the corner of Lots Road was built to cope with the additional requirements for more power.In 2000, with power due to be obtained from the National Grid supply, London Underground decided to sell the power station to developers Circadian and redevelopment is now well underway.